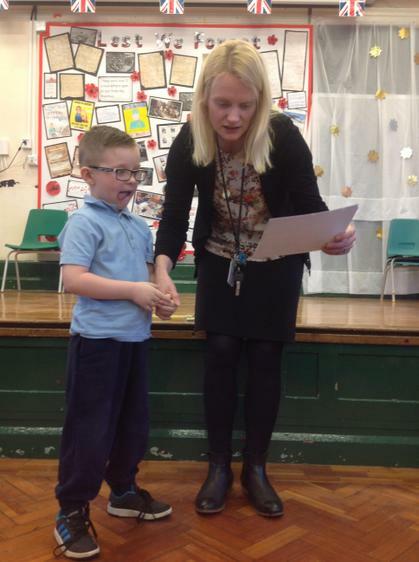 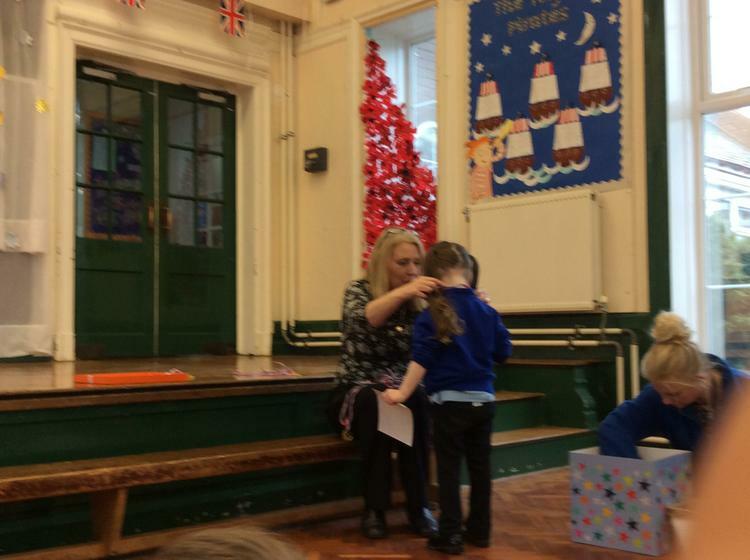 A HUGE well done to all the children who got Super Star Awards today in the assembly. 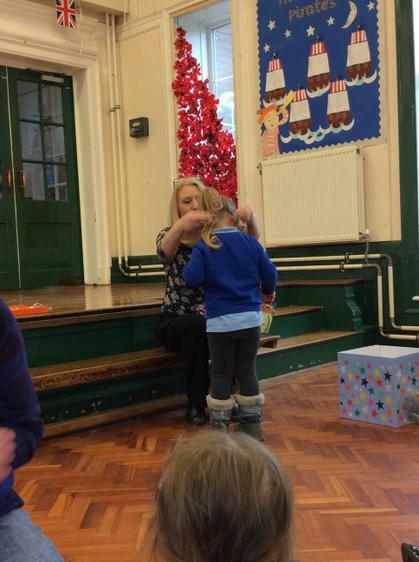 Thank you to all the parents that attended we love sharing special moments like this with you! 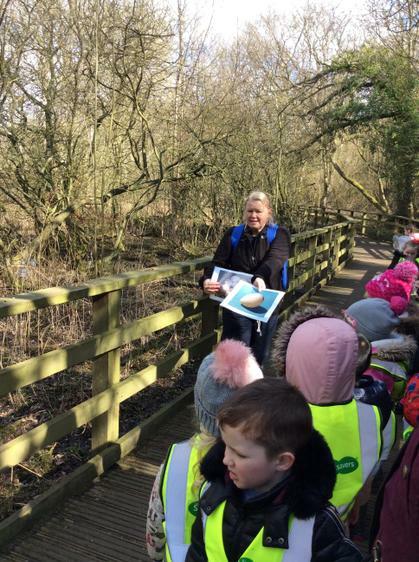 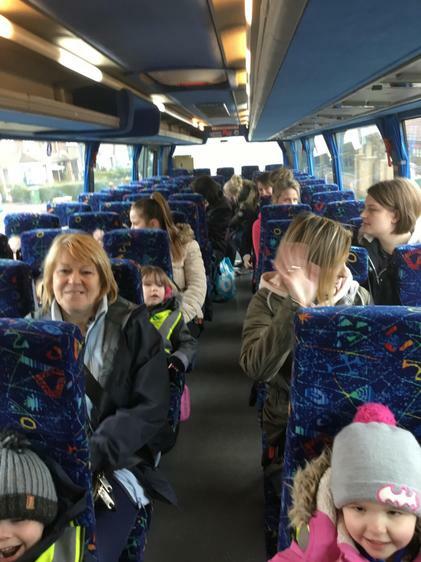 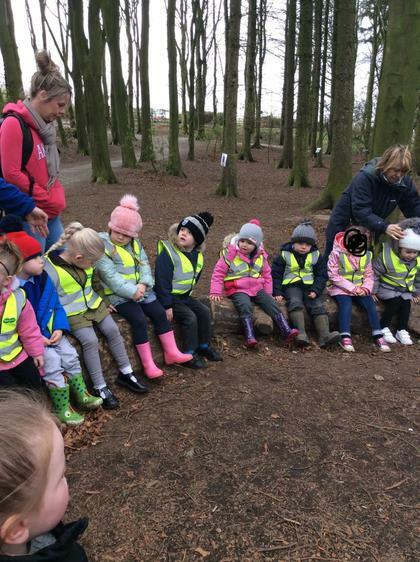 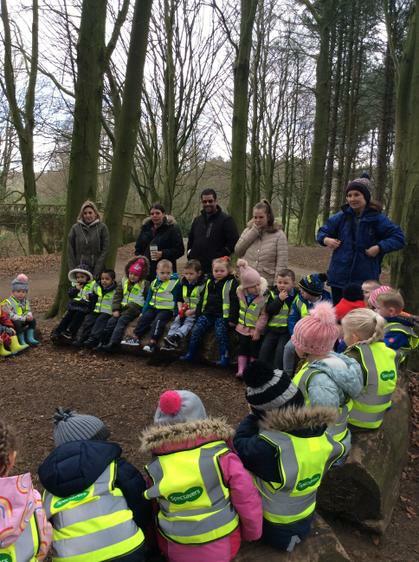 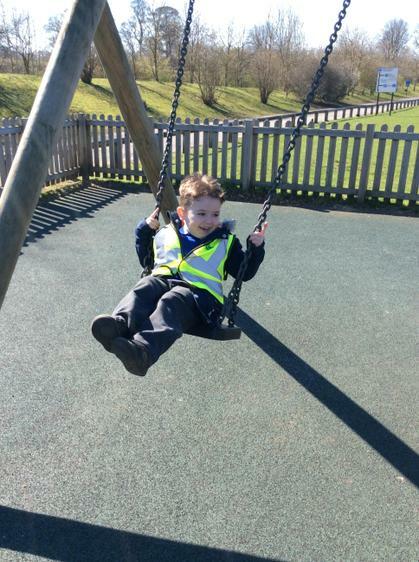 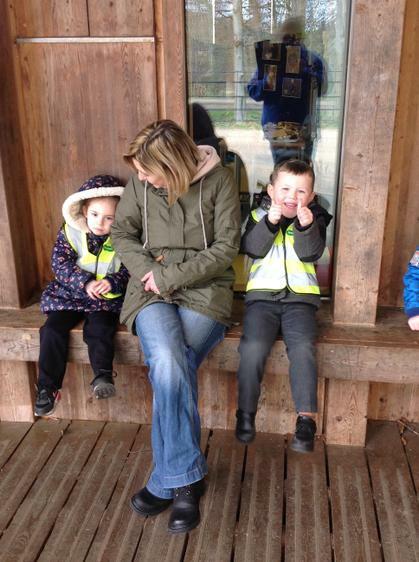 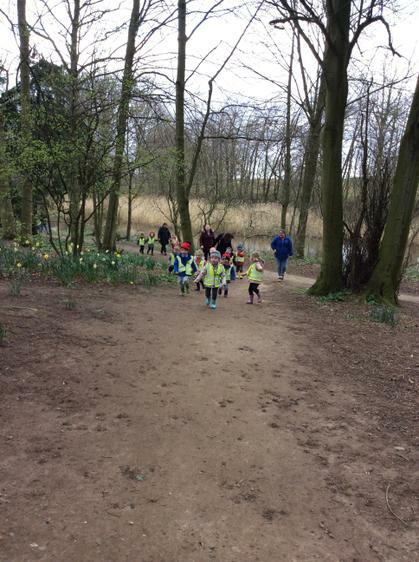 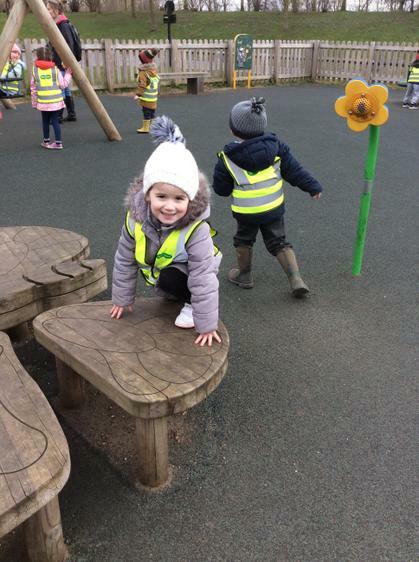 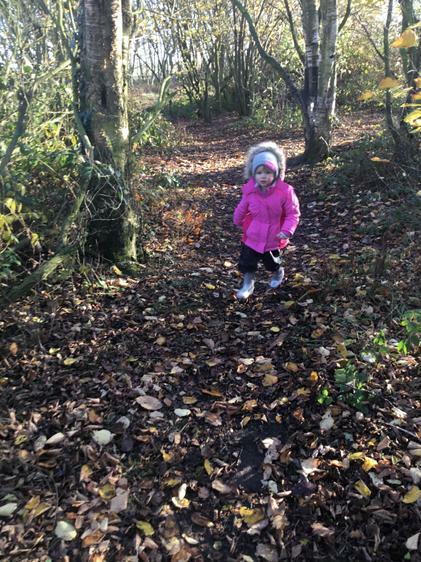 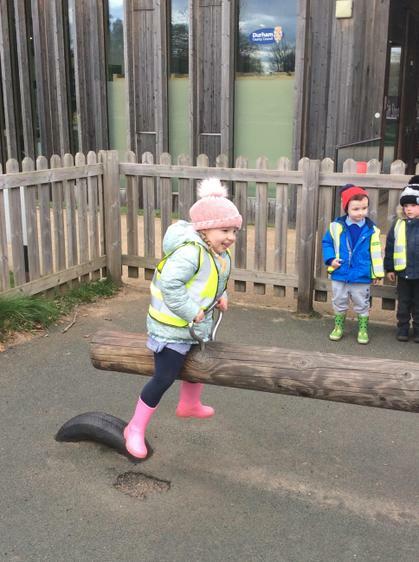 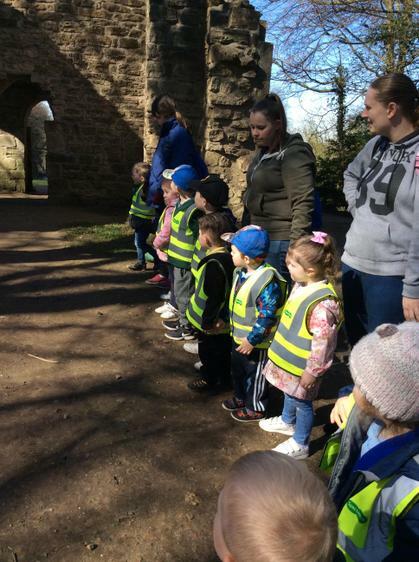 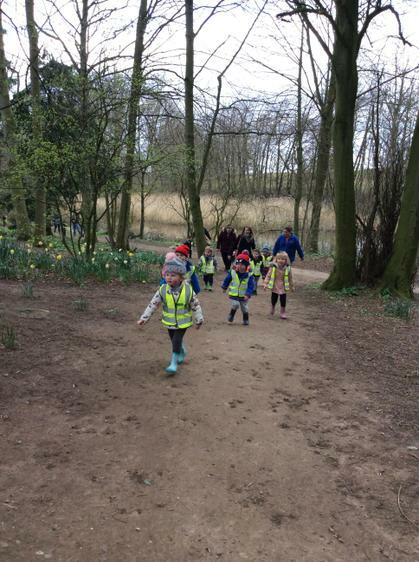 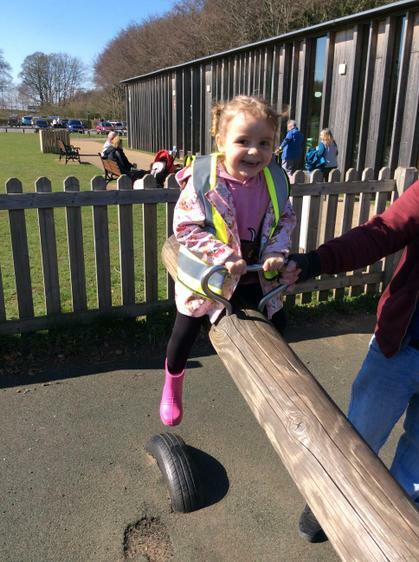 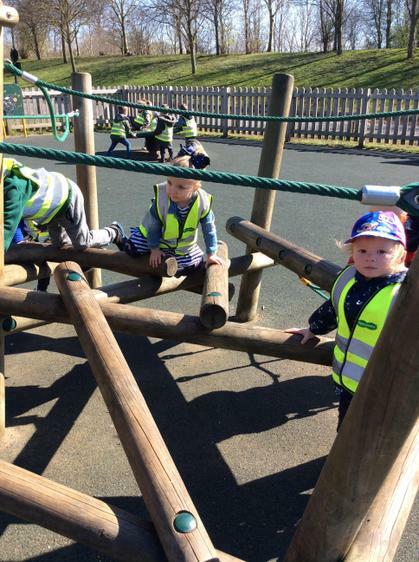 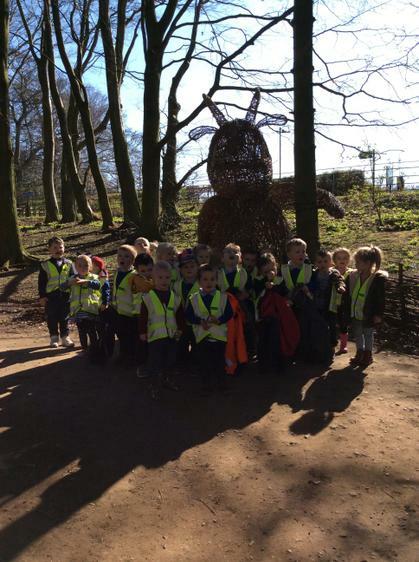 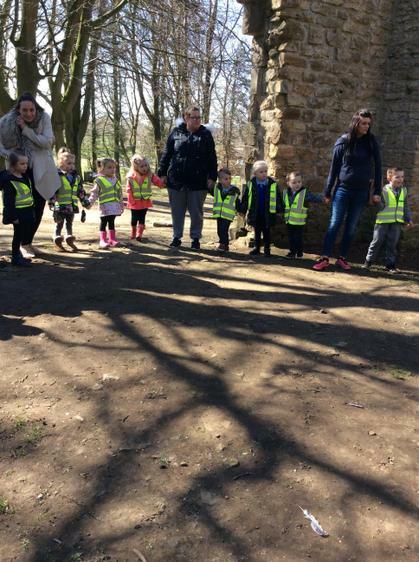 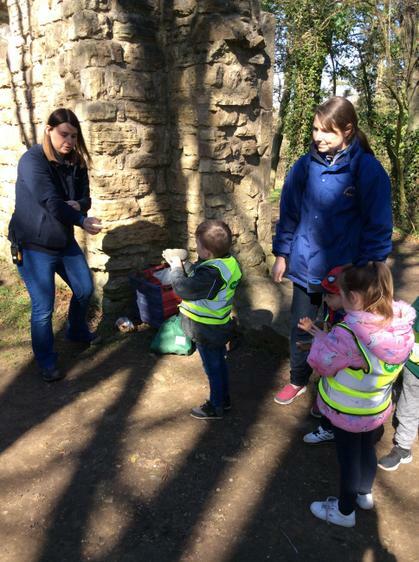 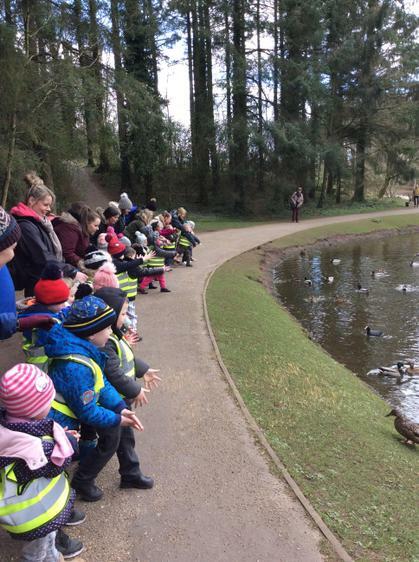 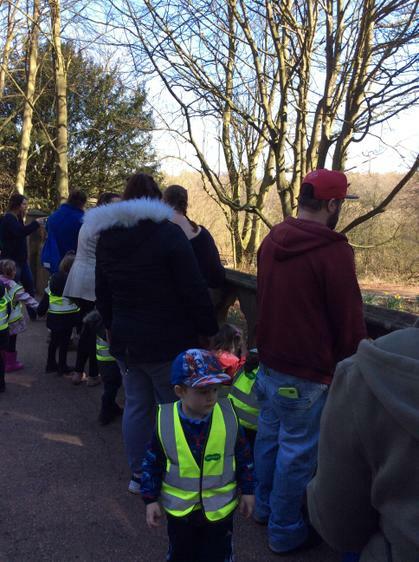 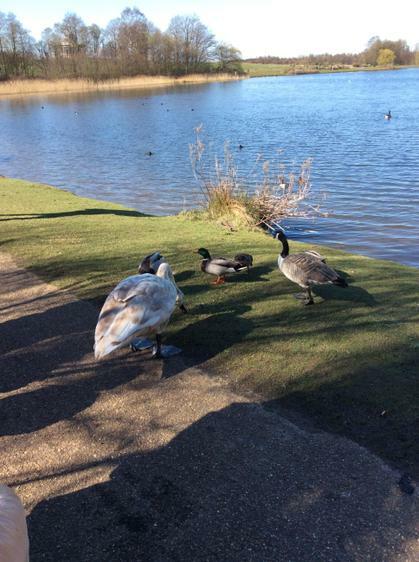 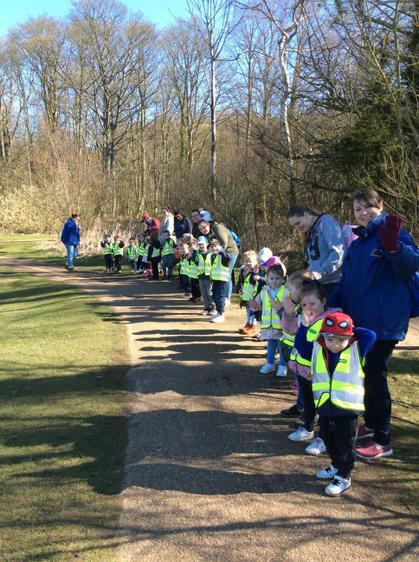 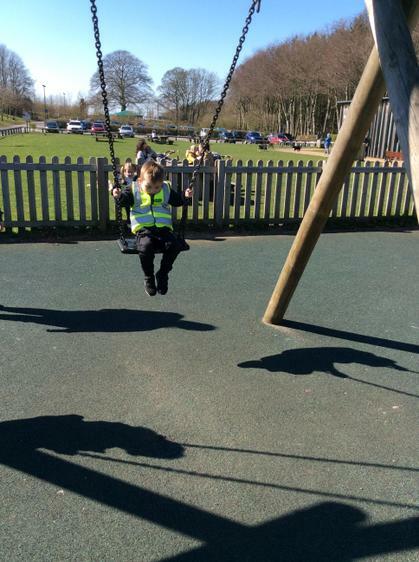 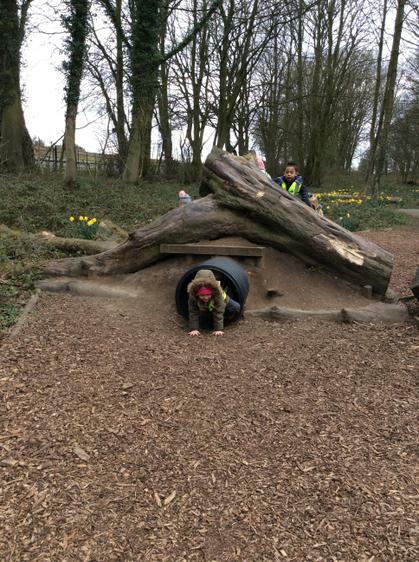 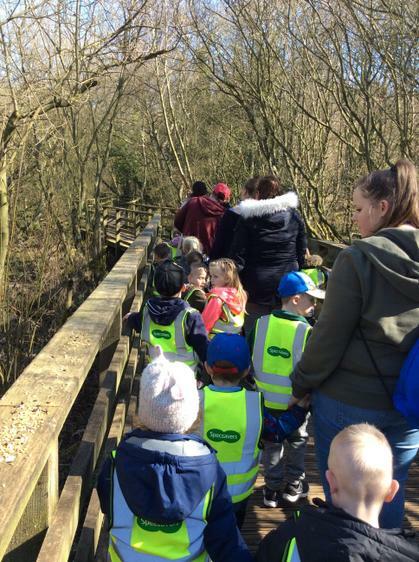 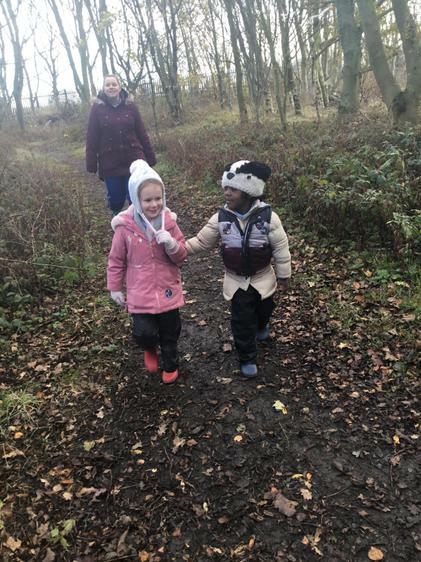 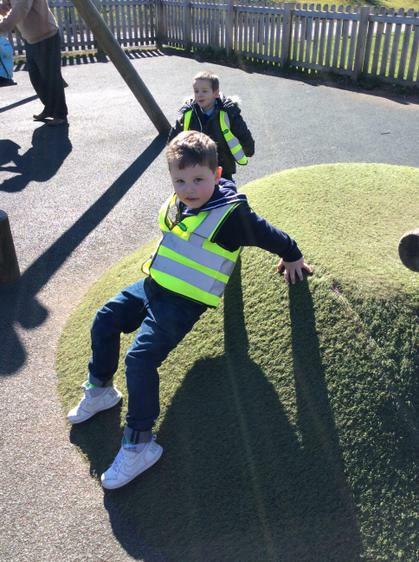 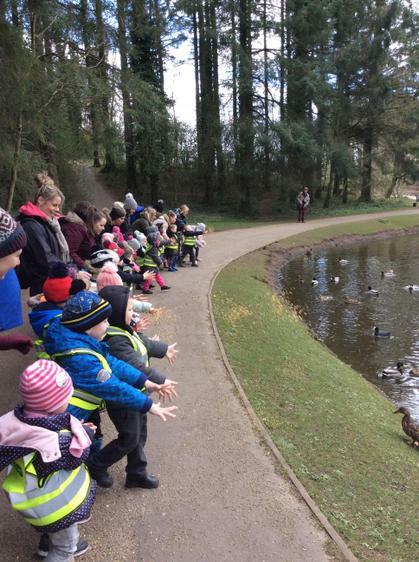 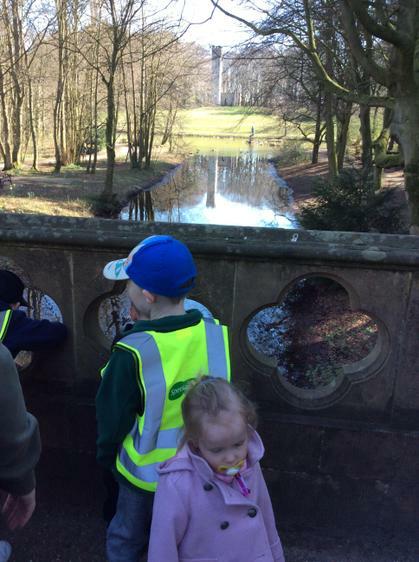 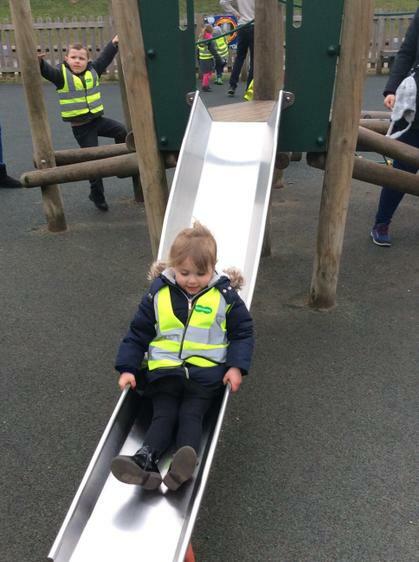 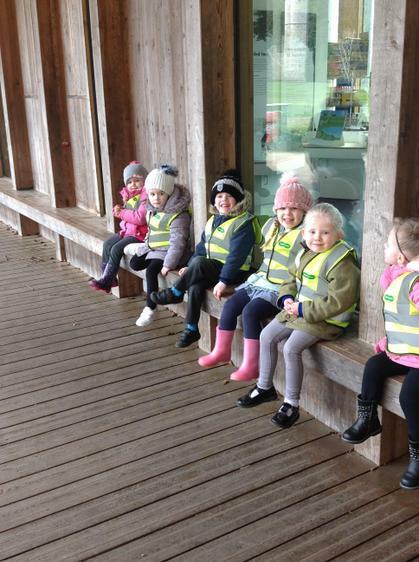 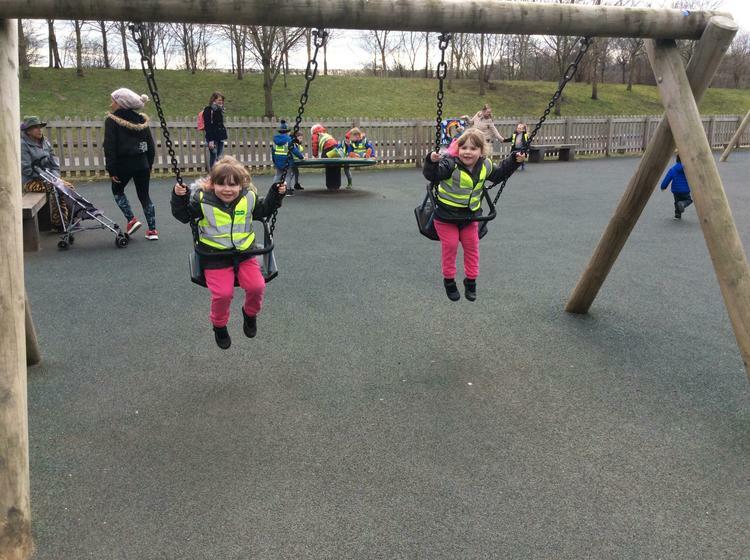 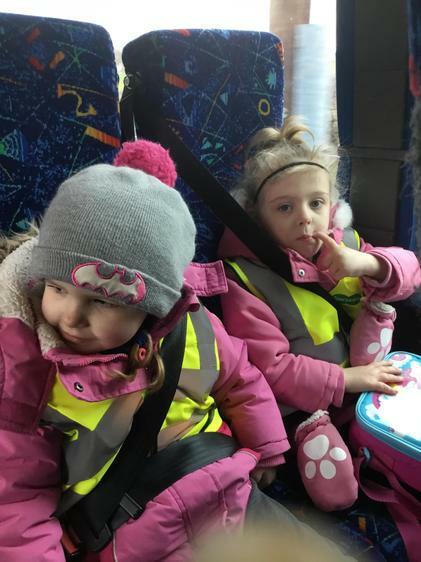 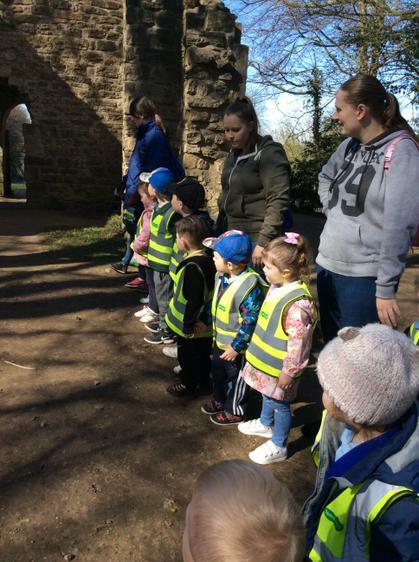 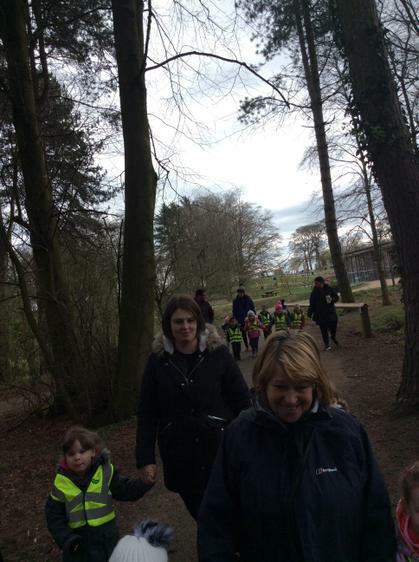 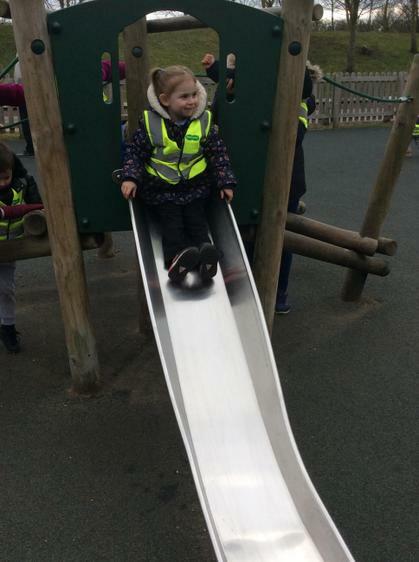 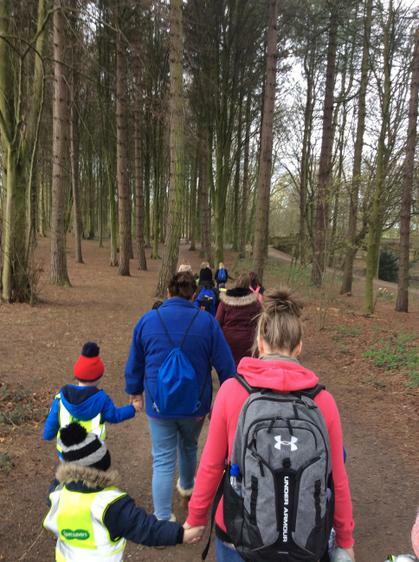 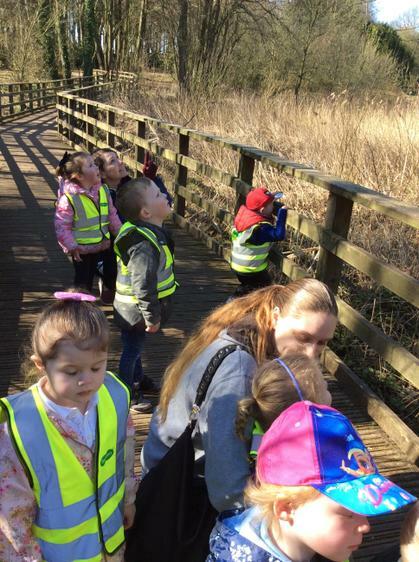 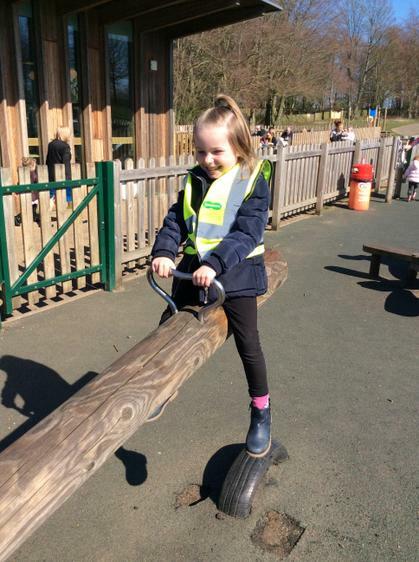 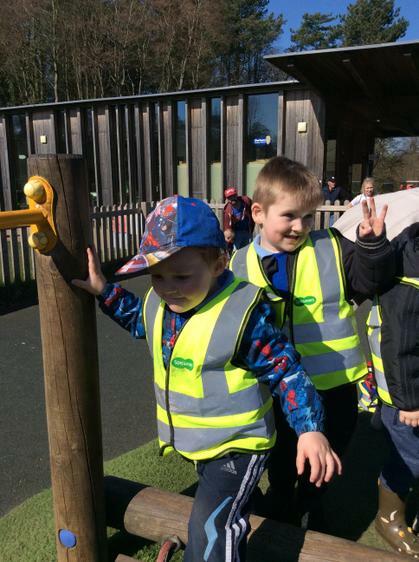 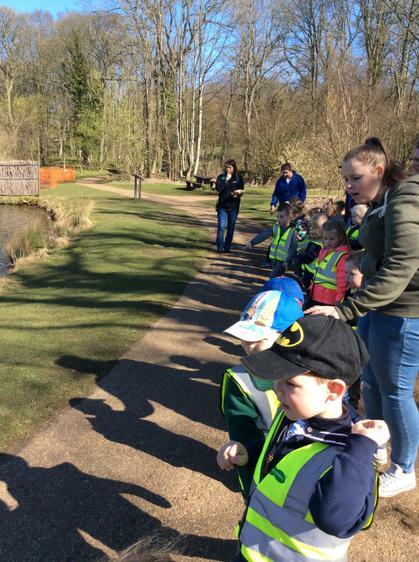 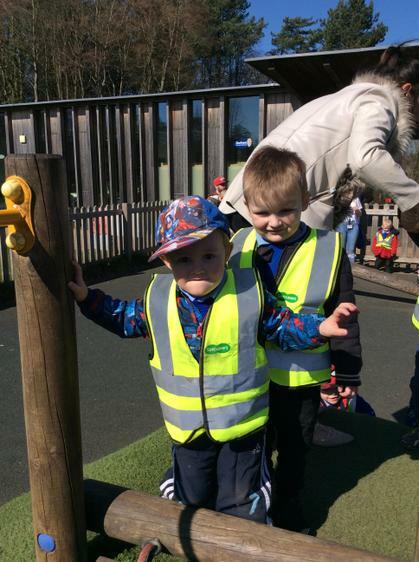 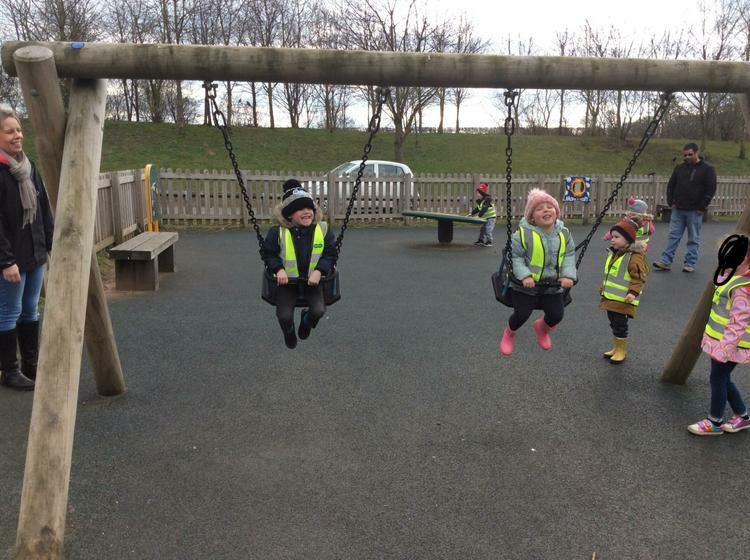 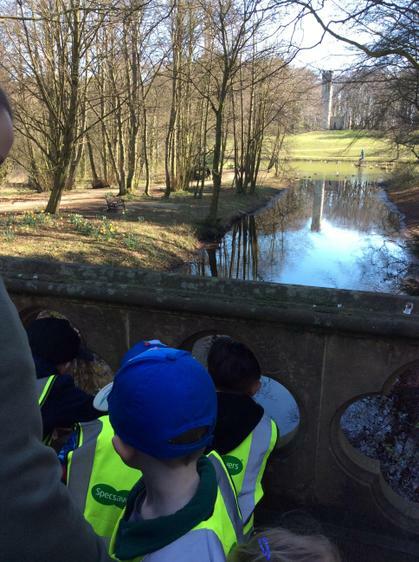 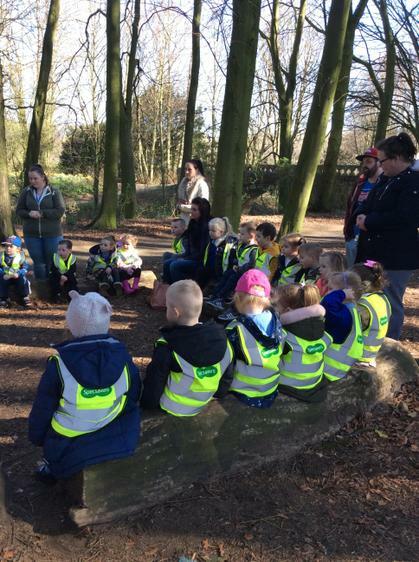 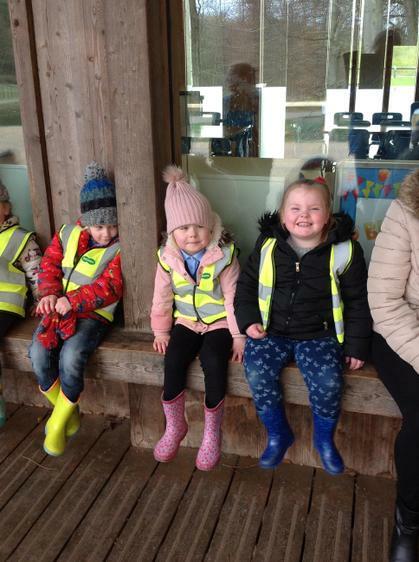 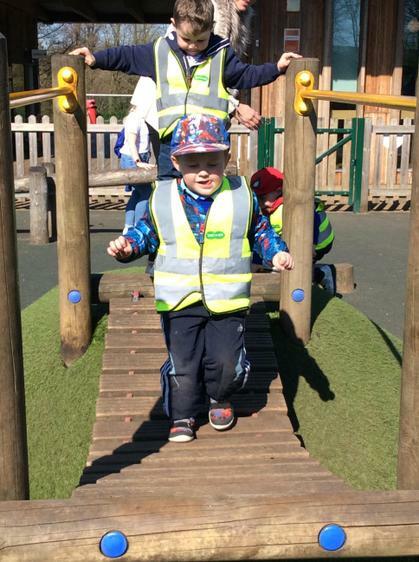 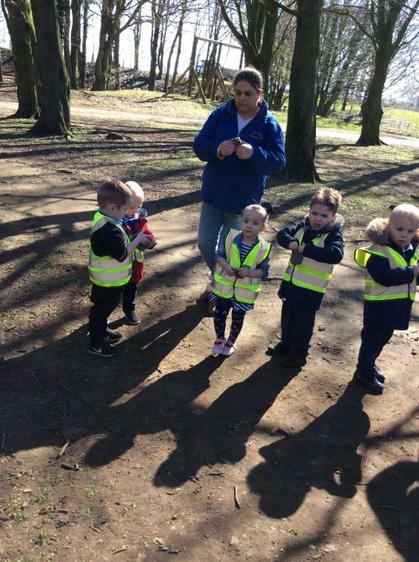 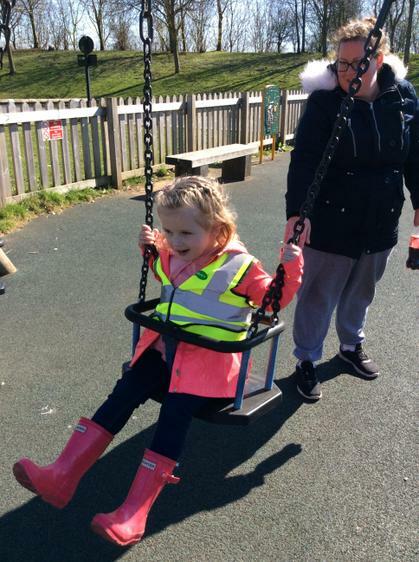 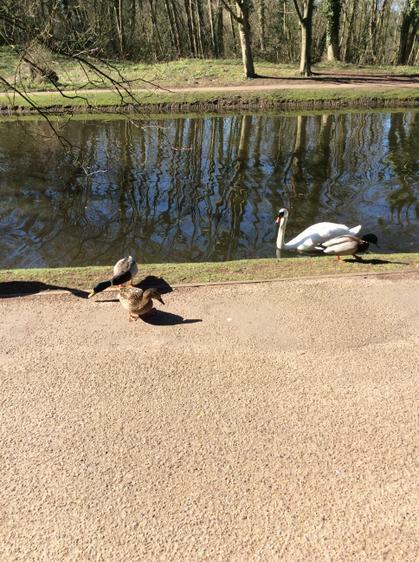 We had a fabulous time at Hardwick Park for both of our trips. 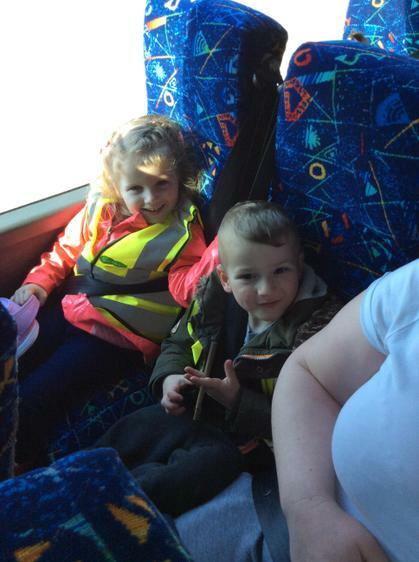 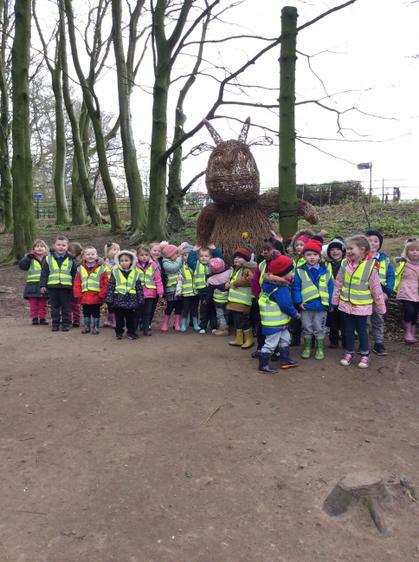 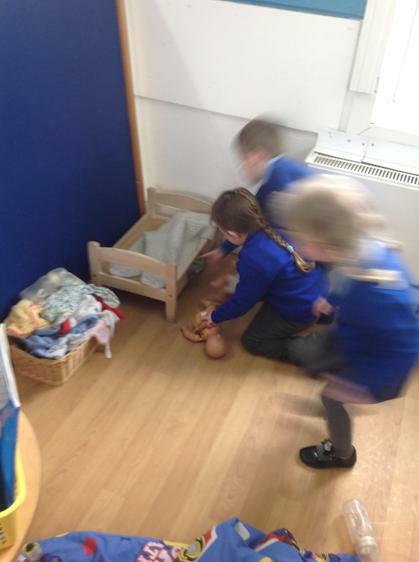 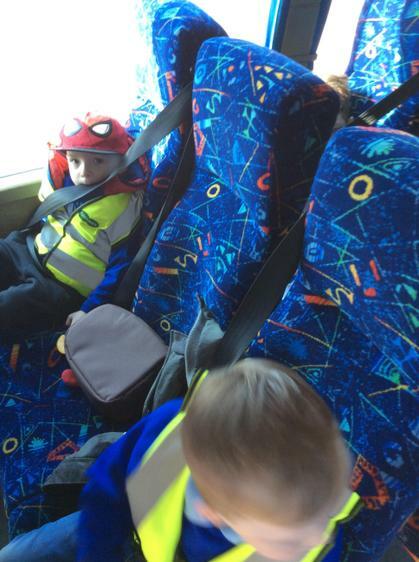 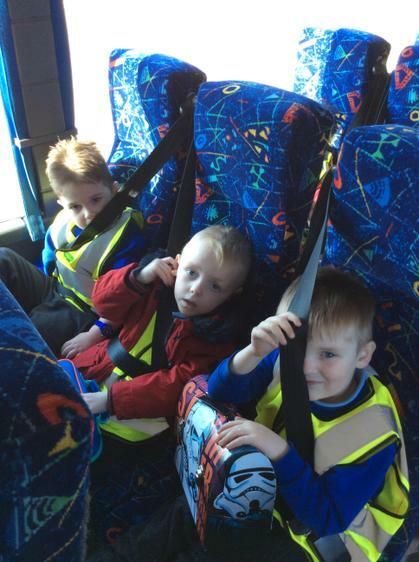 Our trips were based all around ‘The Odd Egg’ story which was our story of the week. 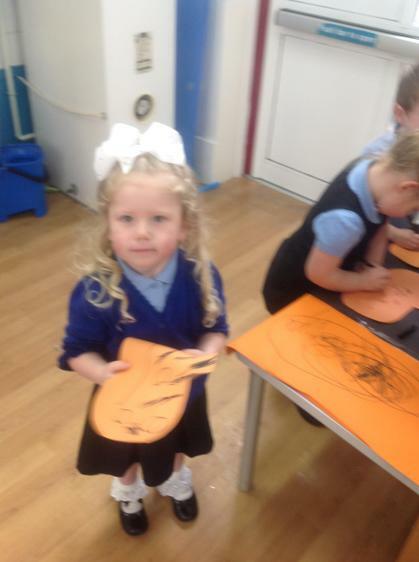 We learnt about animals that lay eggs and the size of the eggs. 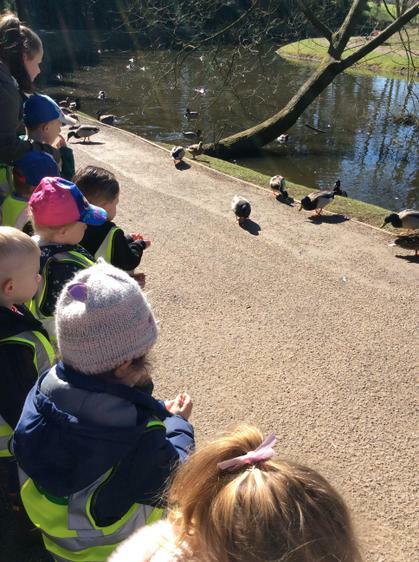 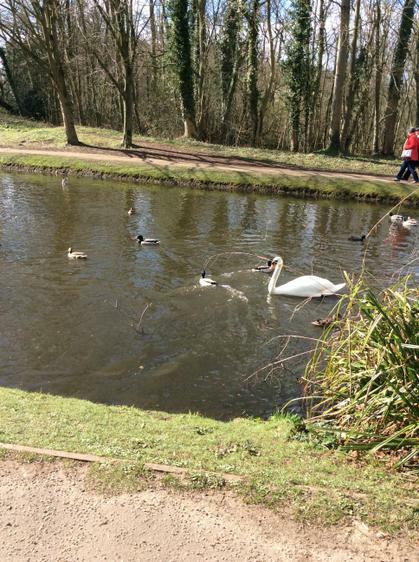 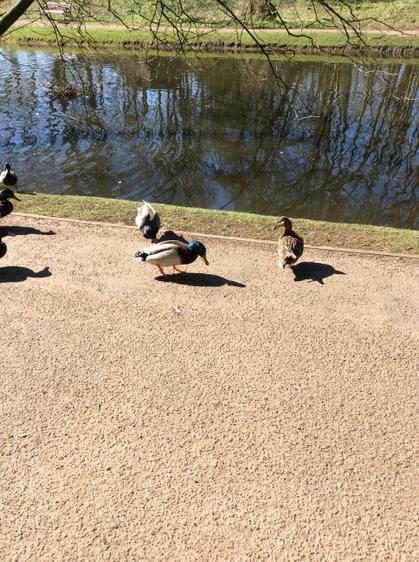 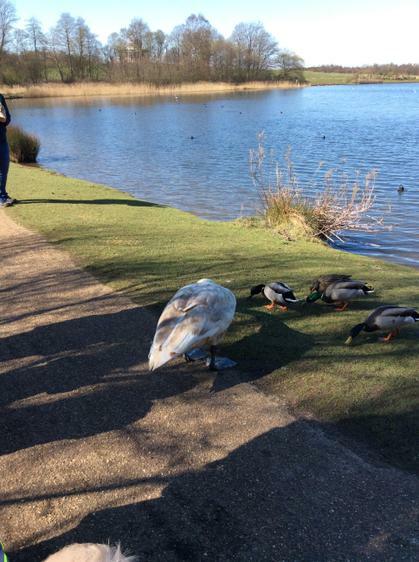 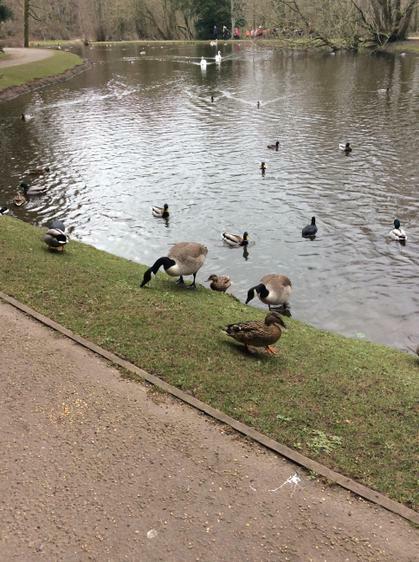 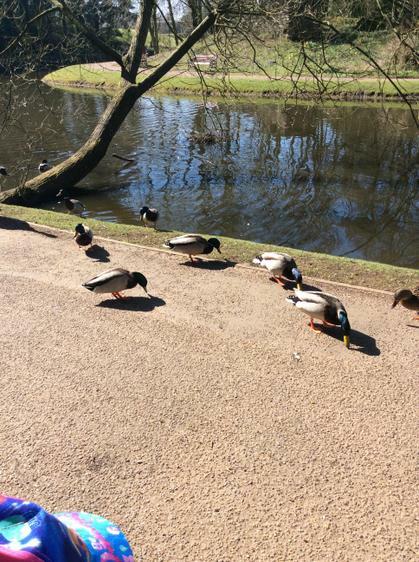 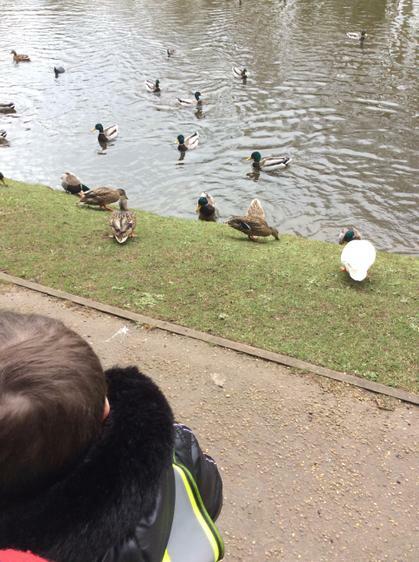 Afterwards we got to feed the birds and the ducks. 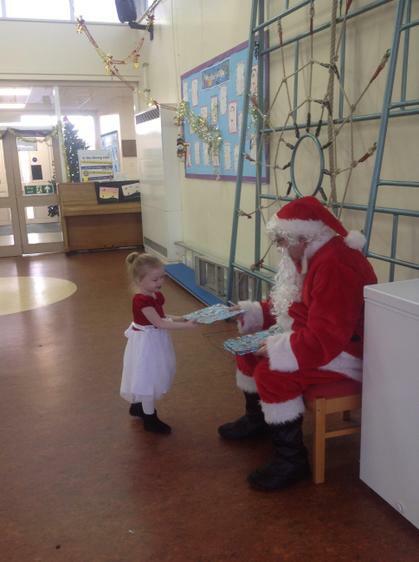 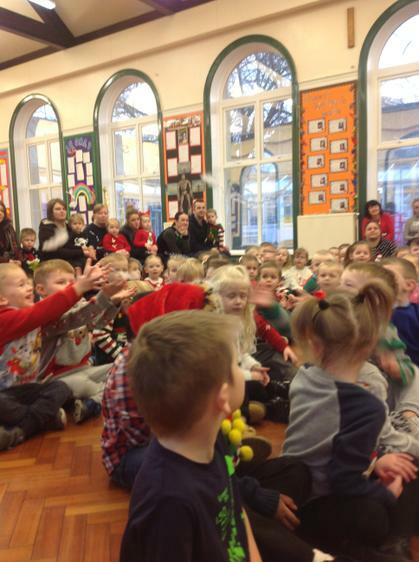 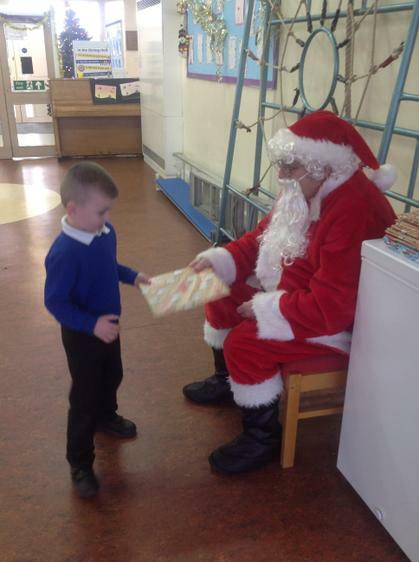 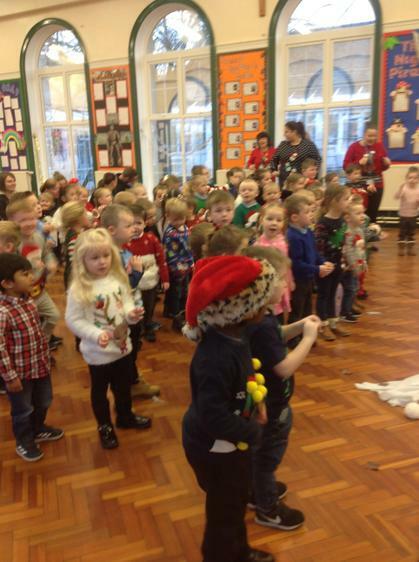 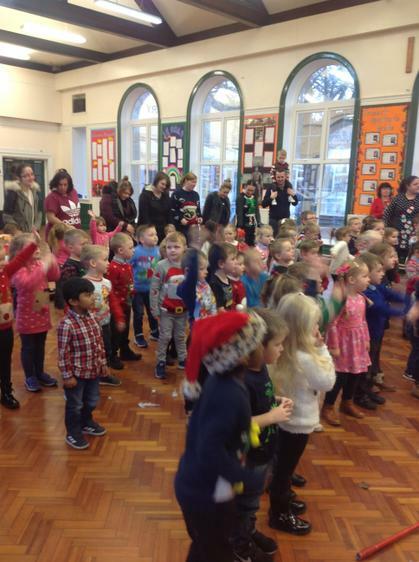 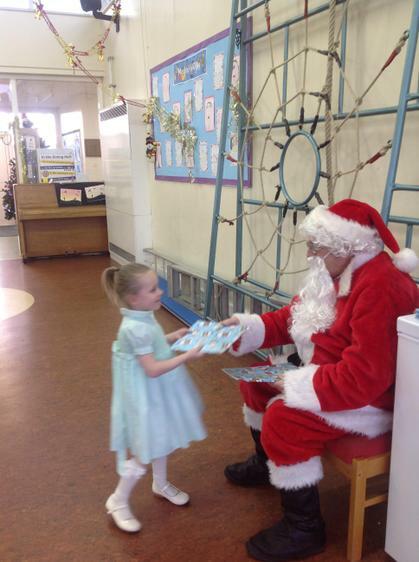 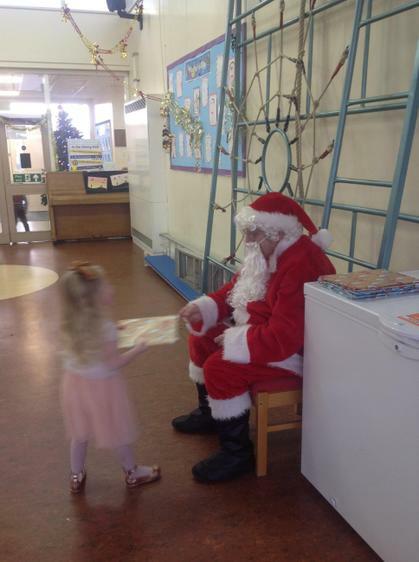 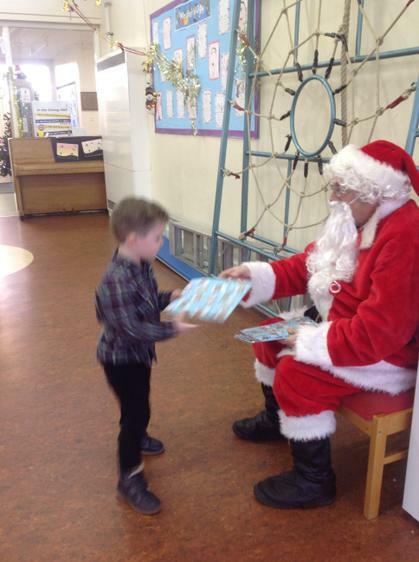 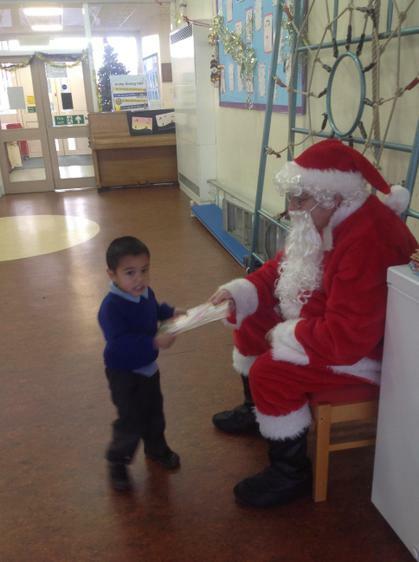 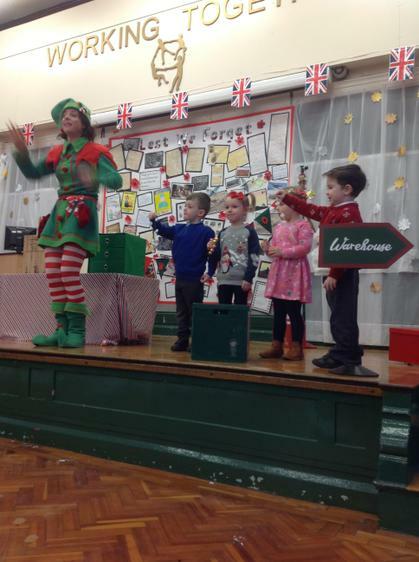 The children were amazing today and blew us away with how fantastic they were! 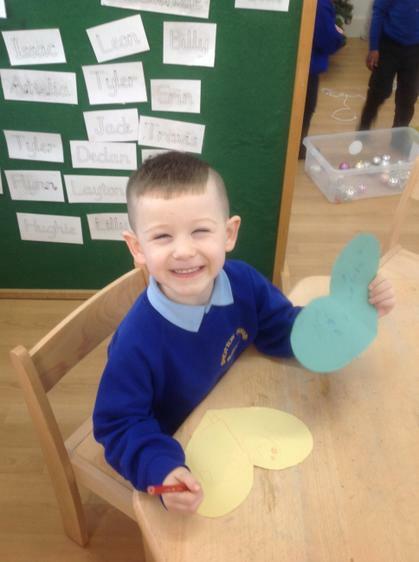 We even made our own odd egg! 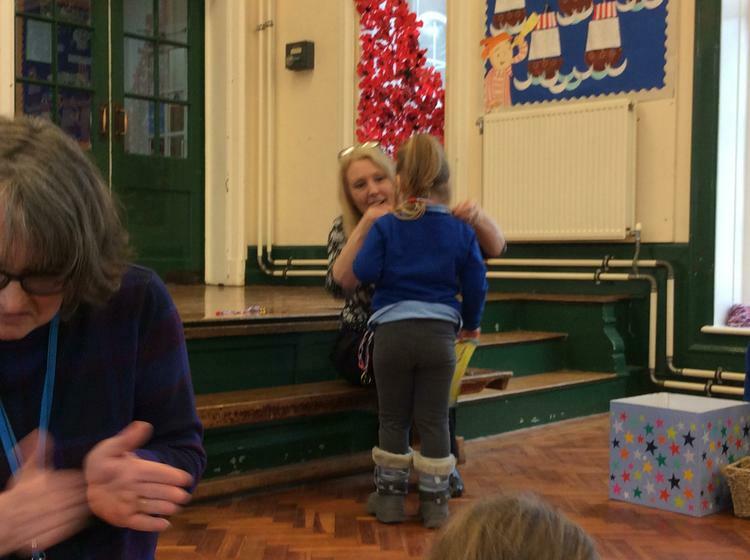 A big thank you too all the parent helpers for both days you were amazing! 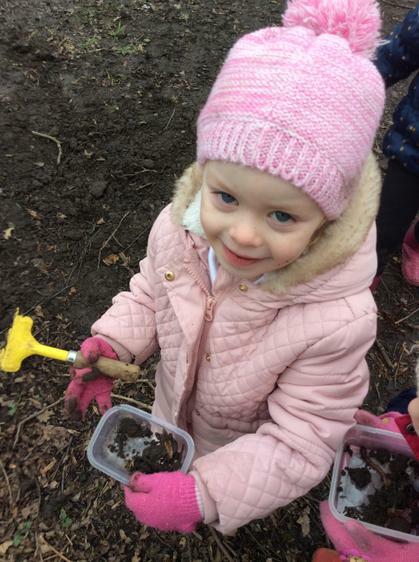 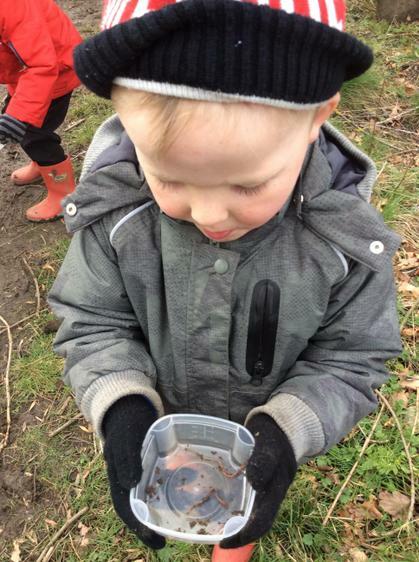 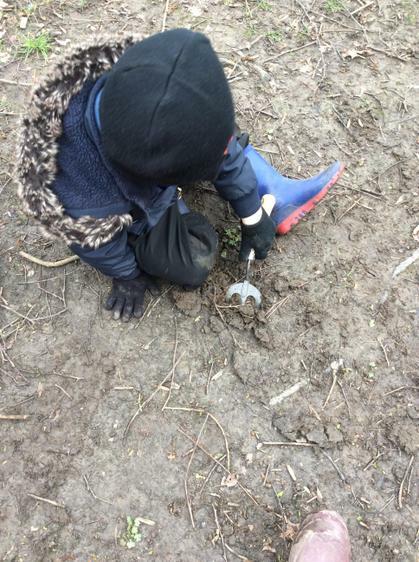 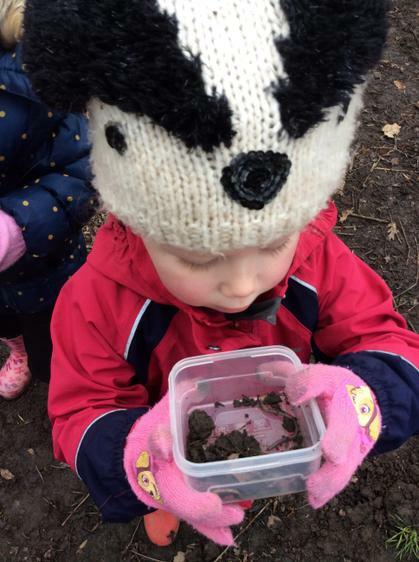 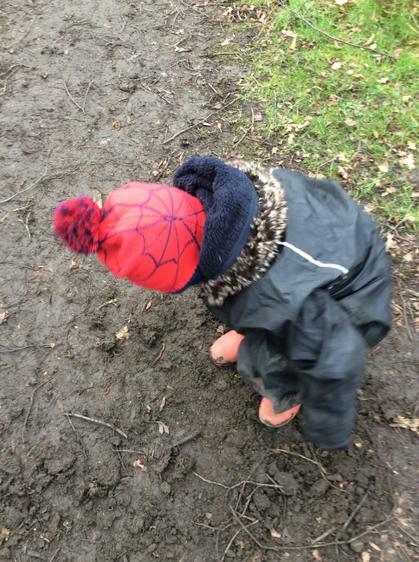 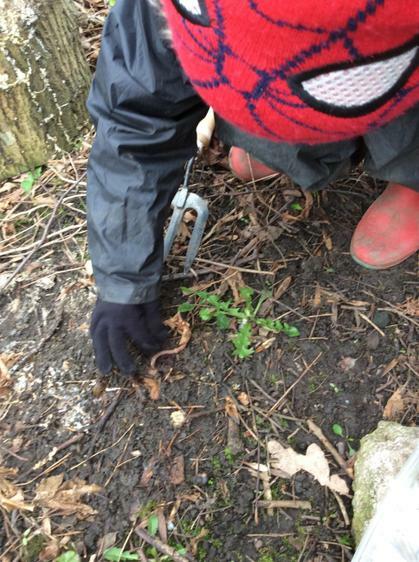 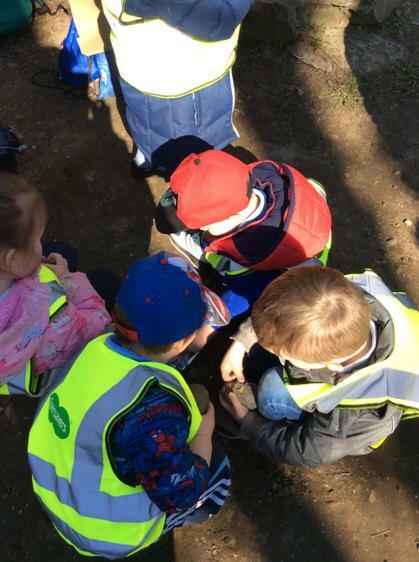 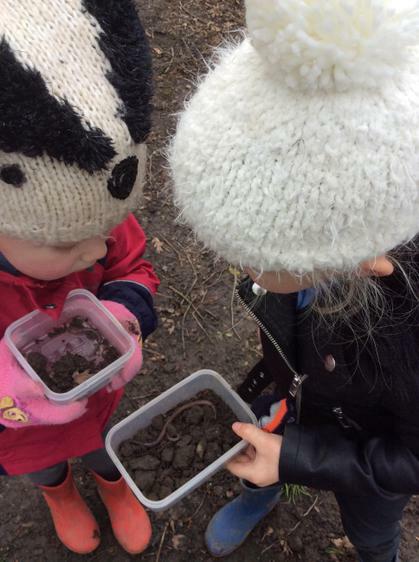 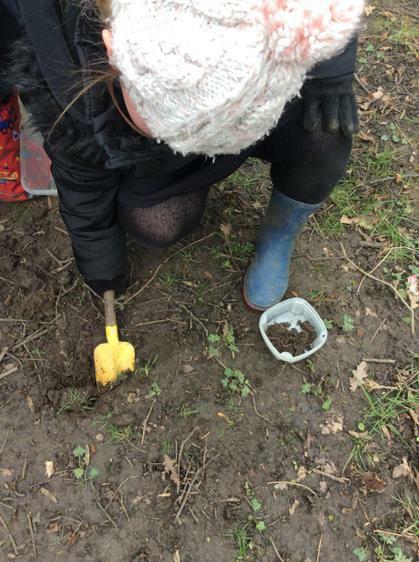 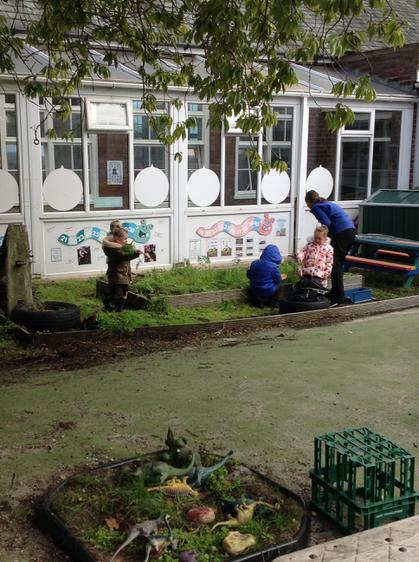 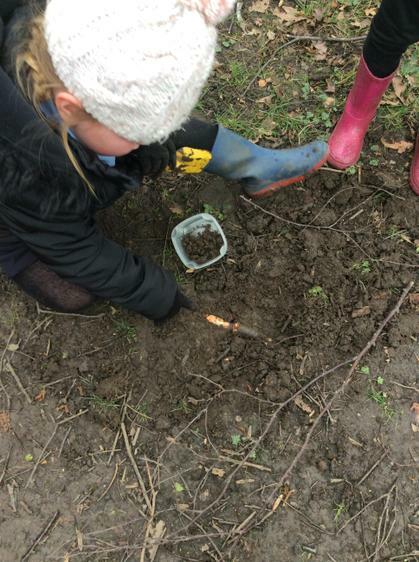 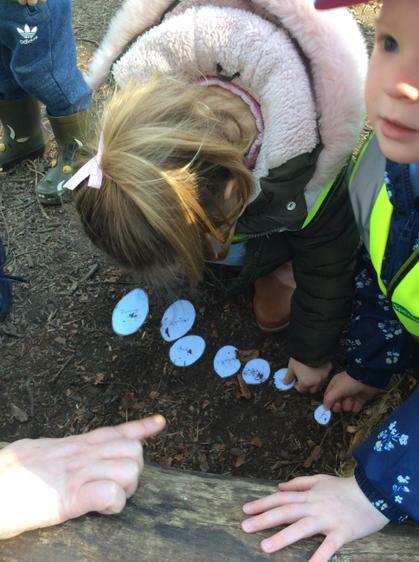 Last week we found lots of worms while hunting for minibeast. 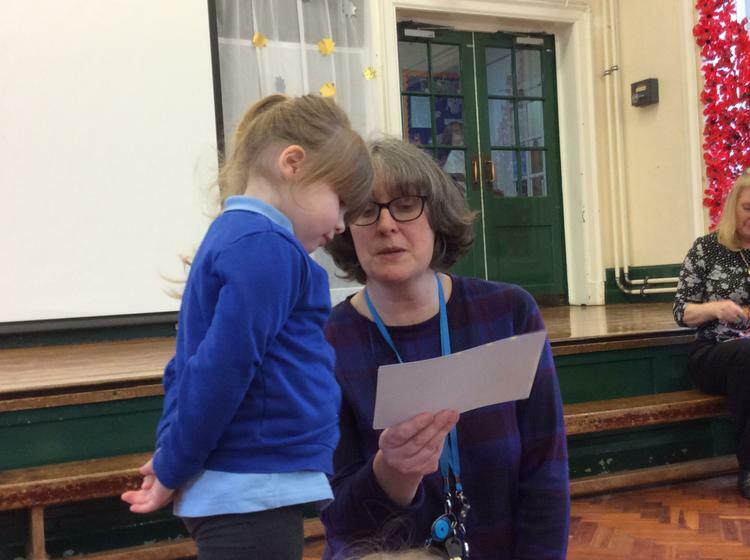 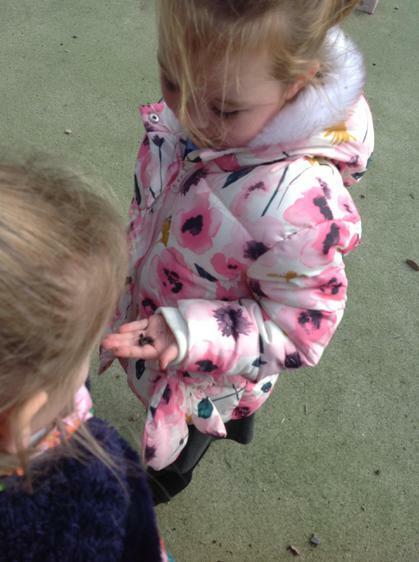 Firstly we learnt some facts about worms. 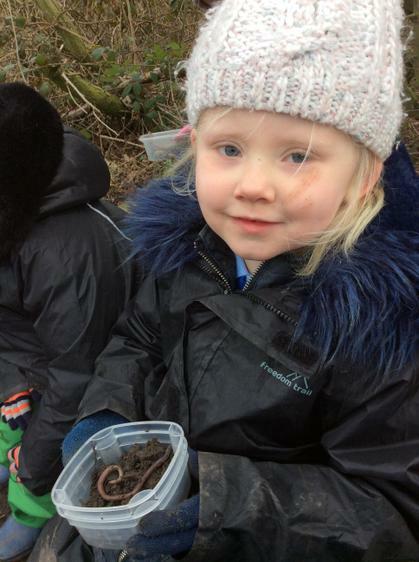 Did you know worms have no eyes and they taste the soil with their whole bodies? 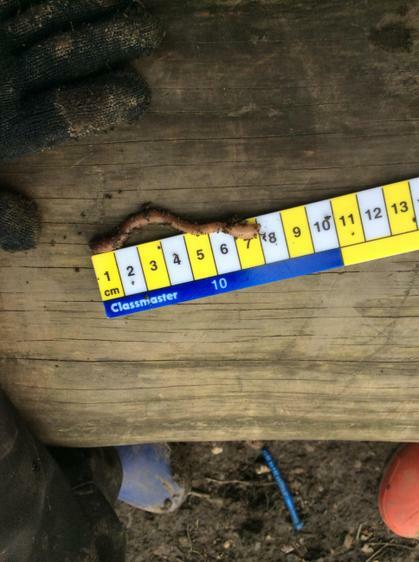 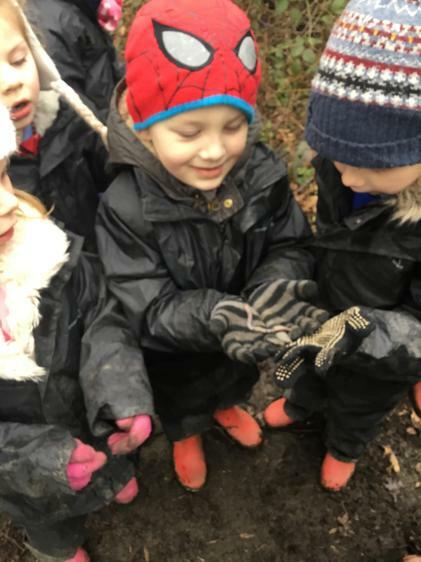 We found worms of all sizes while we were hunting and we were wondering how big? 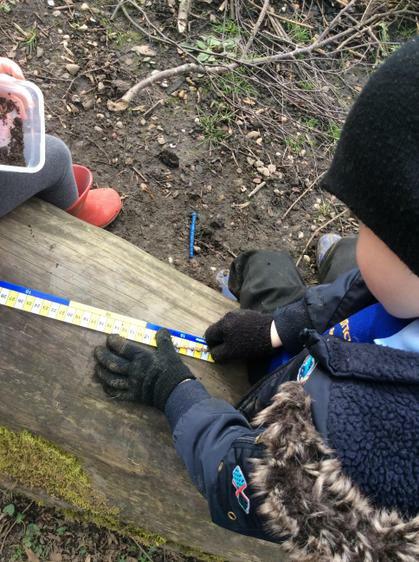 In light of this we brought down some different things to help us measure the worms we found. 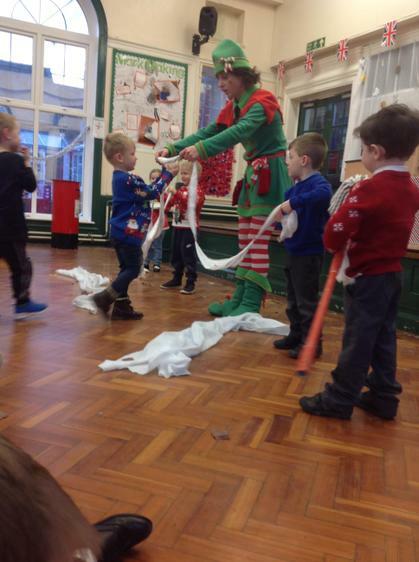 This wasn’t as easy as it sounds as they are so wiggly but it made us giggle a lot! 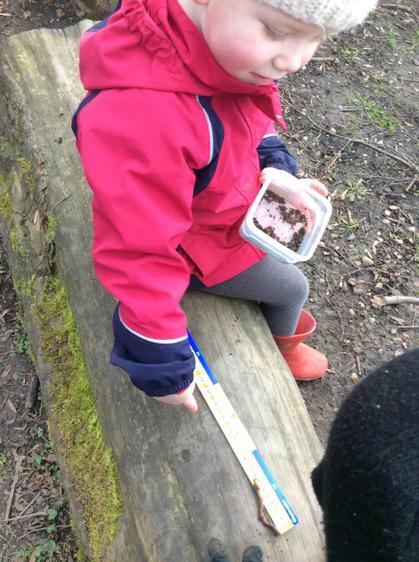 Erin and Faith found twin worms that were both 8cm long but Isabella found the longest worm at a massive 13 cms long! 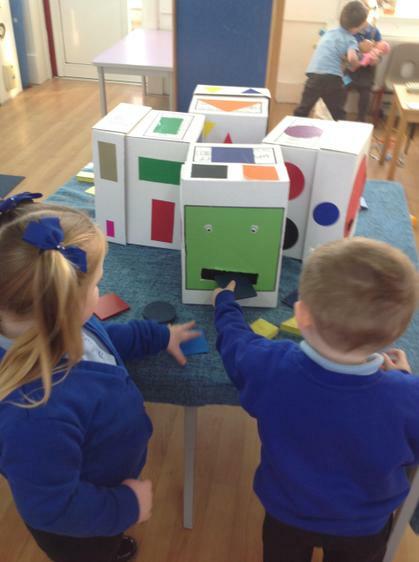 Layton and Lilly used cubes to measure theirs and these came to 5 cubes long. 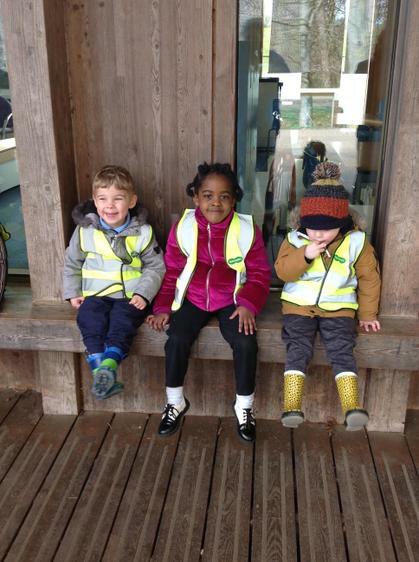 ~ Noah S - why have you come to nursery? 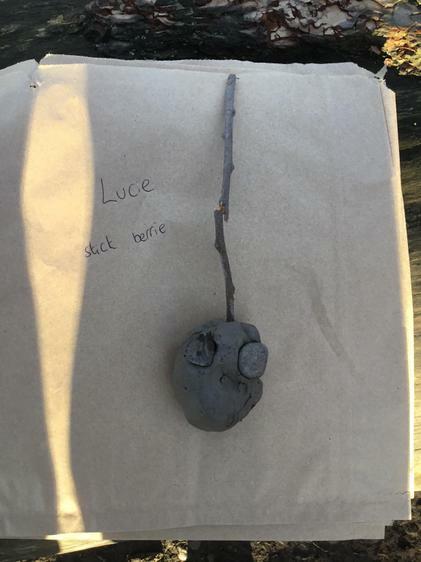 ~ Lucie - what is your name? 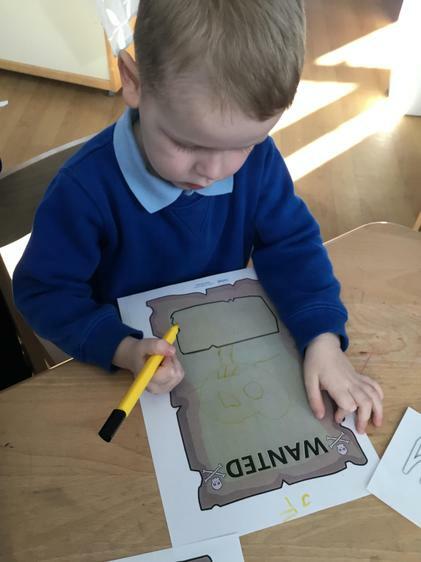 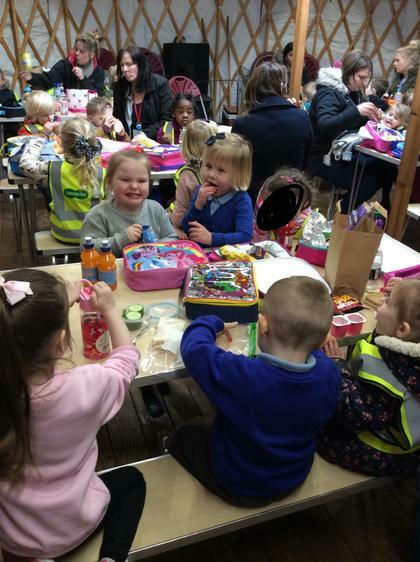 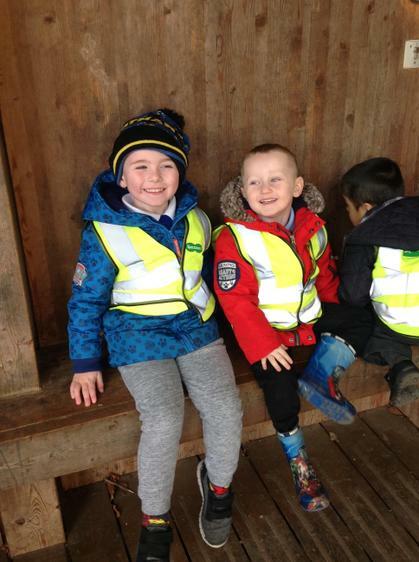 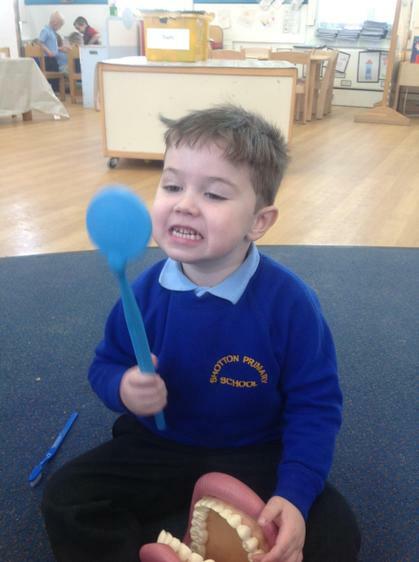 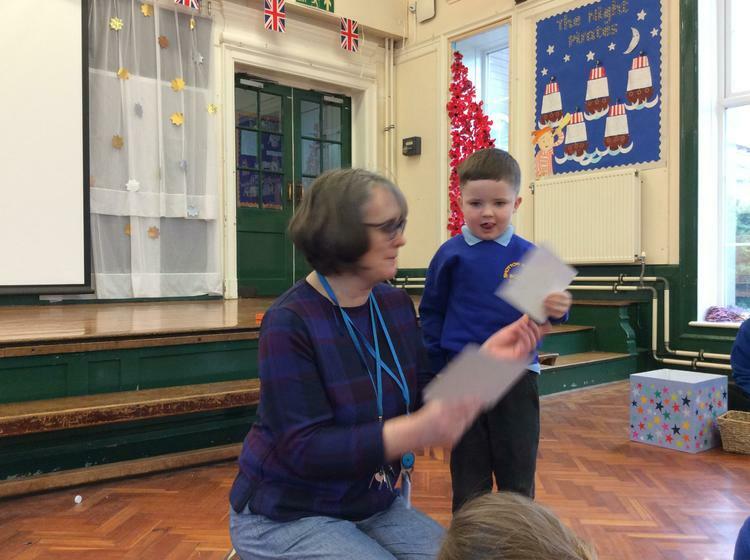 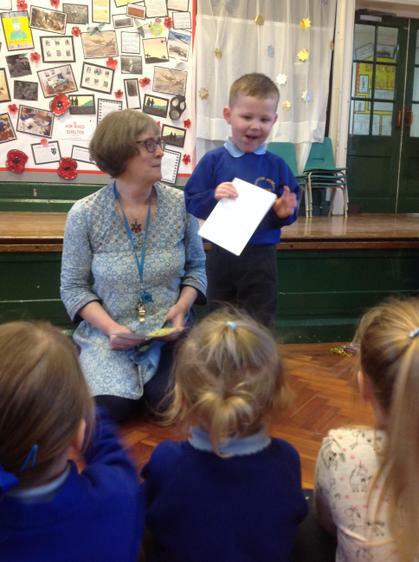 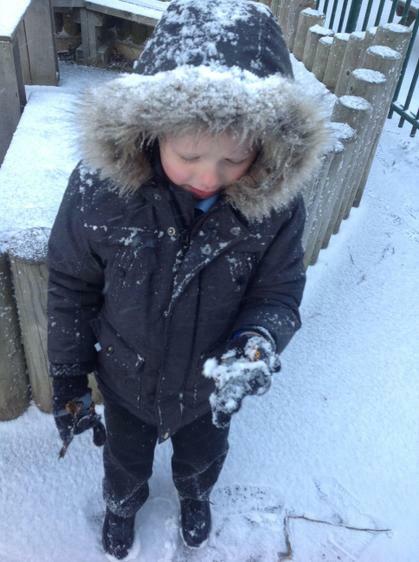 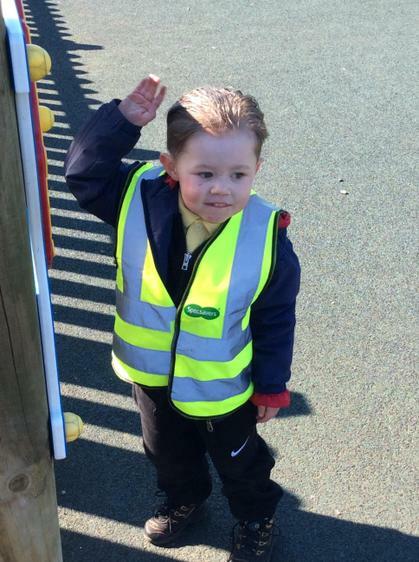 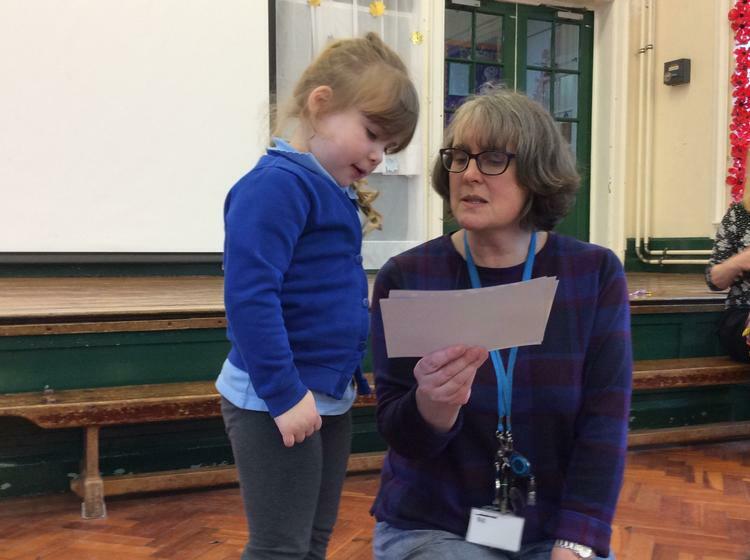 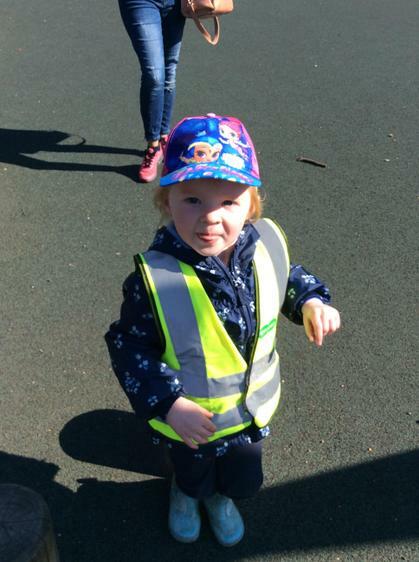 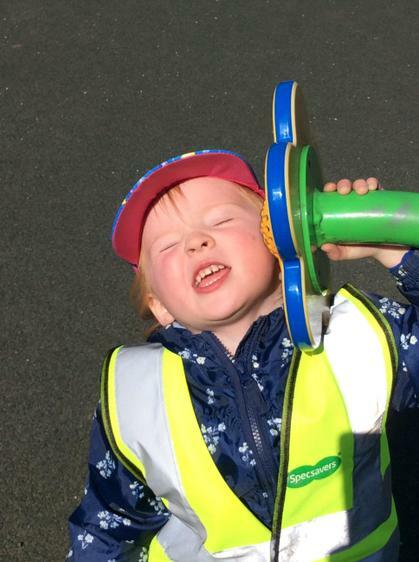 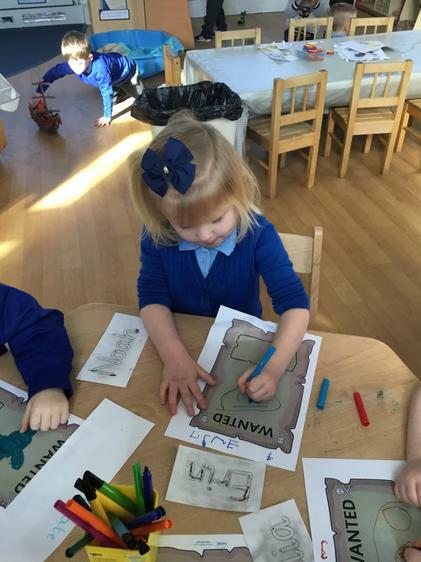 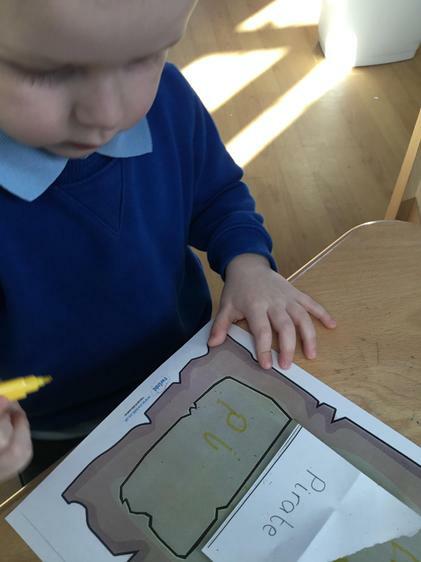 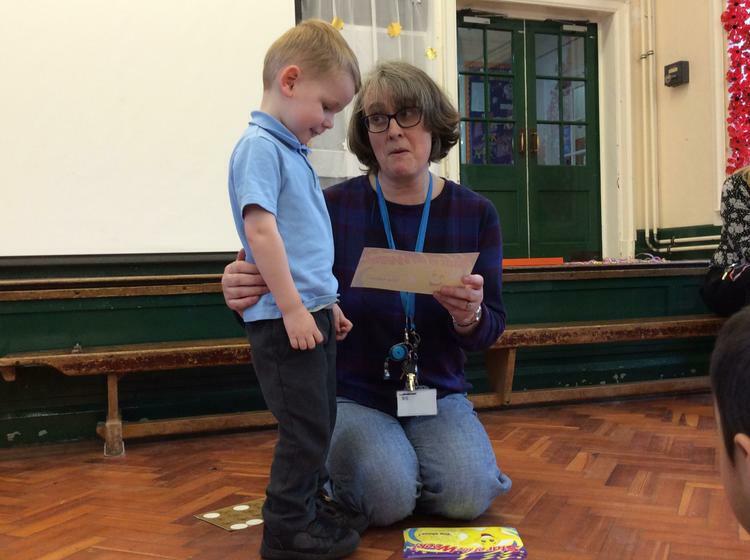 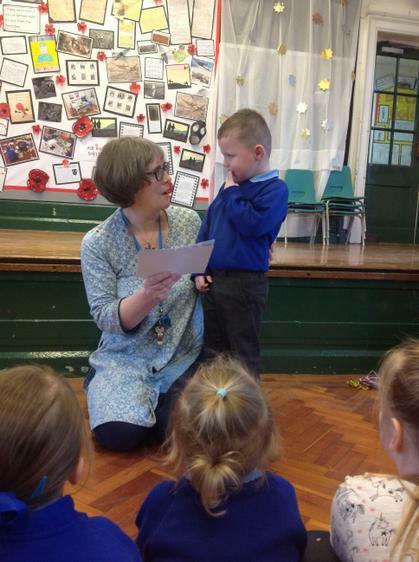 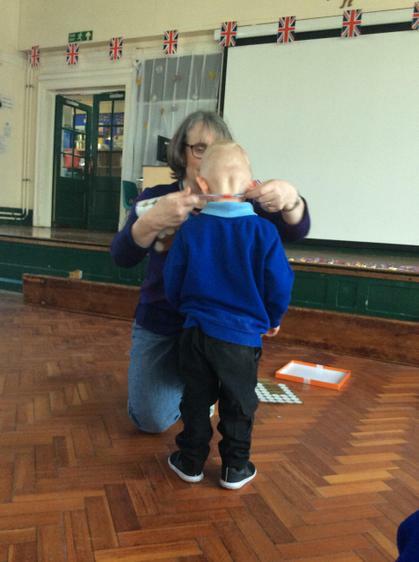 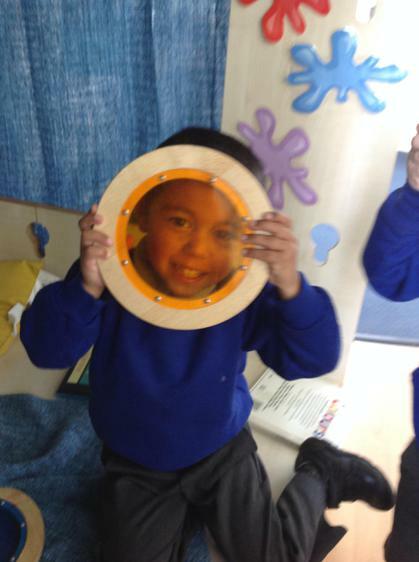 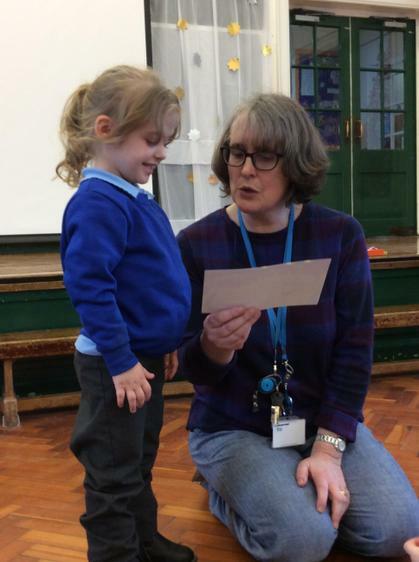 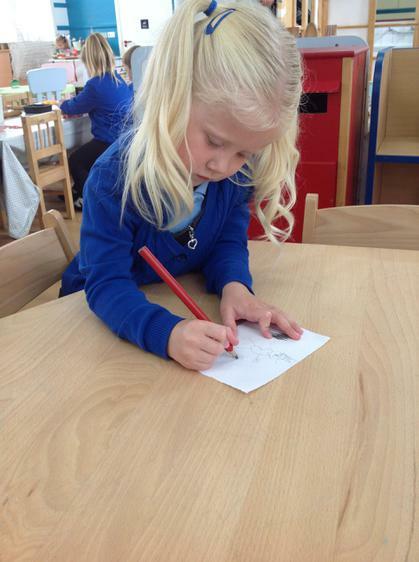 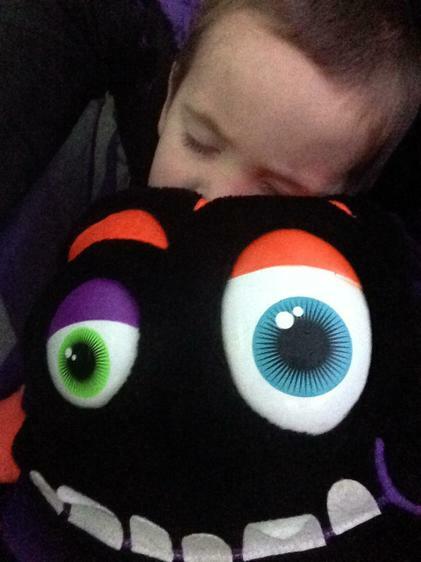 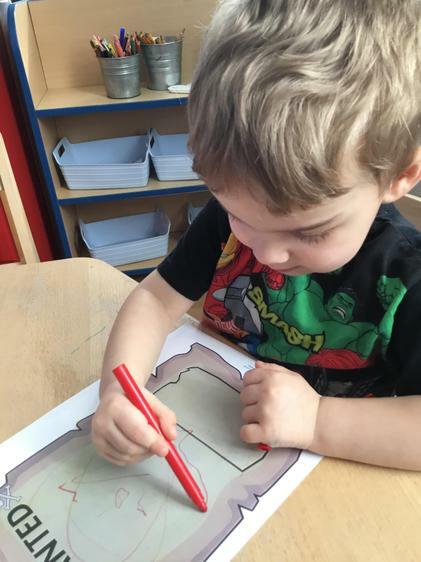 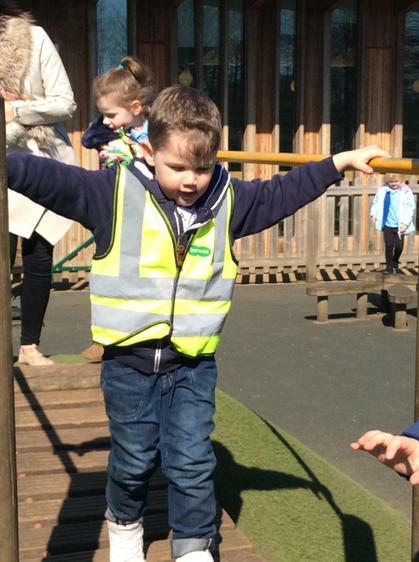 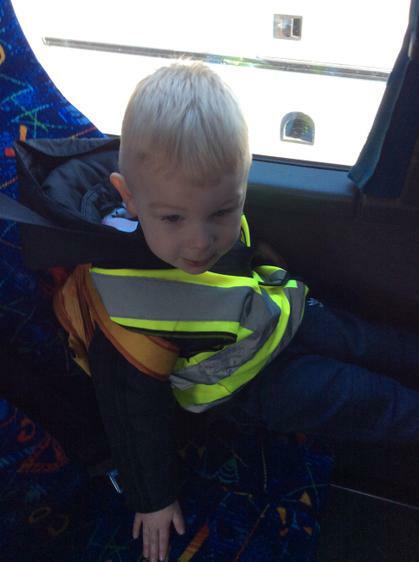 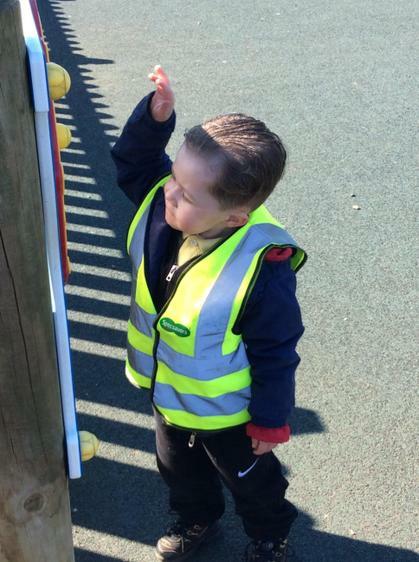 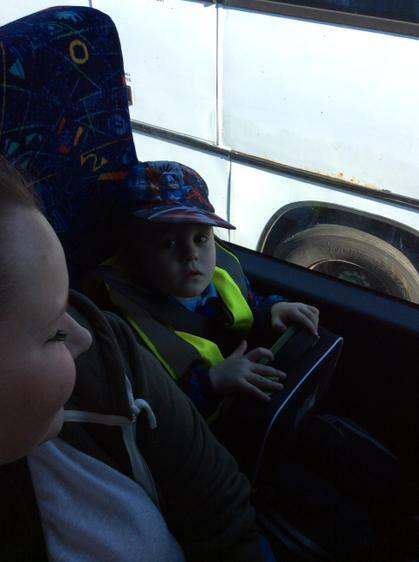 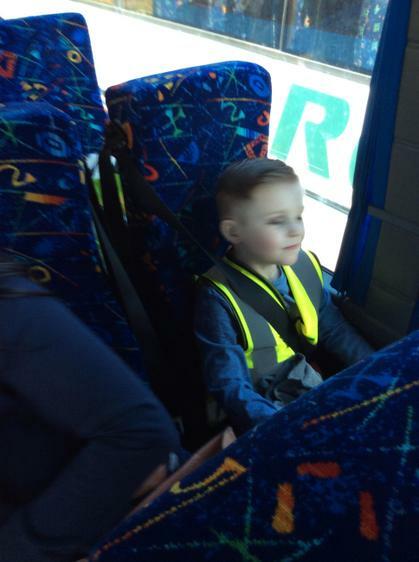 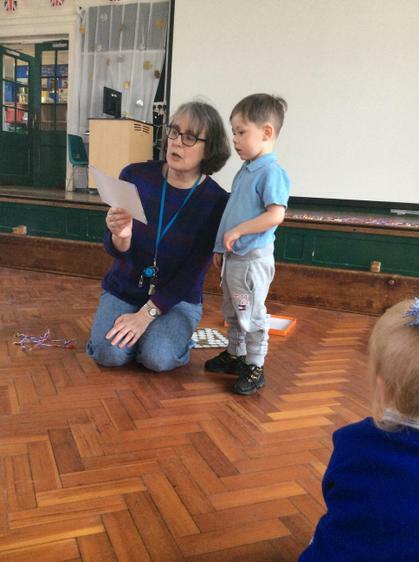 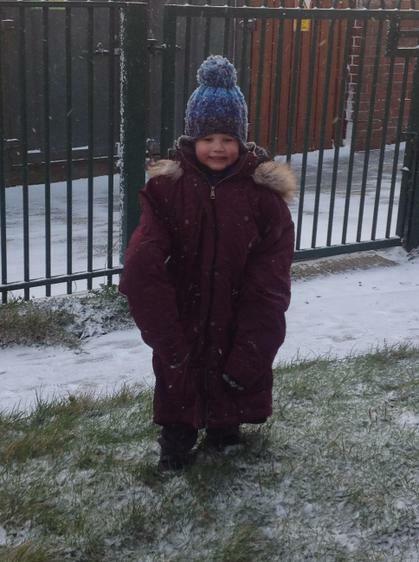 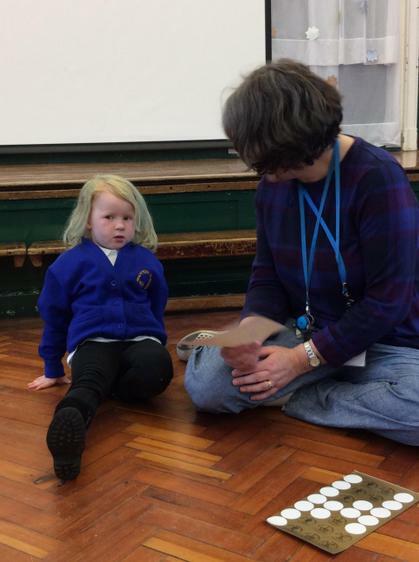 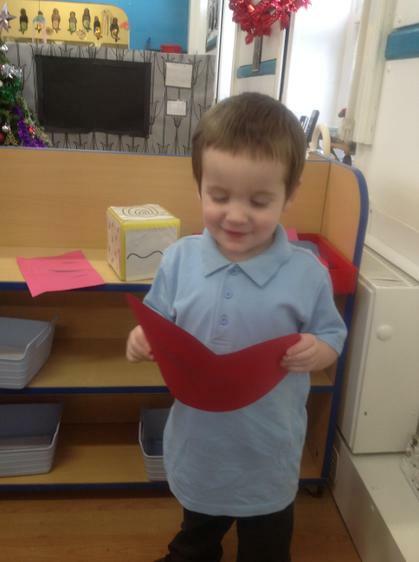 ~ Frankie - what’s it like being in Nursery? 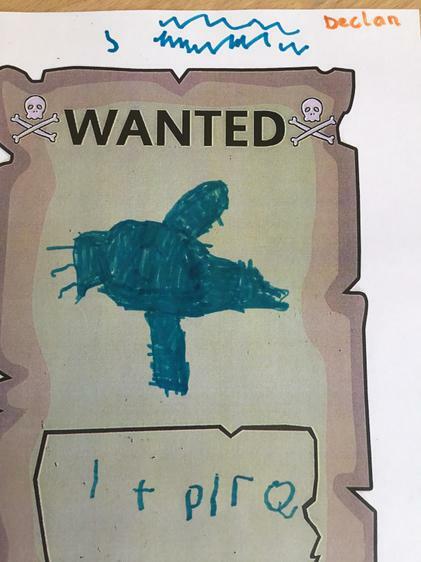 ~ Jake - where’s your ship? 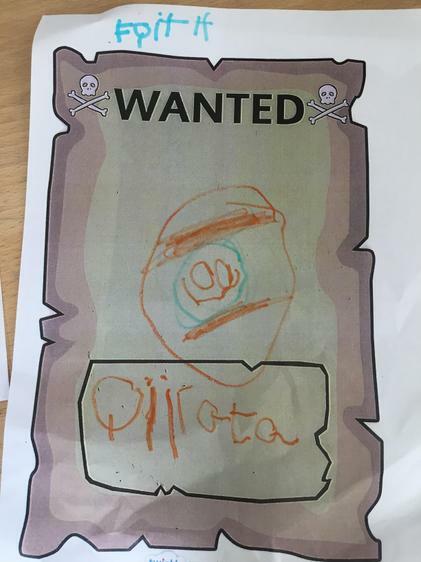 ~ Nathan - do pirates run? 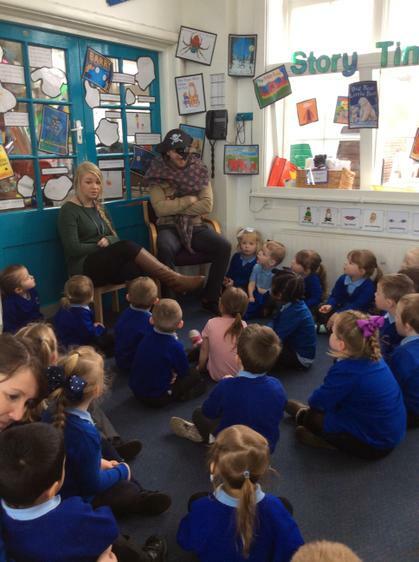 We then sent the Captain Jack Sparrow back to the office to send him back to his family! 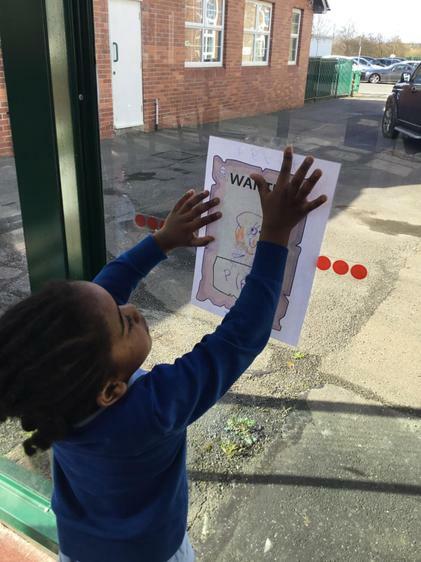 Hopefully we won’t see him again and he has found his way home. 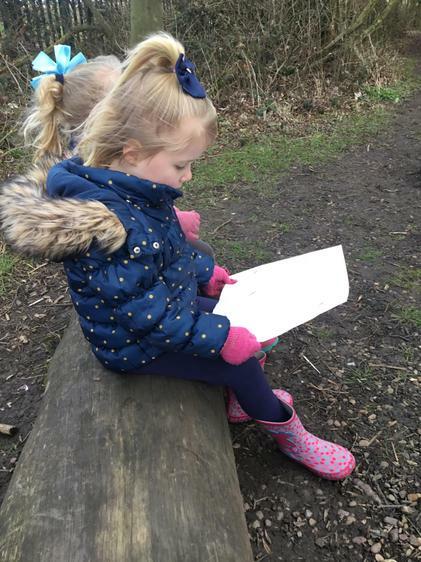 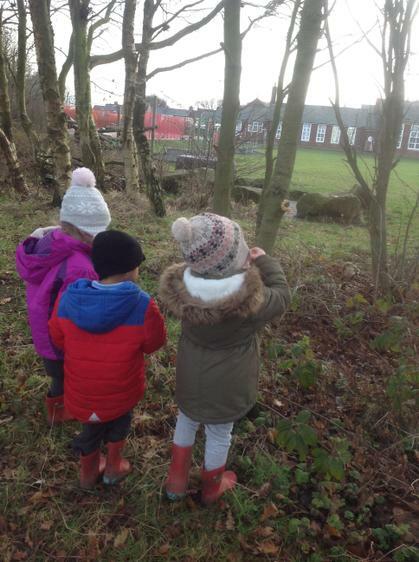 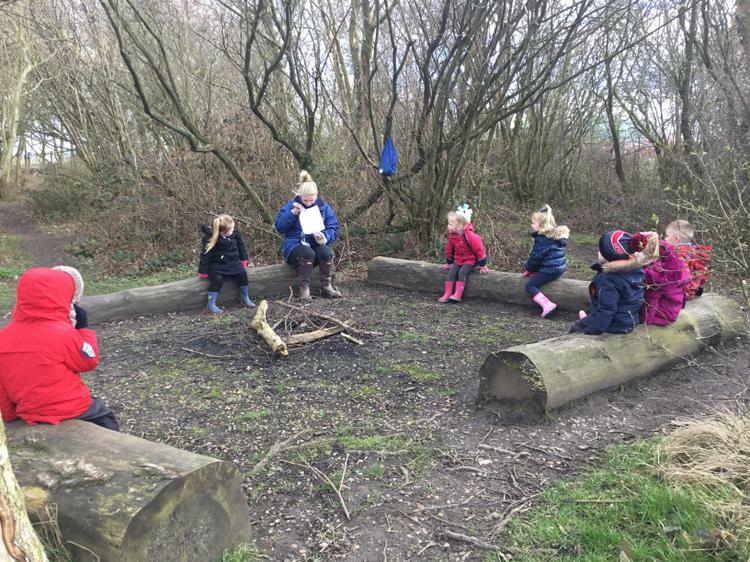 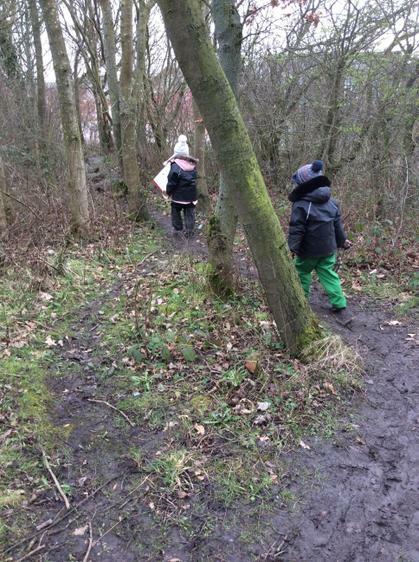 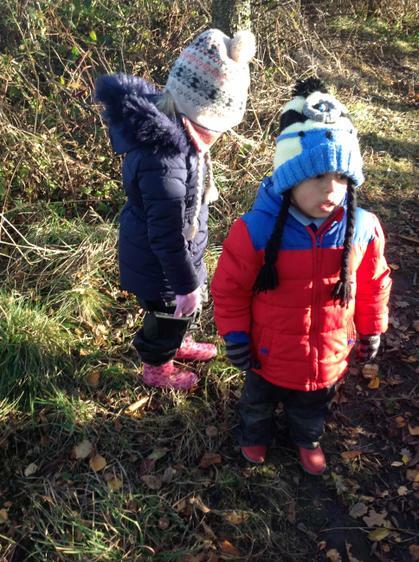 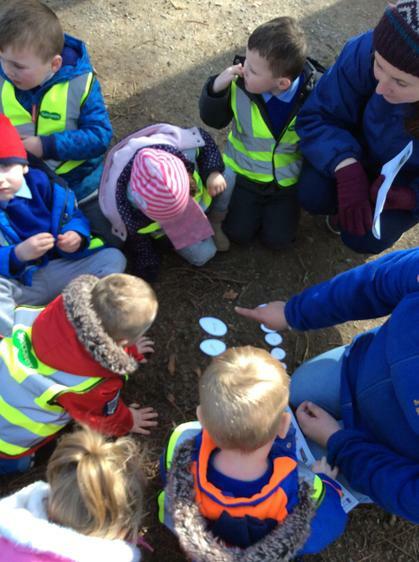 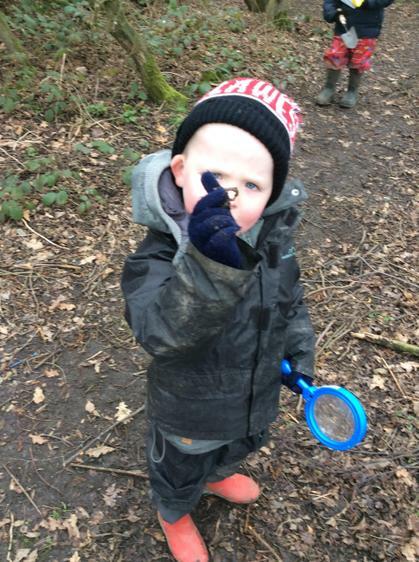 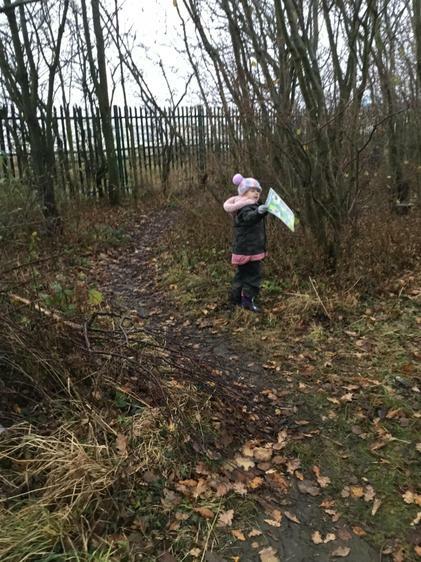 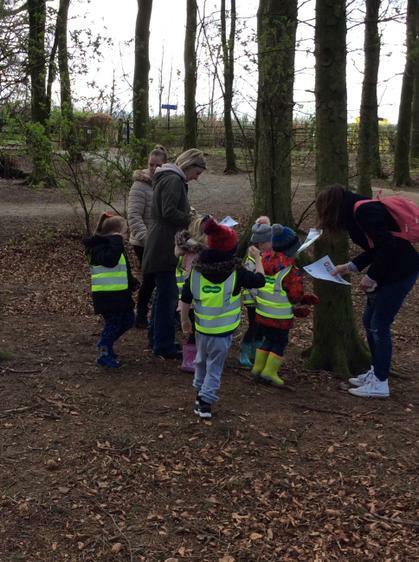 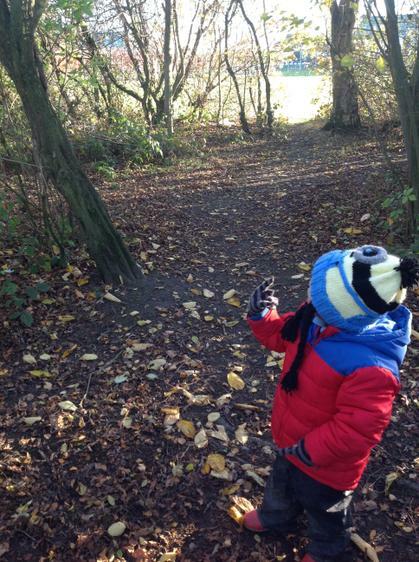 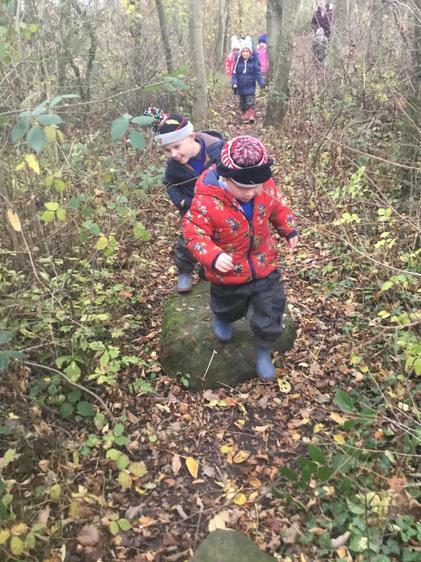 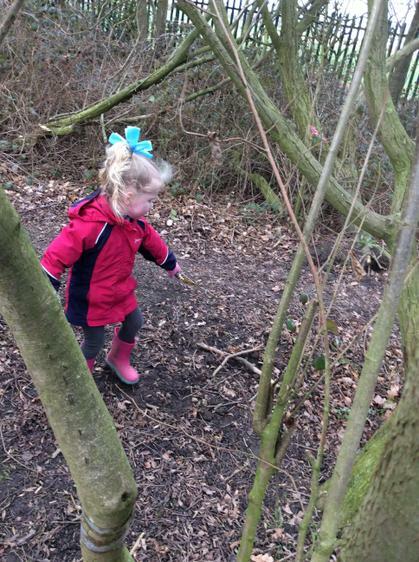 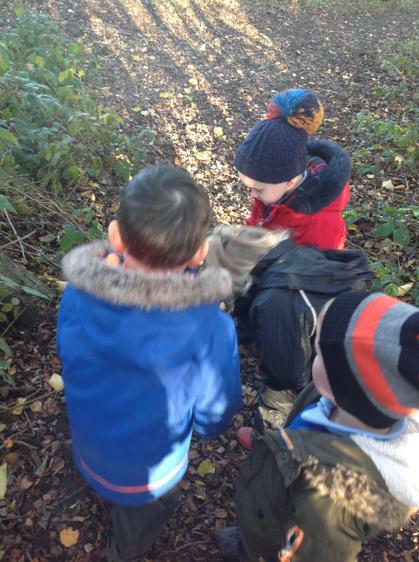 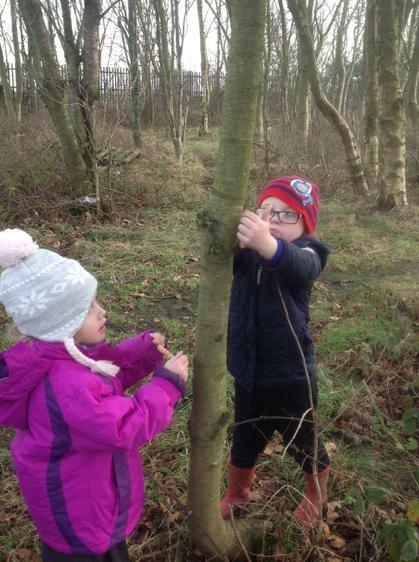 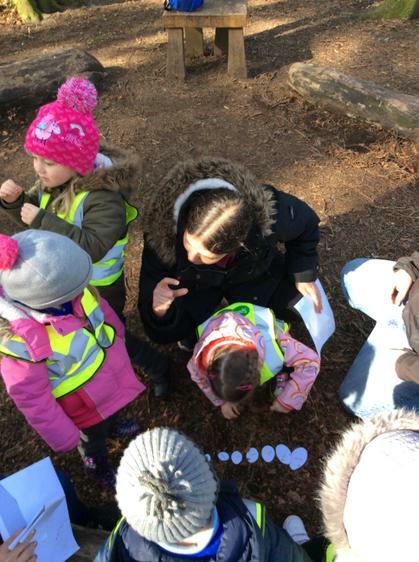 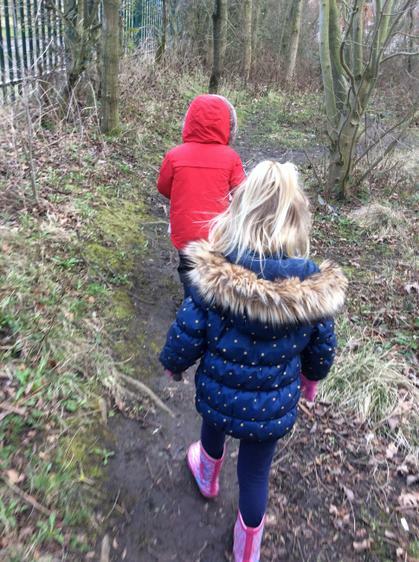 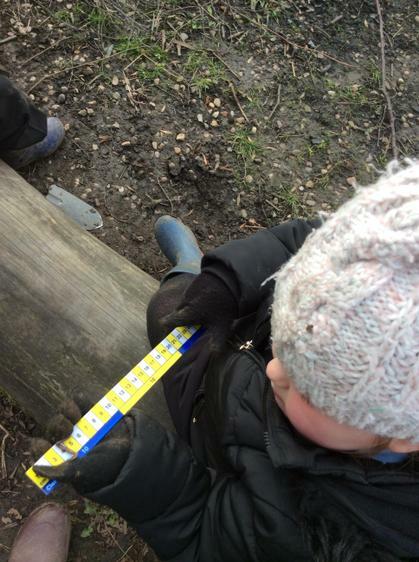 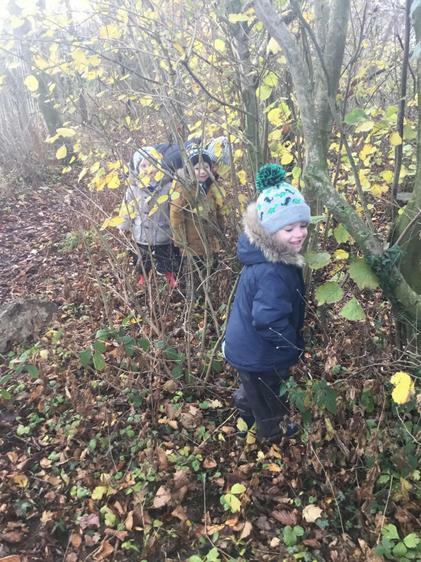 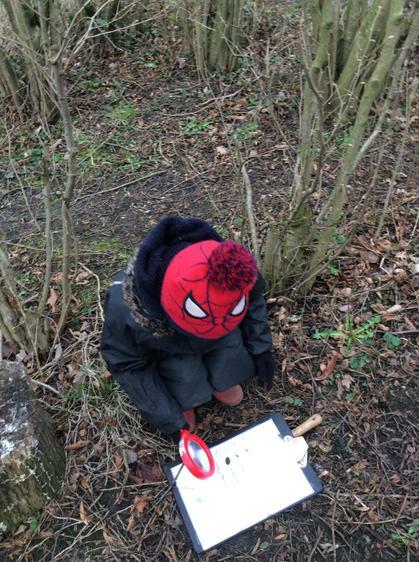 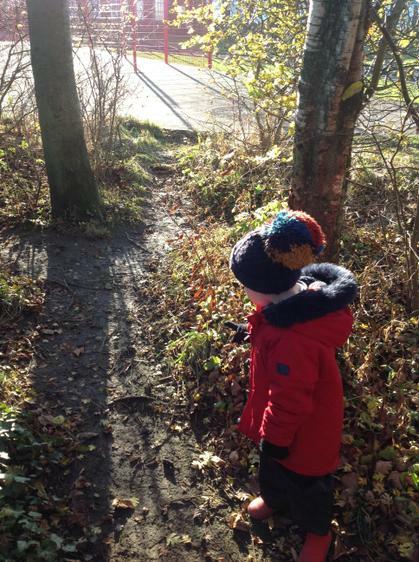 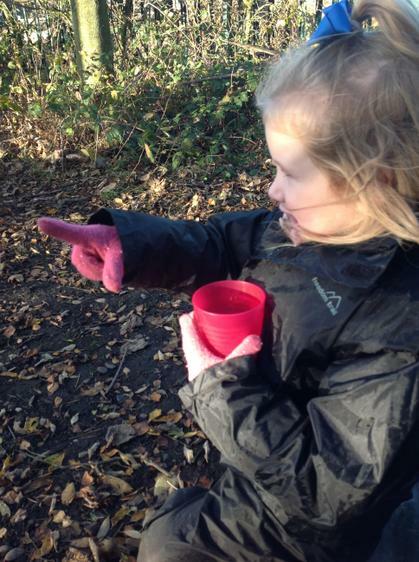 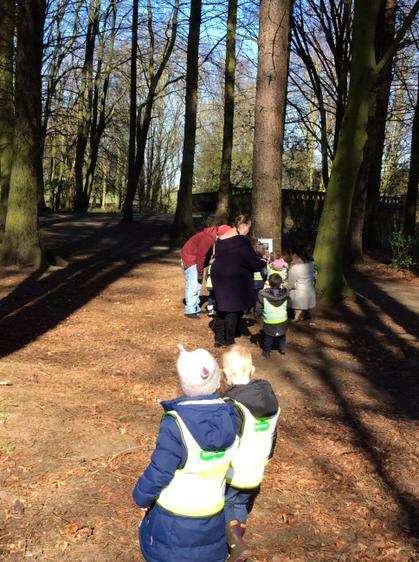 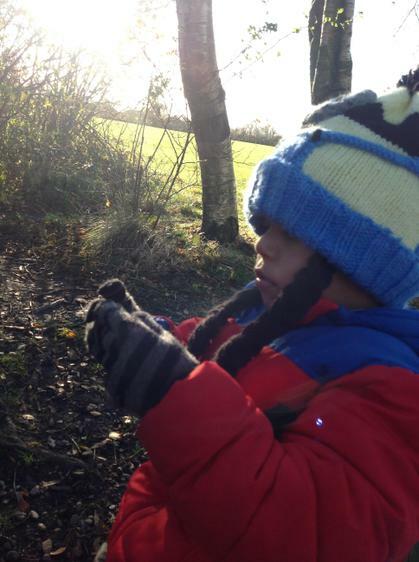 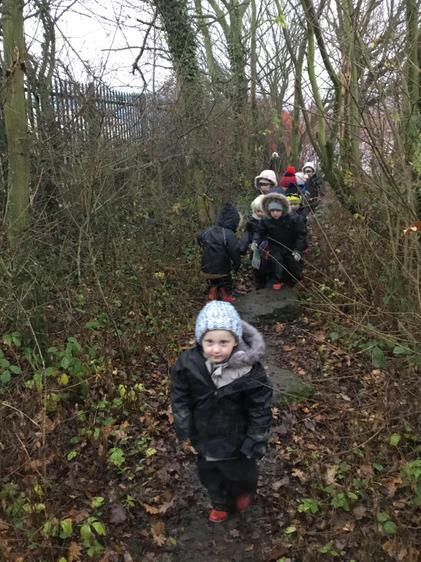 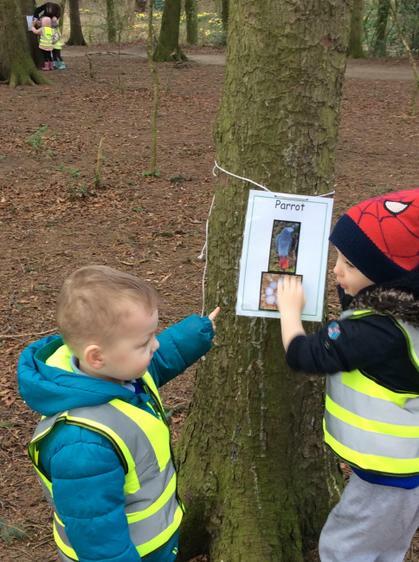 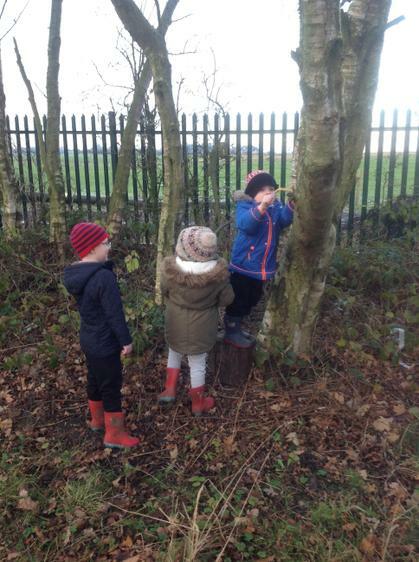 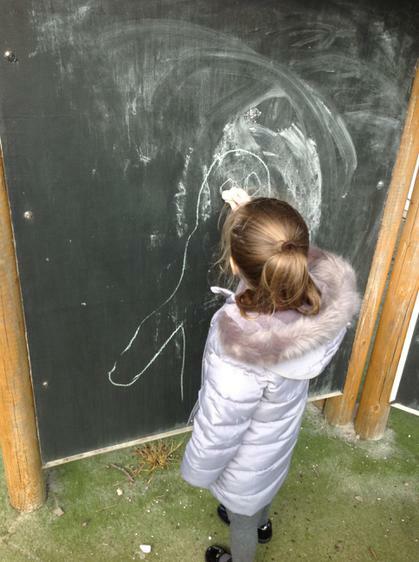 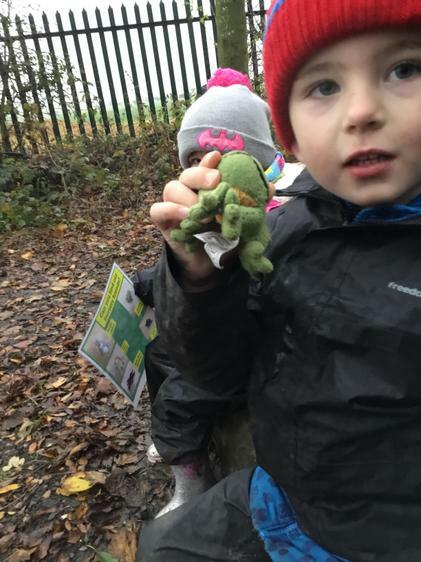 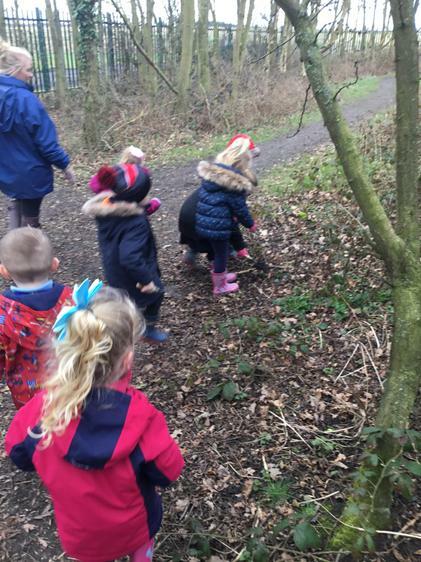 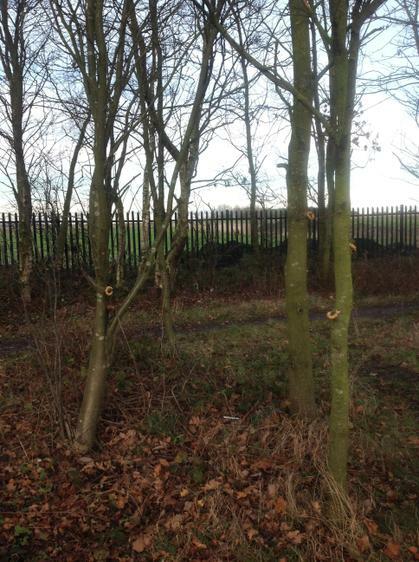 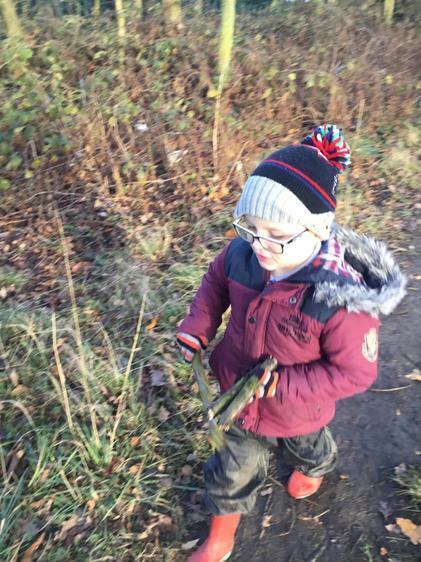 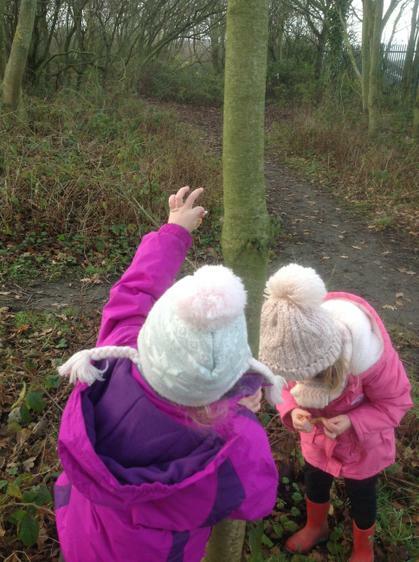 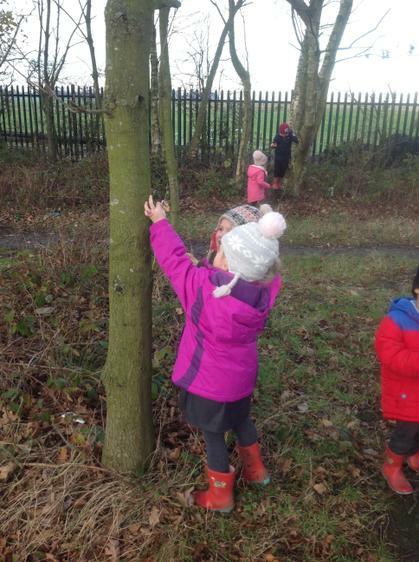 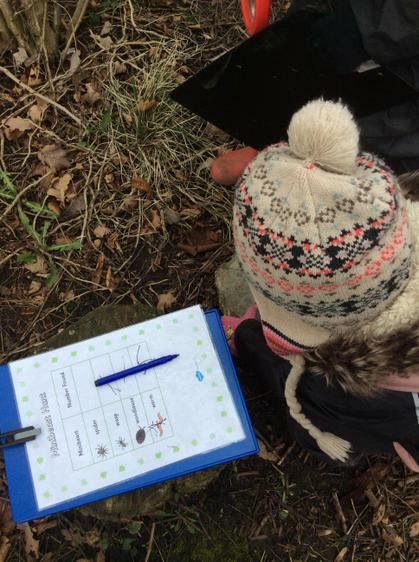 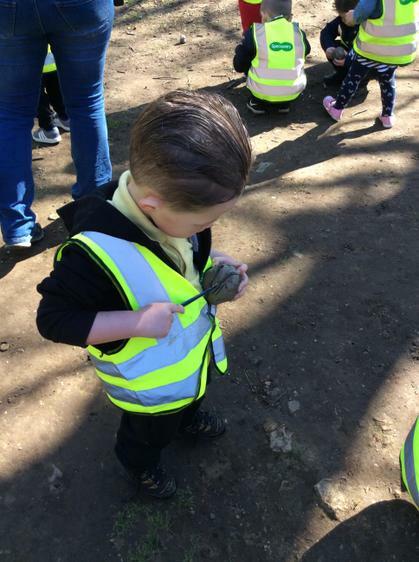 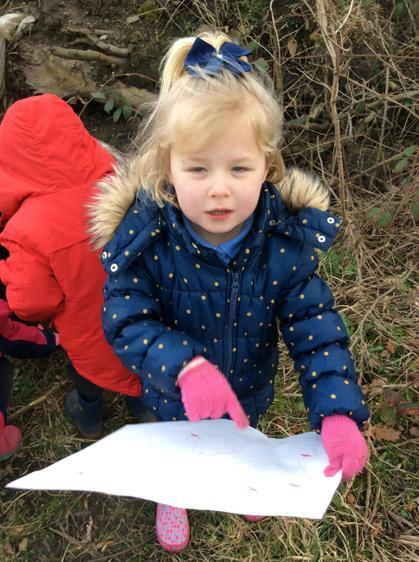 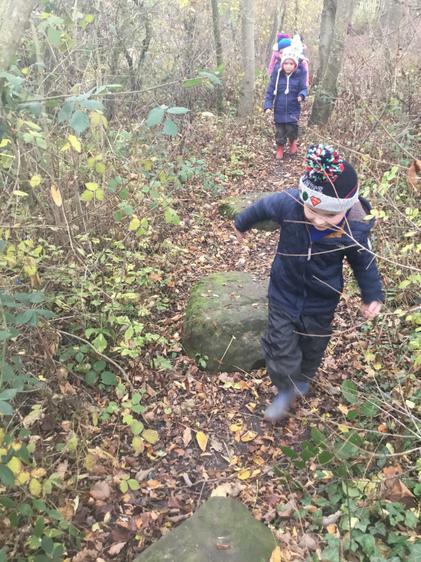 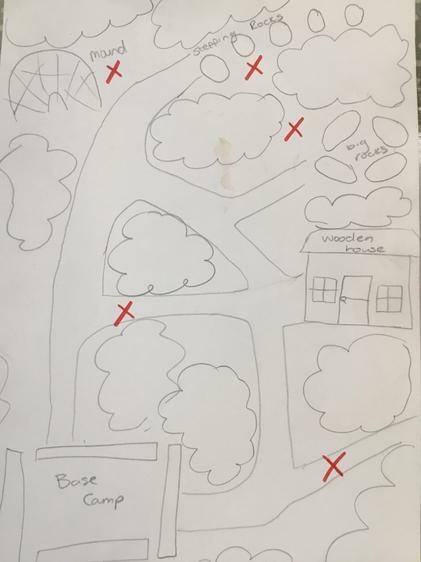 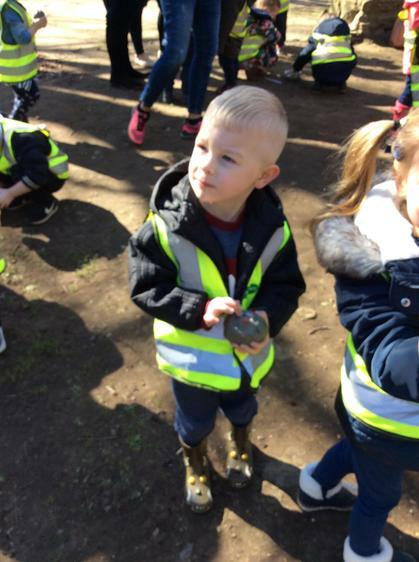 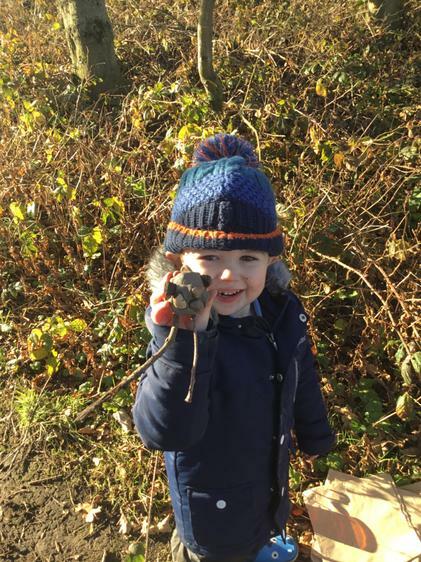 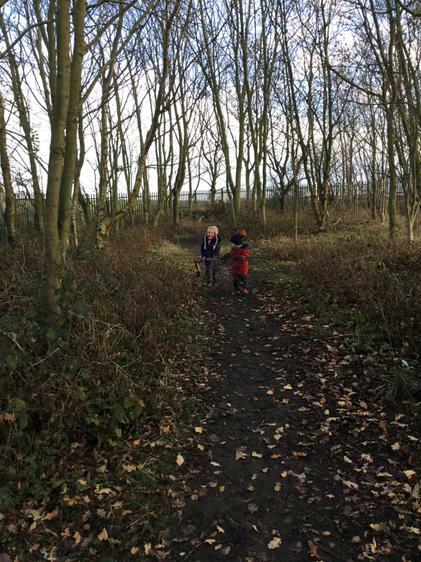 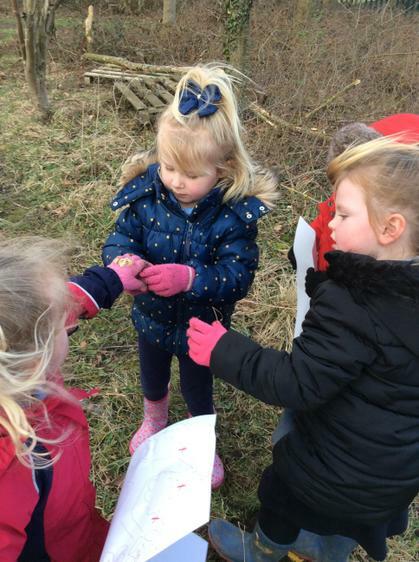 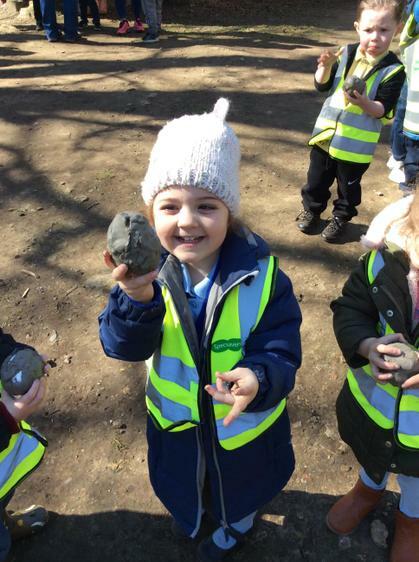 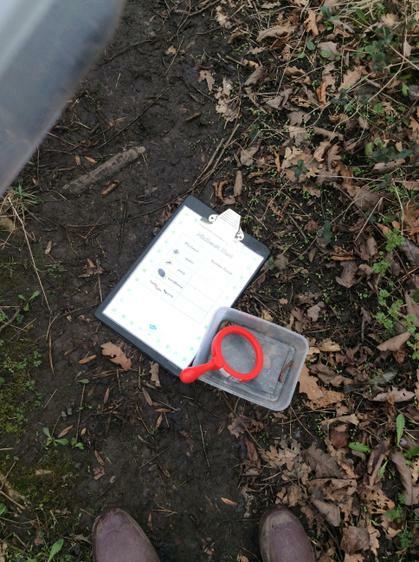 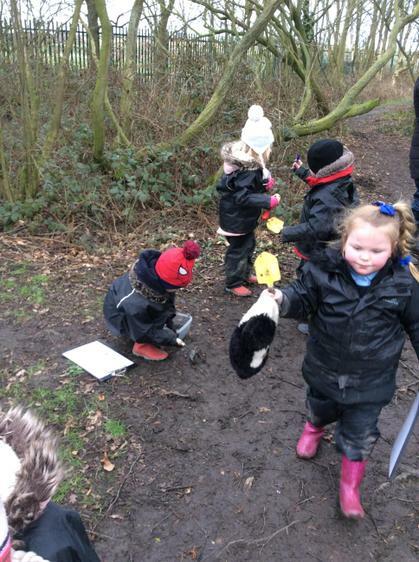 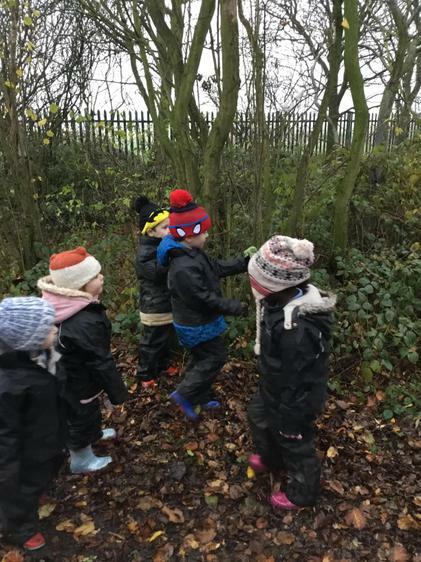 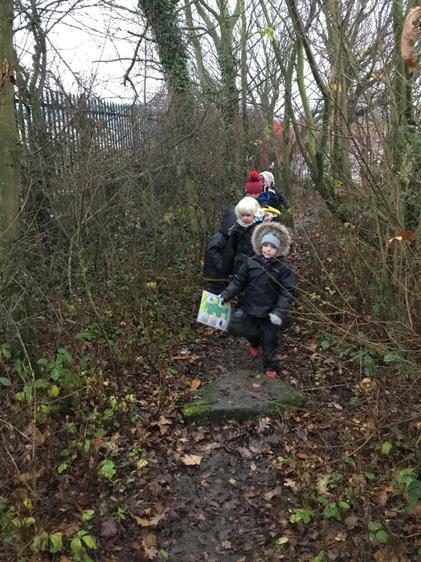 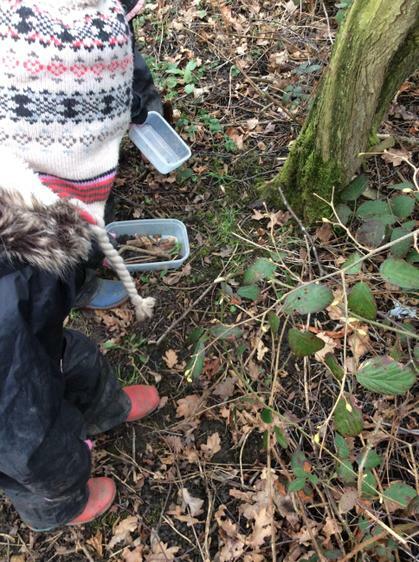 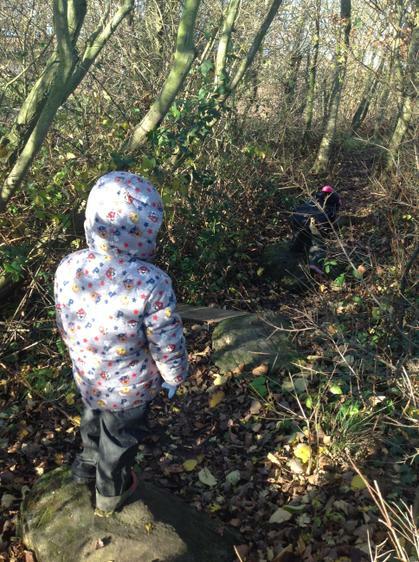 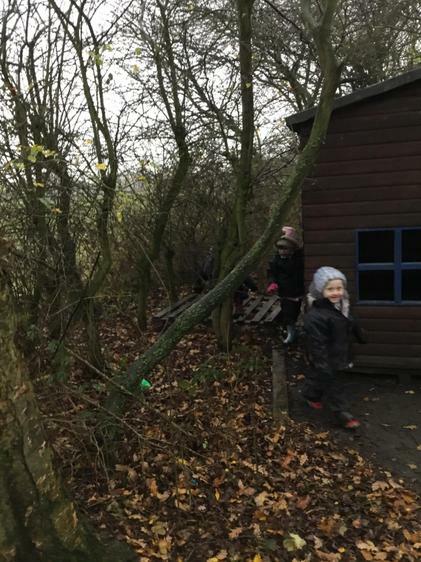 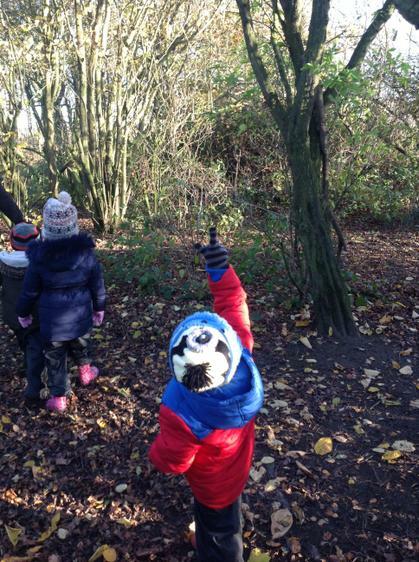 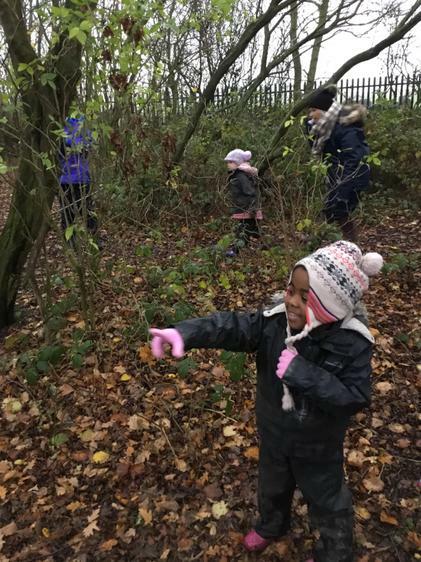 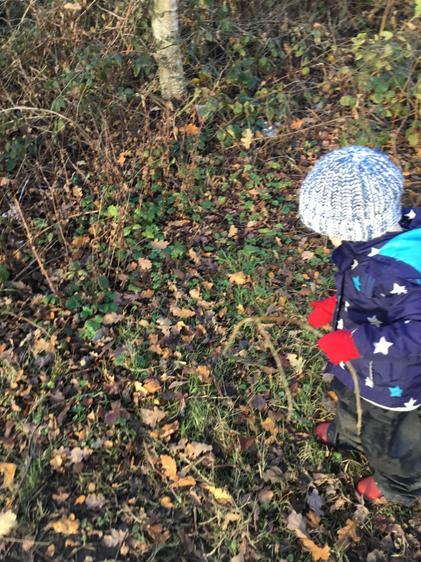 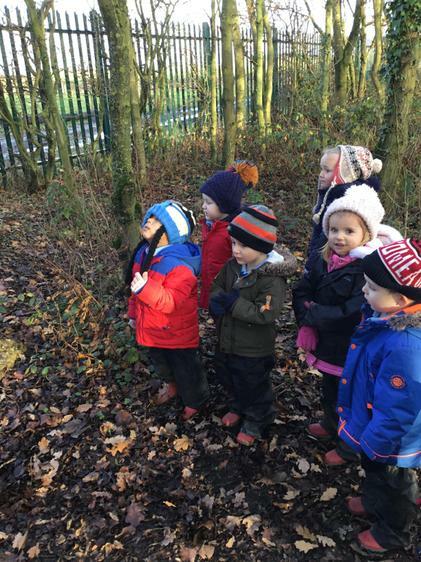 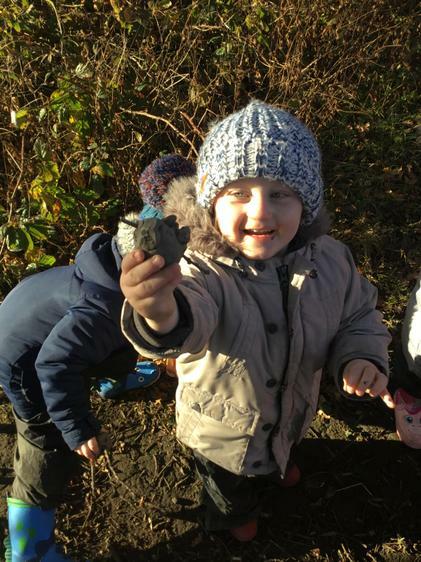 Last week we reviewed our woodland session and the children wanted to search for animals. 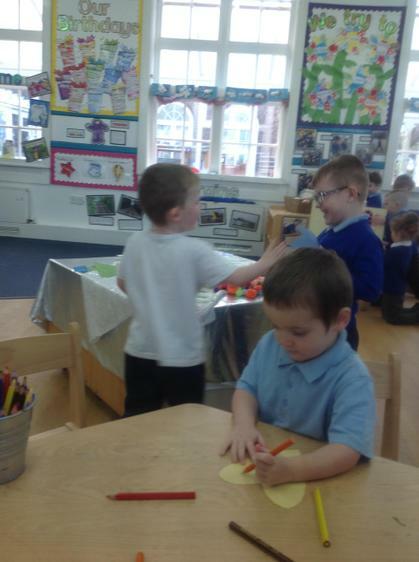 They helped Mrs Venner and Mrs Ward write a list of things we would need next week. 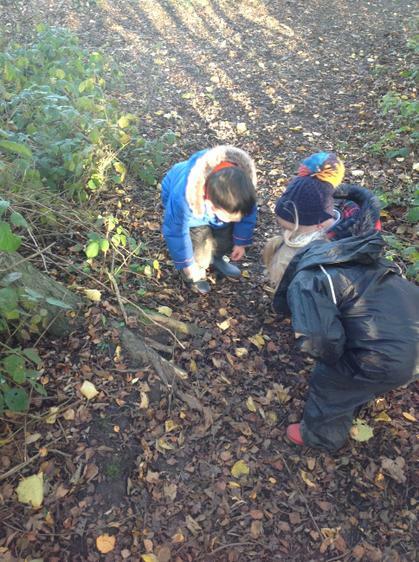 The children went on then search for minibeast. 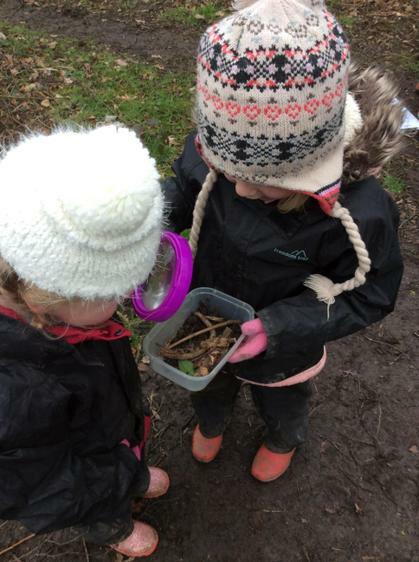 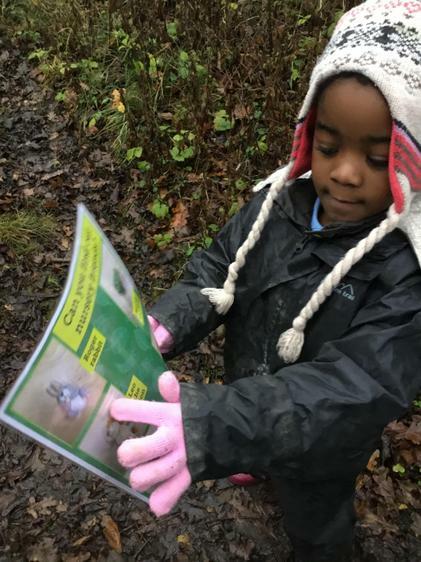 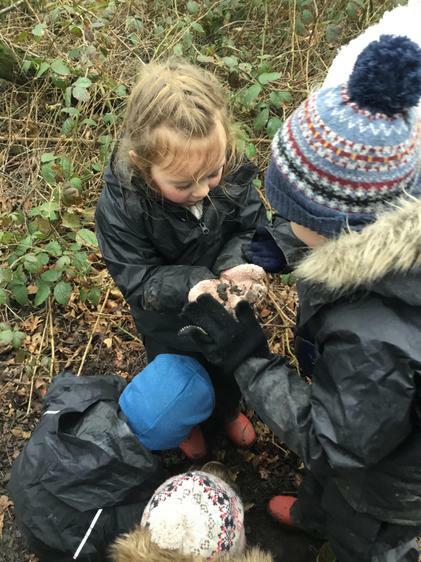 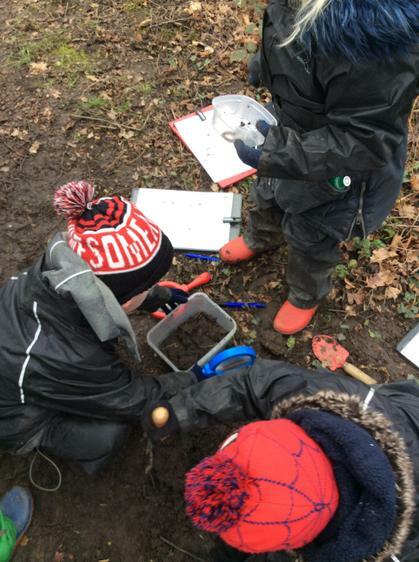 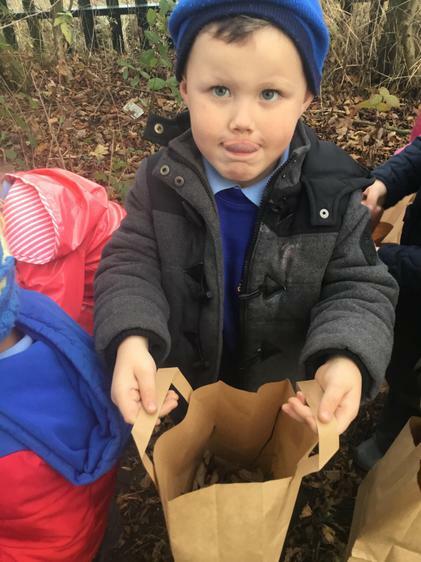 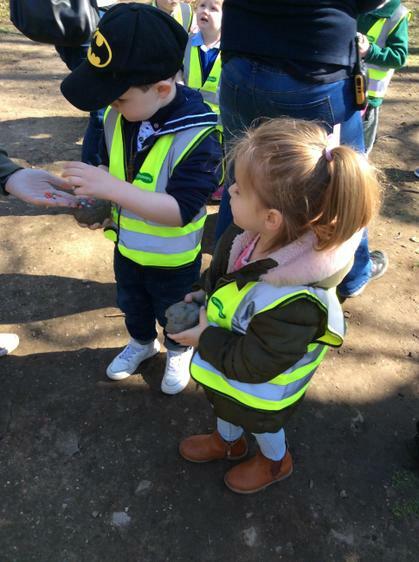 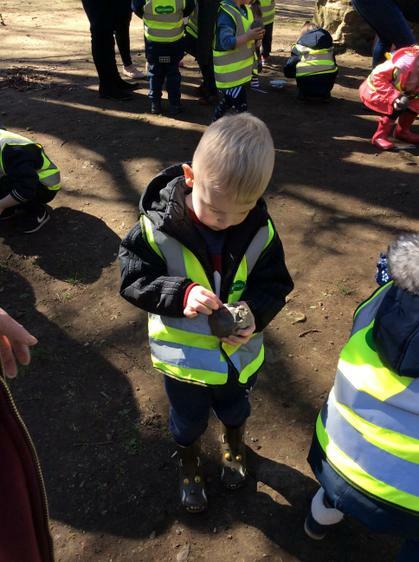 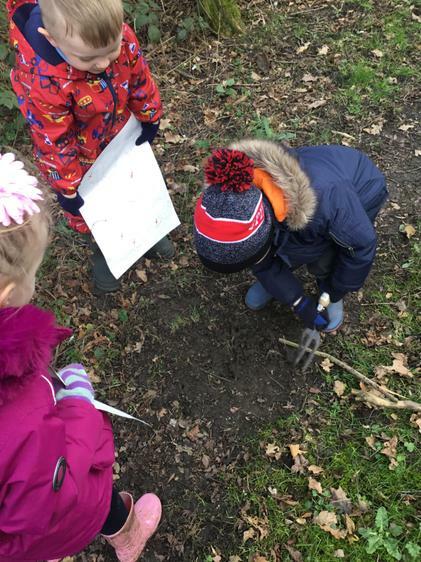 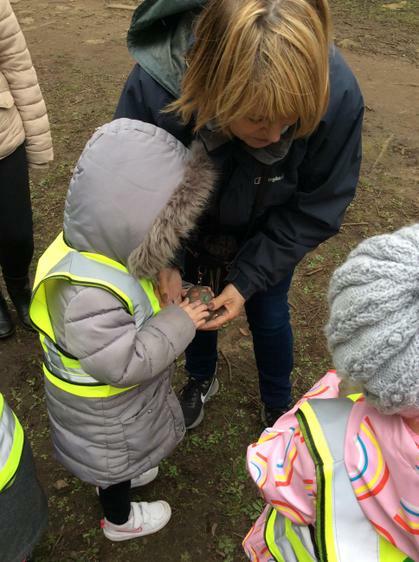 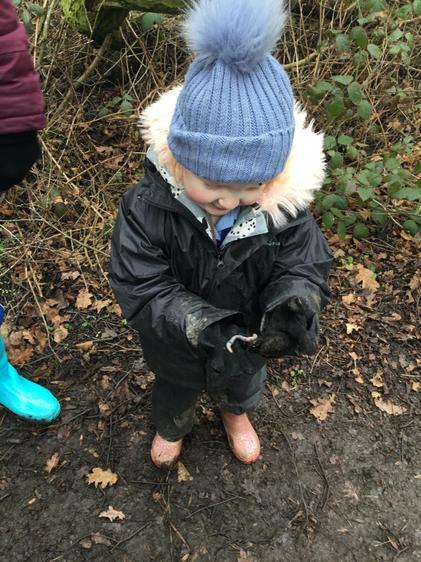 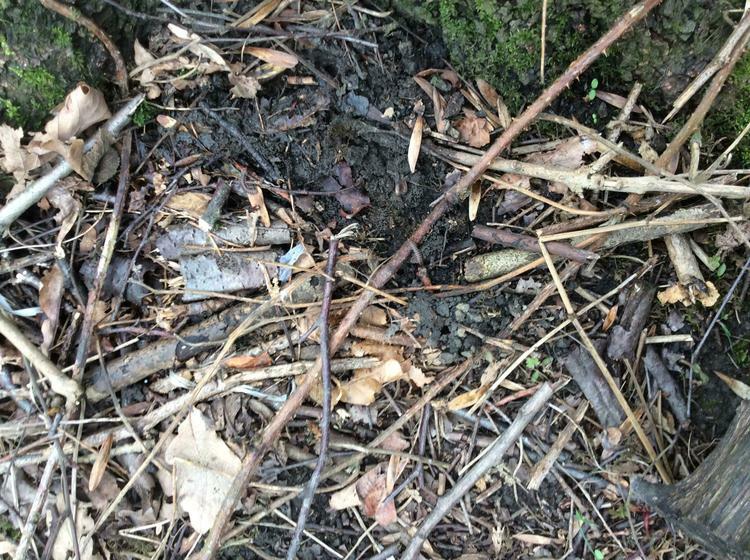 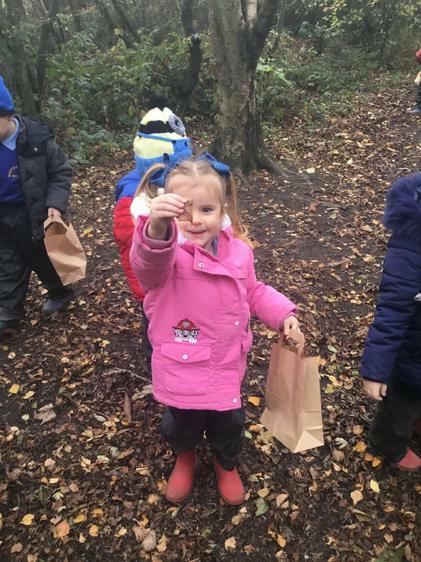 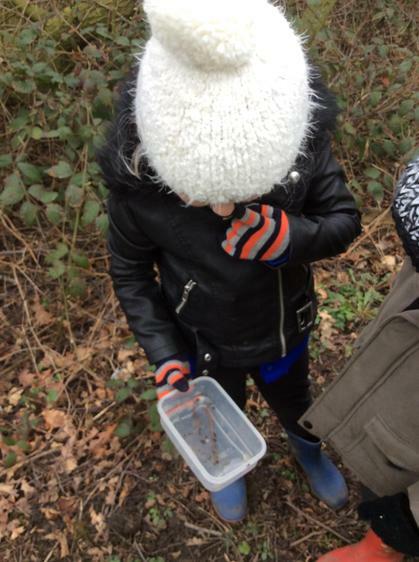 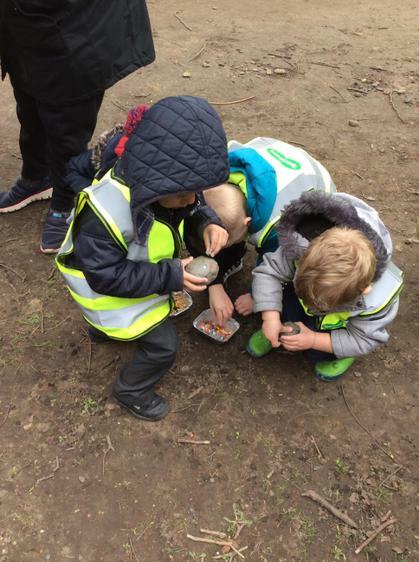 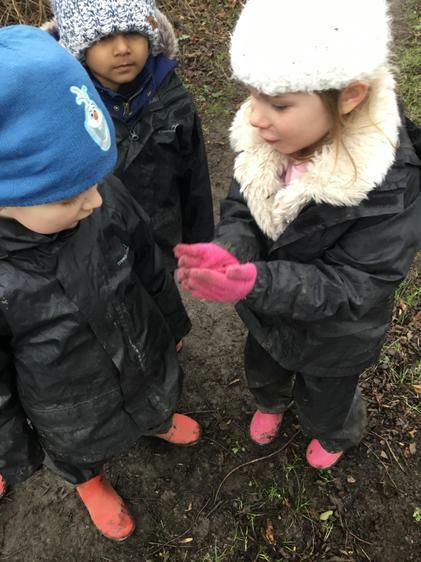 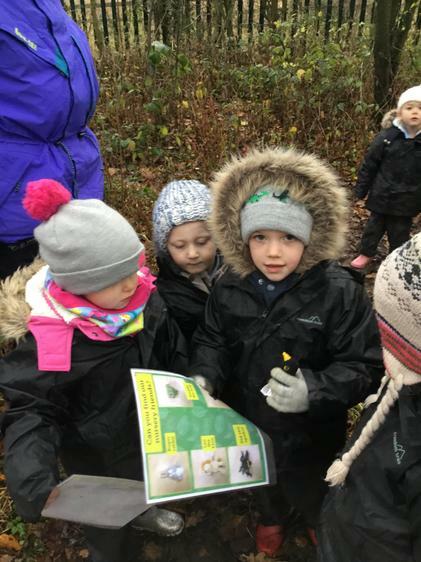 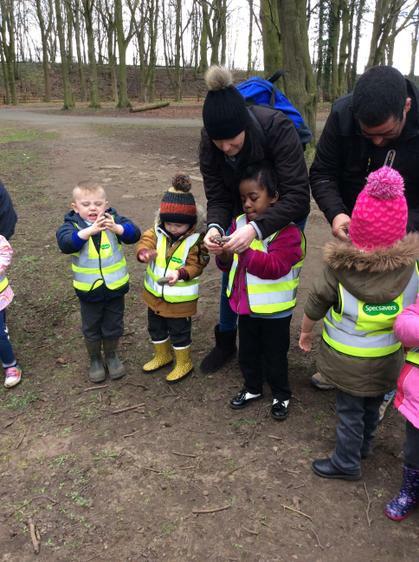 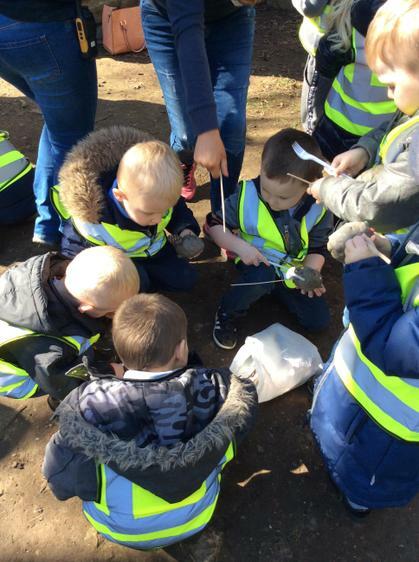 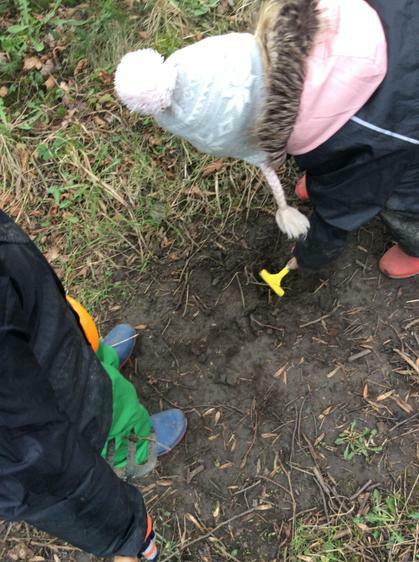 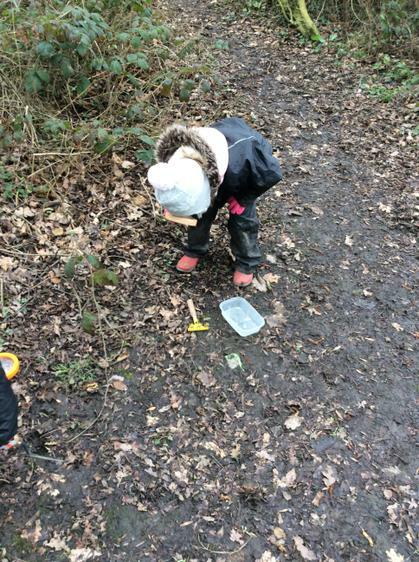 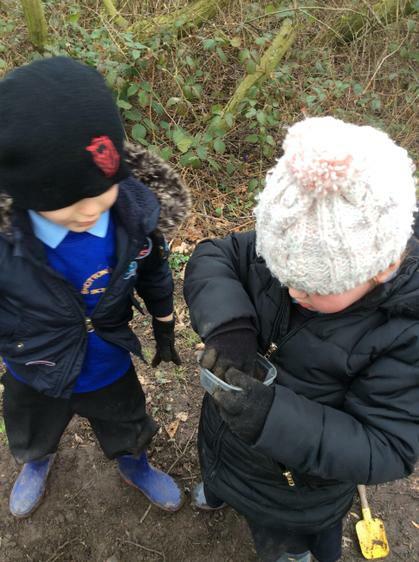 We found slugs, snails, centrepedes, earwigs and worms! 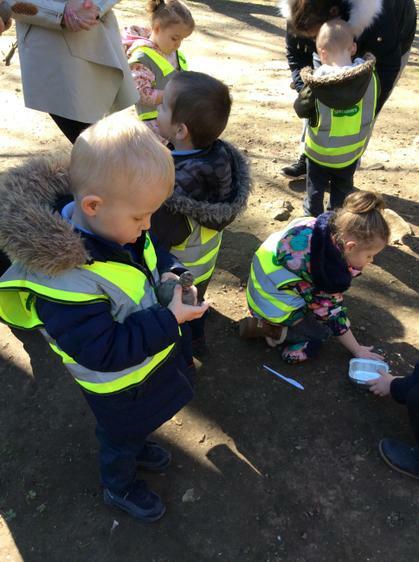 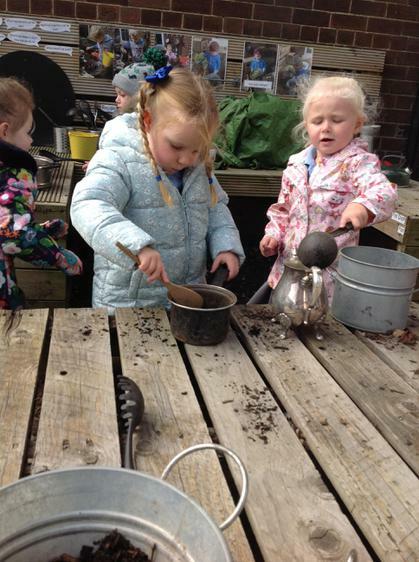 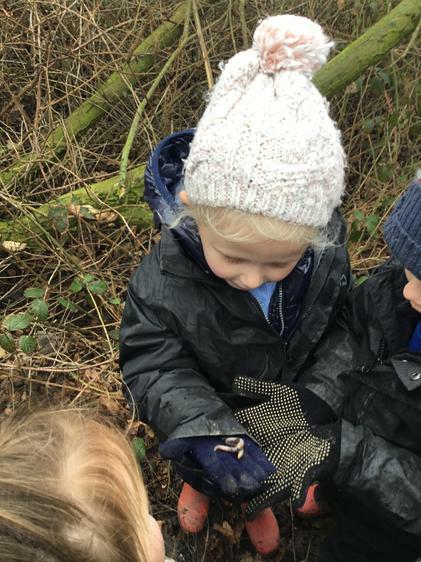 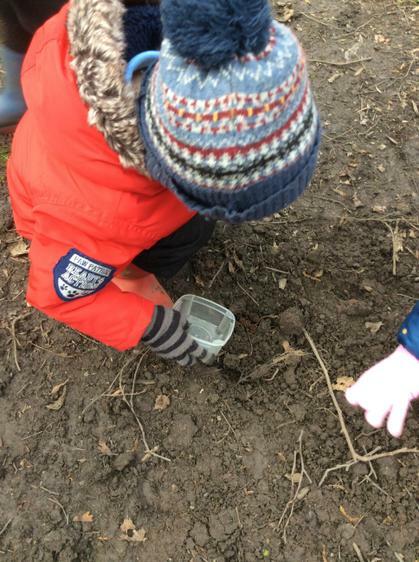 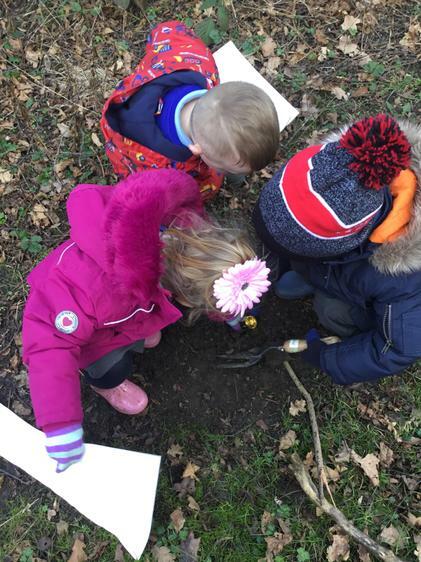 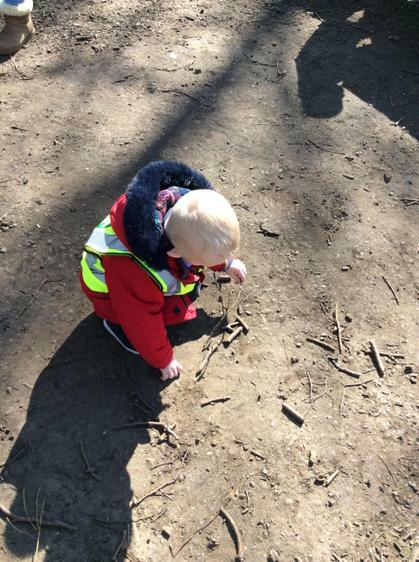 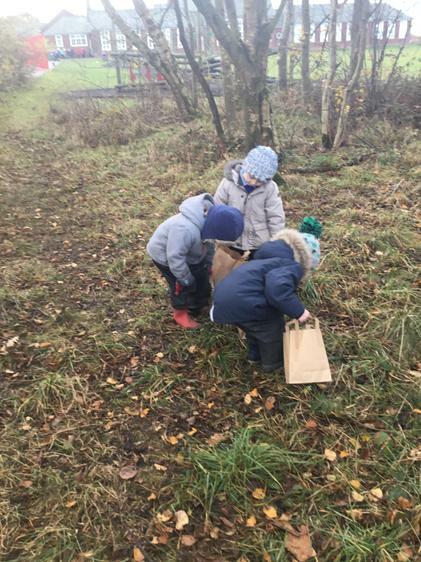 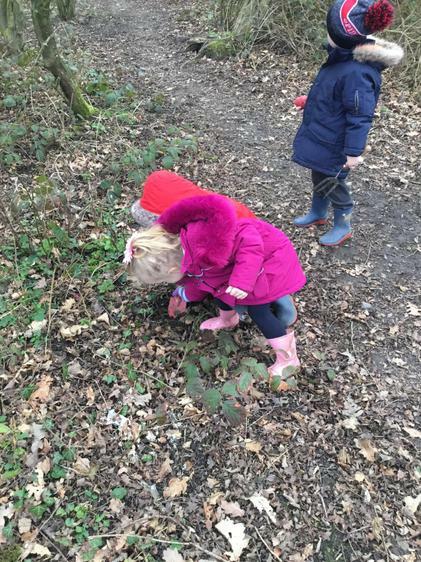 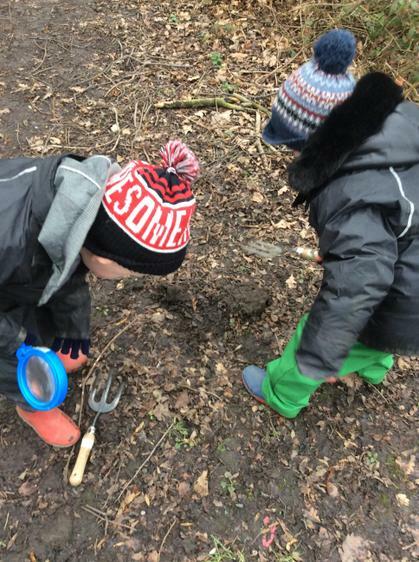 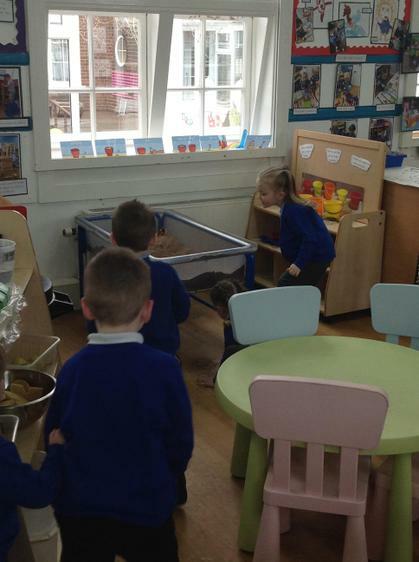 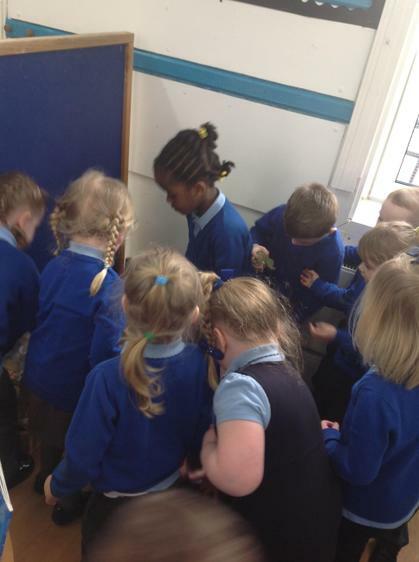 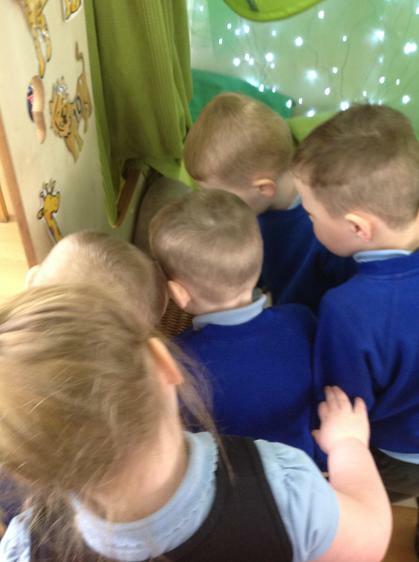 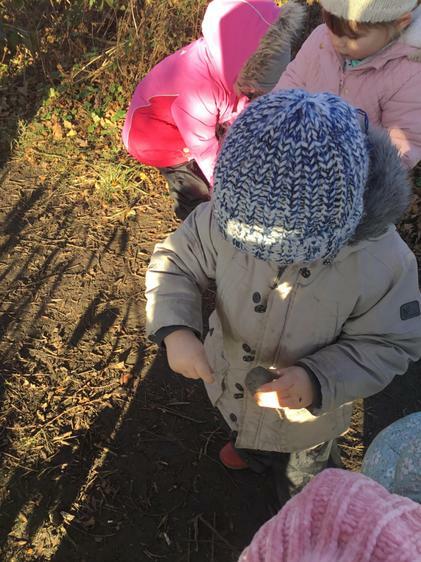 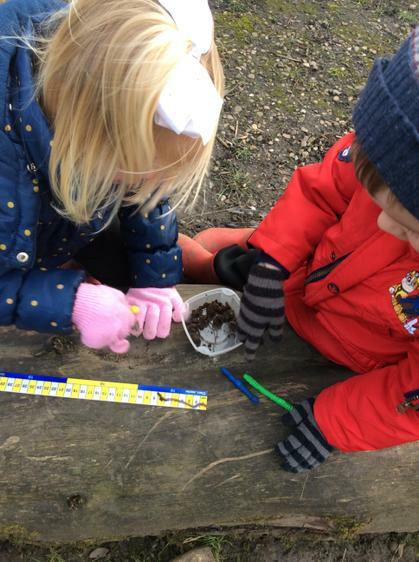 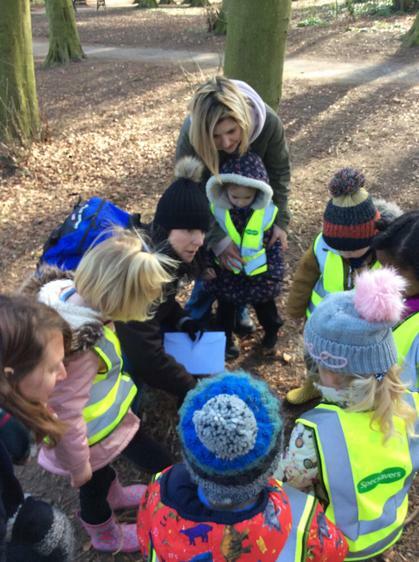 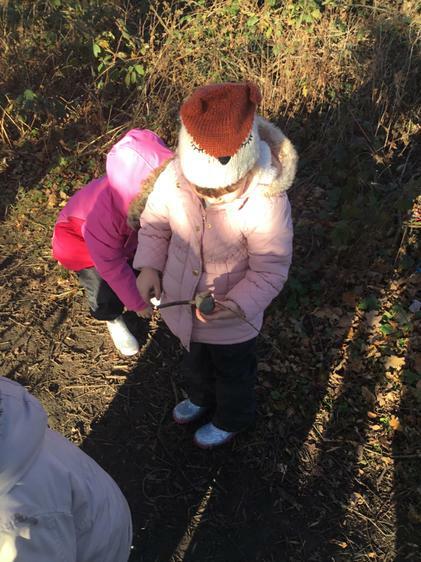 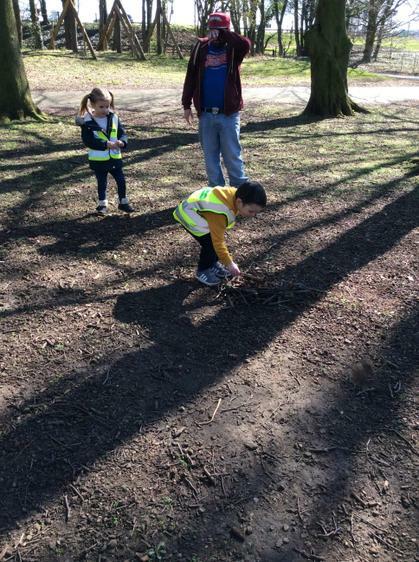 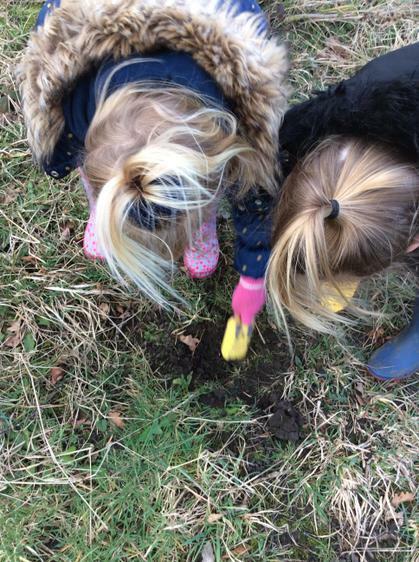 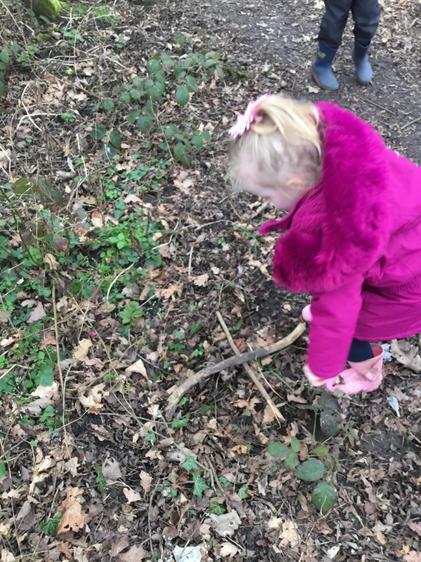 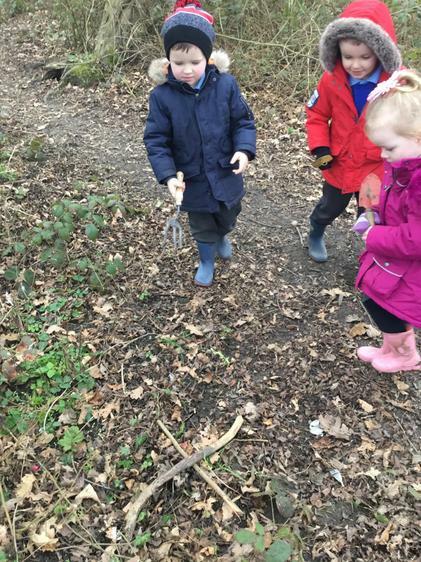 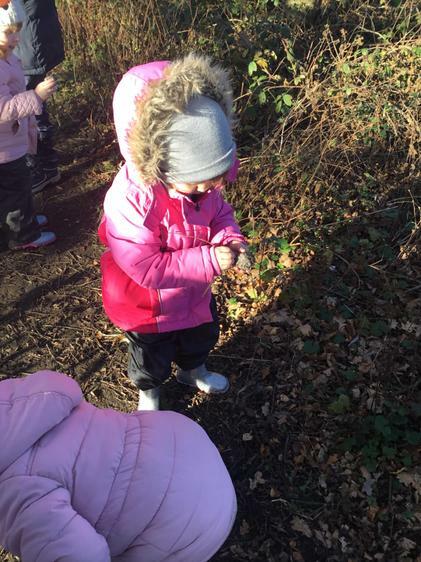 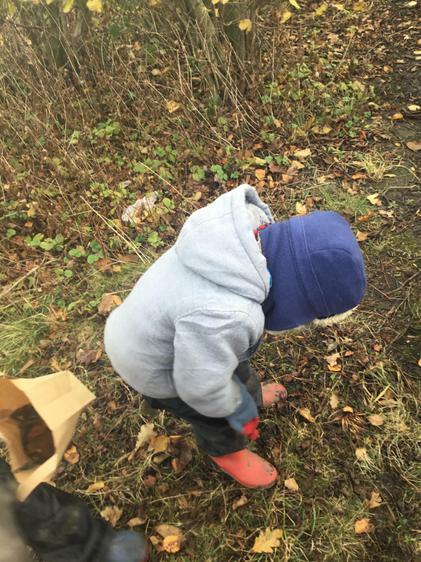 The children took a keen interest in looking for the best places to find worms. 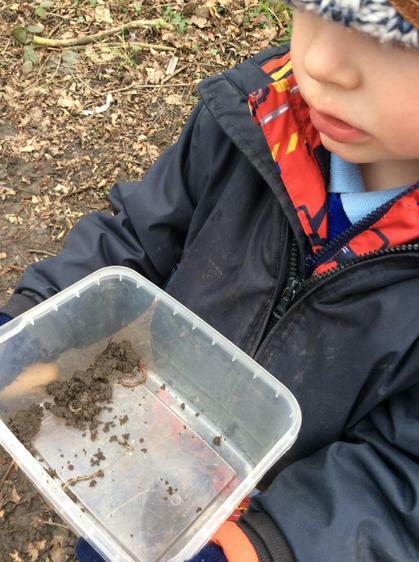 Flynn was a super worm hunter and ended up with 10 worms in his container! 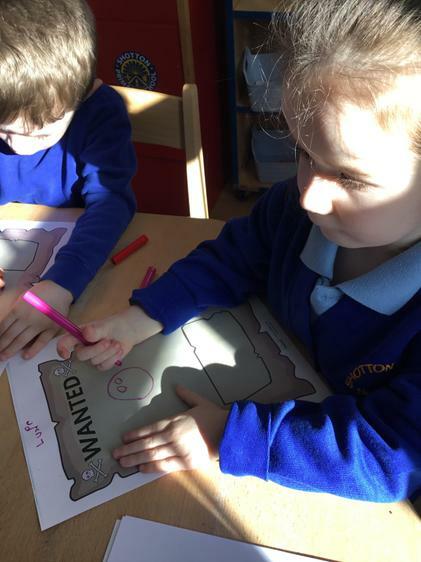 The children have been talking about the pirate non stop and really want to try and catch him! 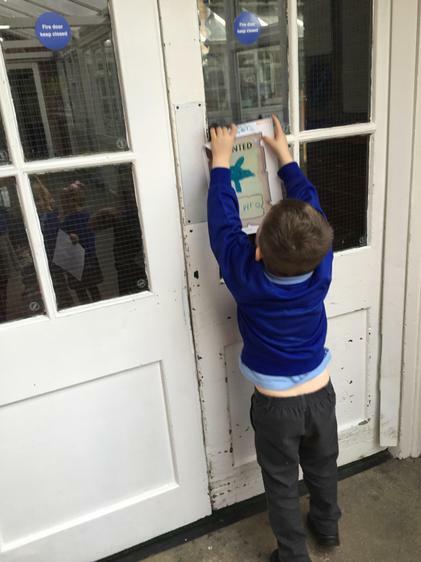 So Frankie came up with the idea of making posters and sticking them around the school so everyone would know what he looks like! 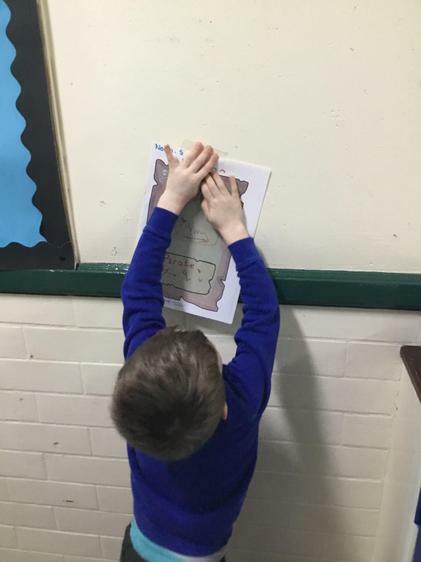 The posters were AMAZING!! 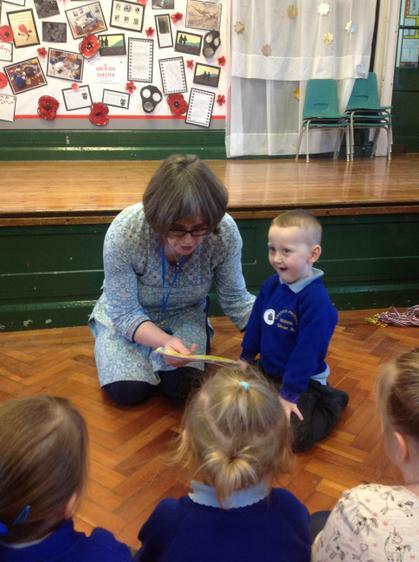 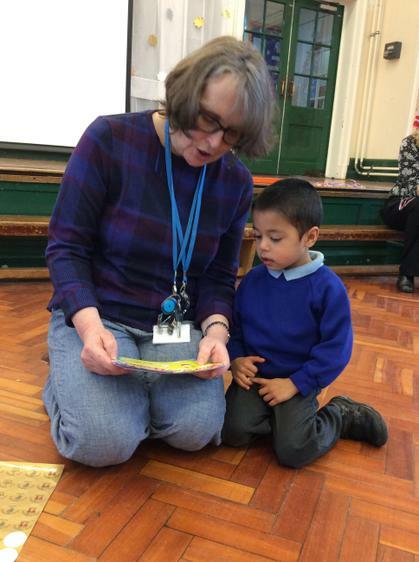 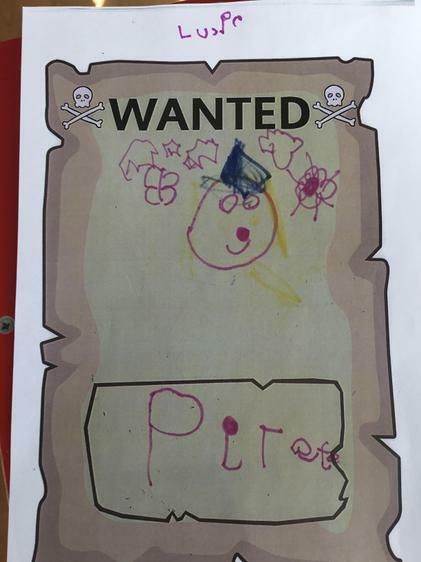 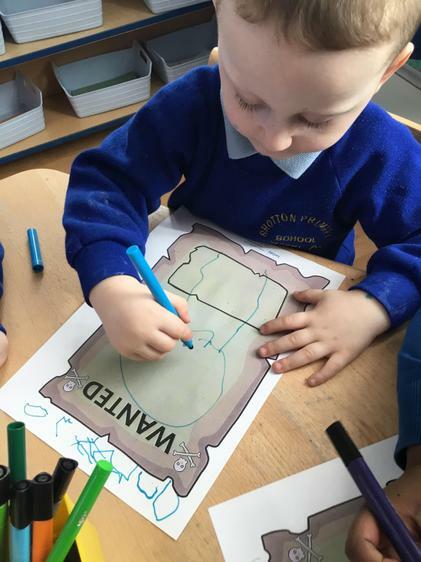 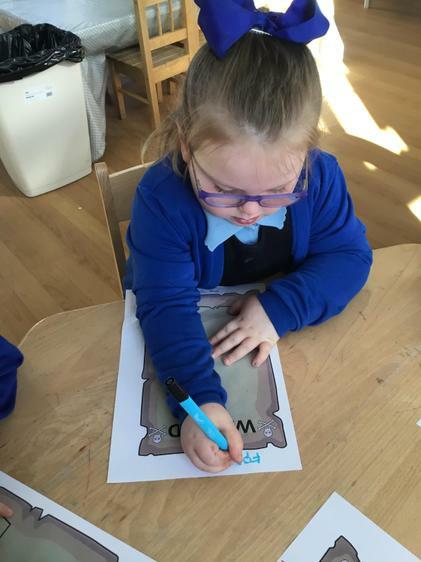 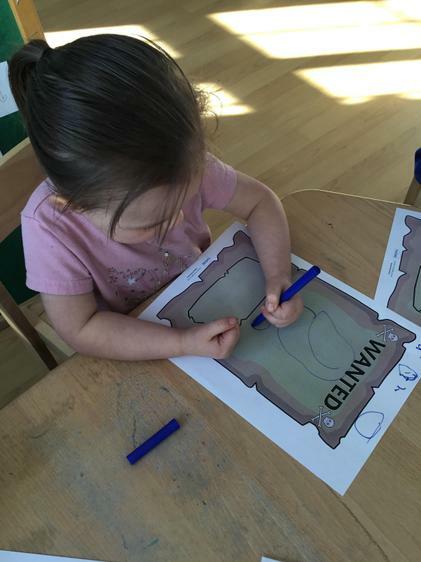 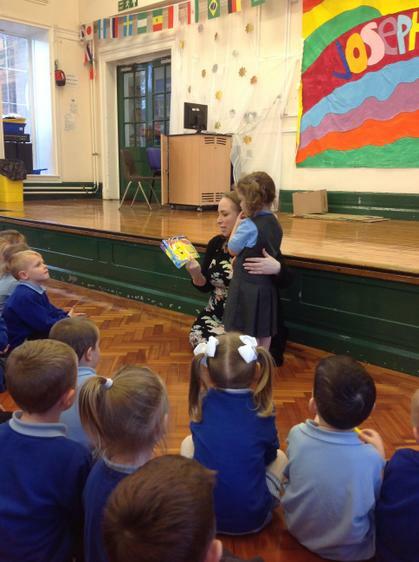 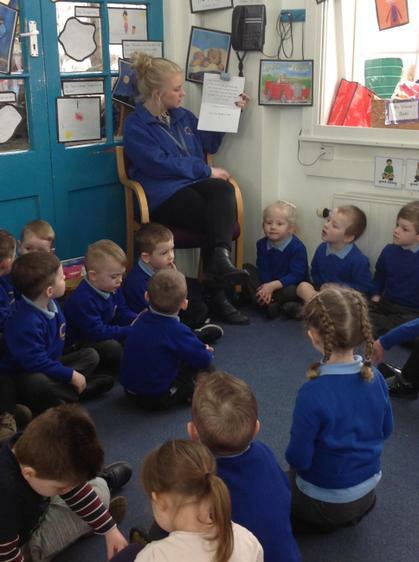 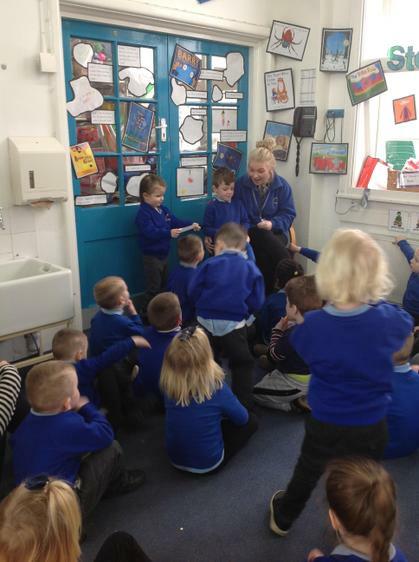 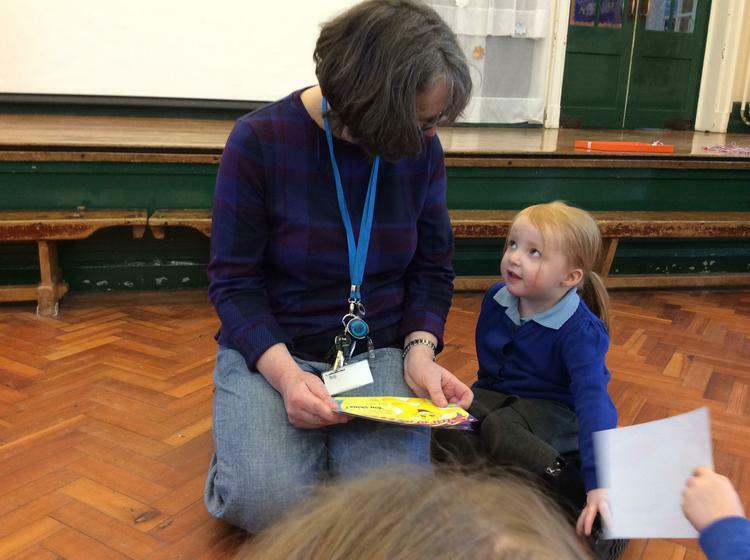 Some children even tried copying the word pirate for the older children to read! 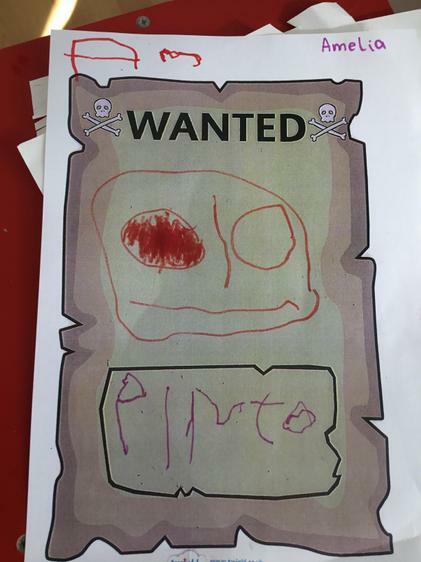 Surely this will help us catch the pirate? 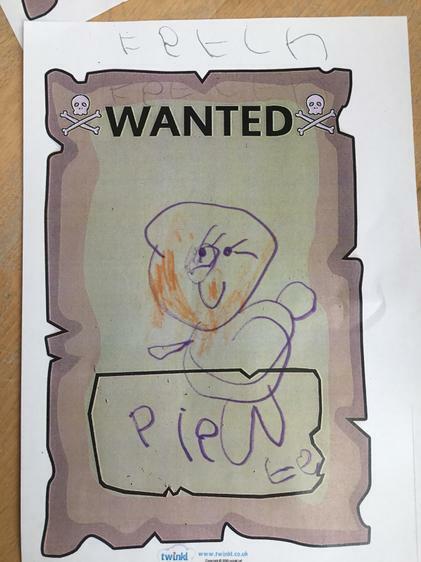 The pirate came back!!!! 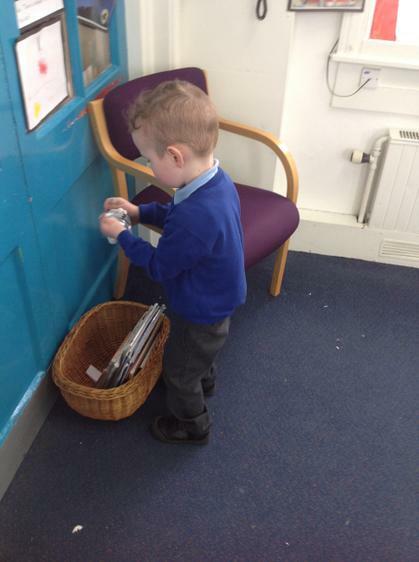 He has stolen our music friends and taped them around the classroom! 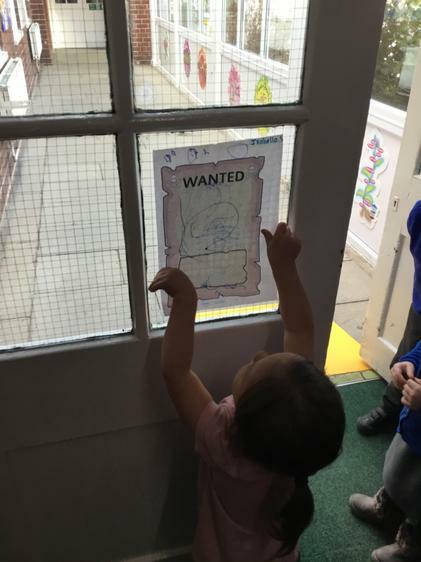 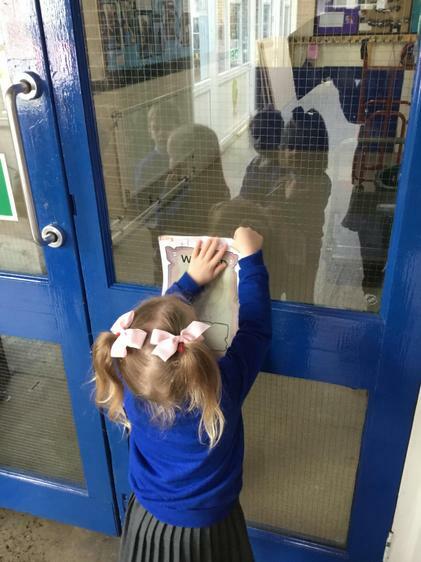 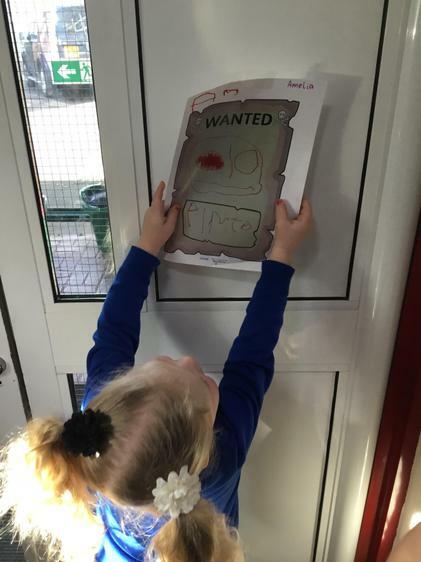 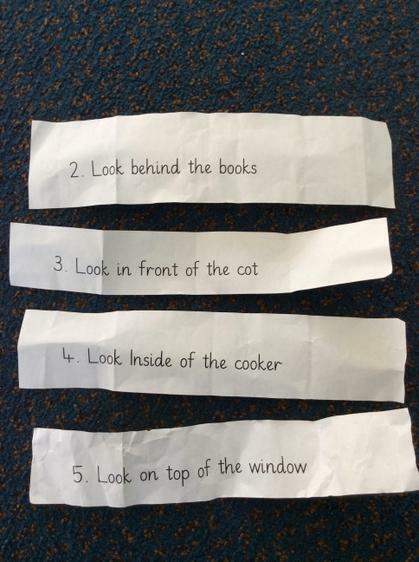 We had to follow the clues that used lots of positional language to try and rescue our little friends! 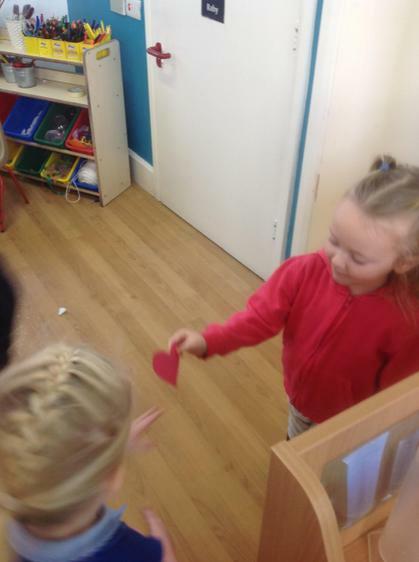 We had to work as a team to find the friends and bring the clue so back to the carpet to read out. 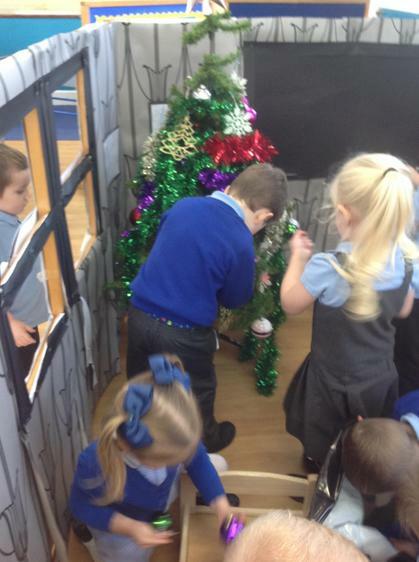 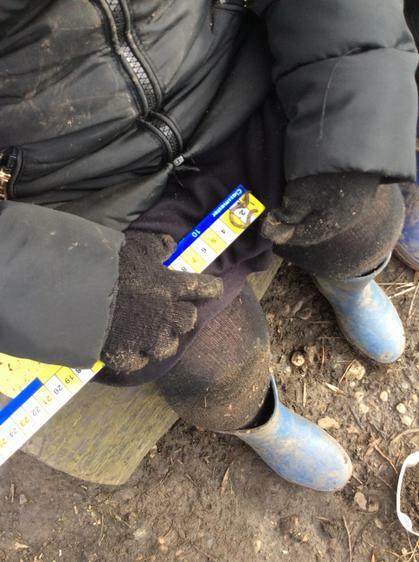 The children were little detectives and we managed to rescue them but then we hit a problem. 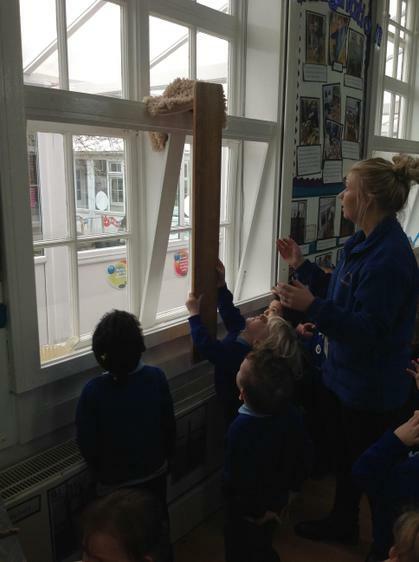 Leo the lion was far too high and we could not reach him! 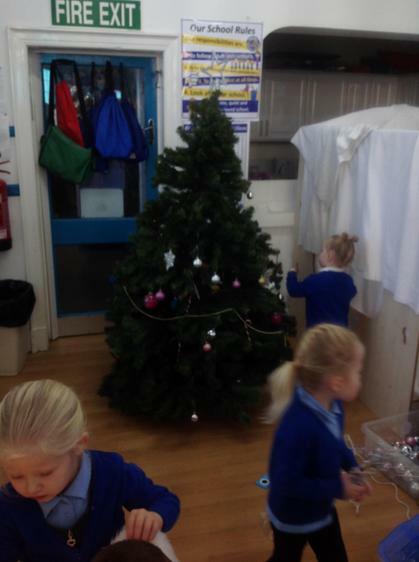 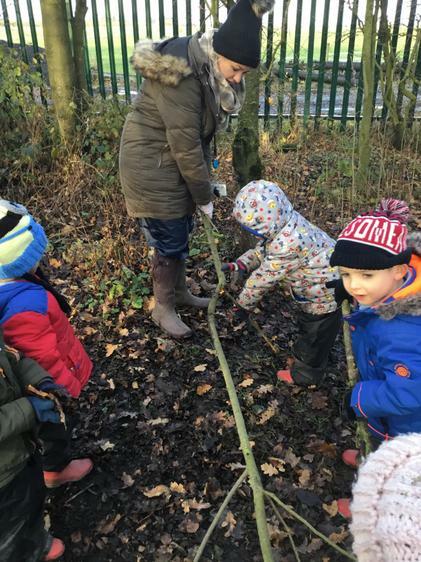 There was a rule in which teachers were not allowed to help too! 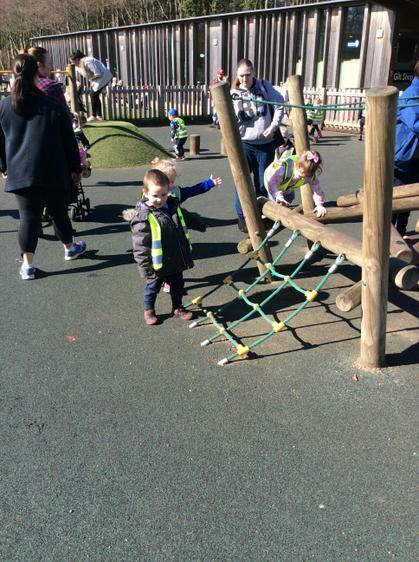 Timmy tried to use the longest construction block but it did not work. 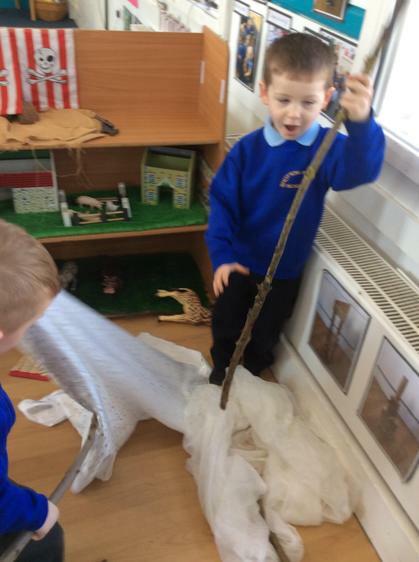 Noah decided to use the plank we used in music to try and reach it and we were able to get th blanket off but he was taped up there! 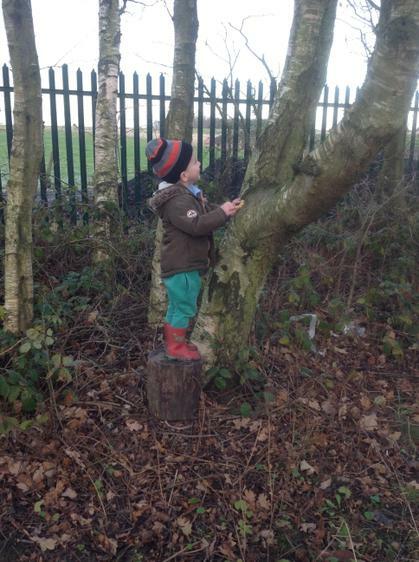 We had lots of decussions about how we could get him down! 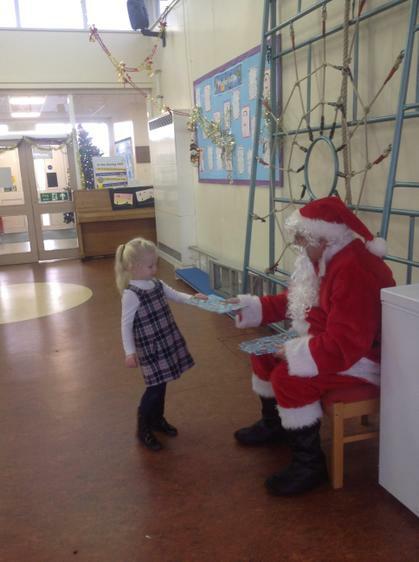 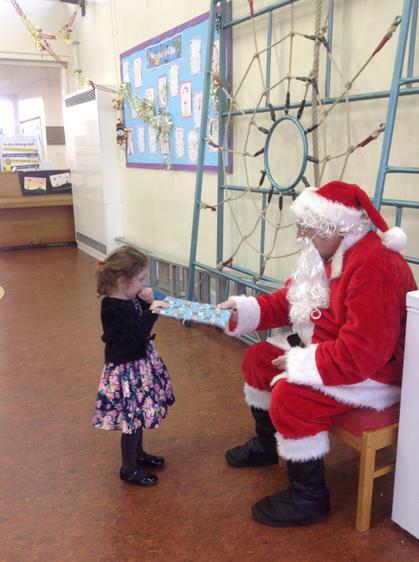 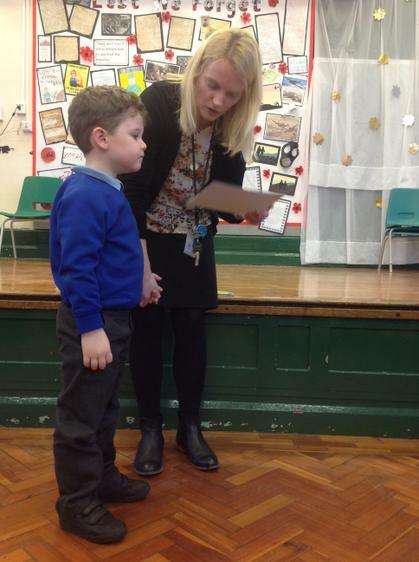 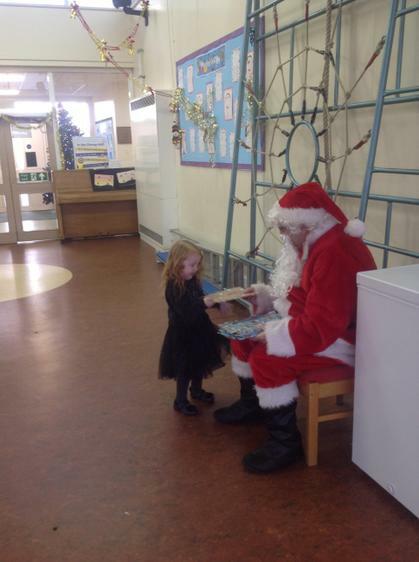 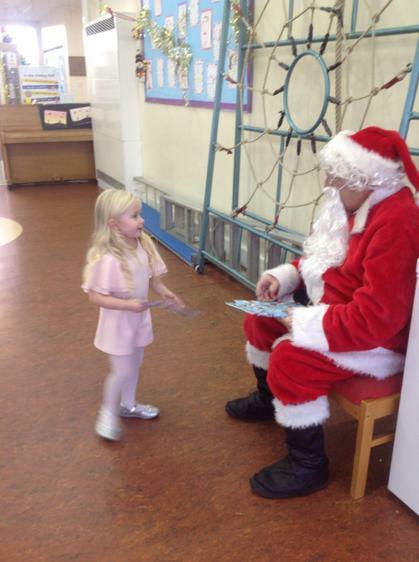 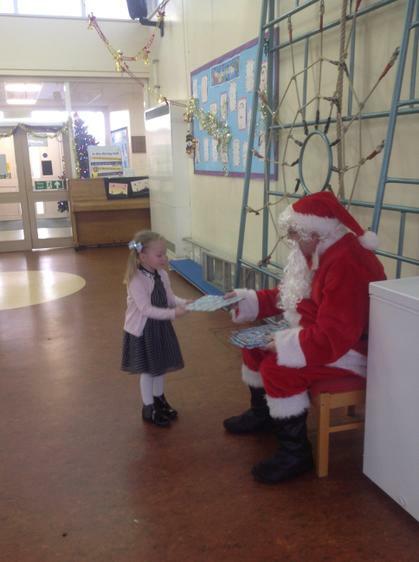 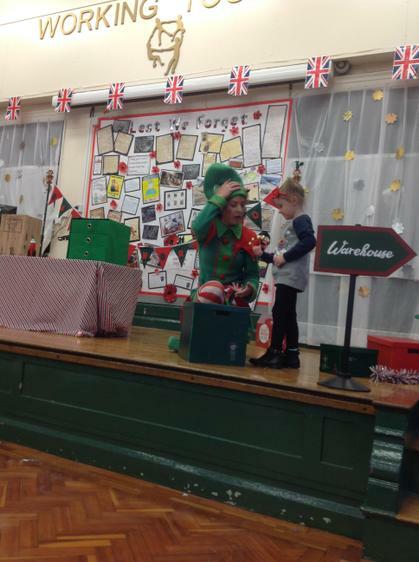 In the end Faith suggested asking Mr Linn the caretaker as he was tall and not a teacher! 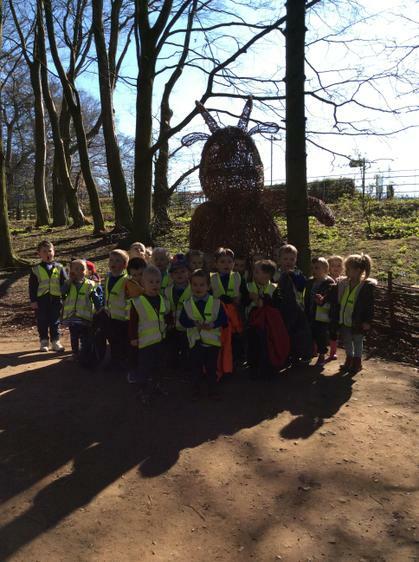 We rescued all our friends amazing job Nursery! 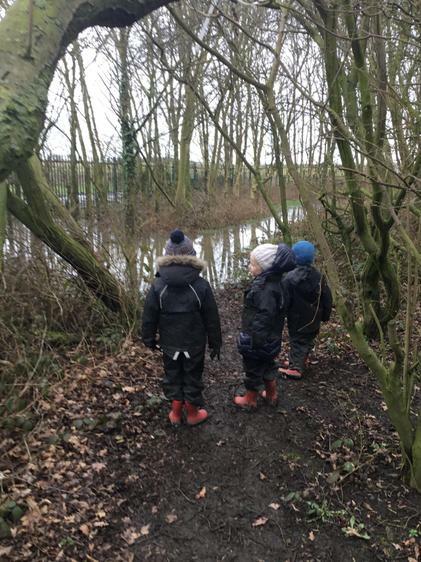 After so much rainfall we had huge puddles in the woods. 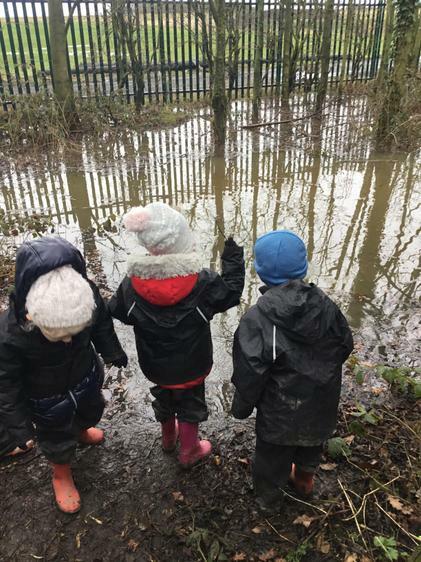 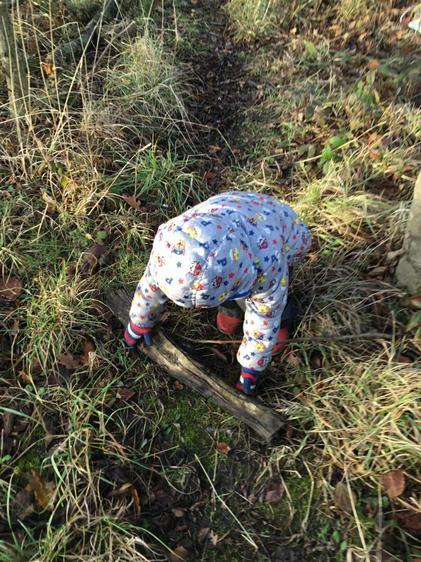 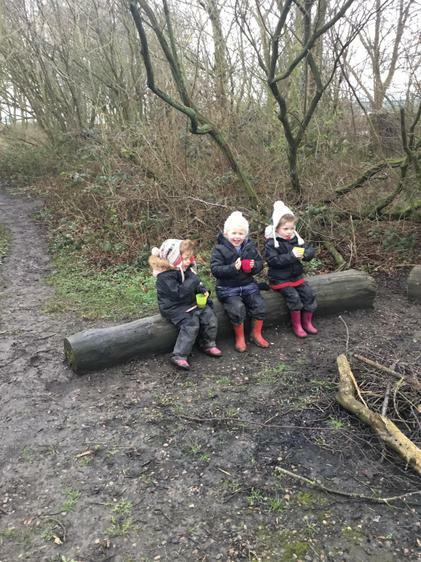 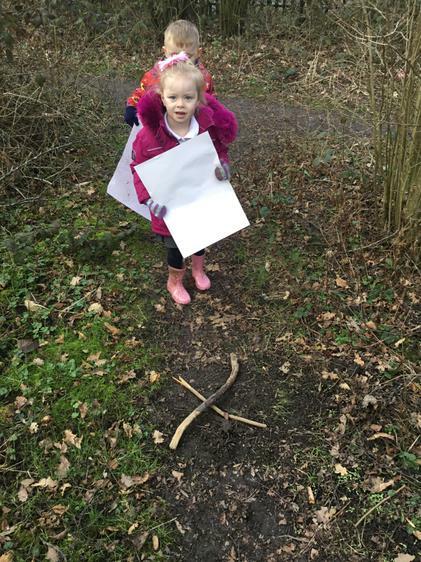 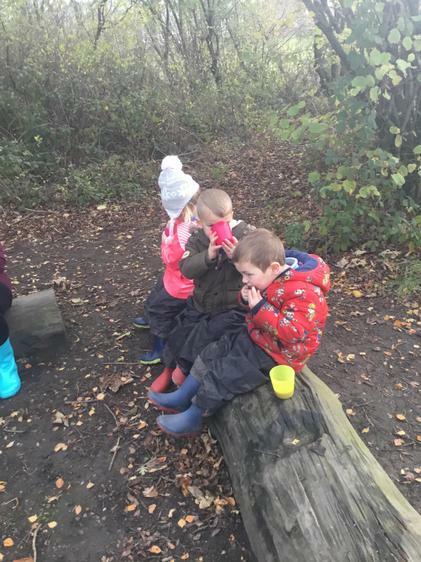 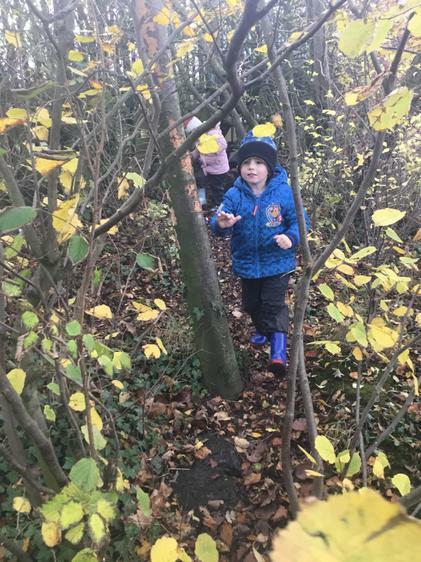 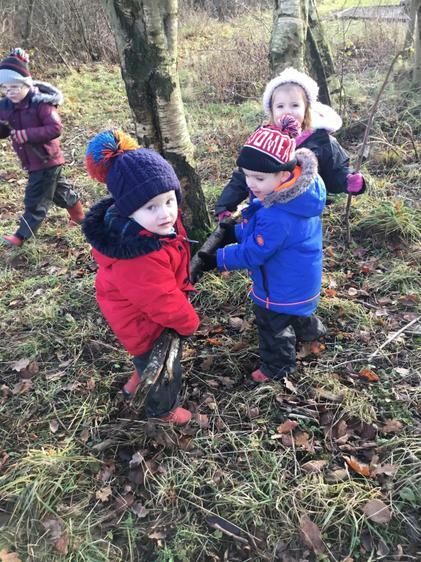 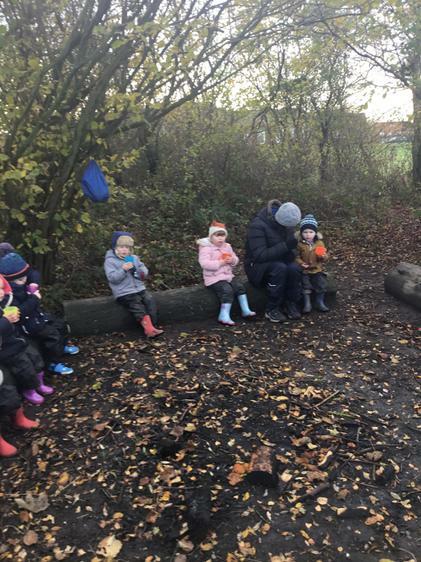 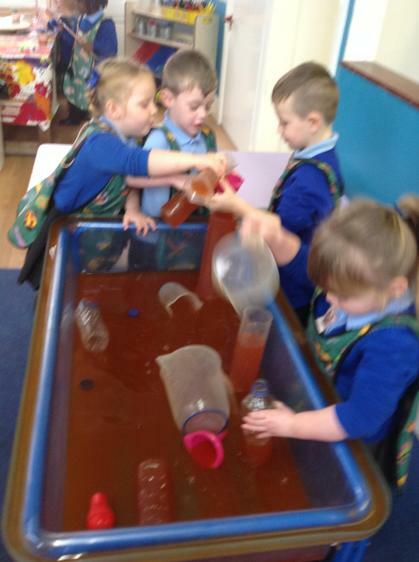 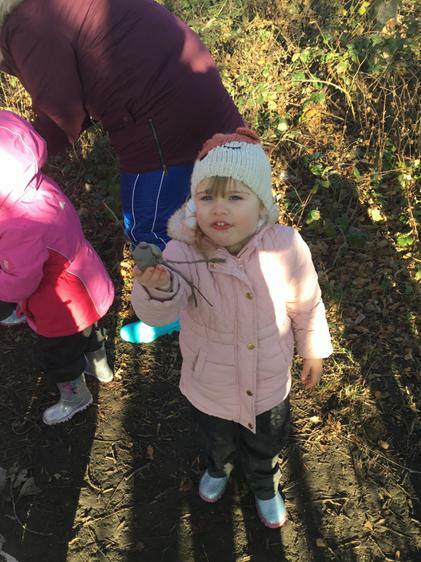 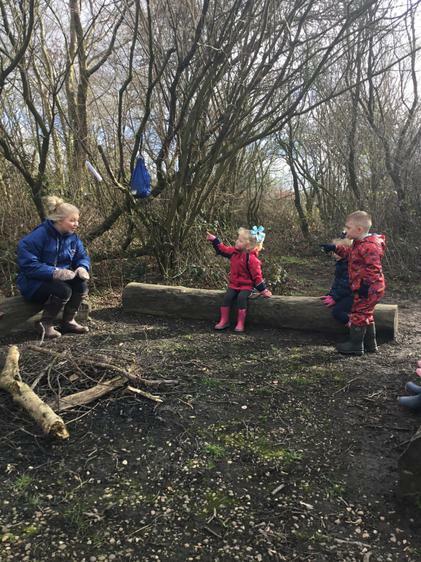 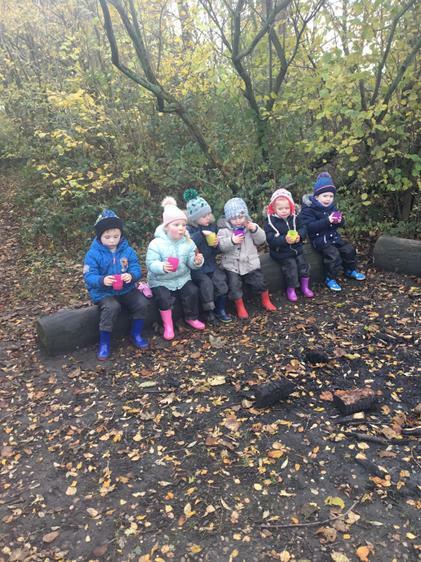 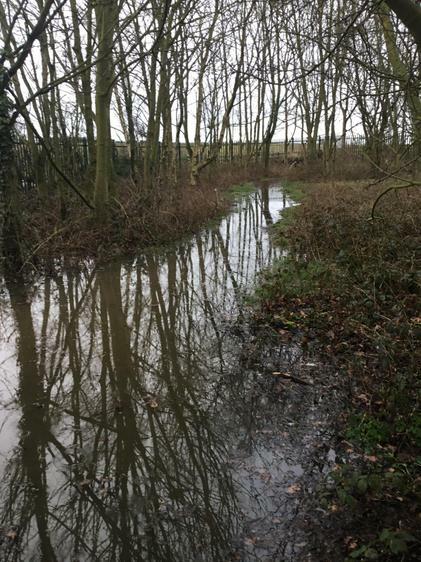 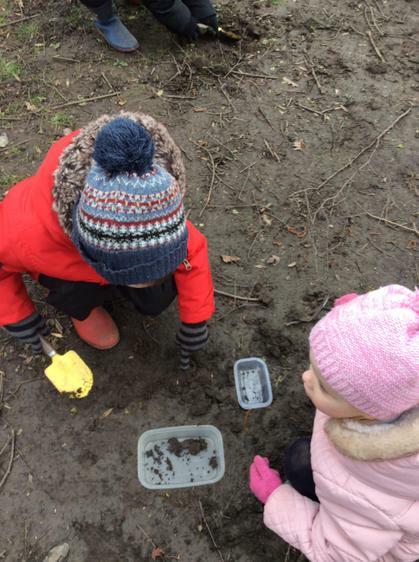 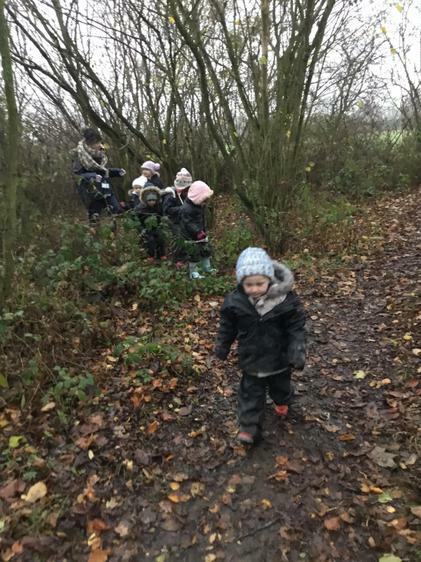 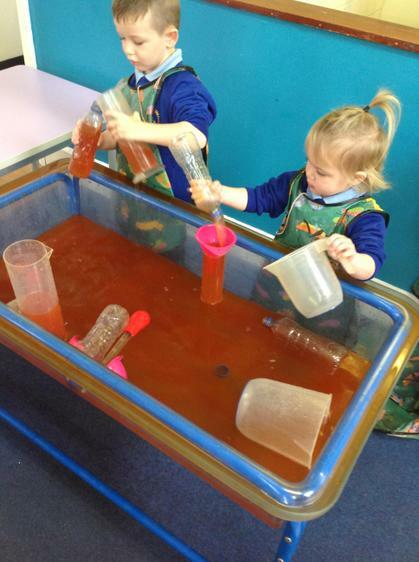 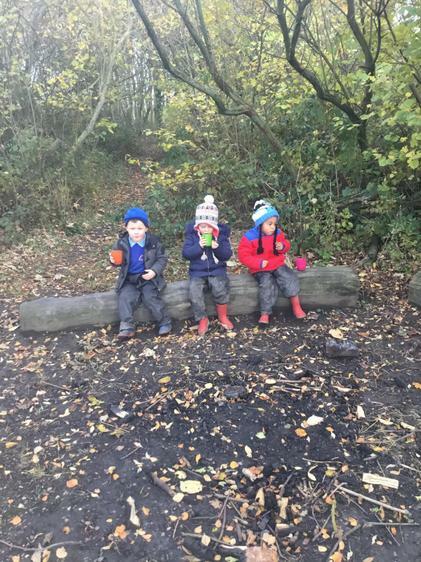 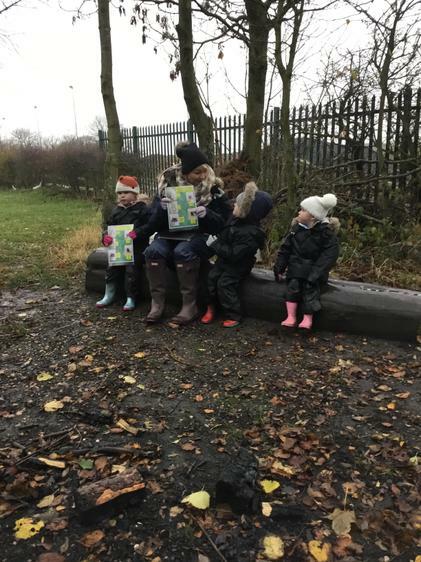 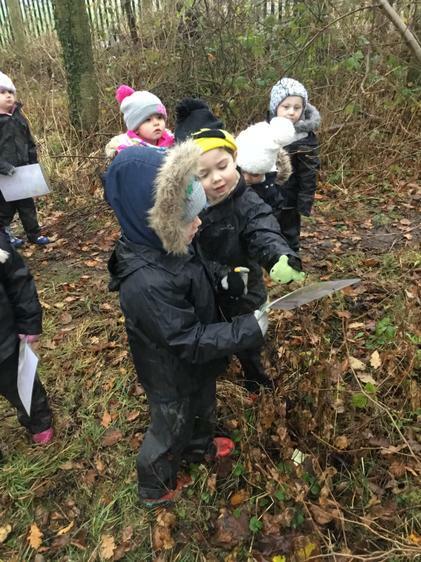 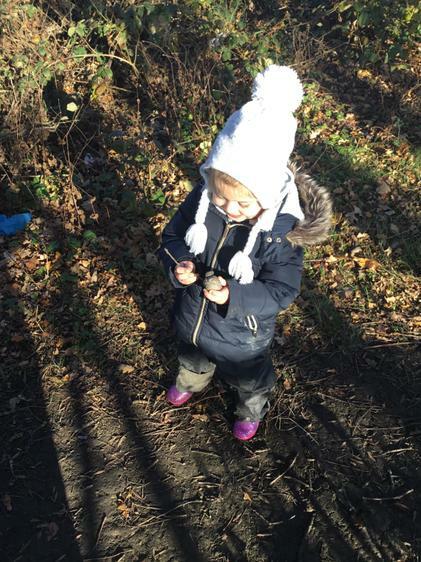 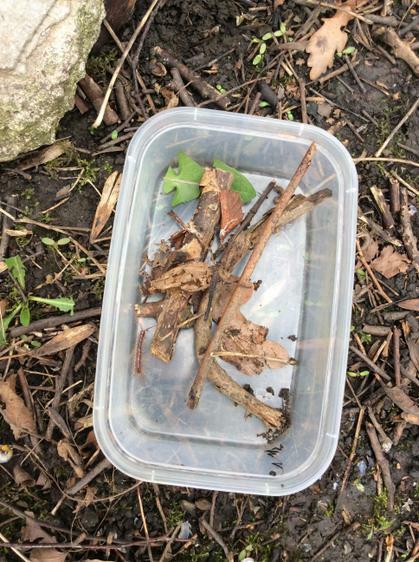 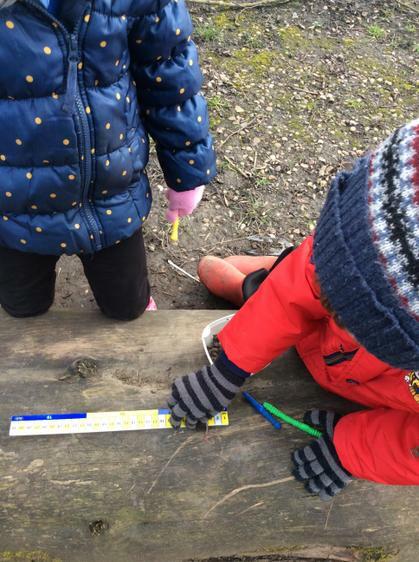 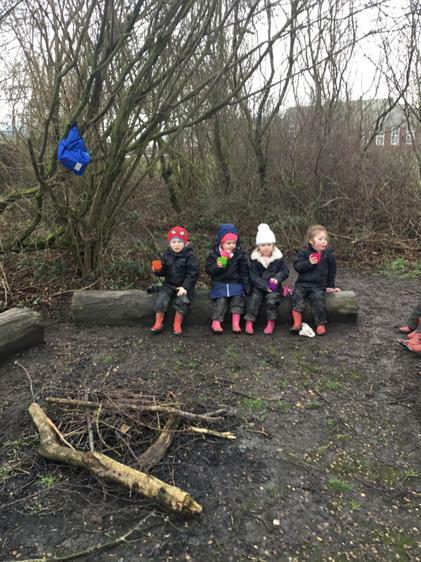 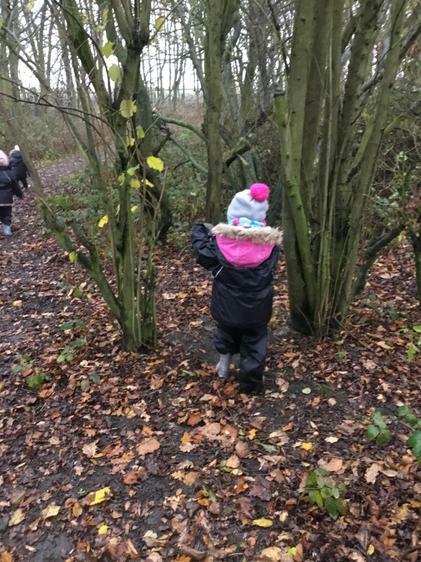 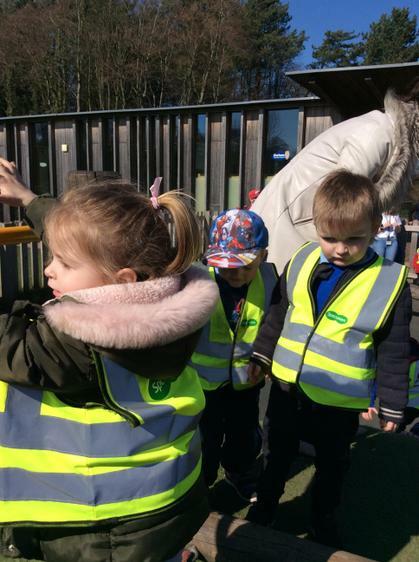 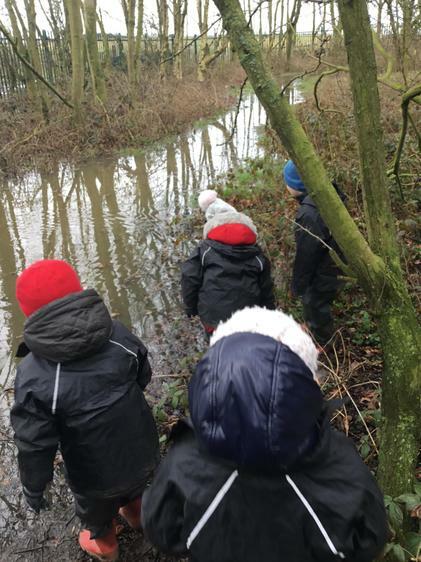 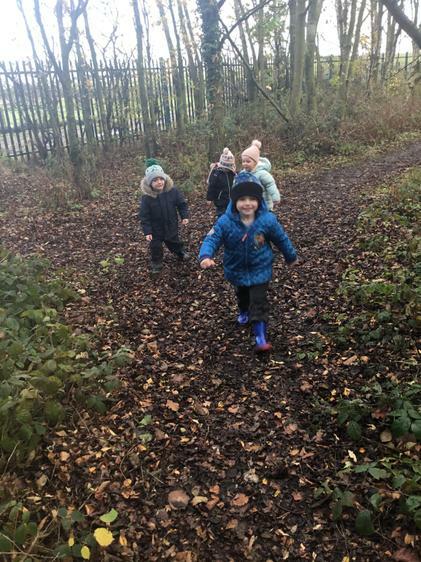 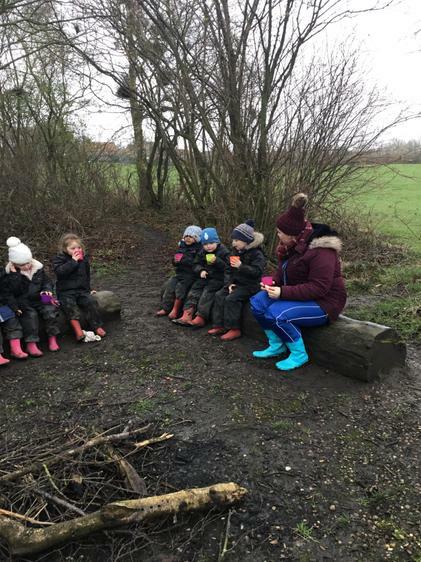 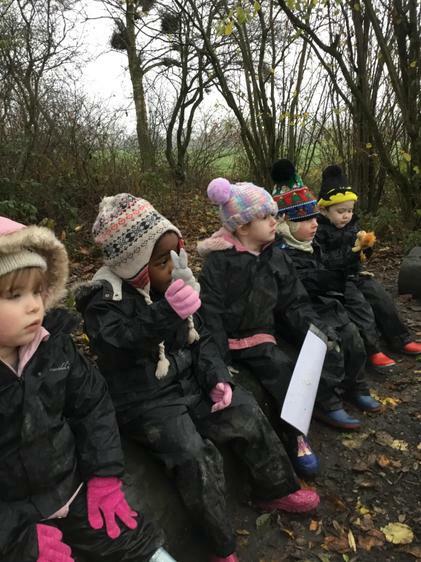 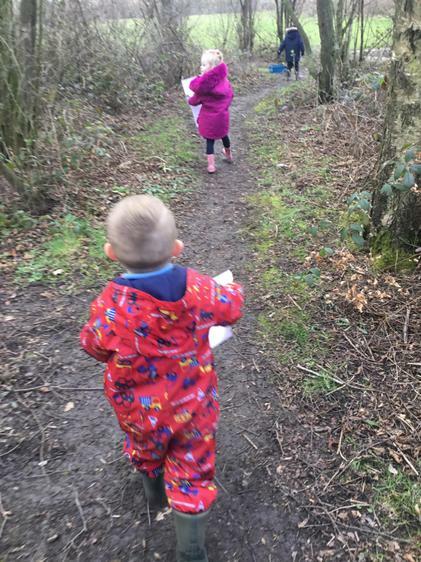 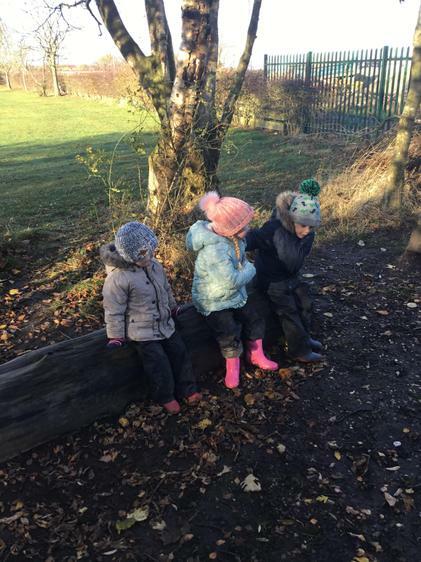 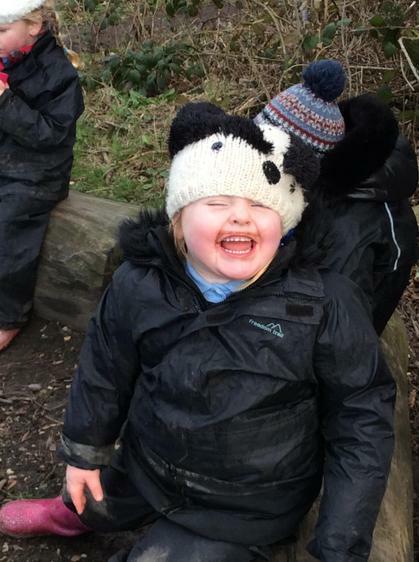 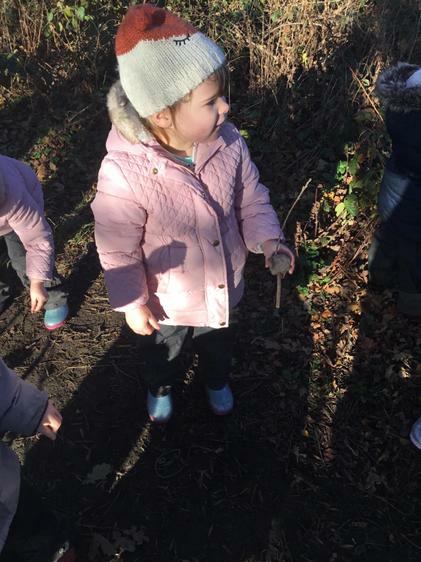 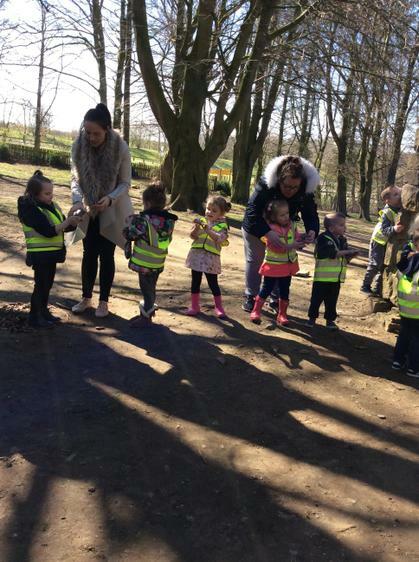 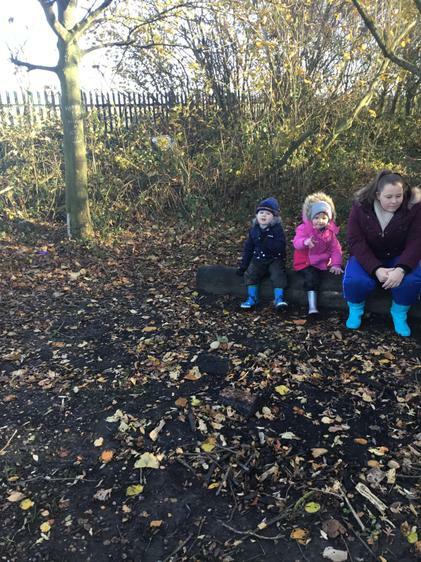 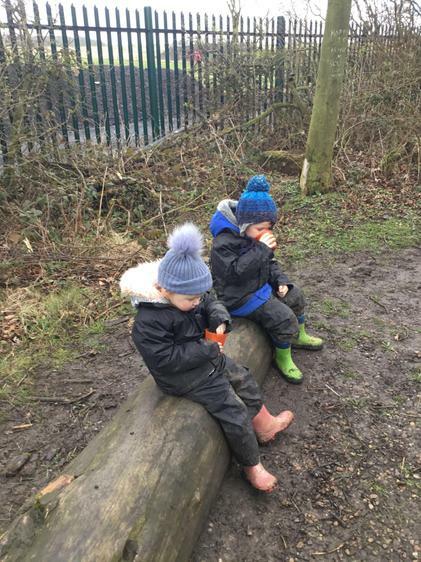 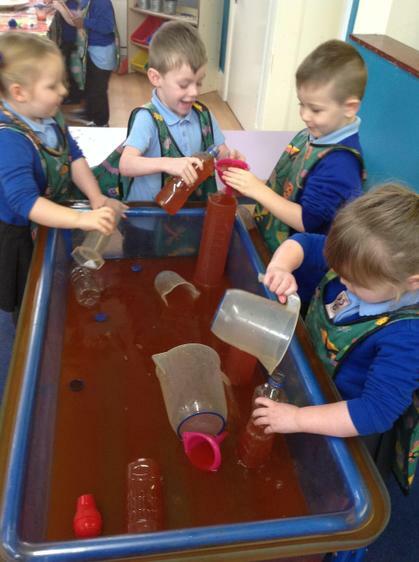 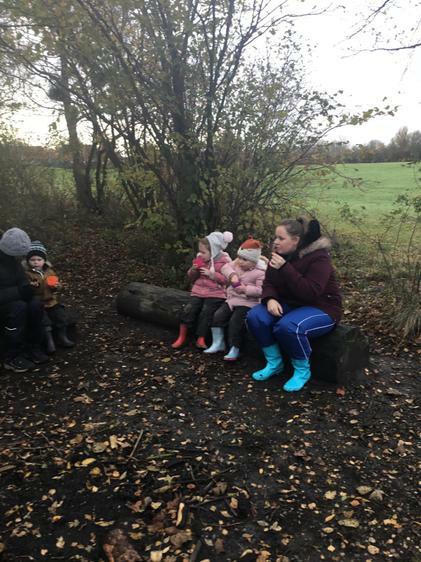 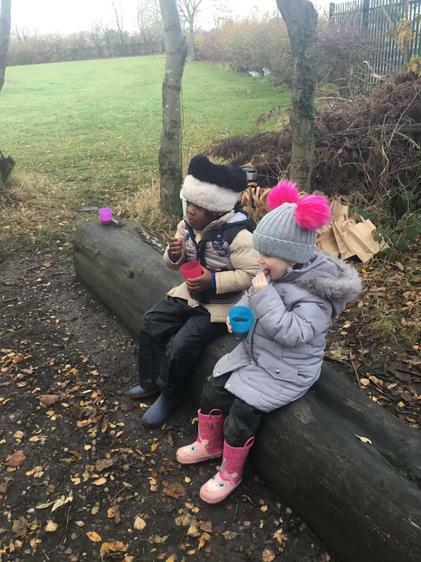 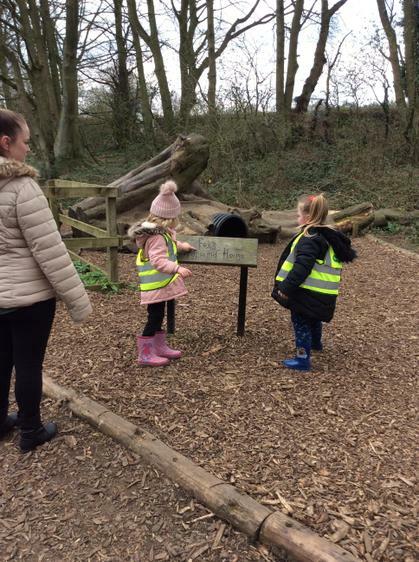 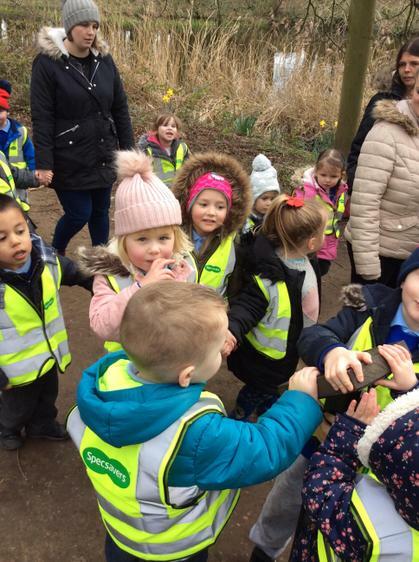 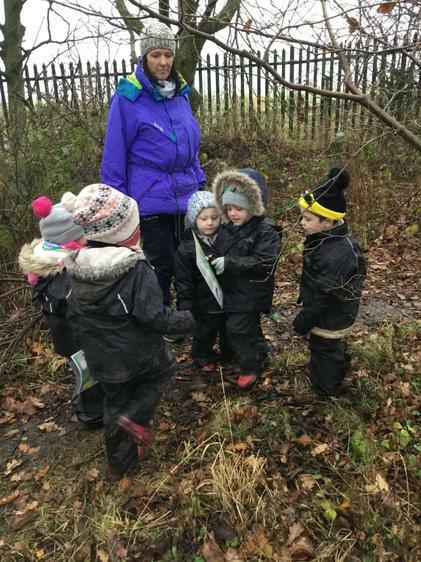 The children found various sized sticks and explored if they would sink or float in the puddle and enjoyed the big splashes as they threw them in. 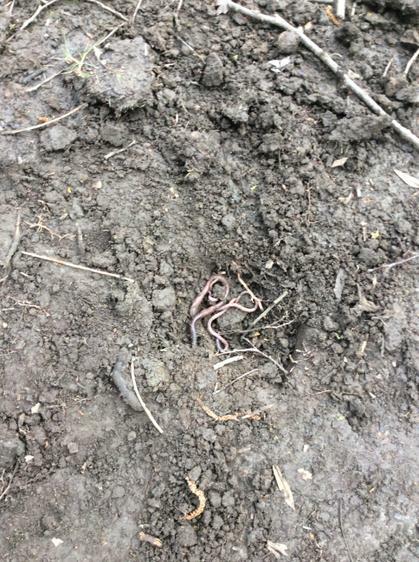 The rain also brought lots of worms out from hiding. 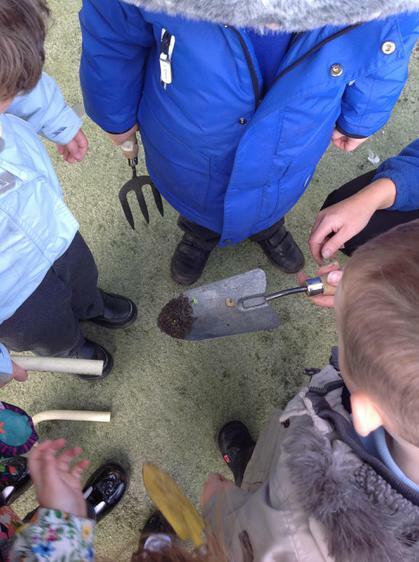 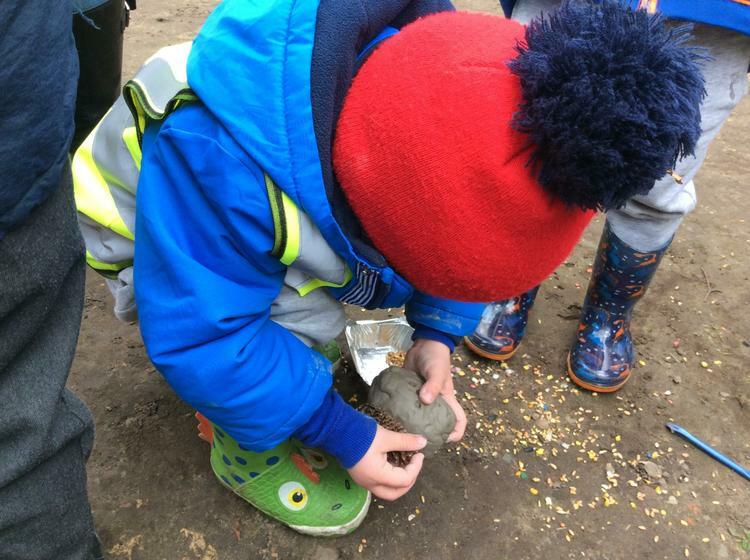 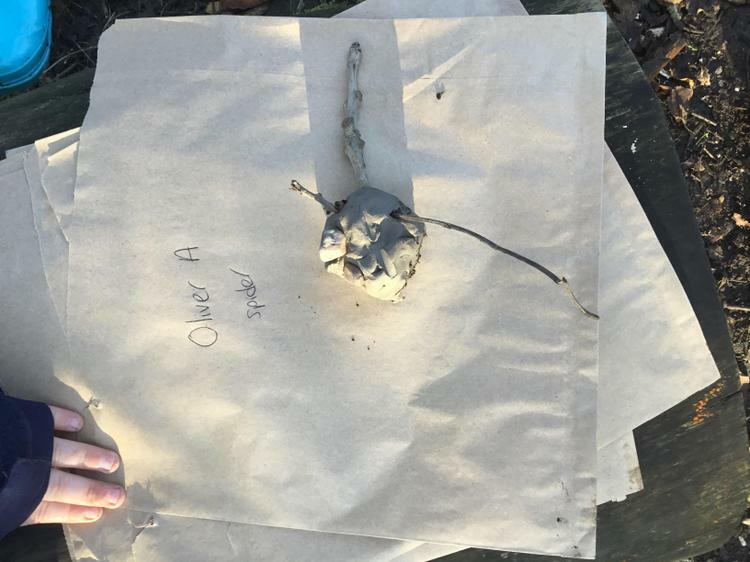 They carefully held them to look at more closely before returning them to the soil. 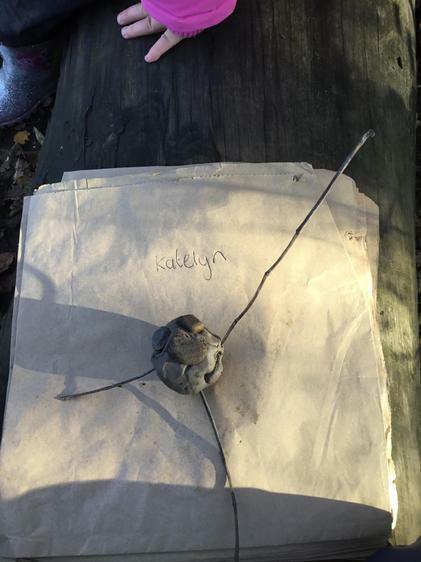 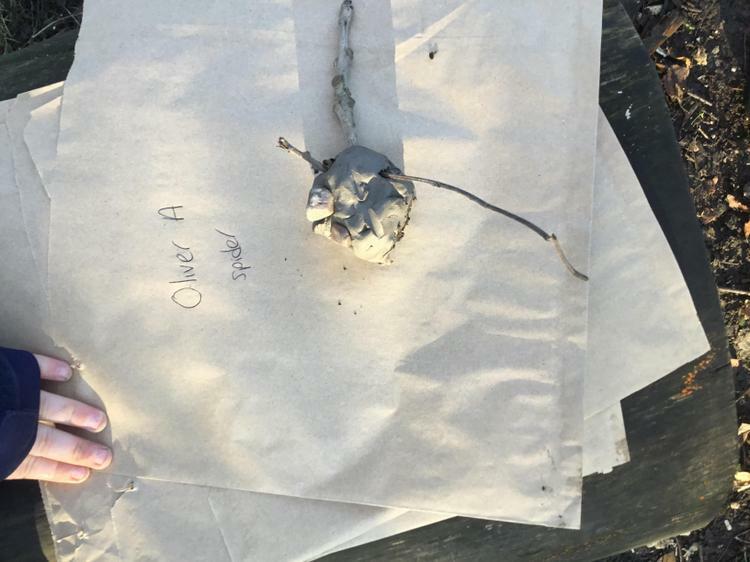 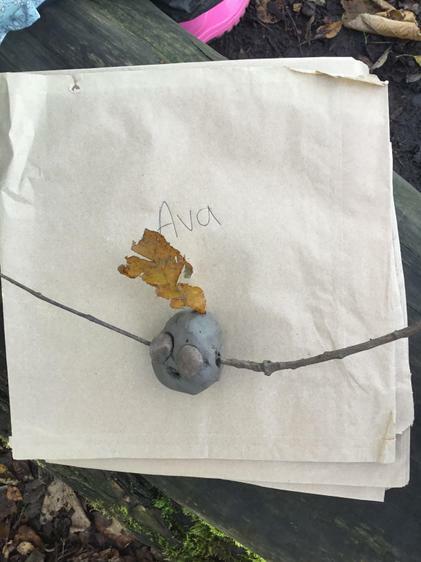 We found a letter in the woods hanging from a tree!!! 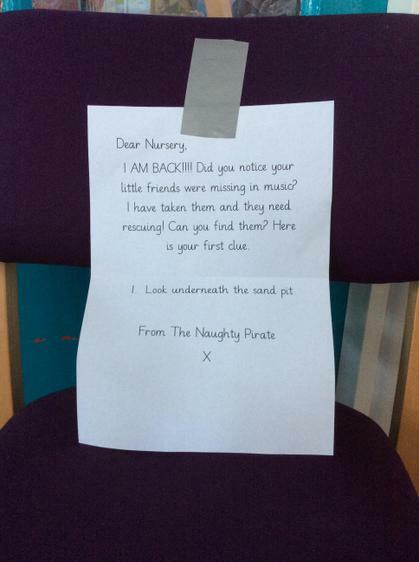 When we read it we couldn’t believe it was from the naughty pirate. 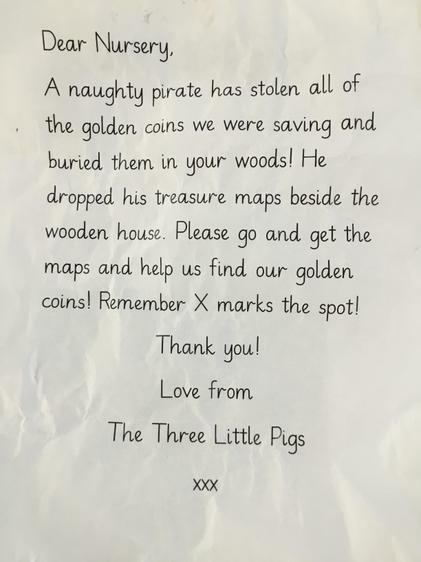 He had stolen the Three Little Pigs golden coins and buried them in the woods. 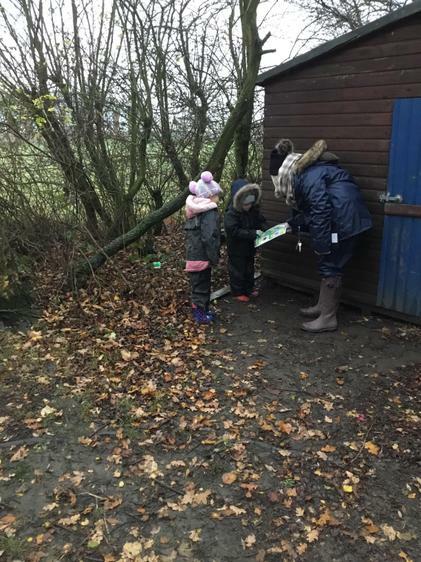 He luckily dropped his maps near the wooden house so we could follow the map and find the golden coins! 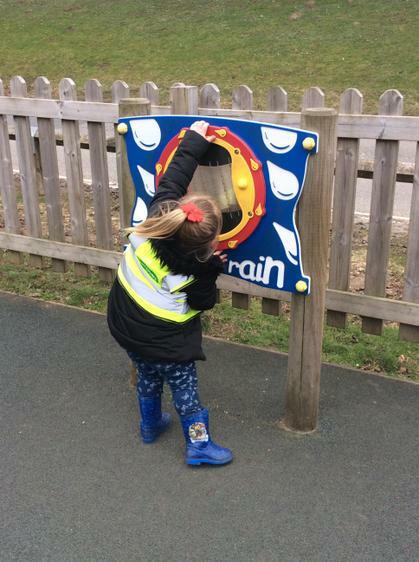 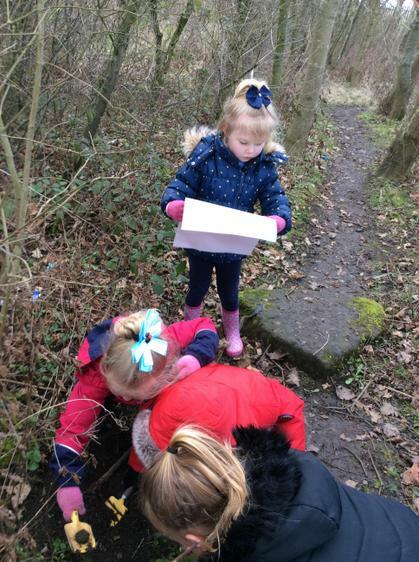 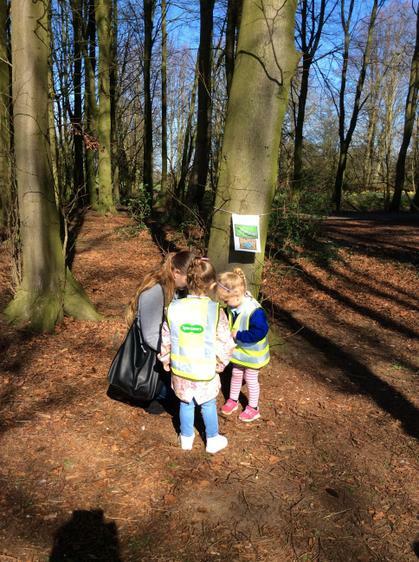 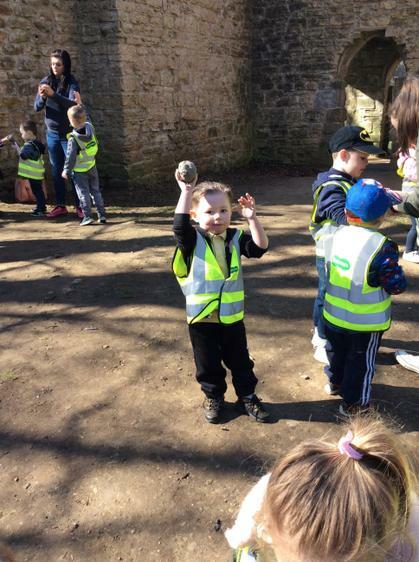 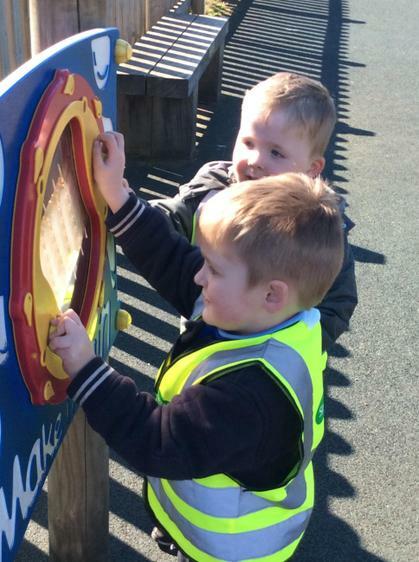 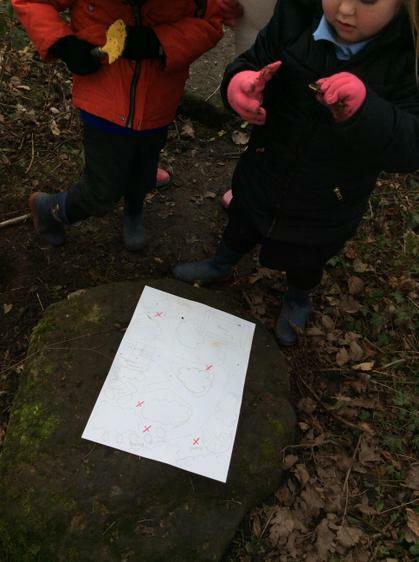 The children loved every minute and were super at recognising places in the map to find the golden coins. 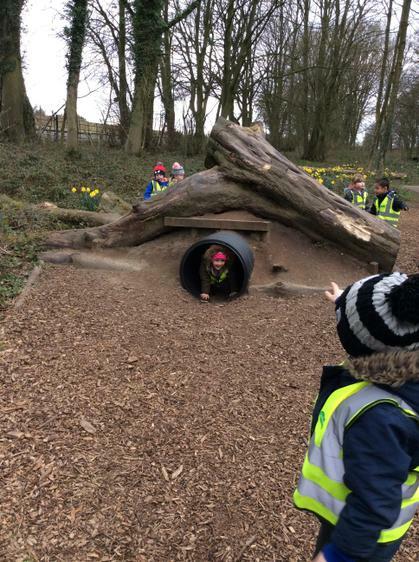 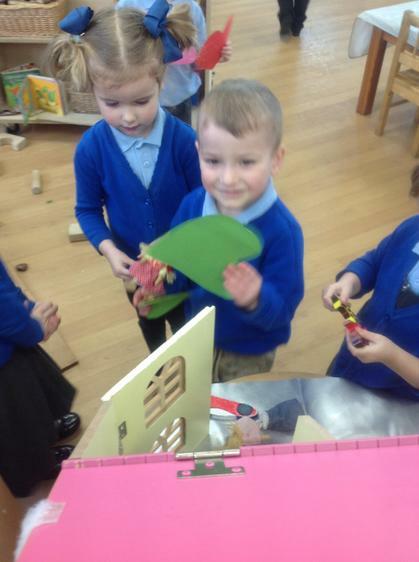 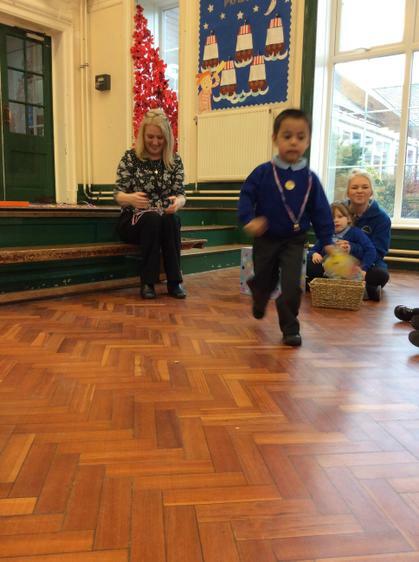 We even returned them safely to The Three Little Pigs at the end! 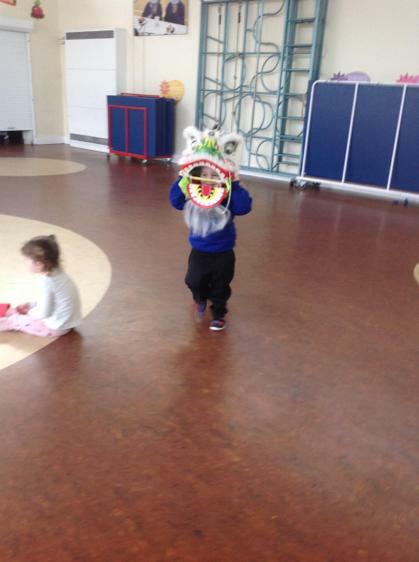 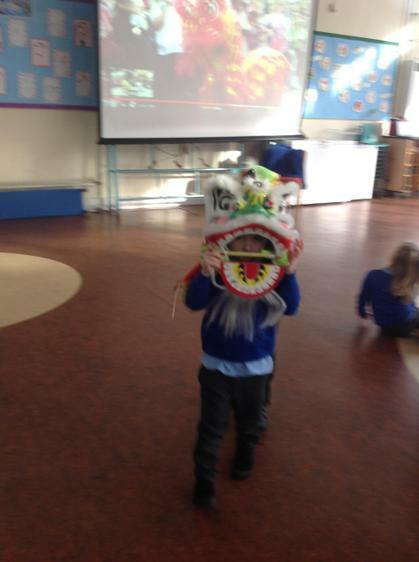 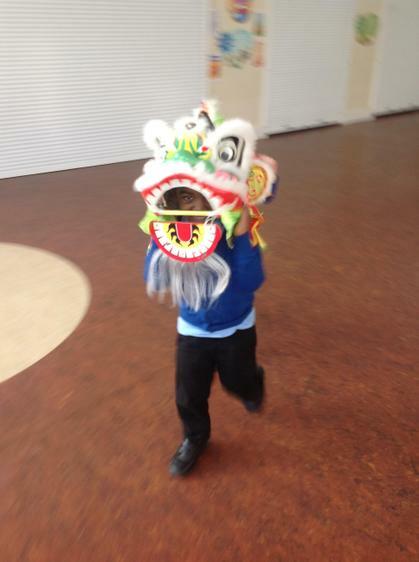 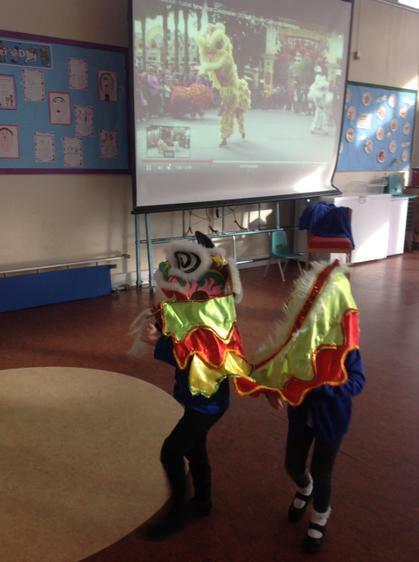 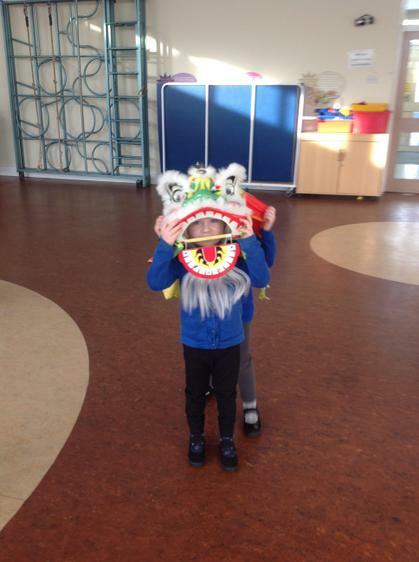 We have been doing lots of fun things to explore Chinese New Year. 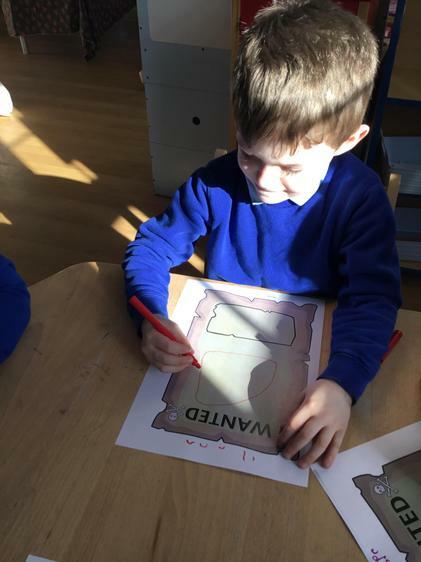 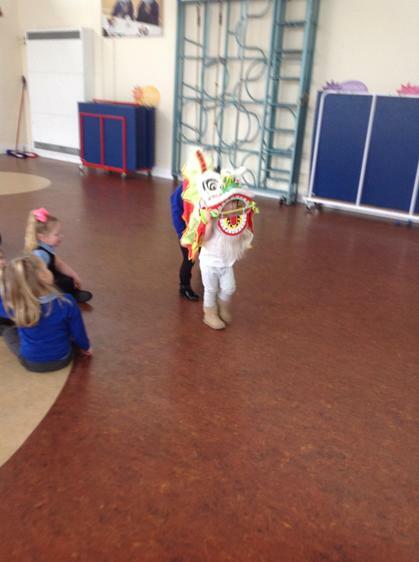 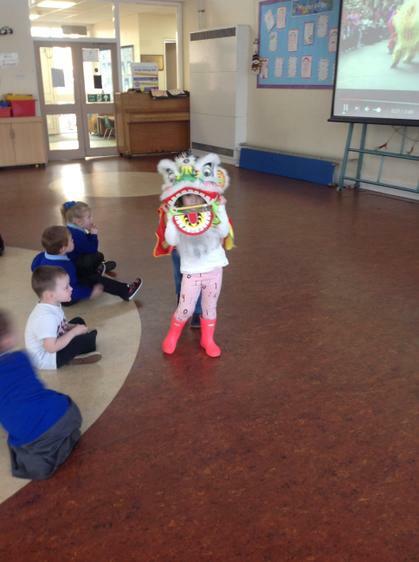 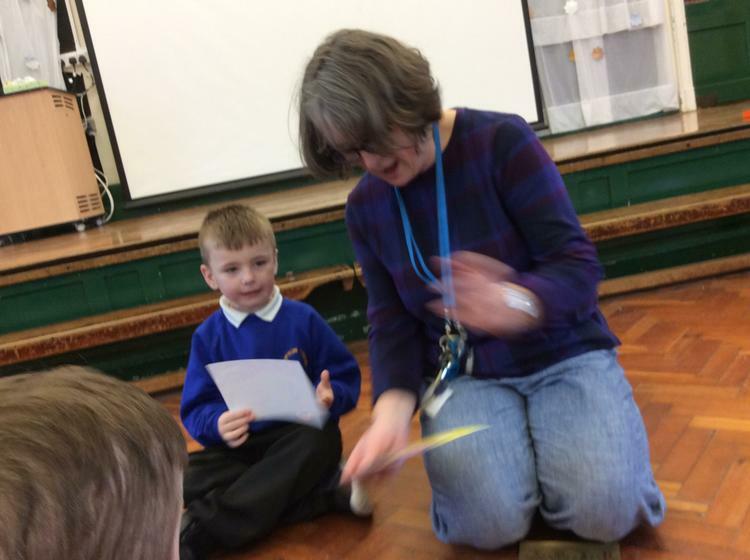 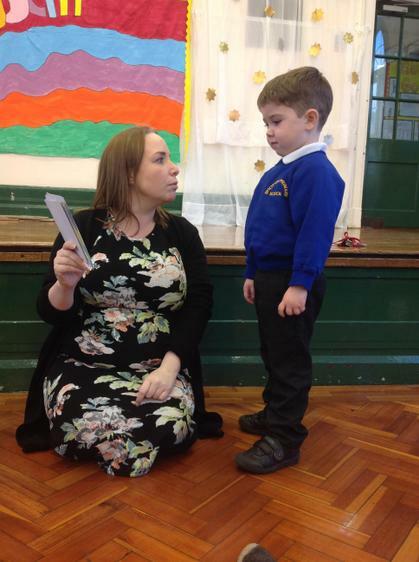 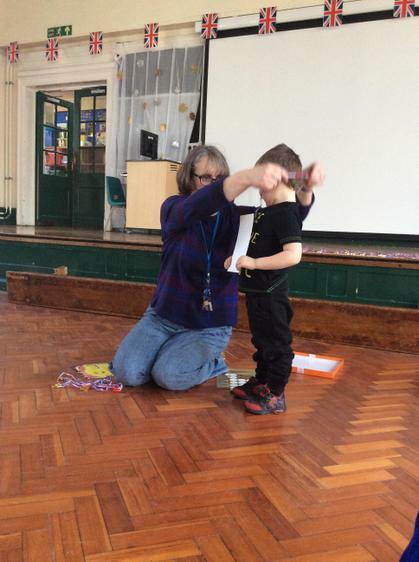 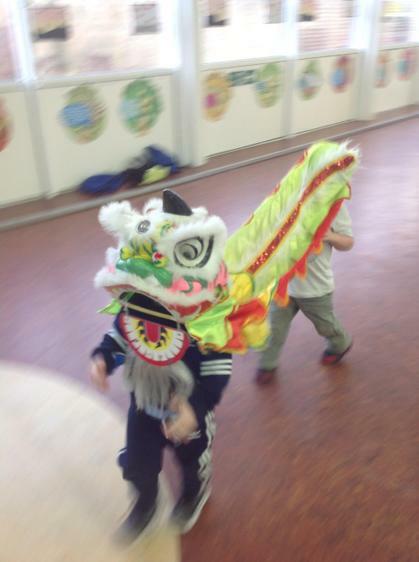 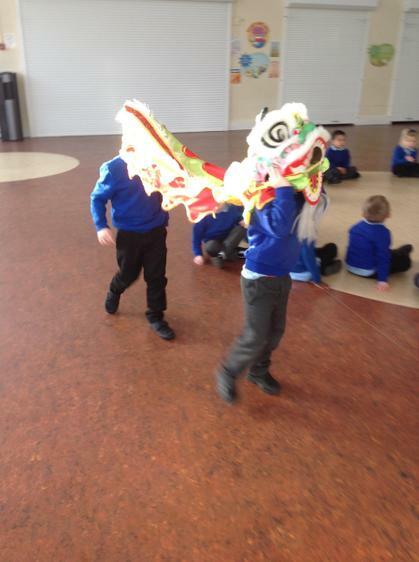 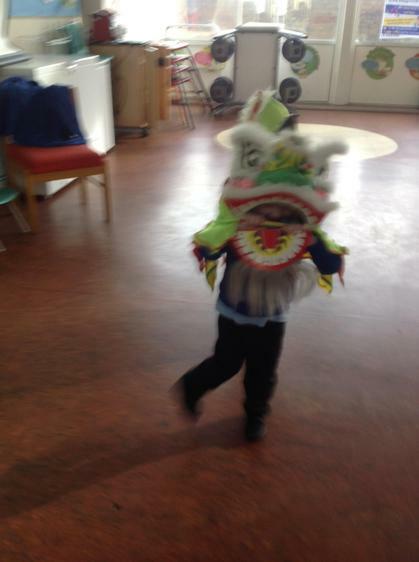 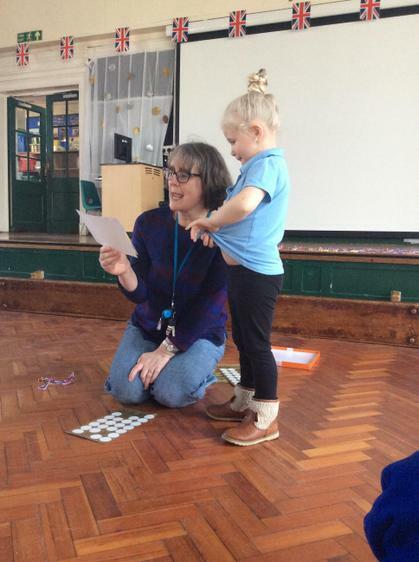 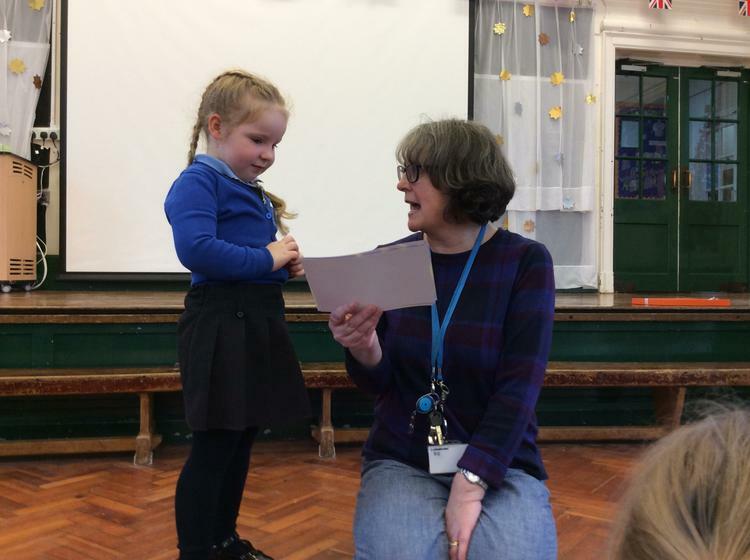 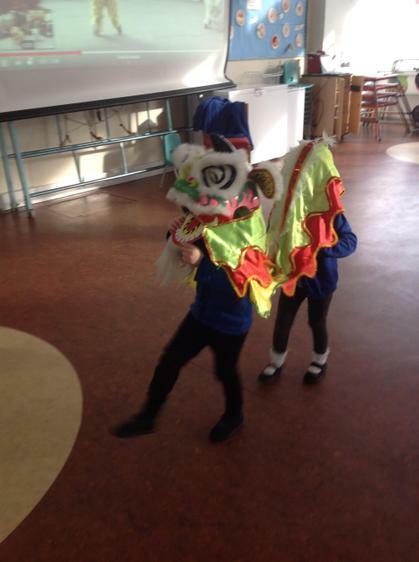 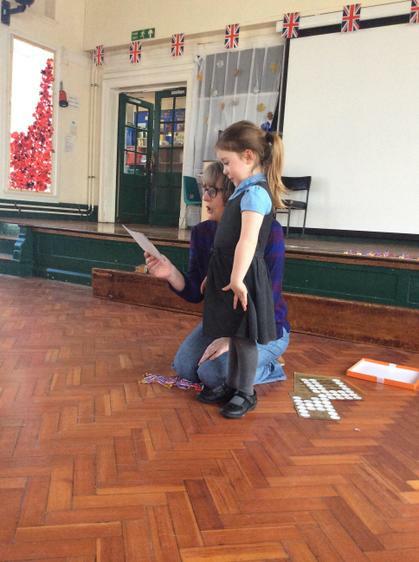 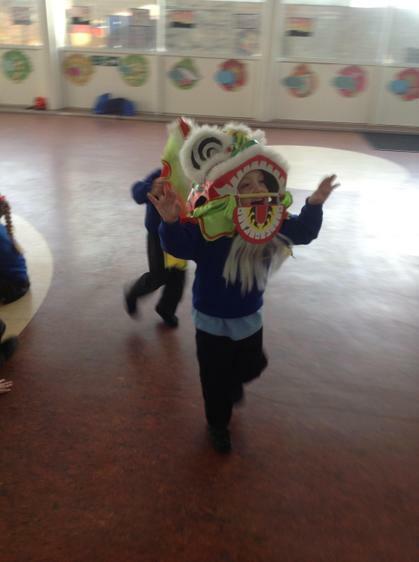 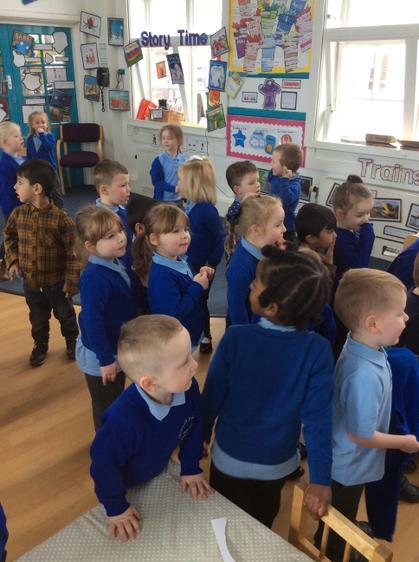 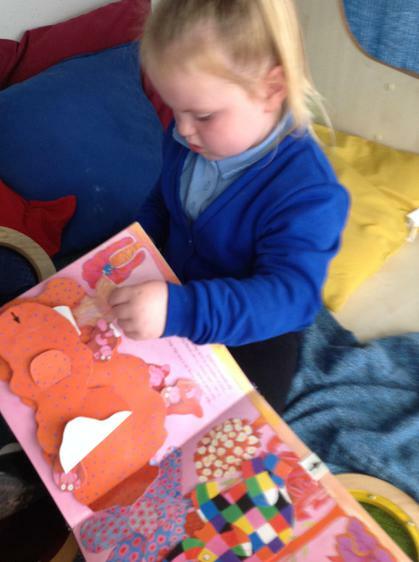 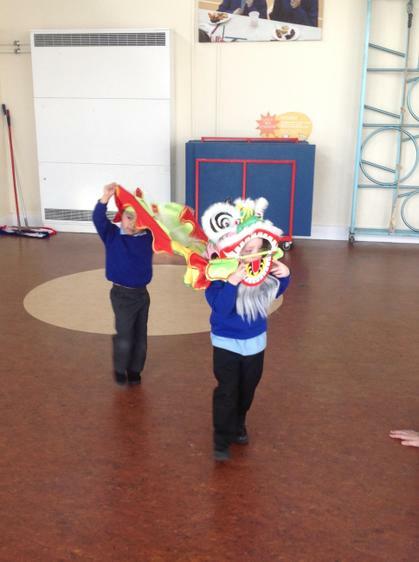 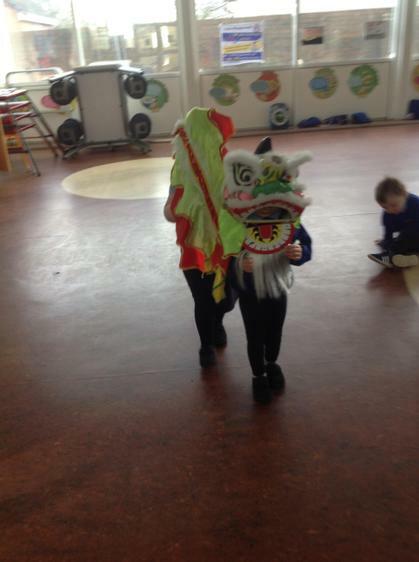 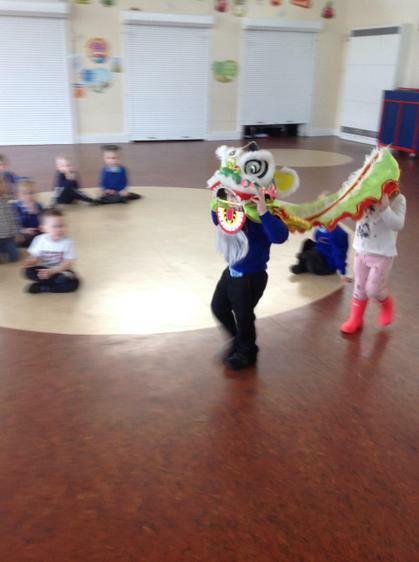 The story of the week has really taught us all about Chinese New Year. 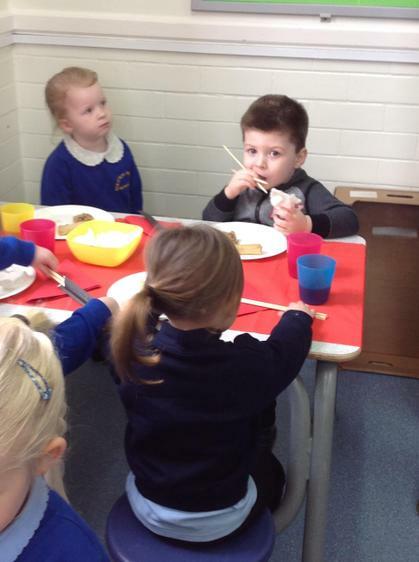 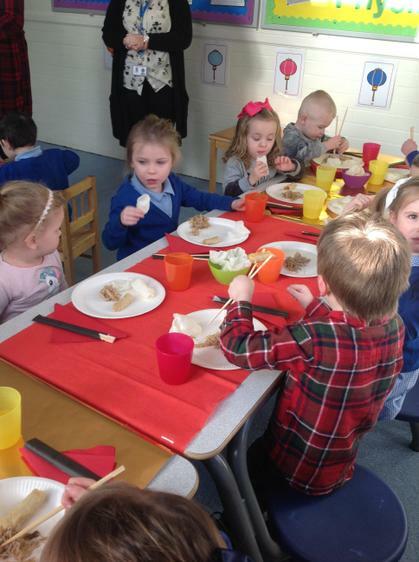 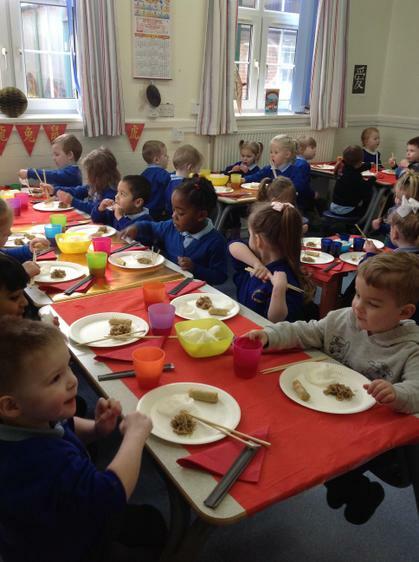 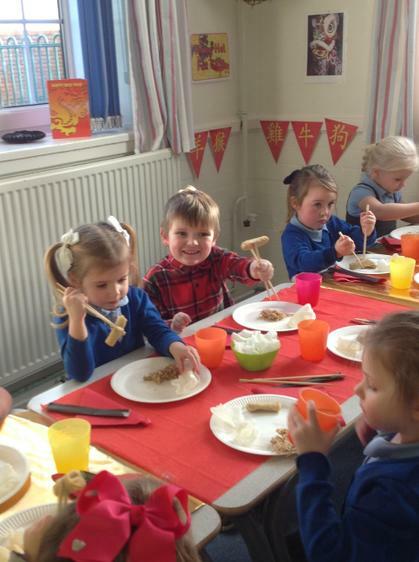 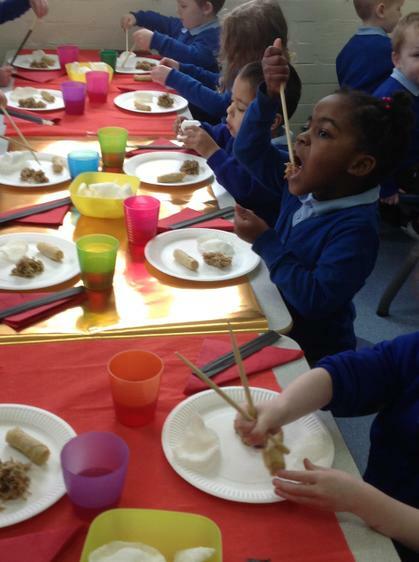 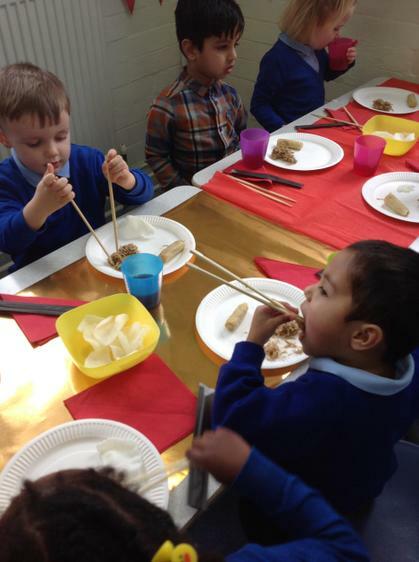 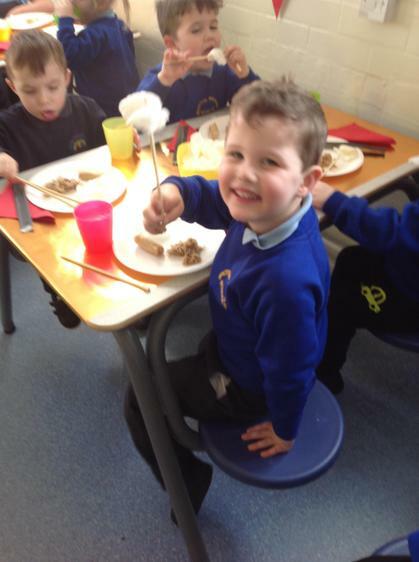 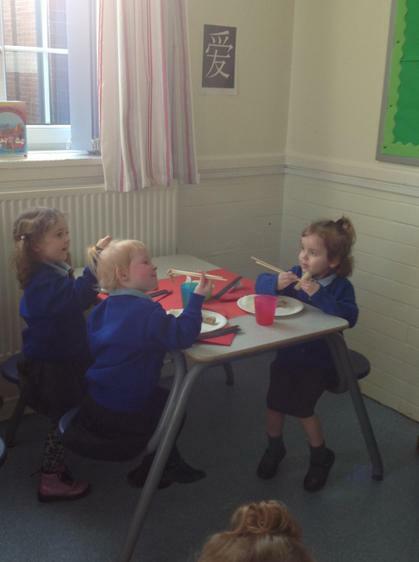 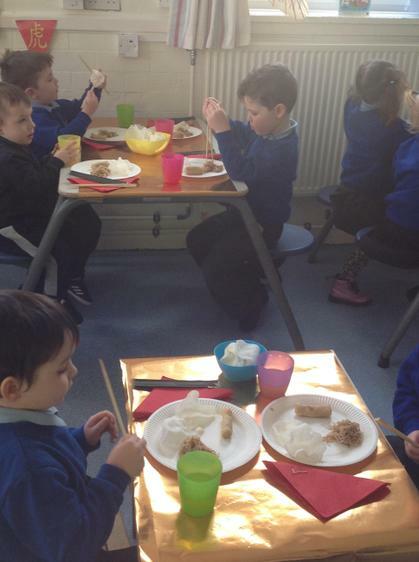 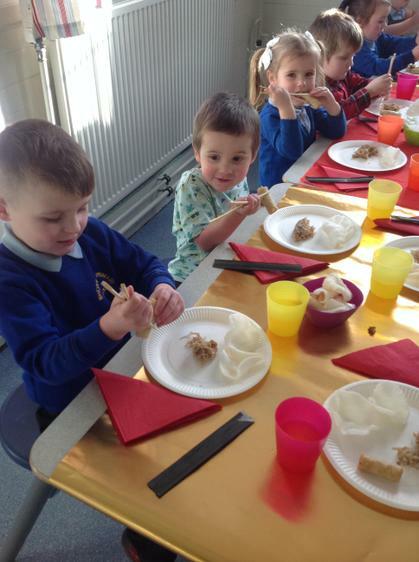 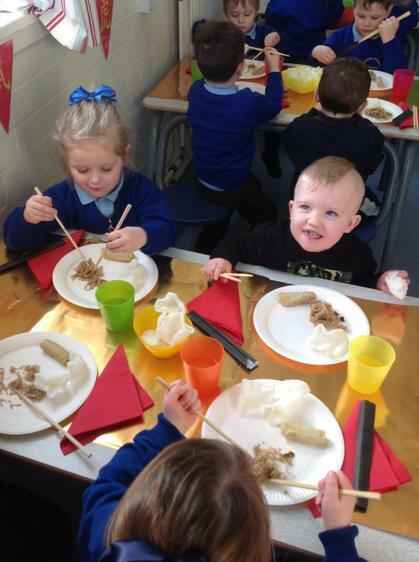 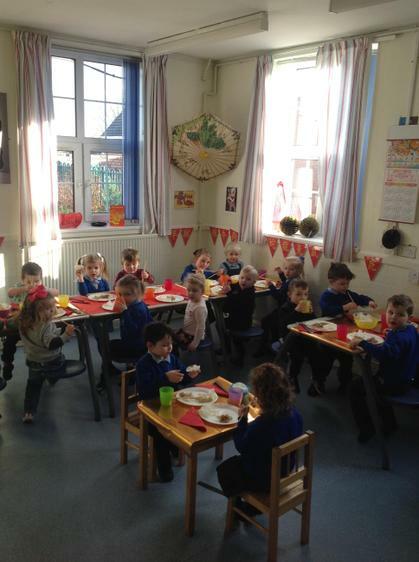 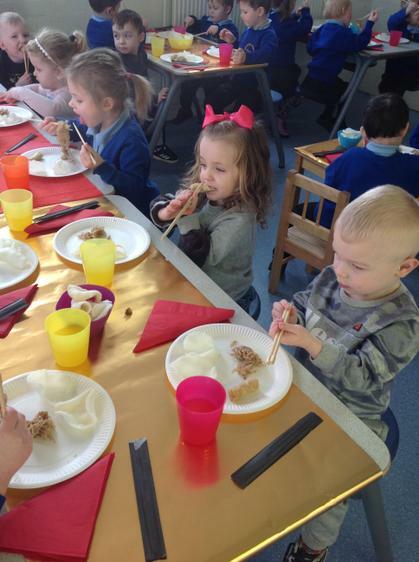 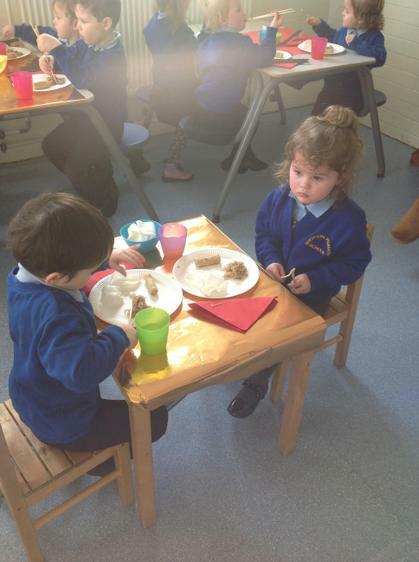 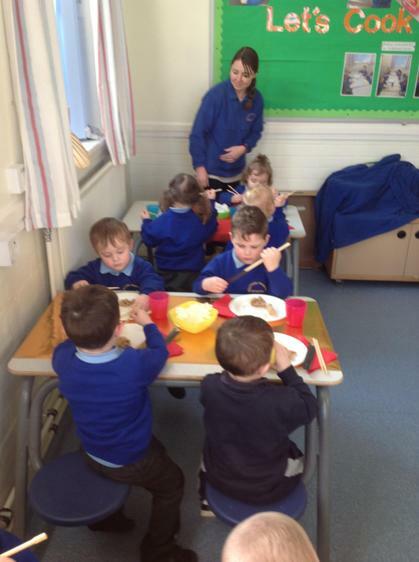 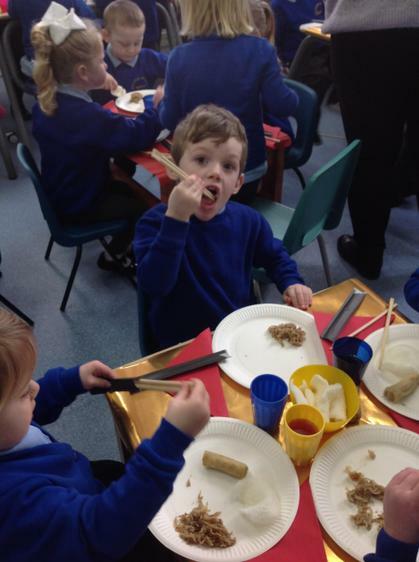 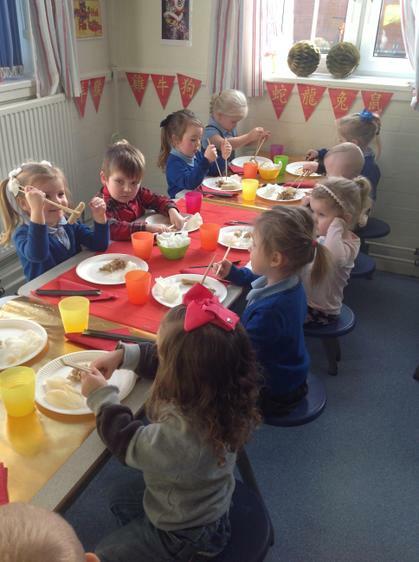 We were very brave and tried some Chinese food at our own little Chinese New Year party. 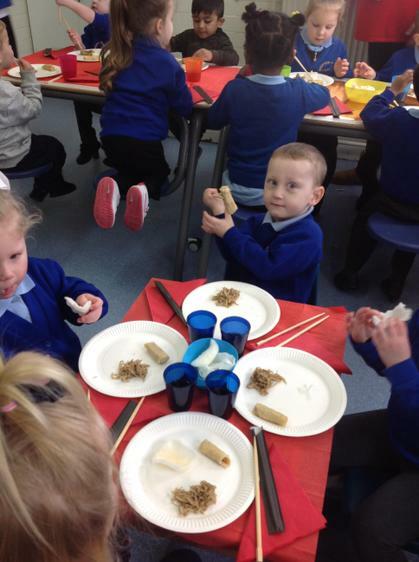 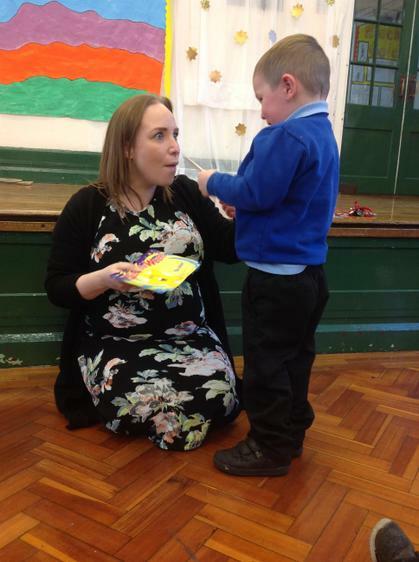 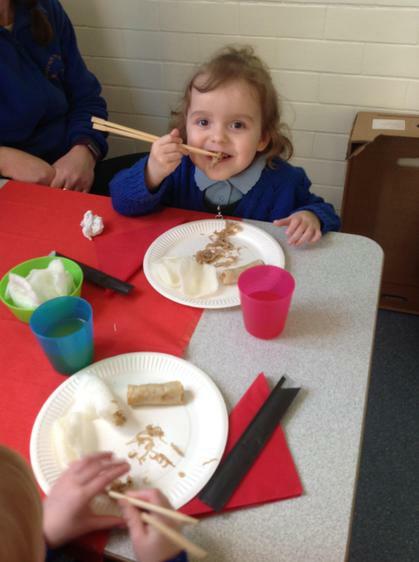 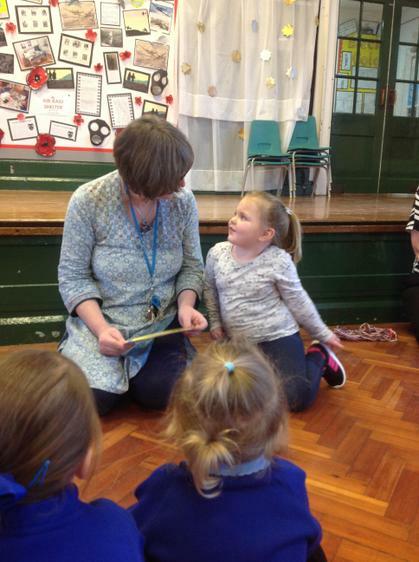 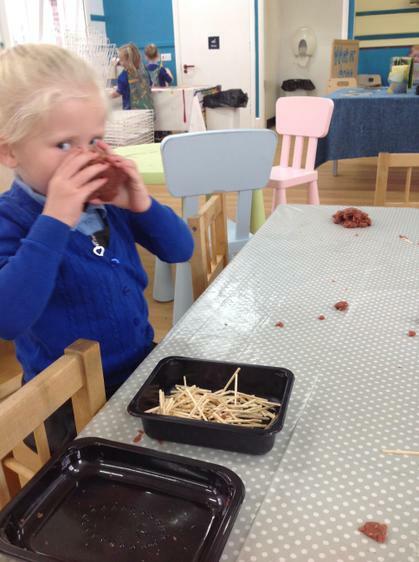 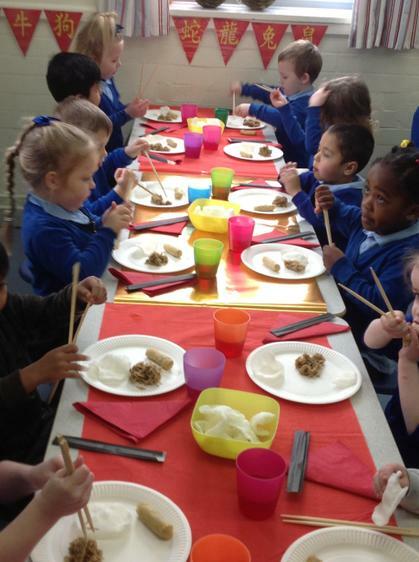 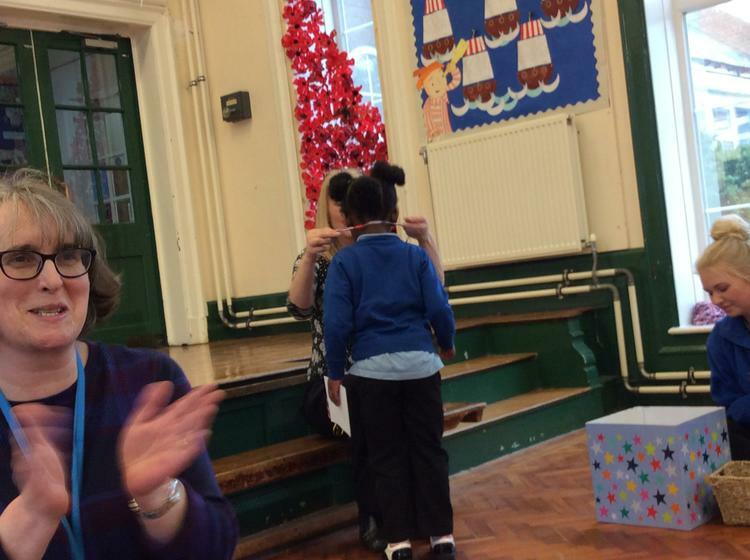 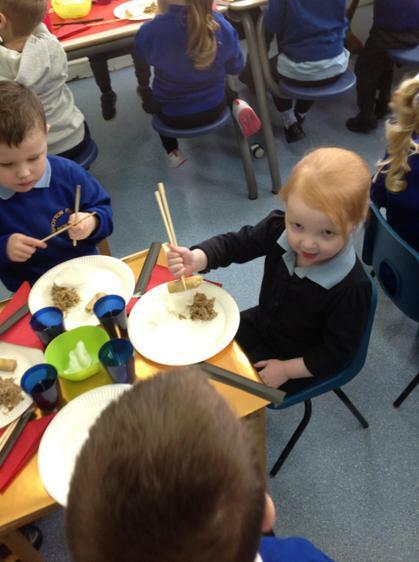 The staff were amazed at how fabulous the children were with a pair of chop sticks. 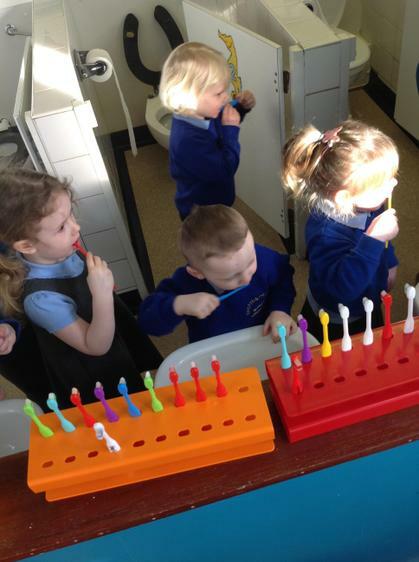 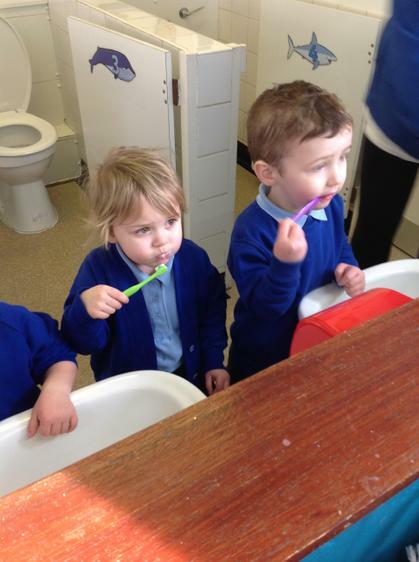 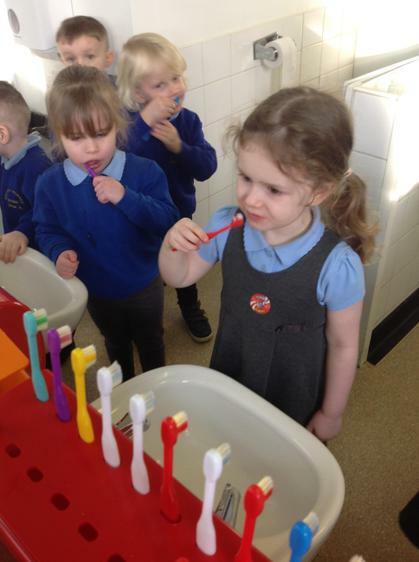 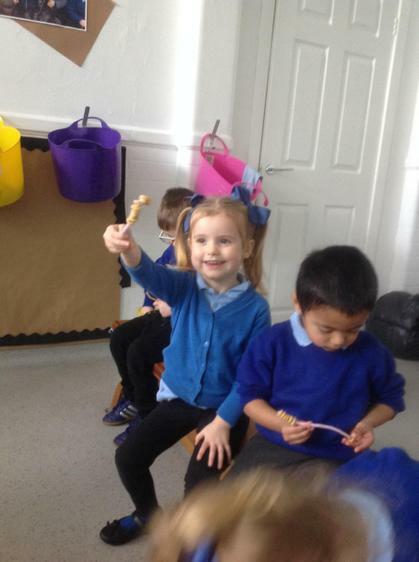 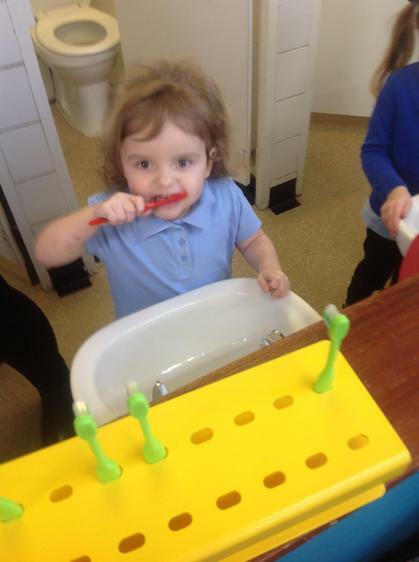 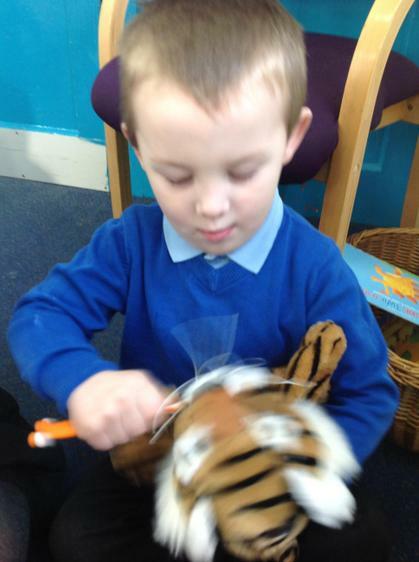 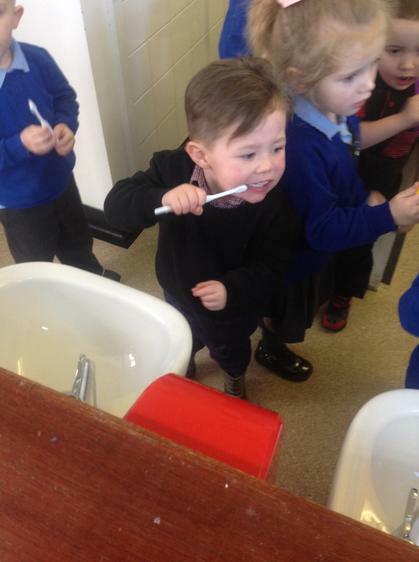 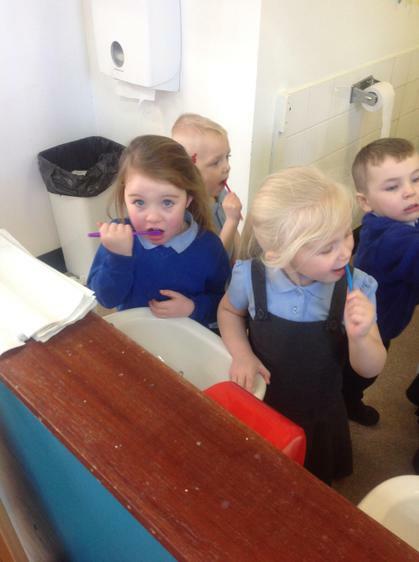 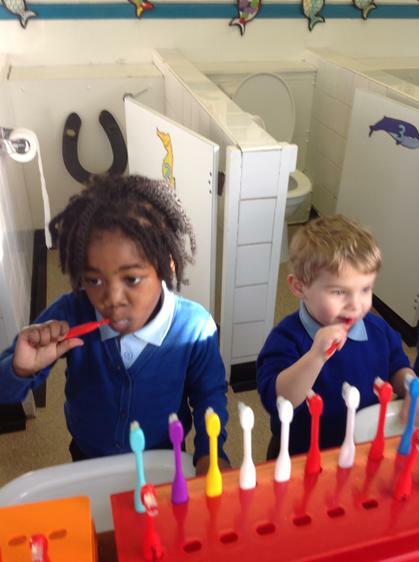 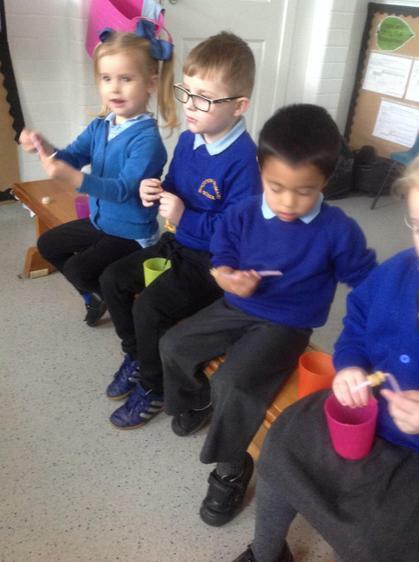 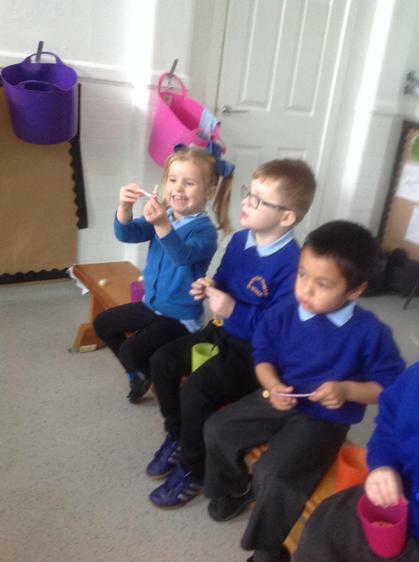 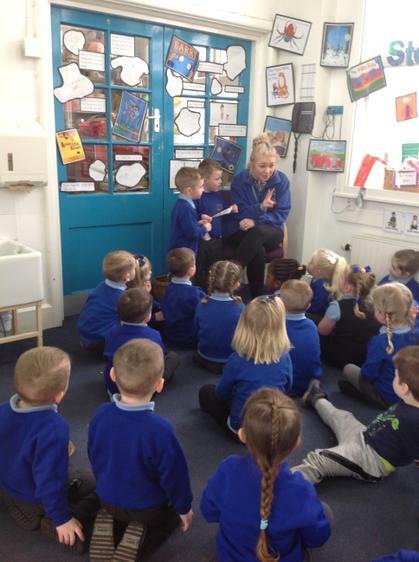 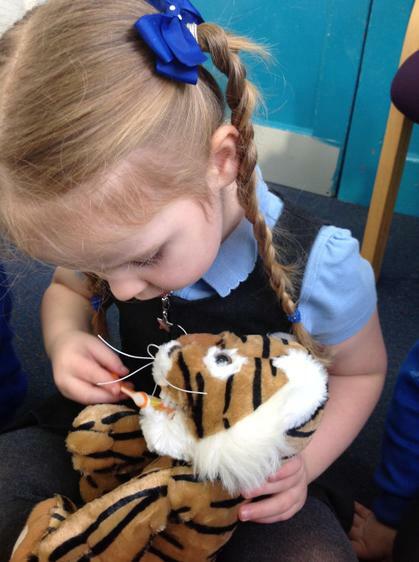 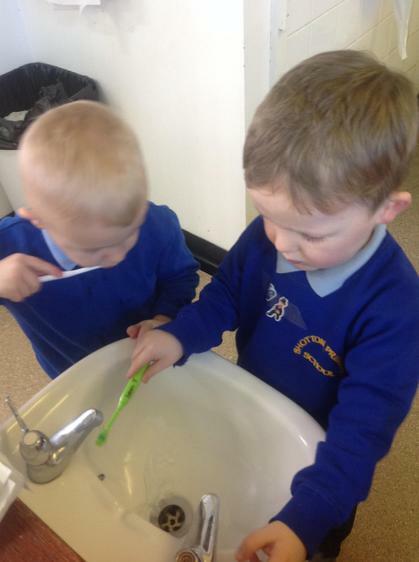 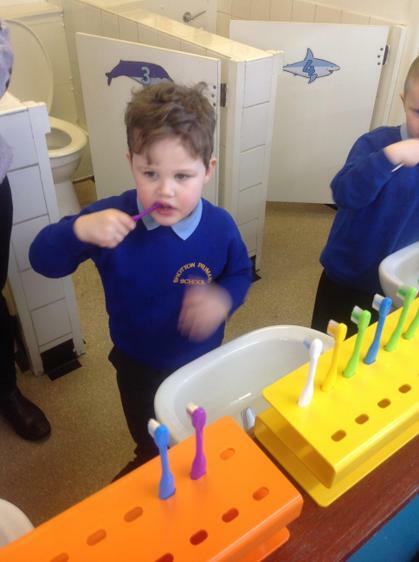 Everyday the children are brushing their teeth in Nursery. 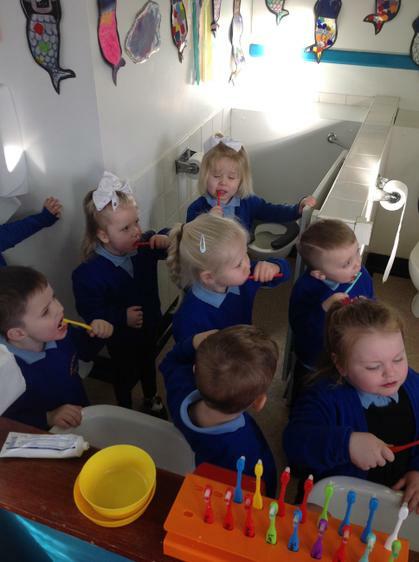 They are really enjoying doing this and very keen to show staff their 'sparkly' teeth! 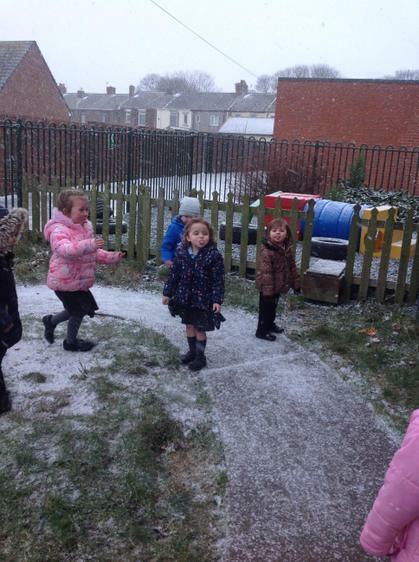 We were extremely excited that it started snowing today. 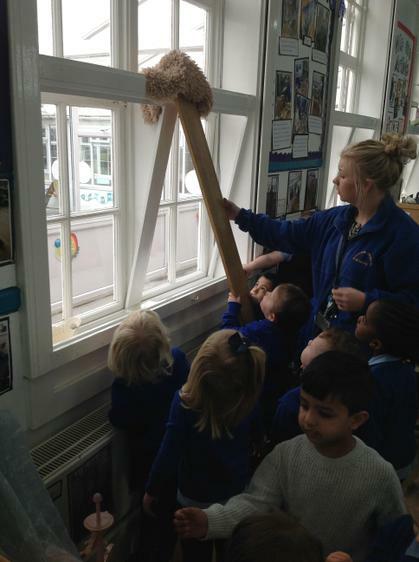 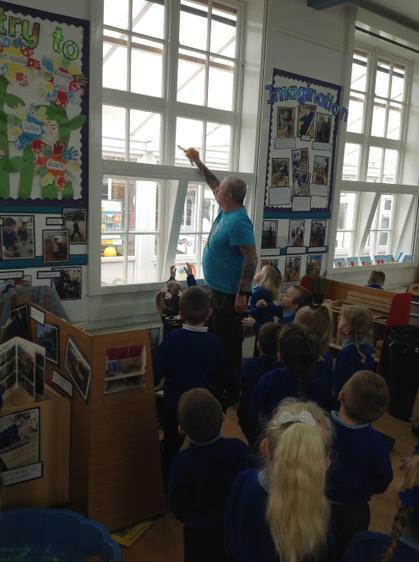 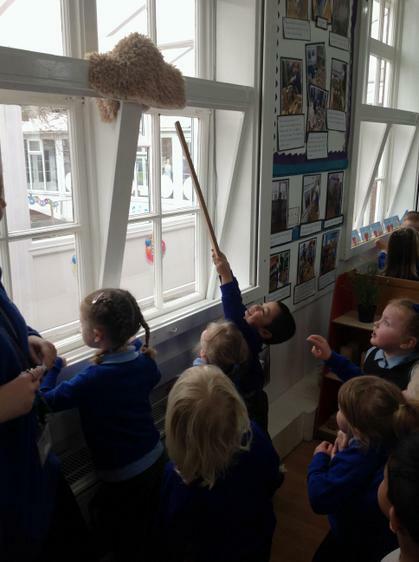 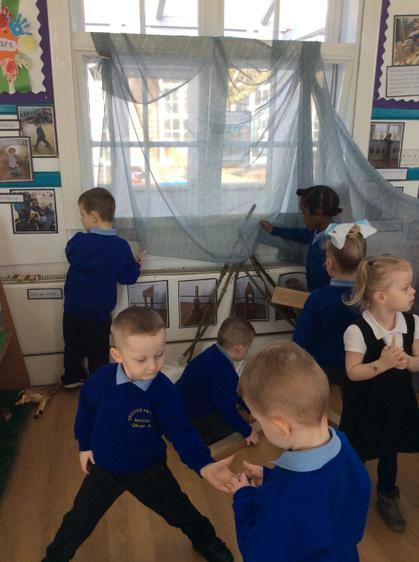 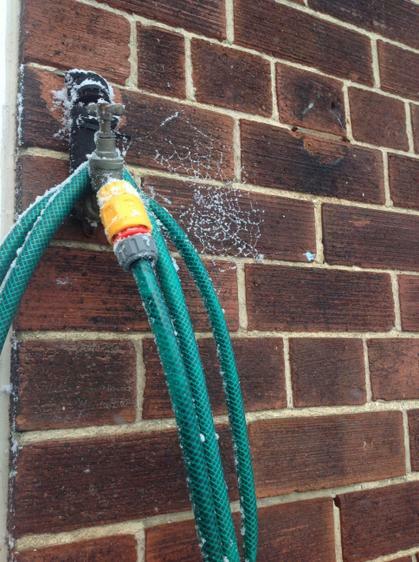 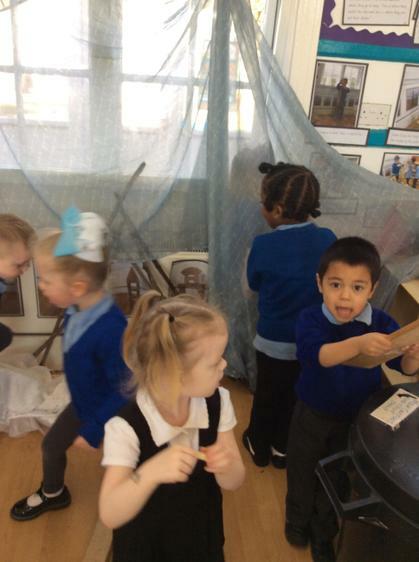 We even found the very busy spiders web from our story of the week! 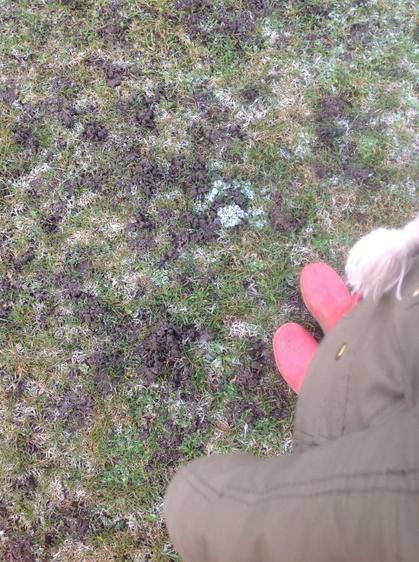 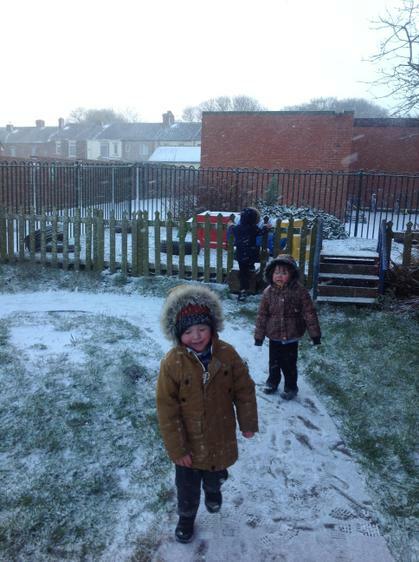 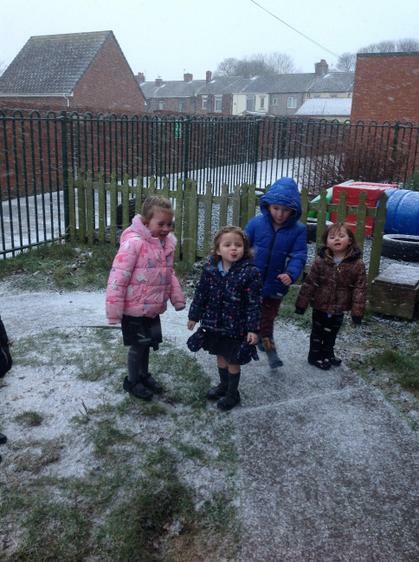 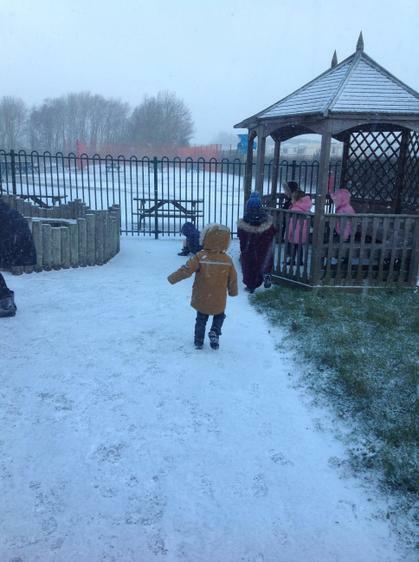 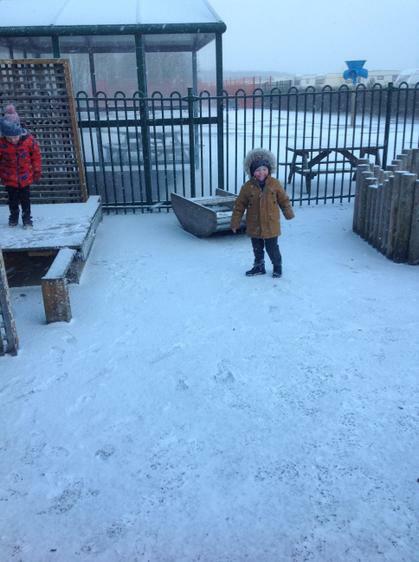 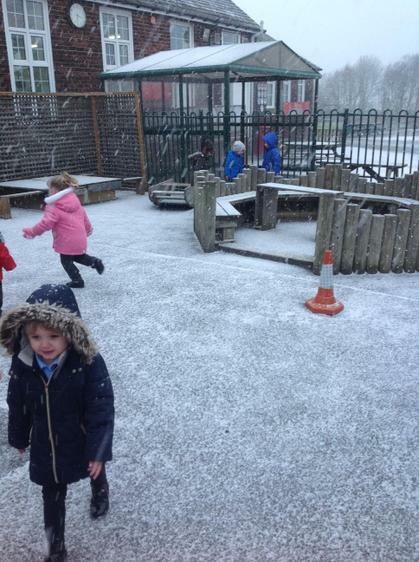 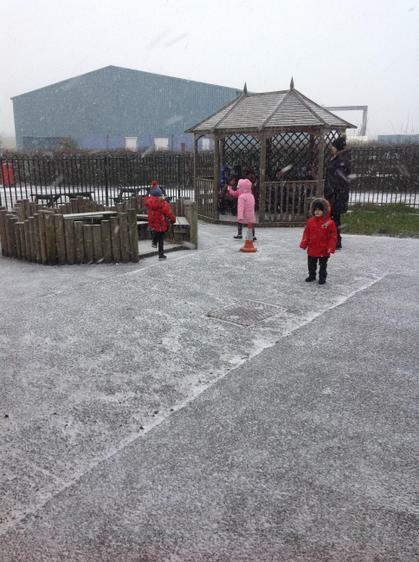 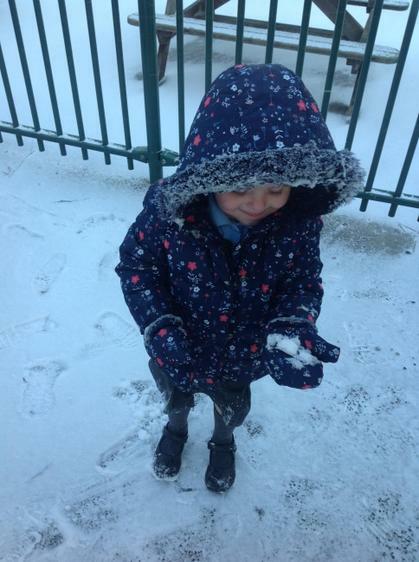 We had lots of fun making marks, trying to catch the snow on our tongues, making mini snowmen and looking at our foot prints in the snow. 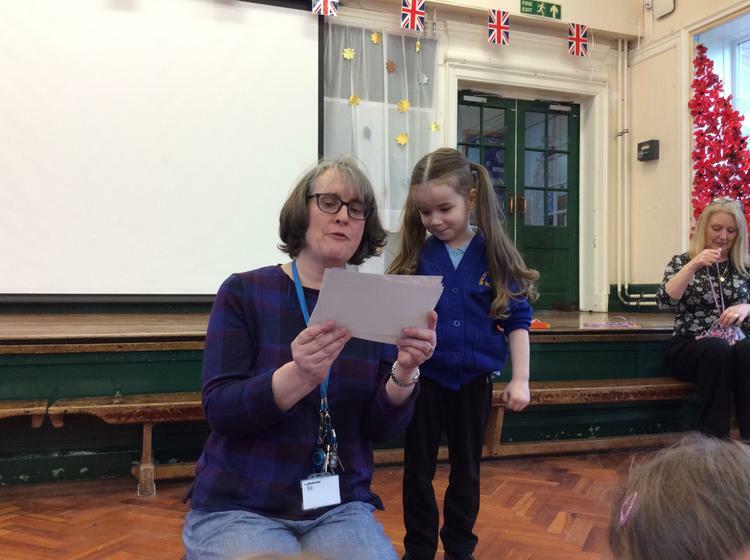 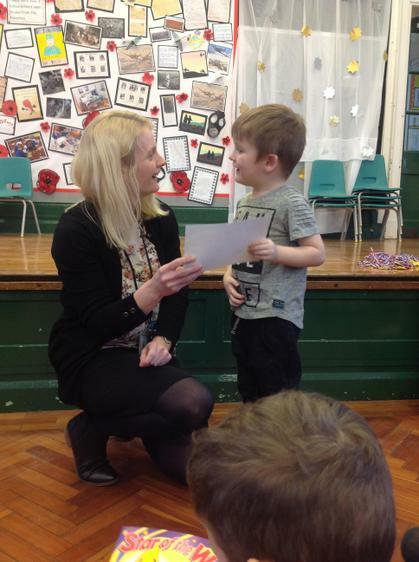 Thank you to all the parents who came to celebrate the children's fantastic achievements at the celebration assembly today. 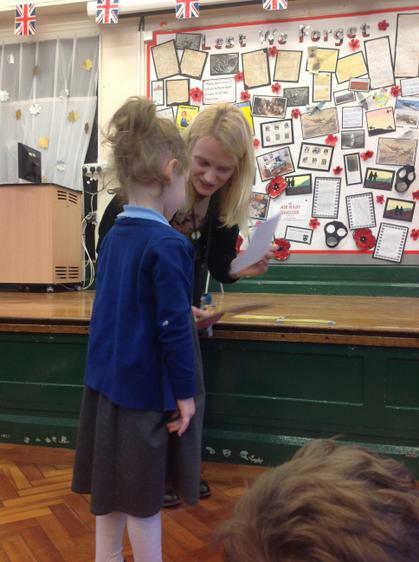 We loved sharing their successes with you and we are sure you will be as proud of them as we are! 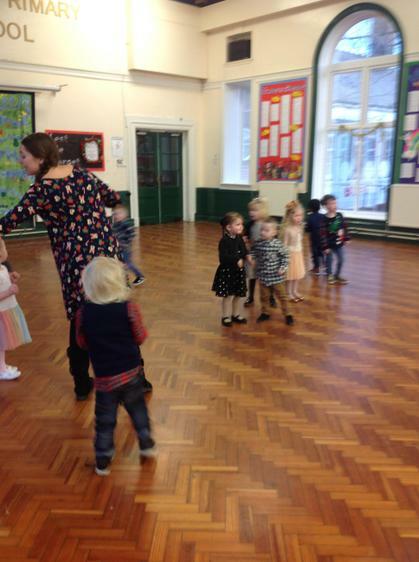 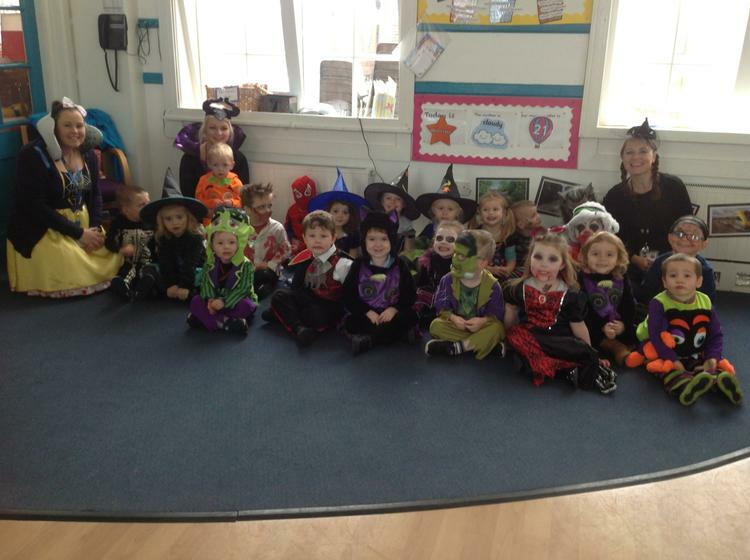 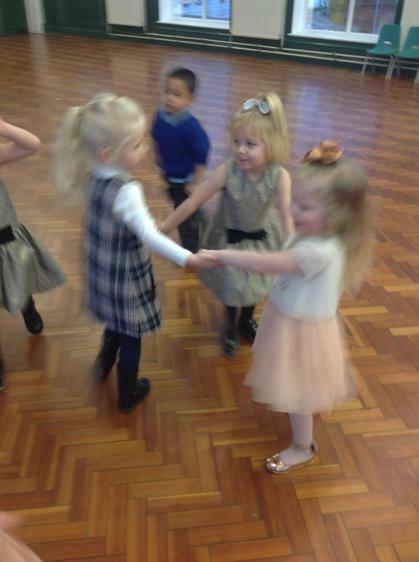 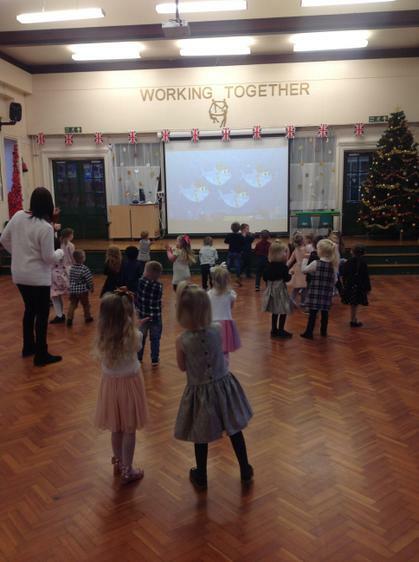 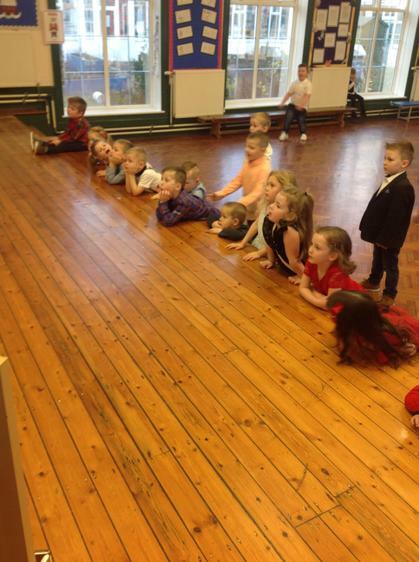 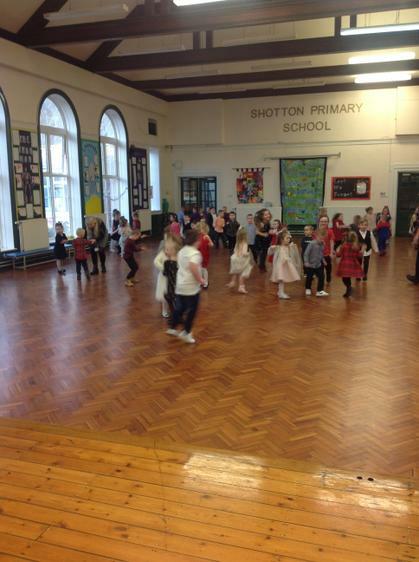 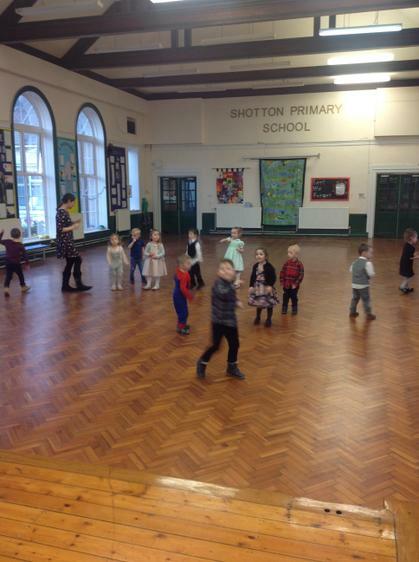 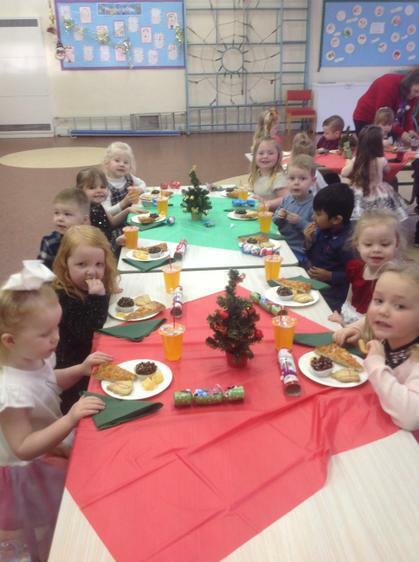 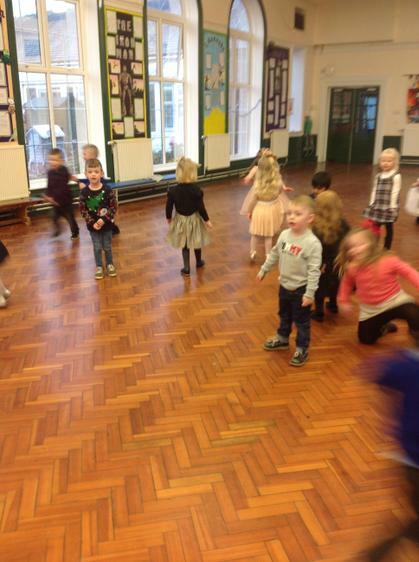 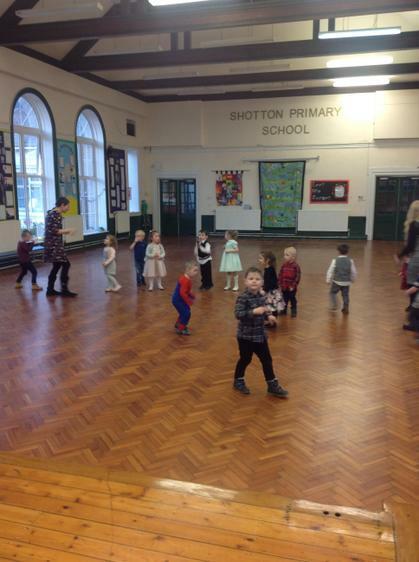 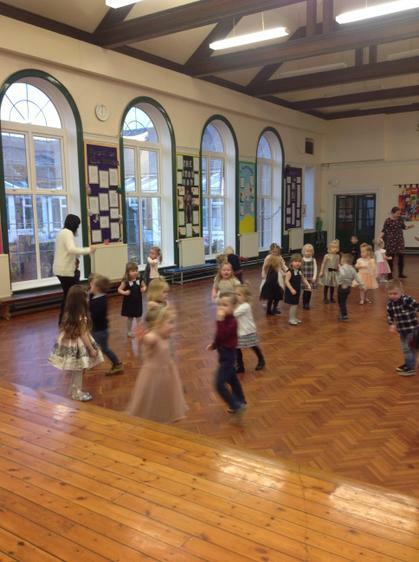 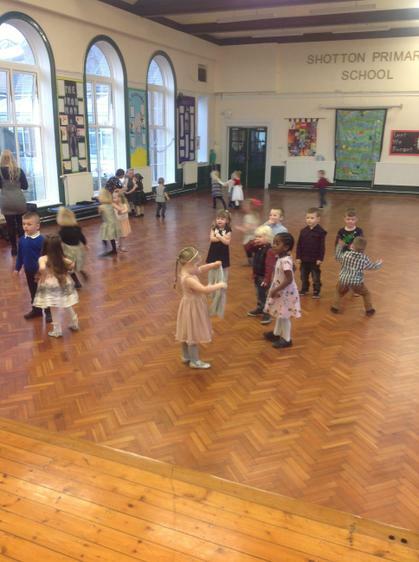 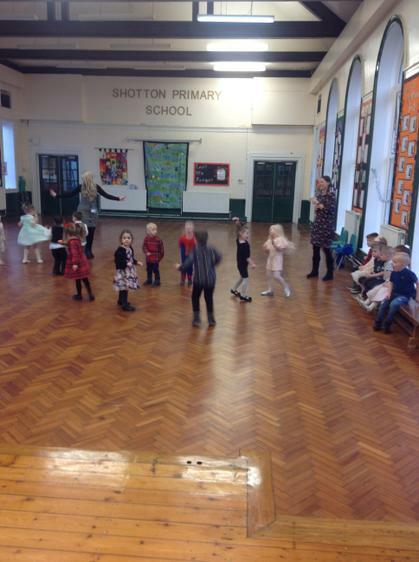 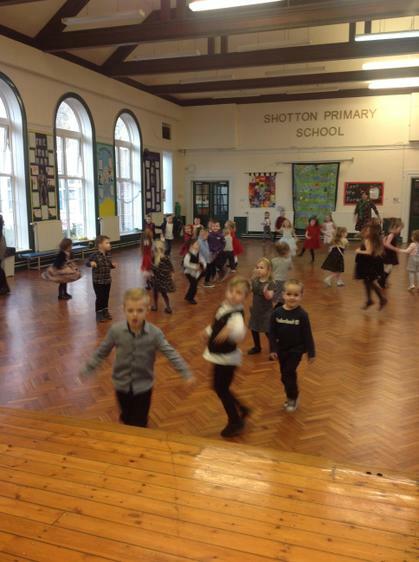 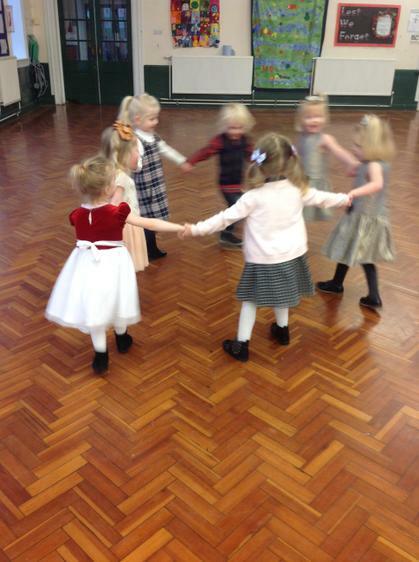 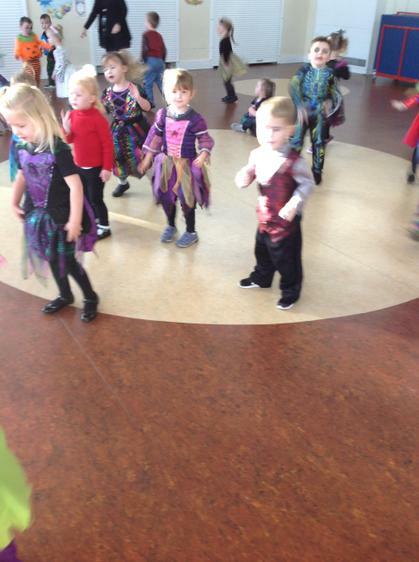 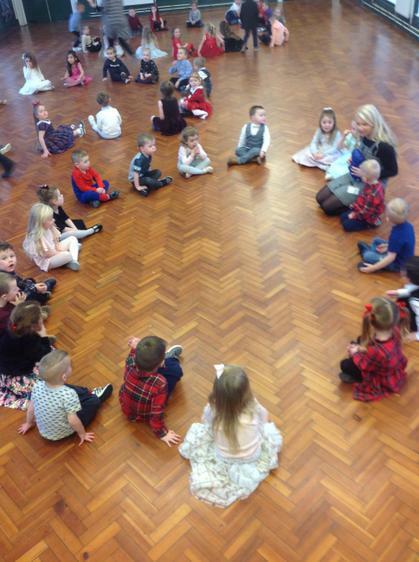 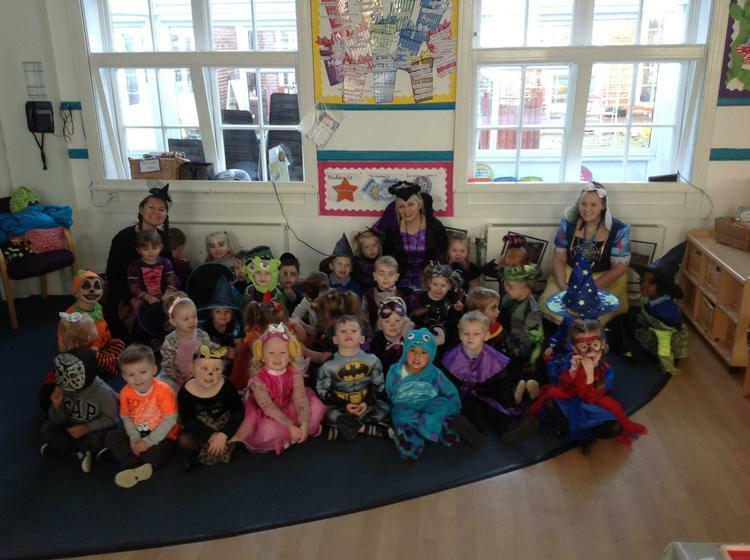 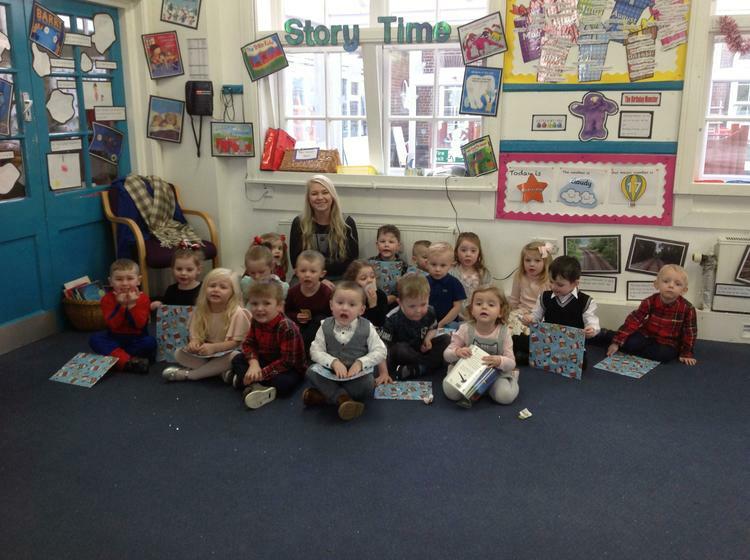 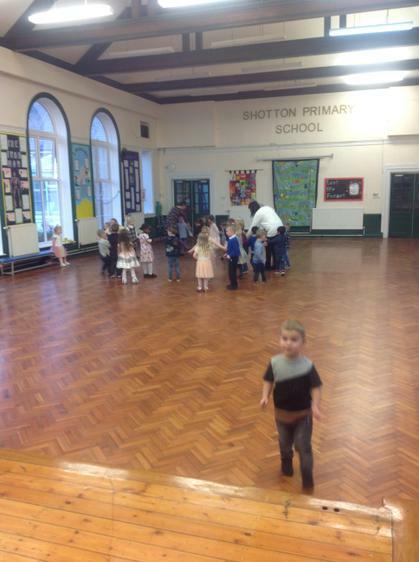 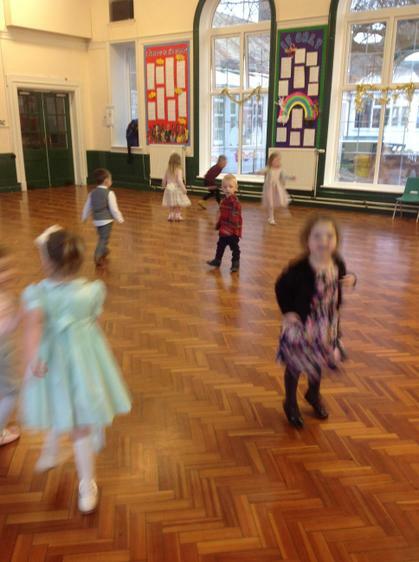 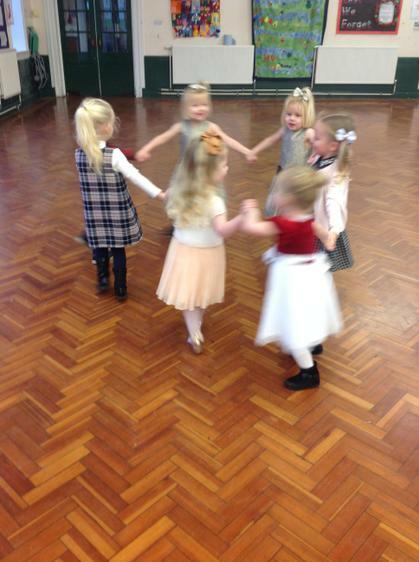 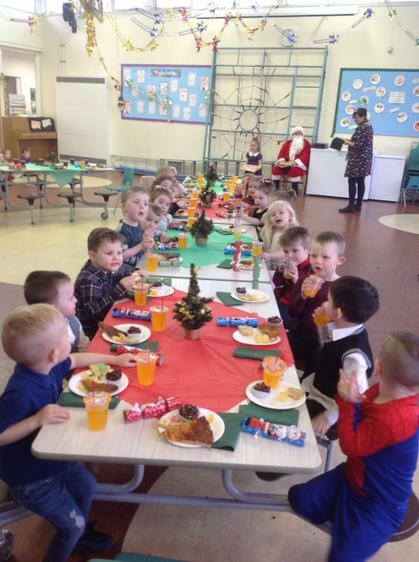 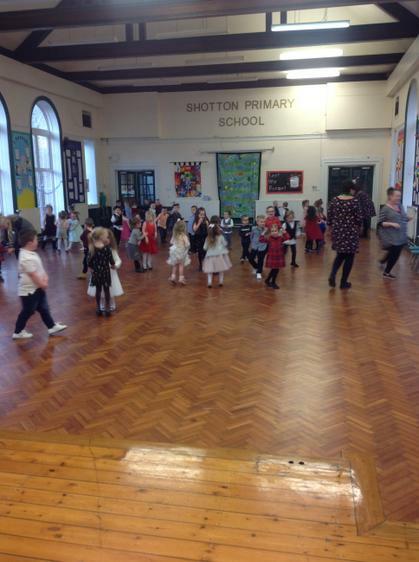 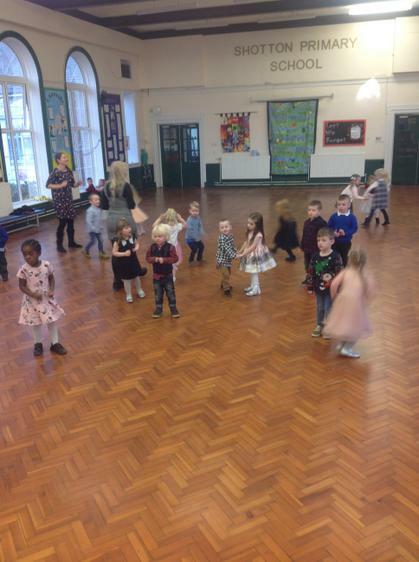 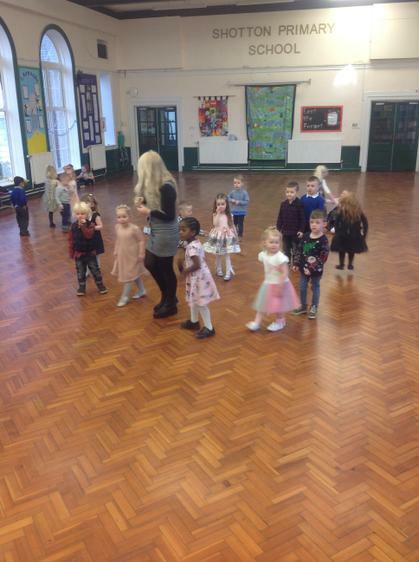 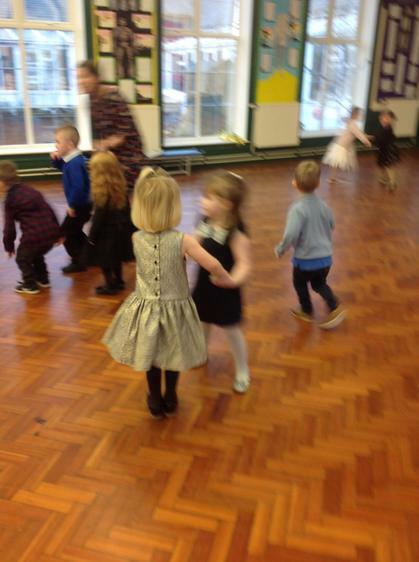 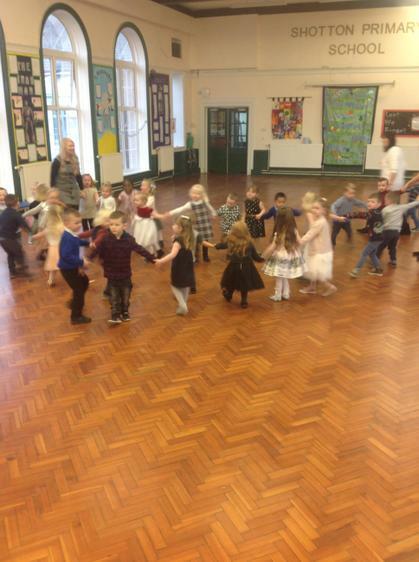 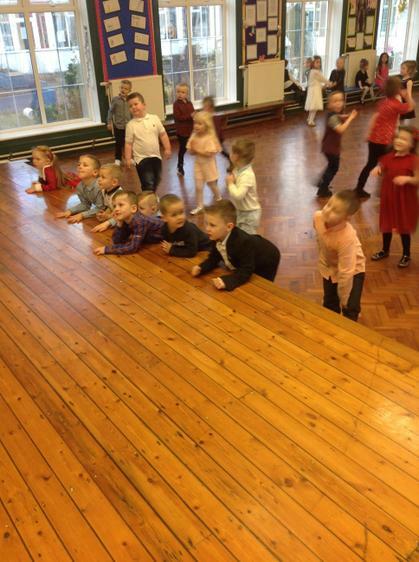 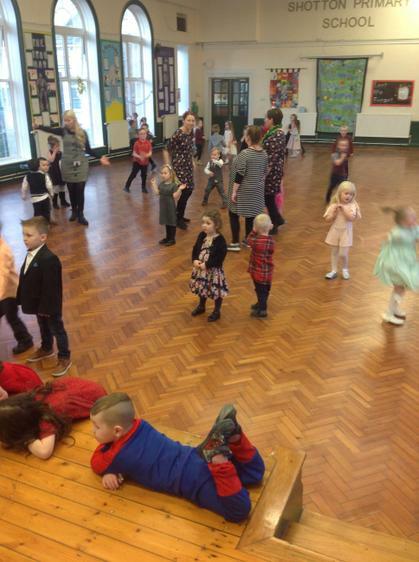 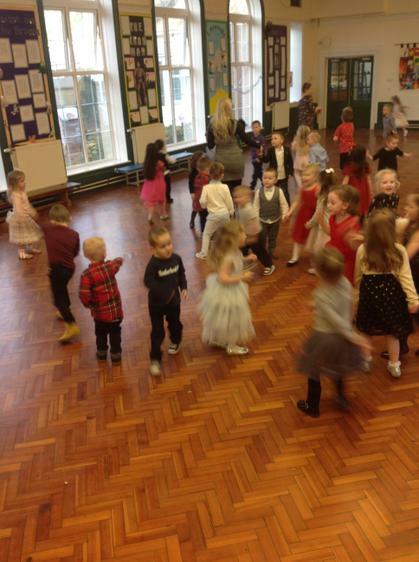 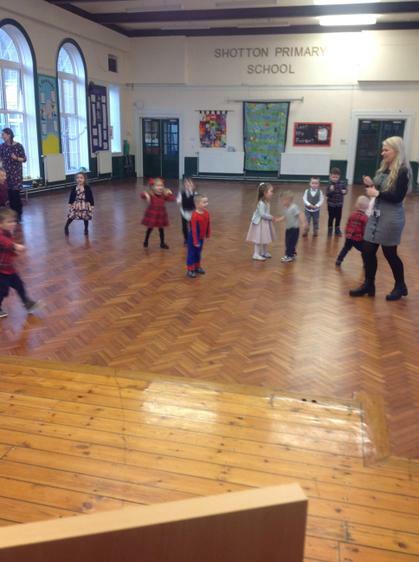 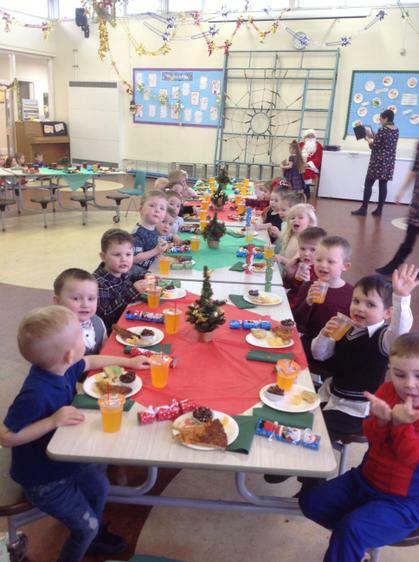 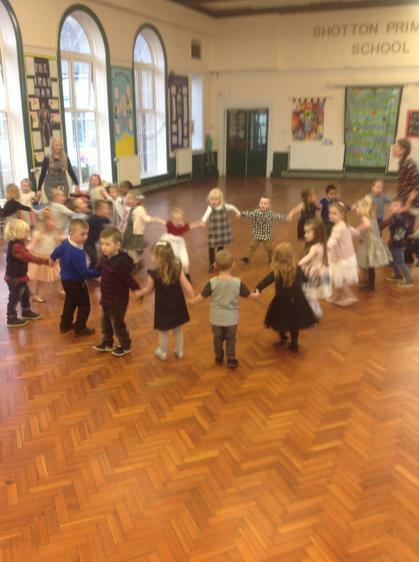 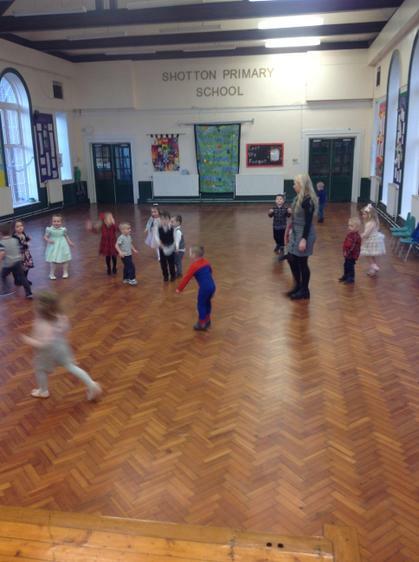 The children looked fantastic for our party and were definitely dressed to impress! 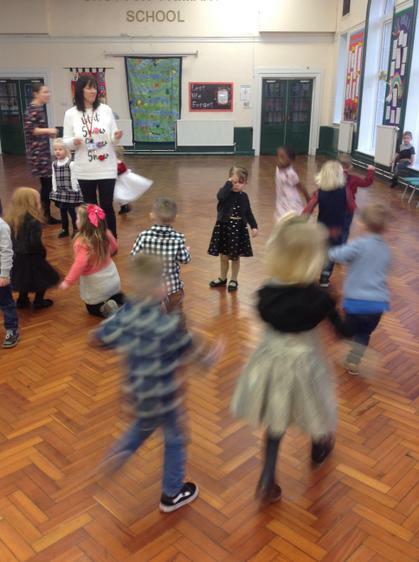 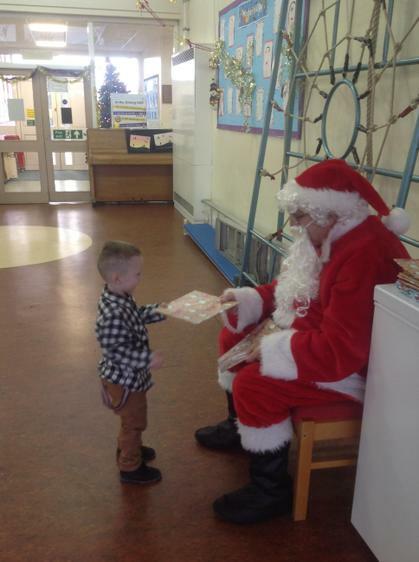 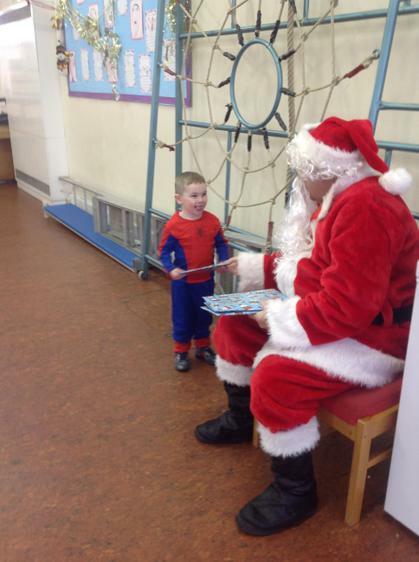 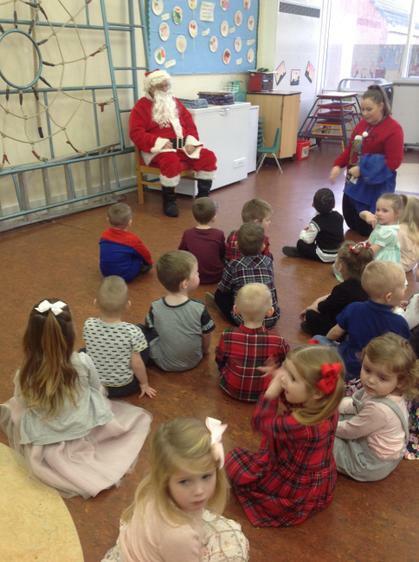 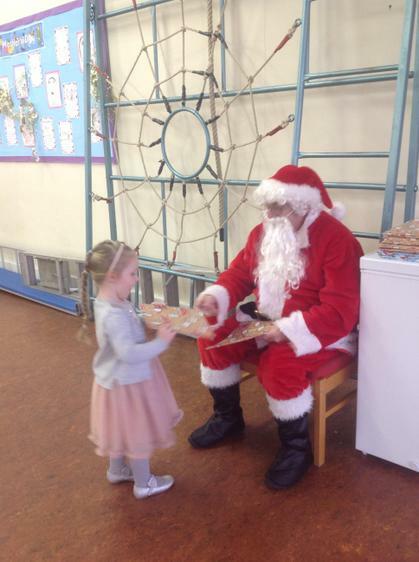 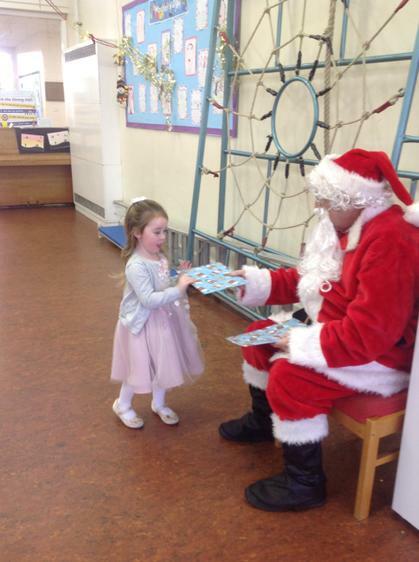 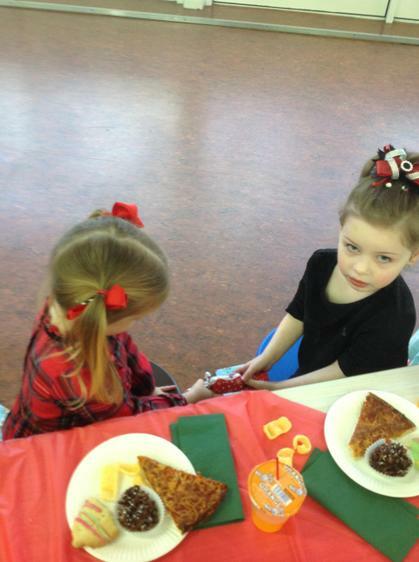 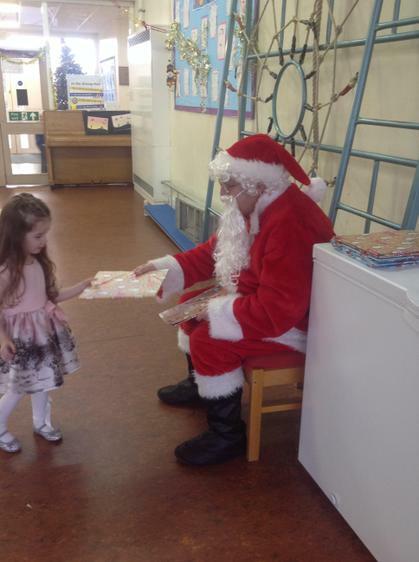 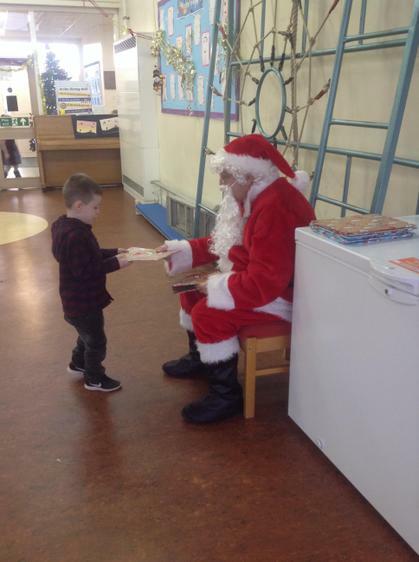 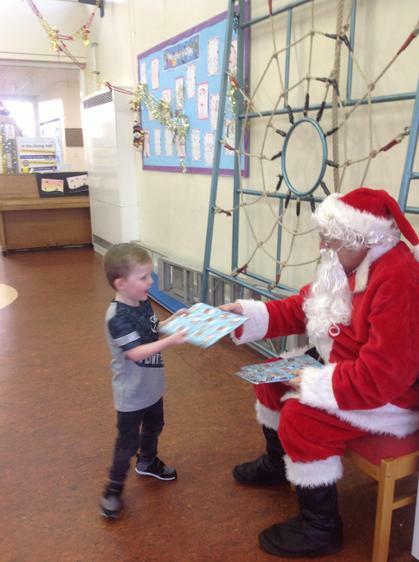 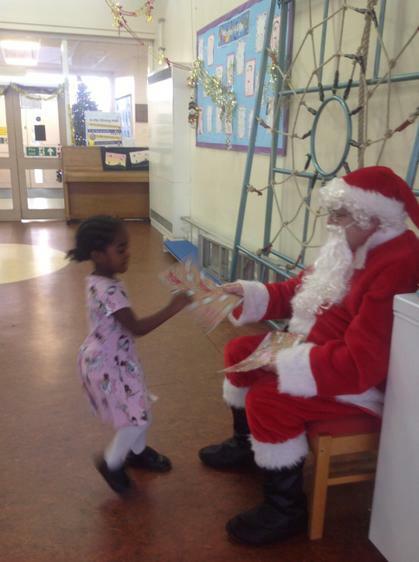 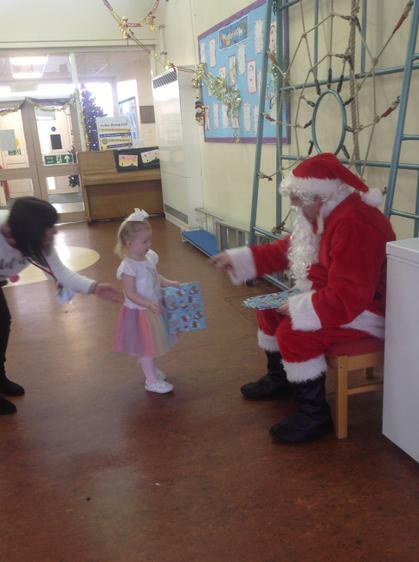 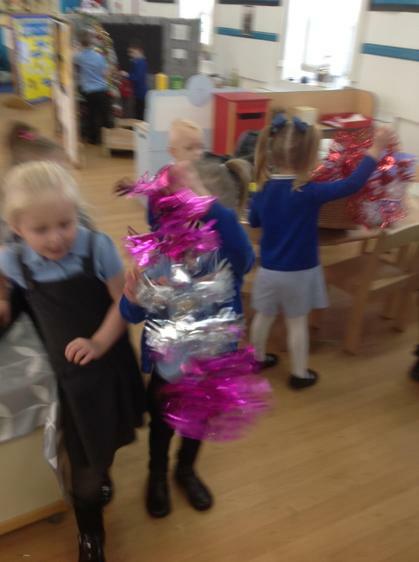 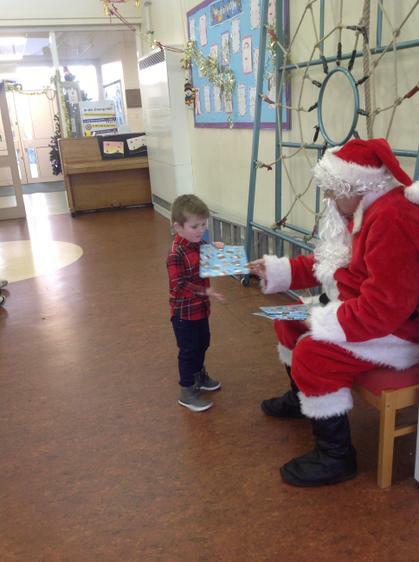 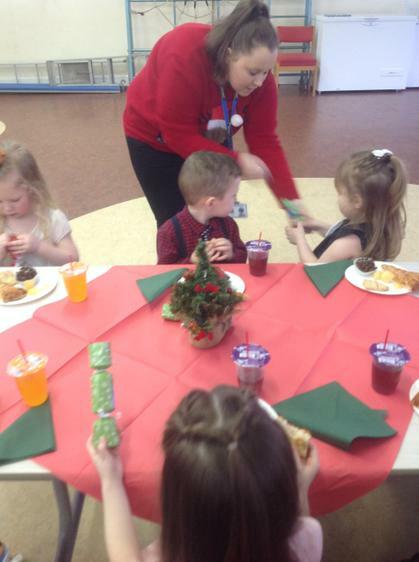 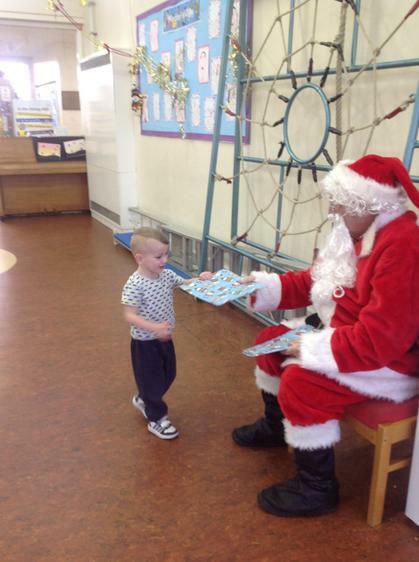 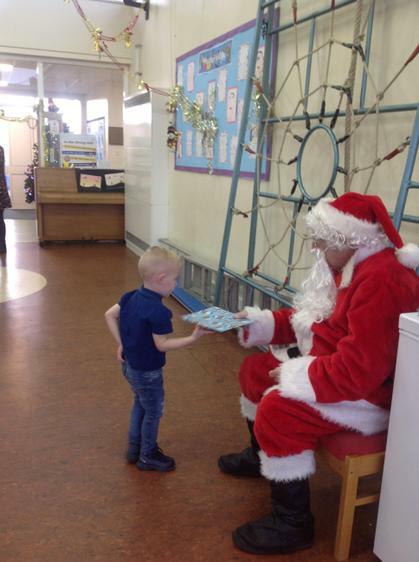 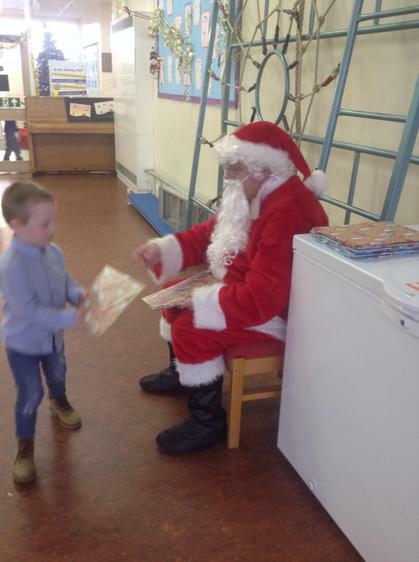 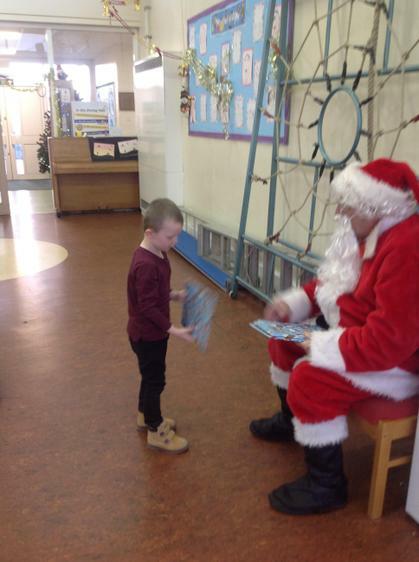 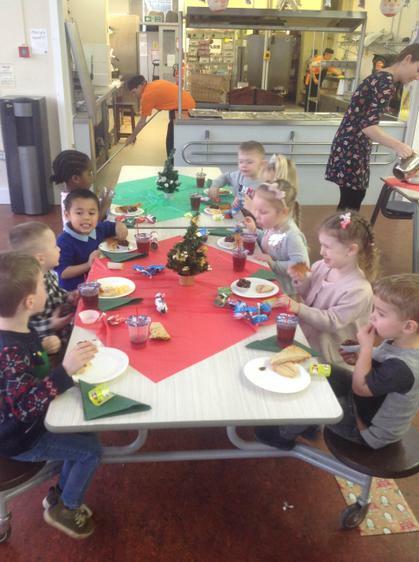 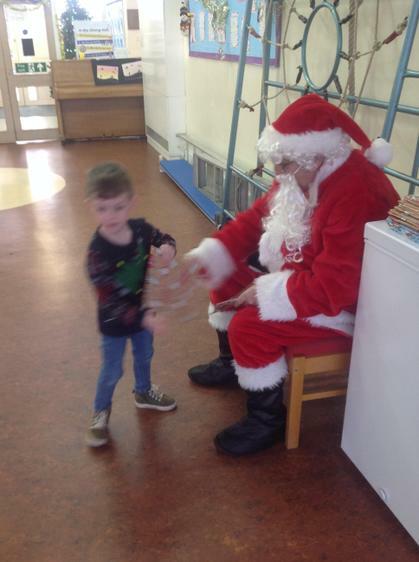 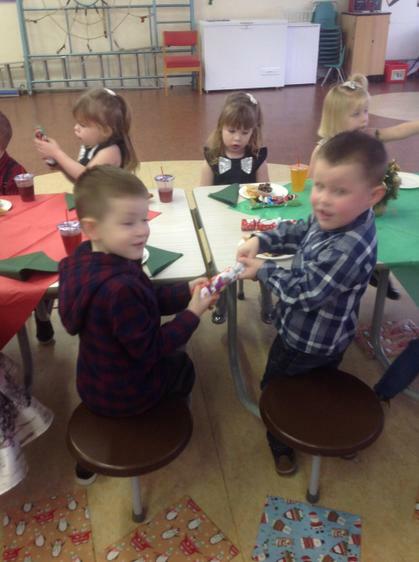 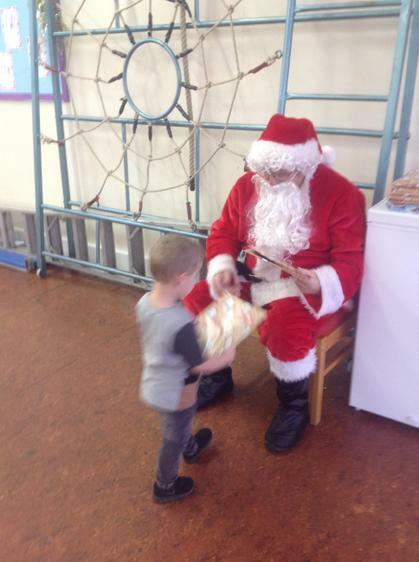 We had an amazing time at our Christmas party yesterday. 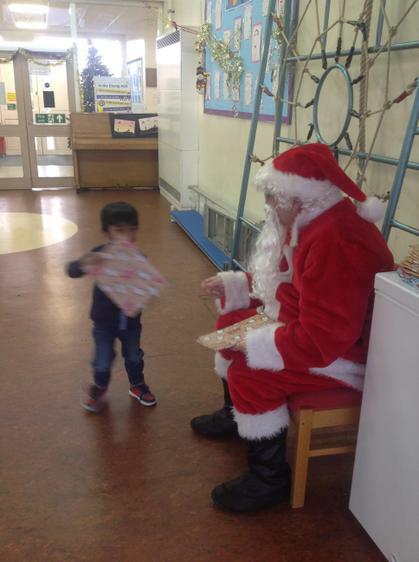 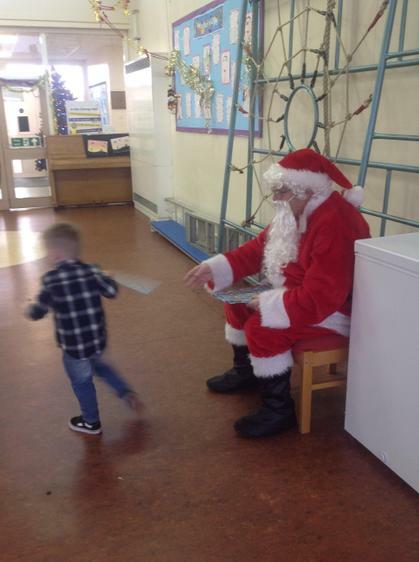 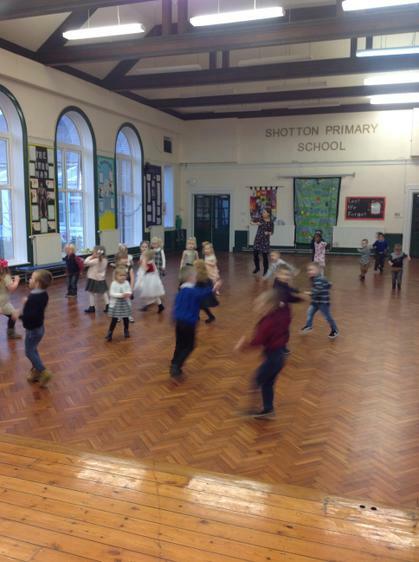 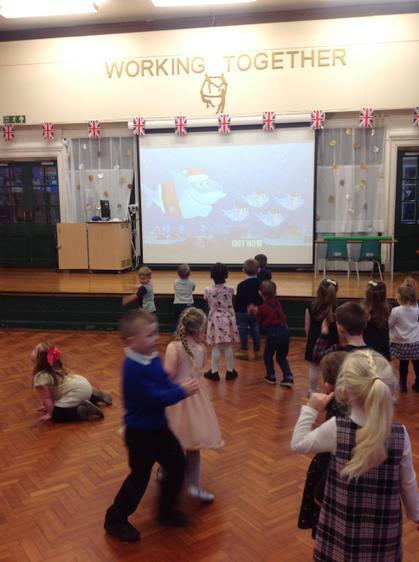 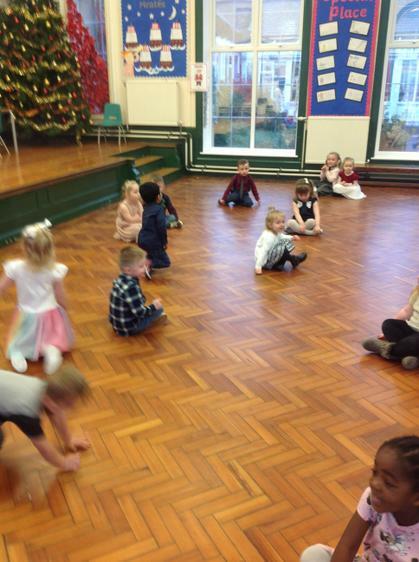 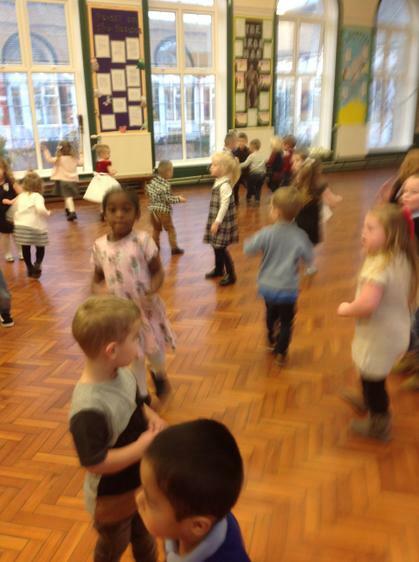 We all danced our hearts out and played some games before we went for some food and to meet SANTA! 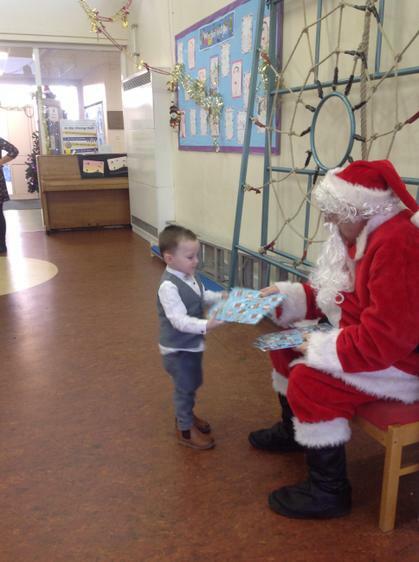 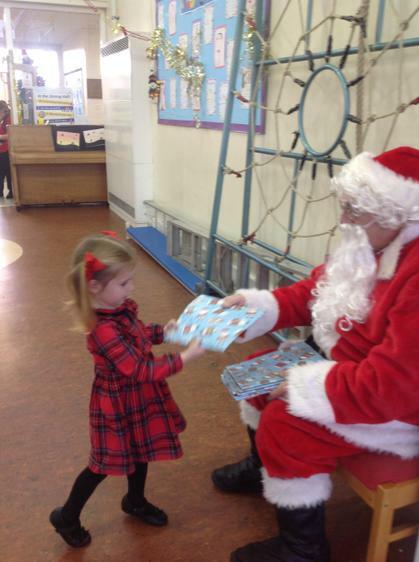 Santa even brought us all a present which was so kind! 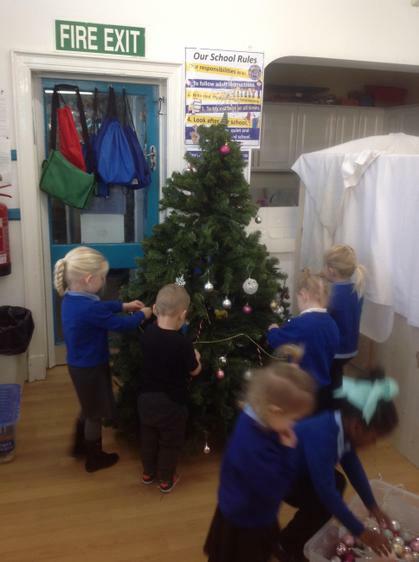 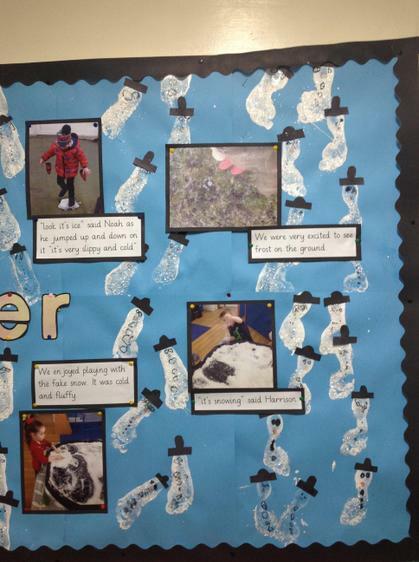 The children love snowmen so we decided to change our seasonal board to winter and make some snowmen using our feet for the background. 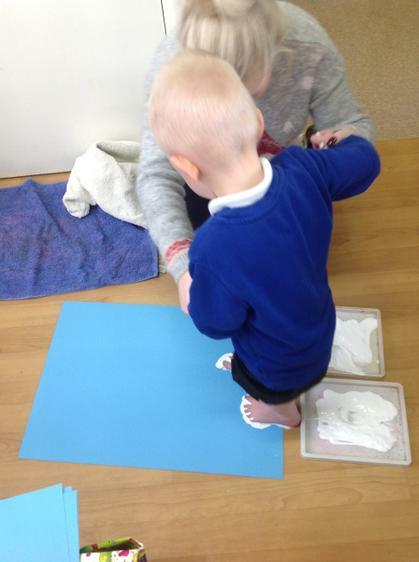 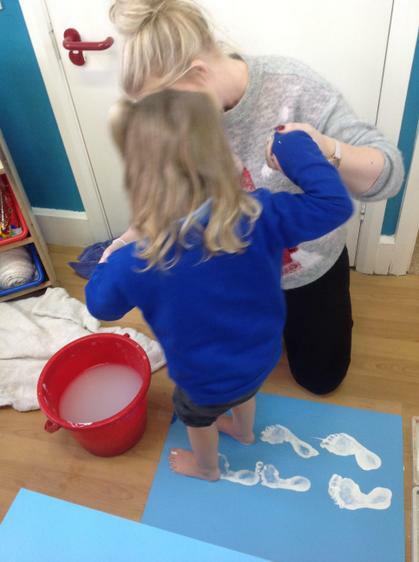 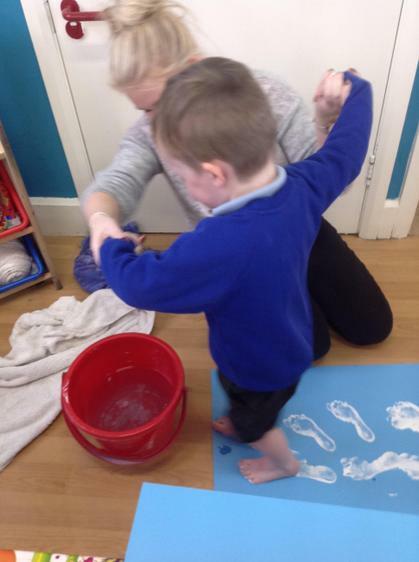 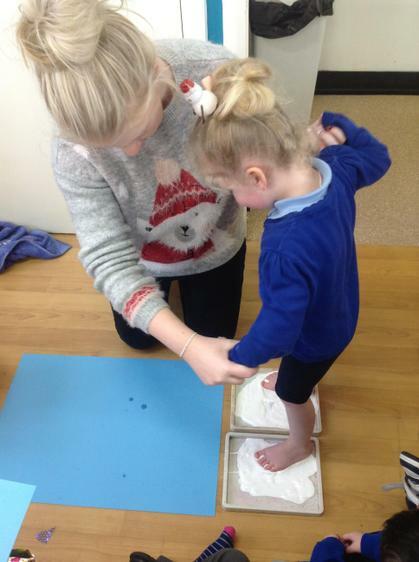 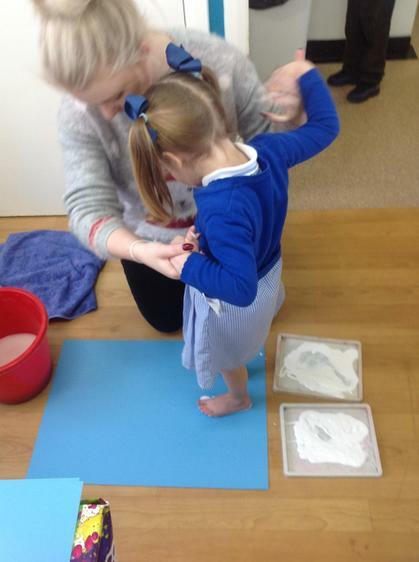 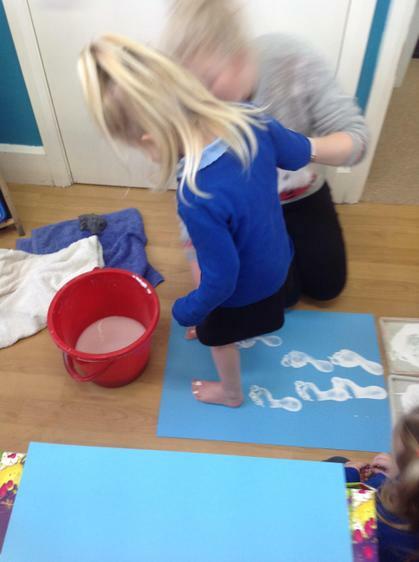 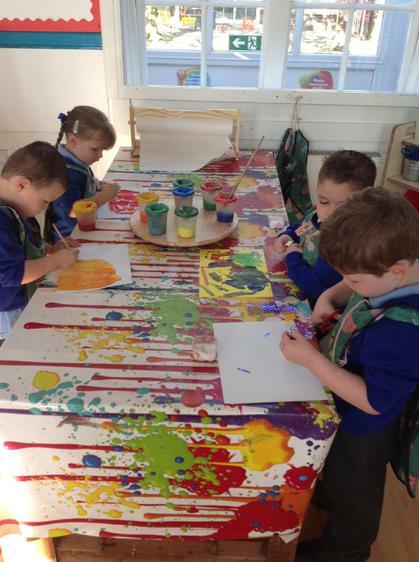 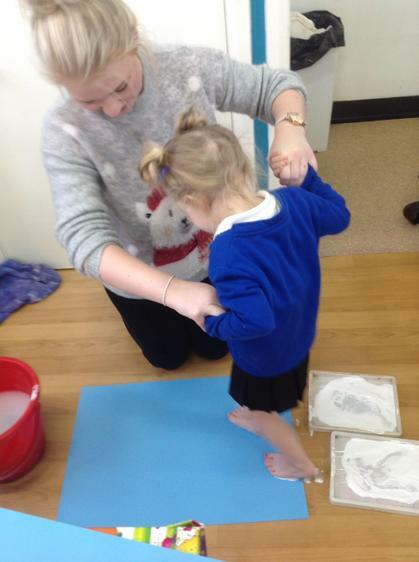 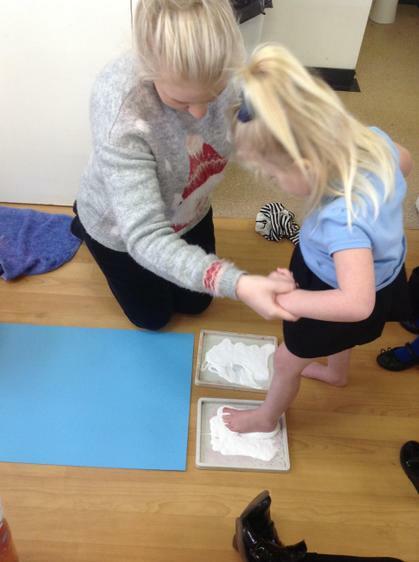 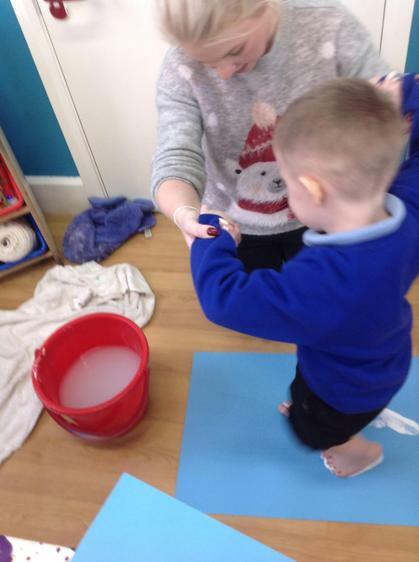 Some of the children had lots of fun painting with our feet and others were a bit unsure. 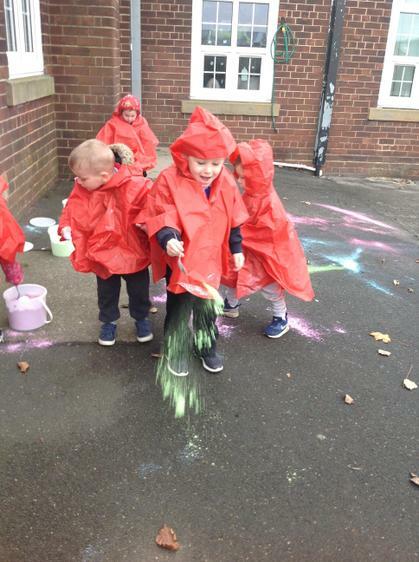 It's fun to get messy! 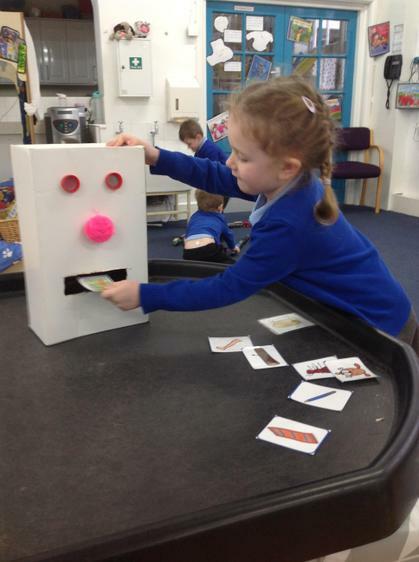 Once they dried we stuck on a hat and drew on some eyes, buttons and a nose. 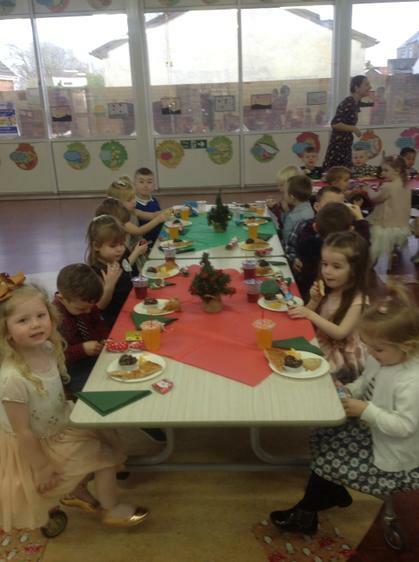 They look fabulous! 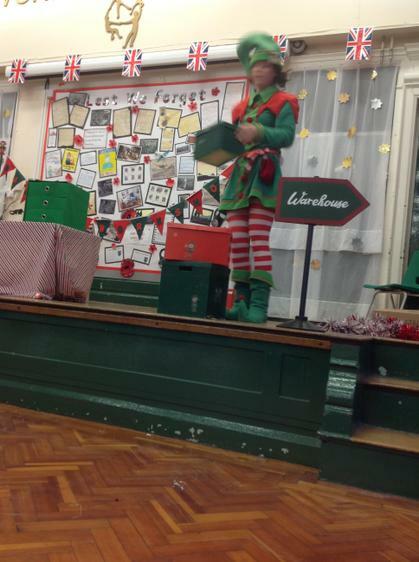 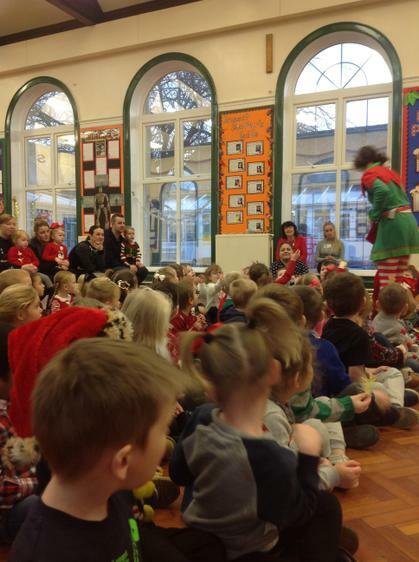 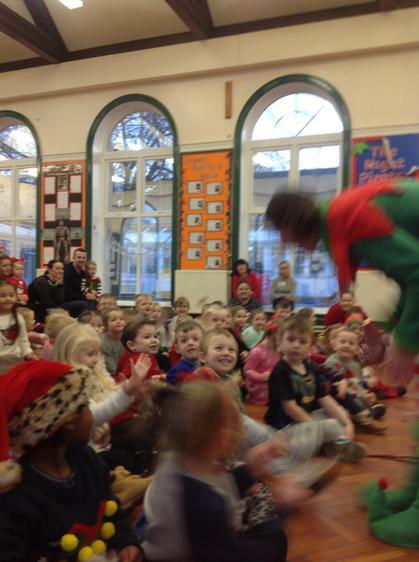 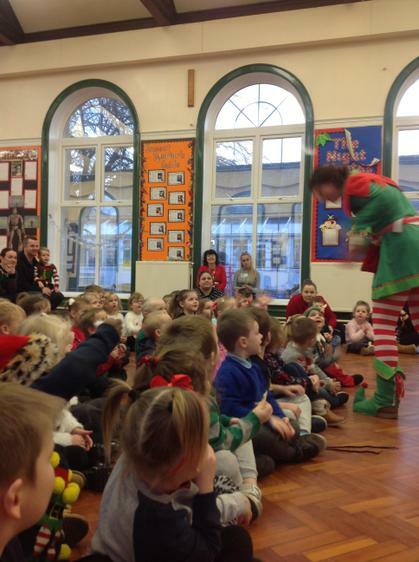 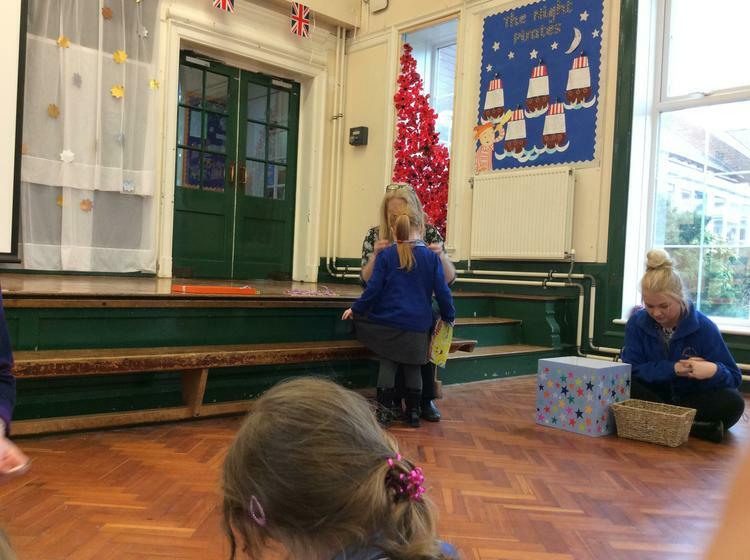 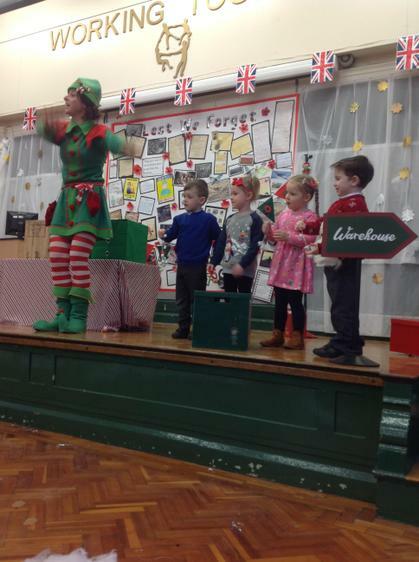 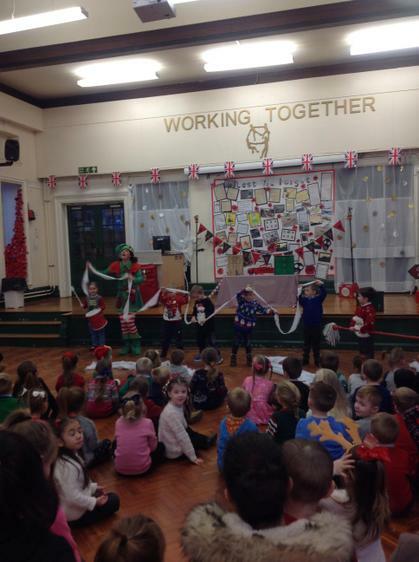 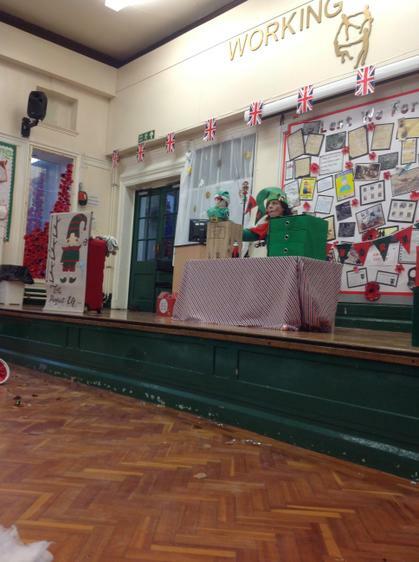 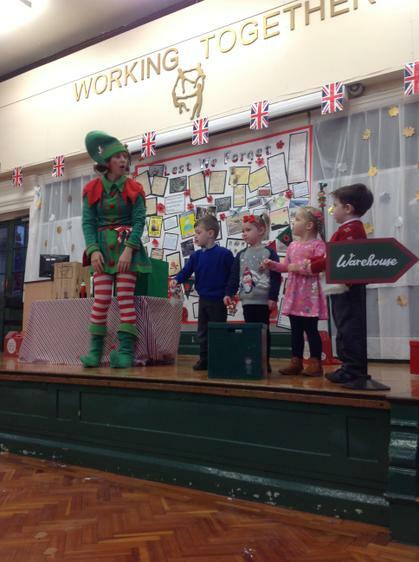 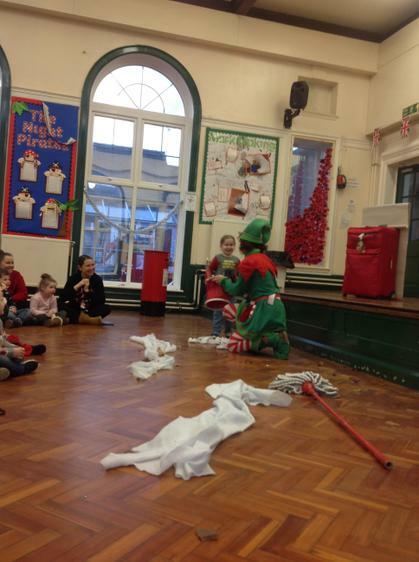 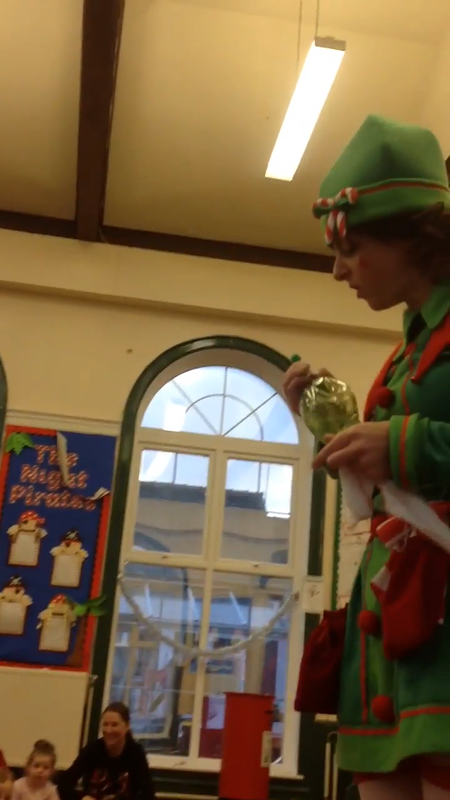 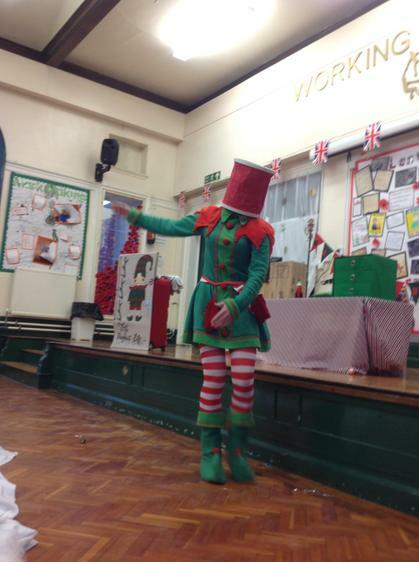 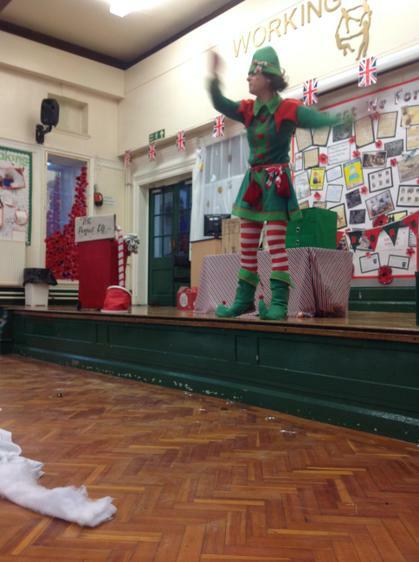 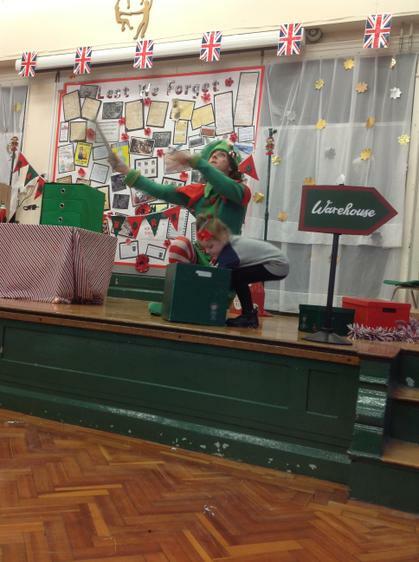 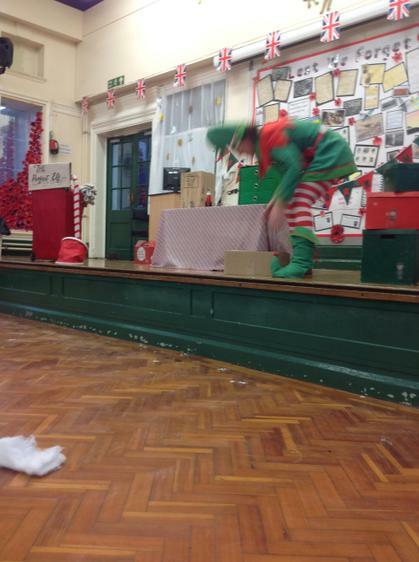 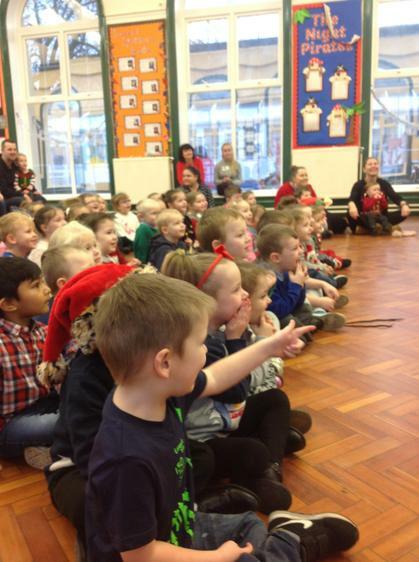 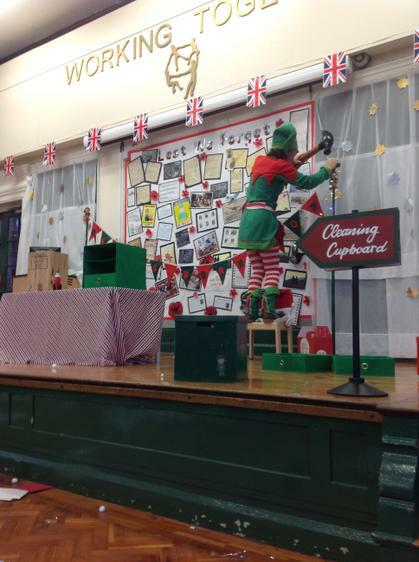 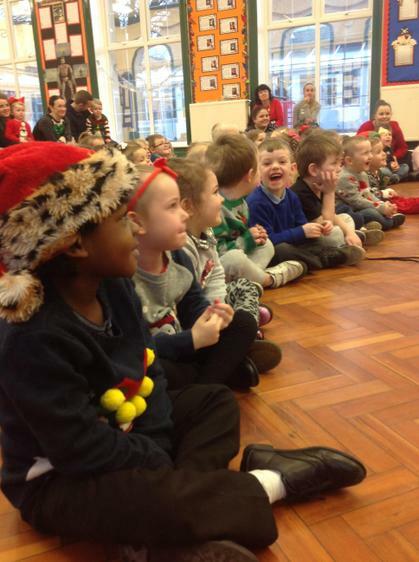 The children had great fun at the pantomime with Effie the Clumsy Elf! 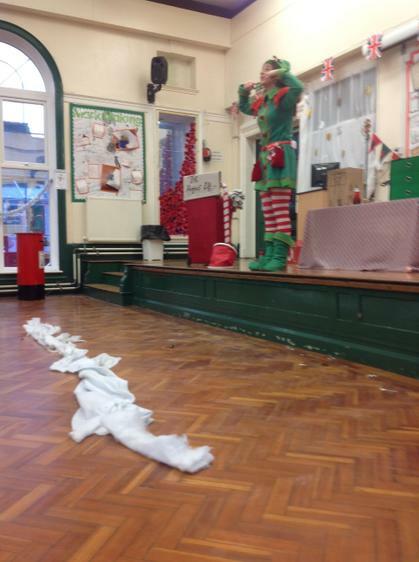 She made lots of mess and made us laugh a lot. 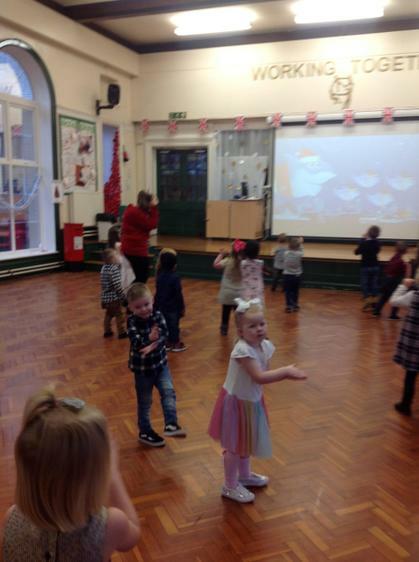 Her songs were amazing and we got to join in singing and dancing! 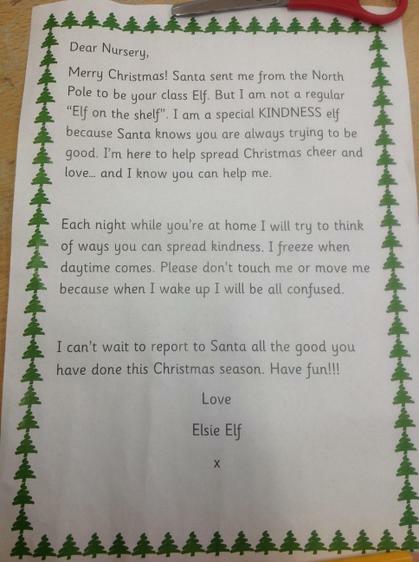 Effie ended up saving Christmas because she found santas keys!! 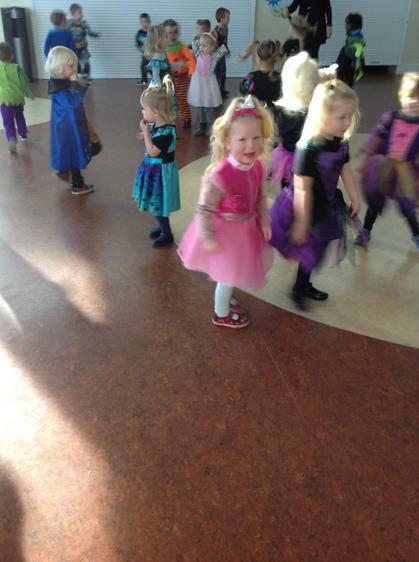 Yeyyyy! 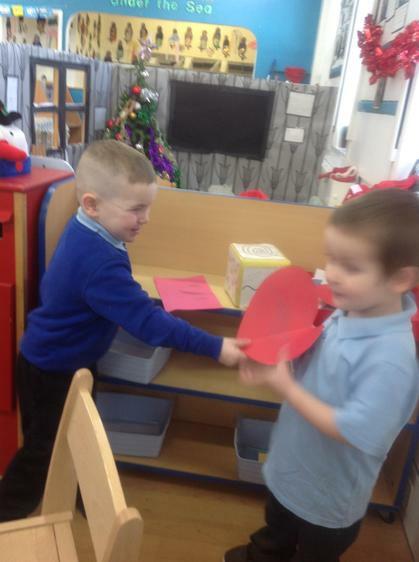 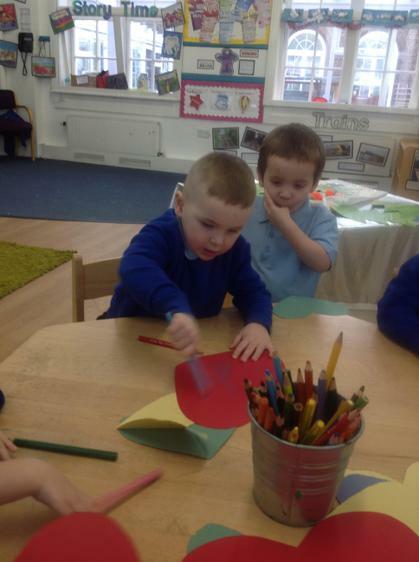 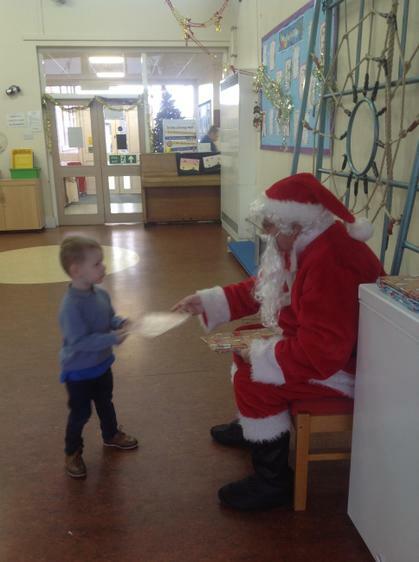 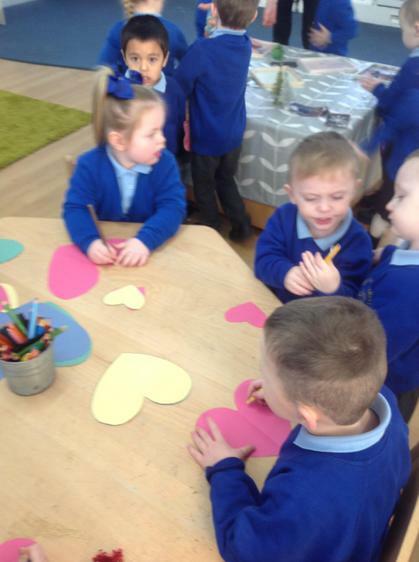 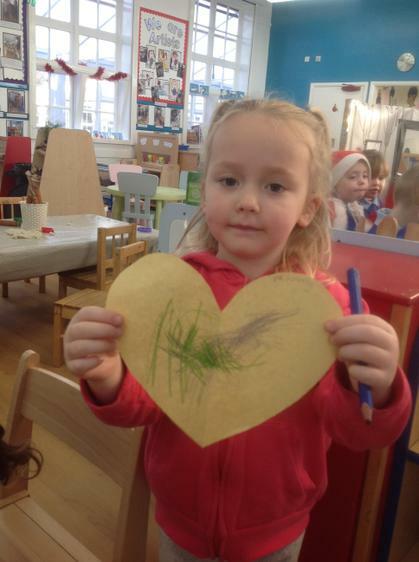 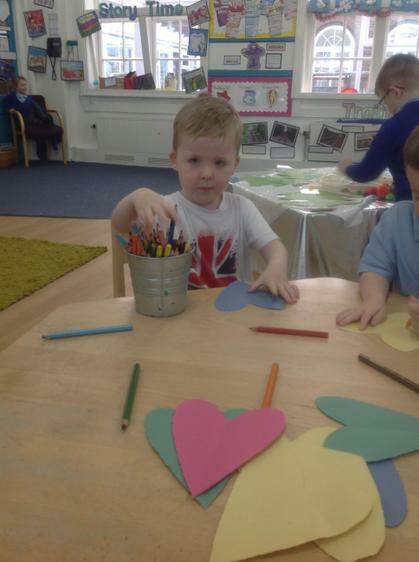 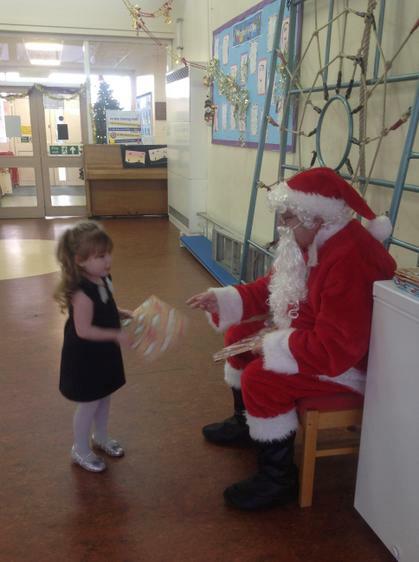 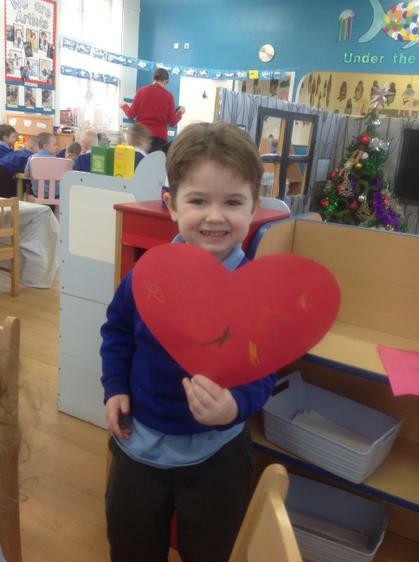 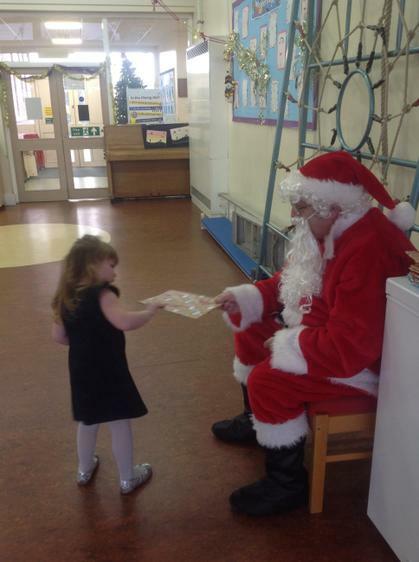 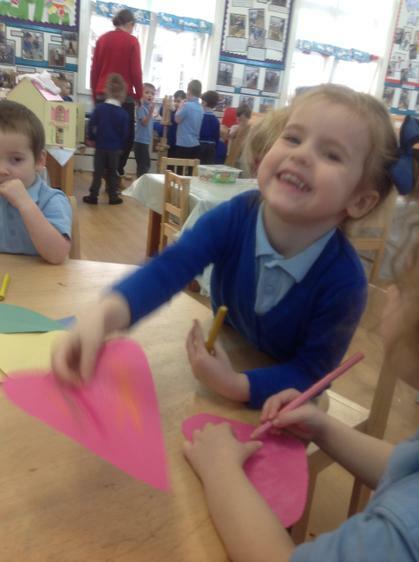 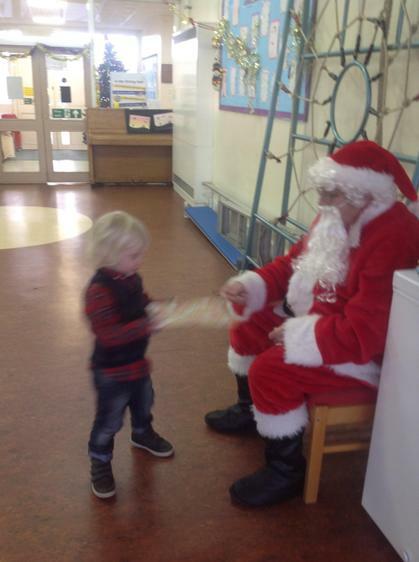 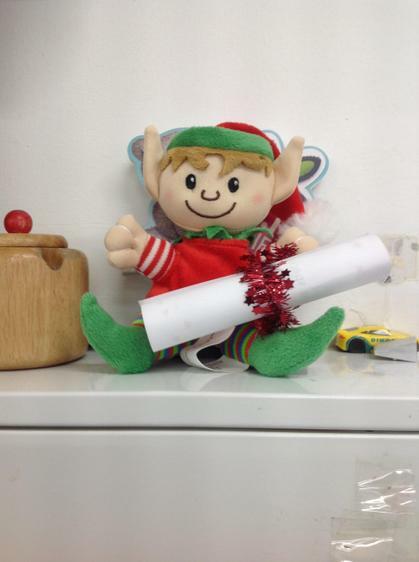 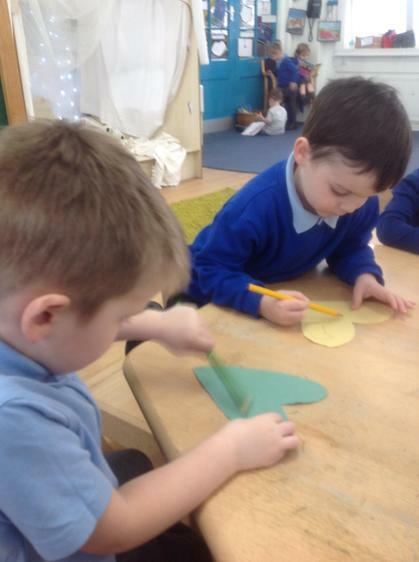 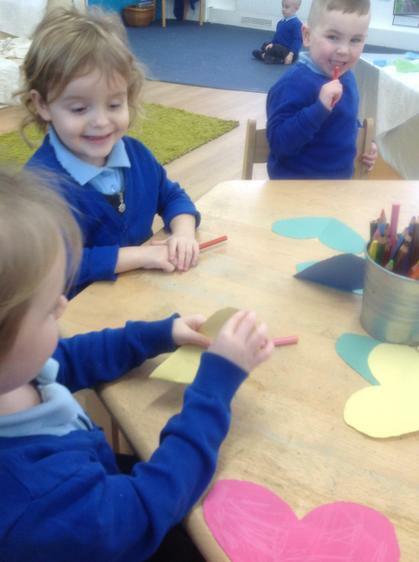 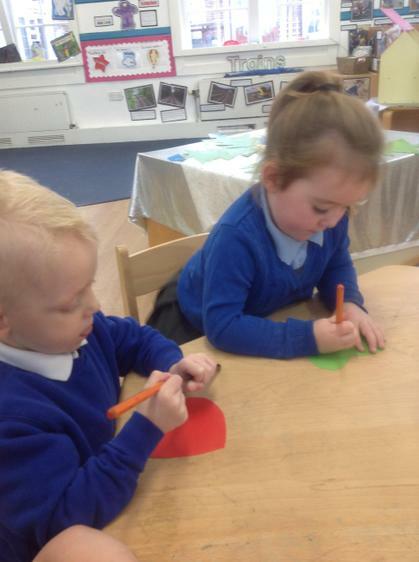 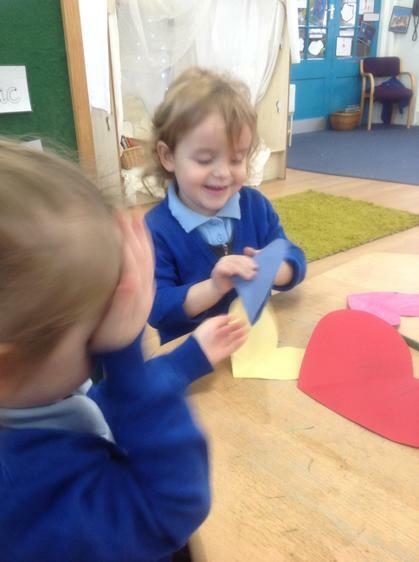 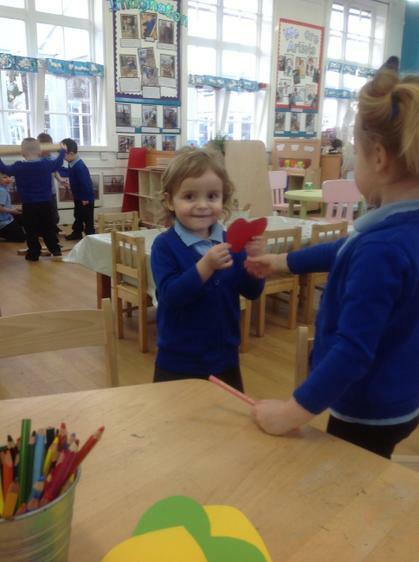 The Kindness Elf came to visit Nursery and left us some lovely heart shaped paper in different colours. 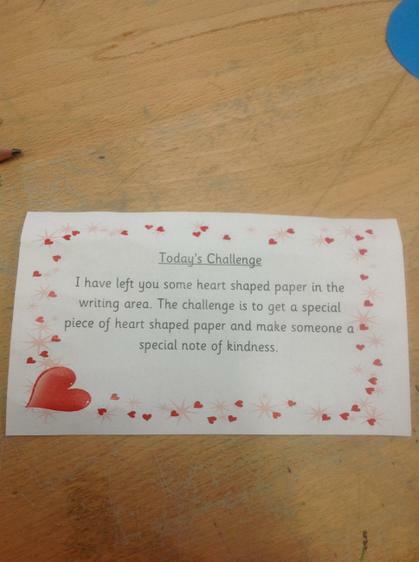 The Elf left us a special challenge to make a kindness heart for a friend or someone we love. 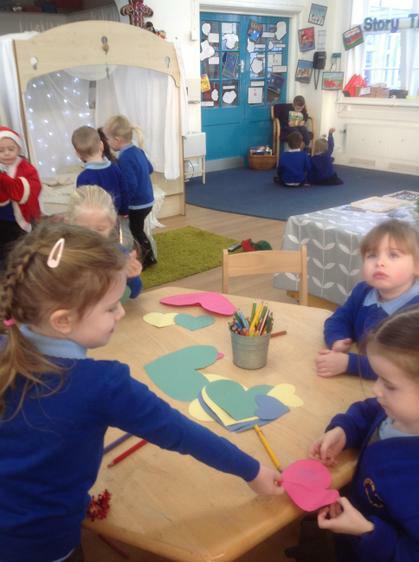 This started some lovely conversations on what is kindness and how we can be kind to our friends. 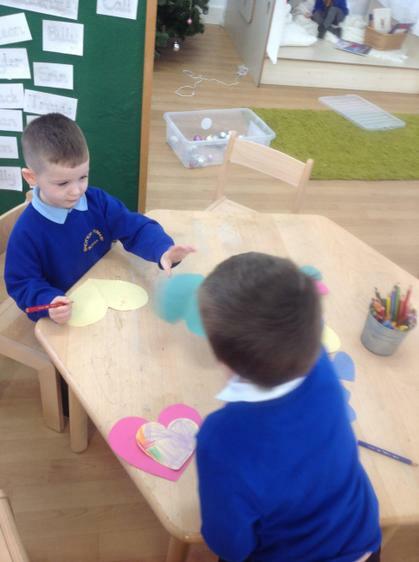 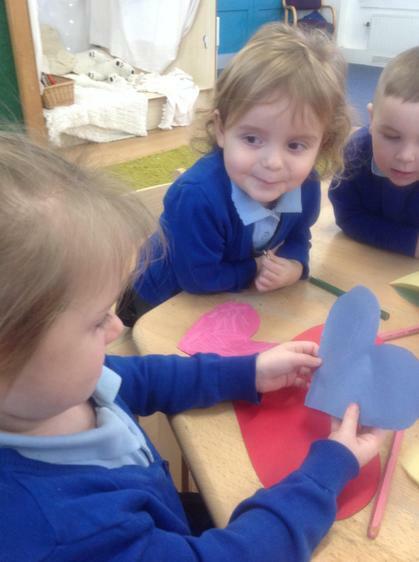 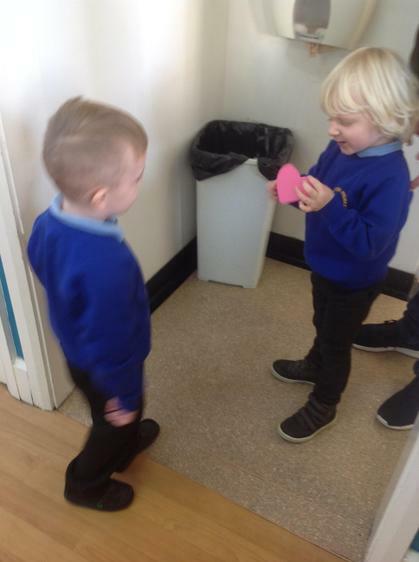 The children chose a heart and someone to make it for then the best bit came where we could give the heart to that special person. 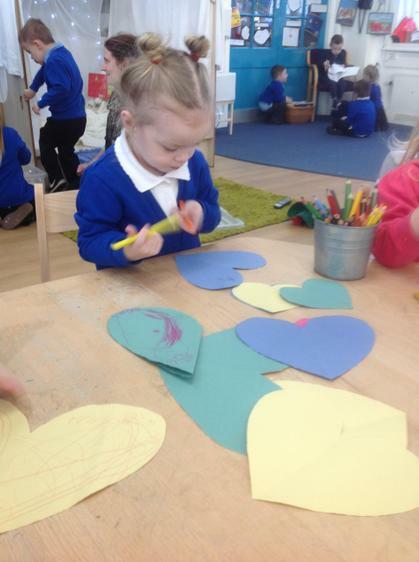 We had some lovely moments where children explained why they made that person the heart. 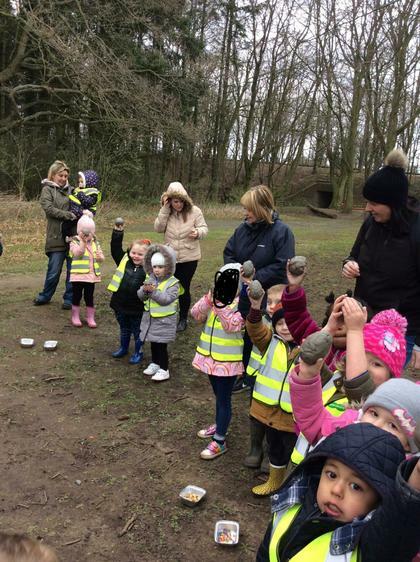 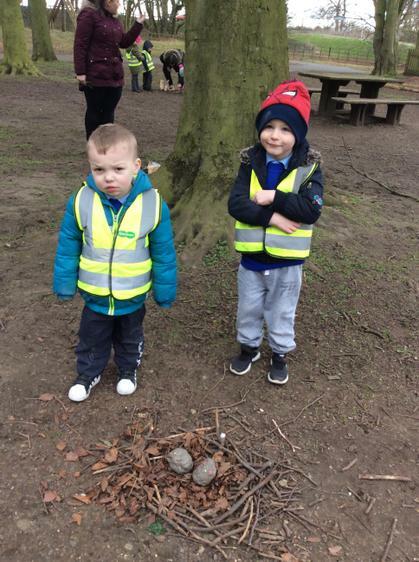 The children were concerned for the birds in the cold when we had made the nests that they would have no food. 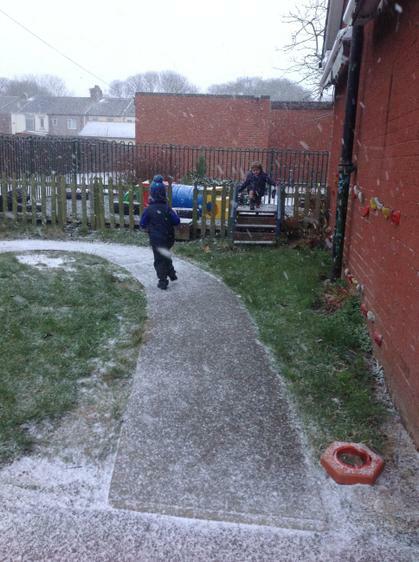 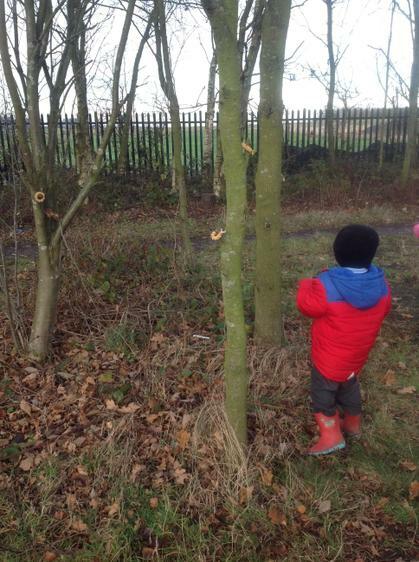 Following this we decided to make bird feeders with the children. 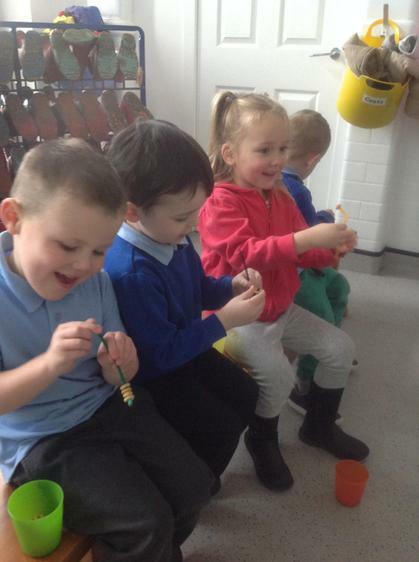 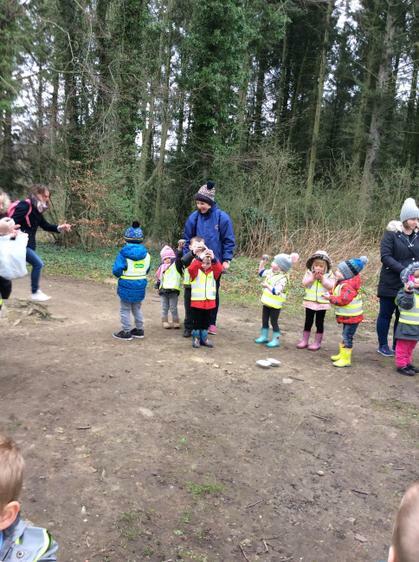 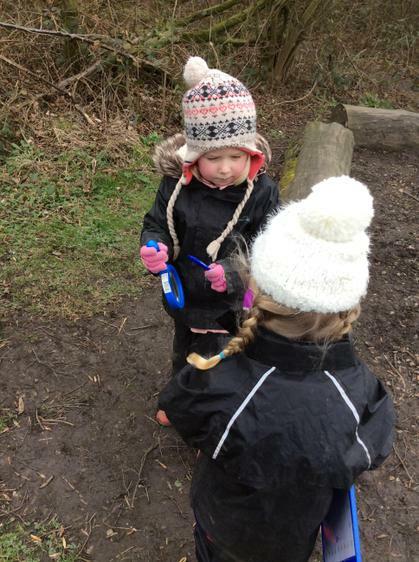 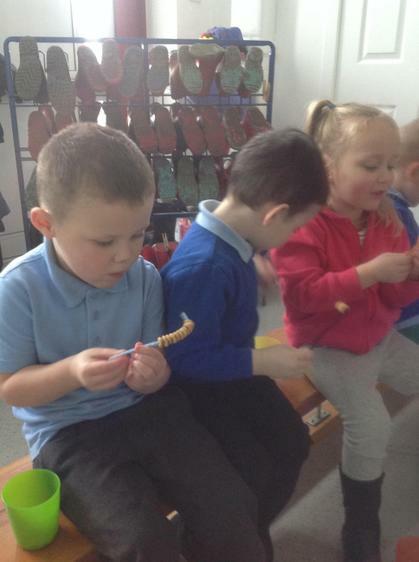 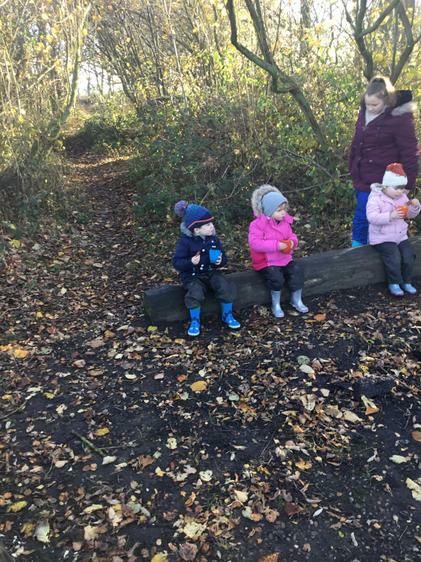 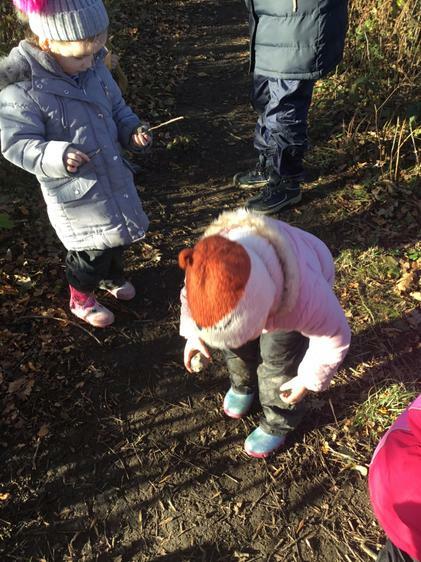 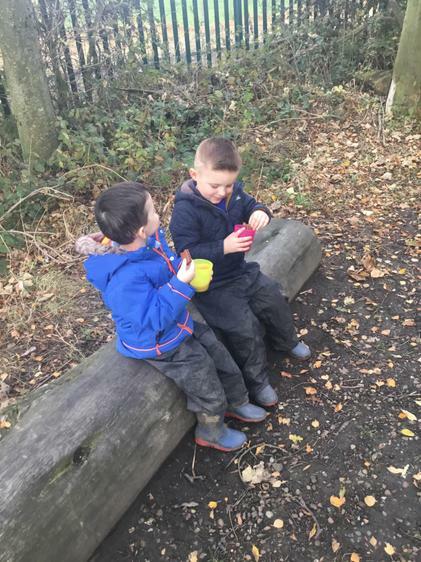 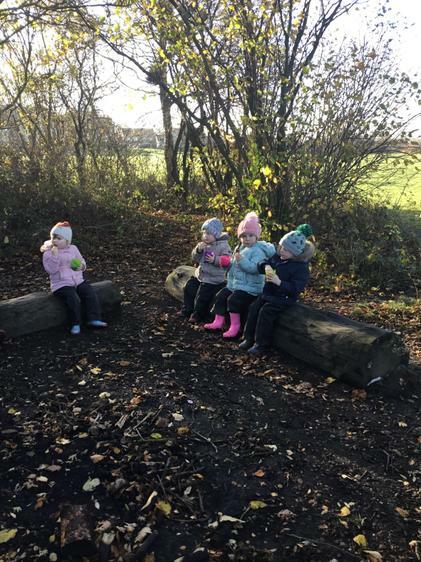 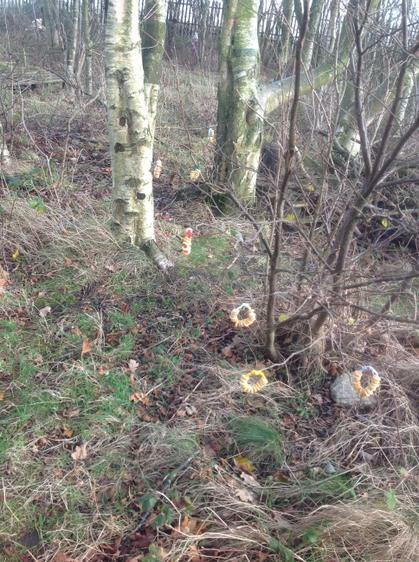 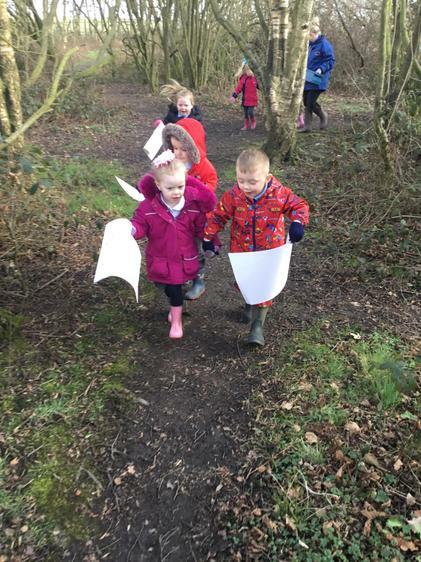 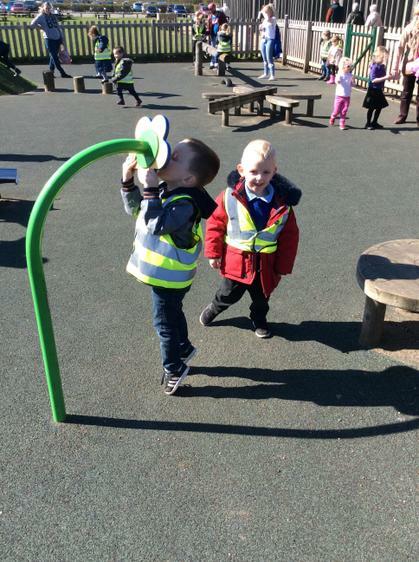 We treated cheerios onto pipe cleaners and went down to the woods to find the best pace to hang them! 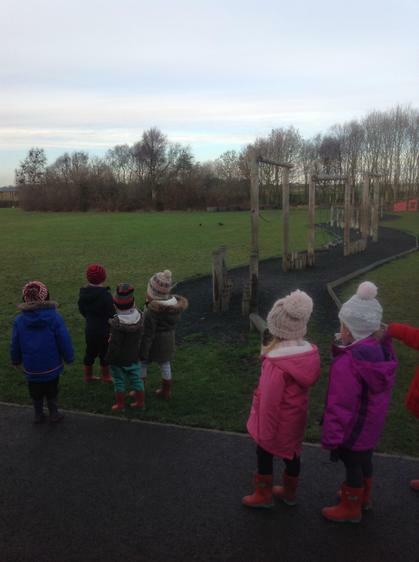 The children decided that near their nests would be the best place as the birds would see the food when they woke up. 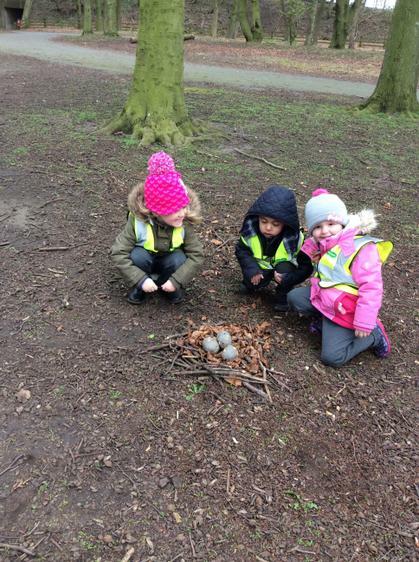 The children wanted to extend their individual nest making to working as a team to make a BIG nest. 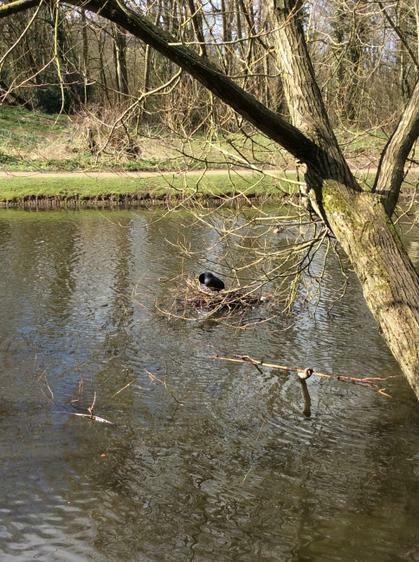 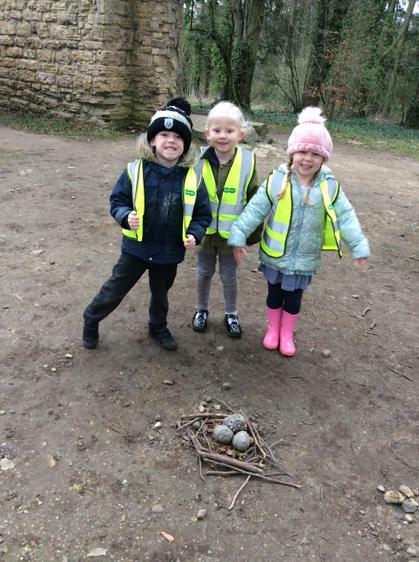 We searched for a good spot to make our nest so that whoever used our nest would be safe. 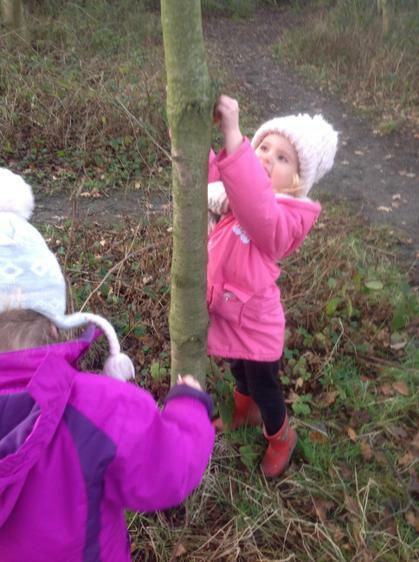 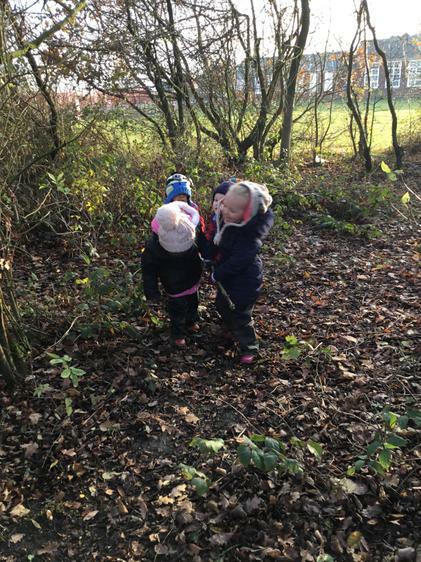 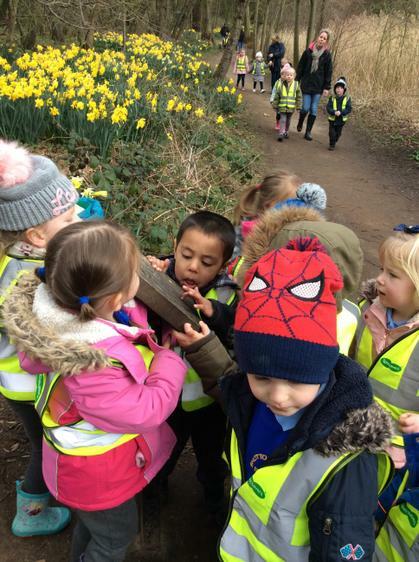 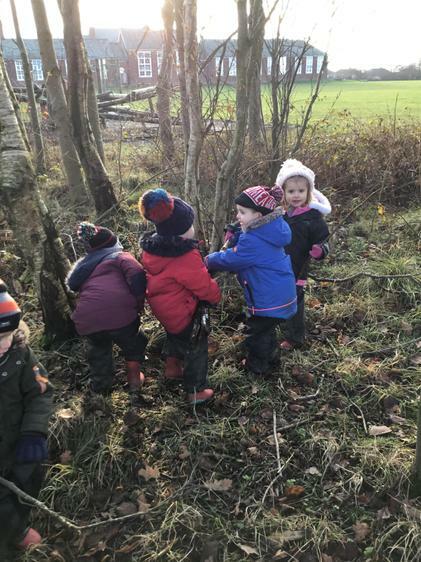 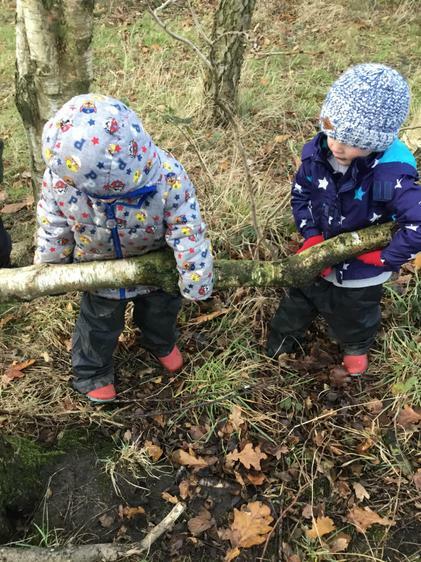 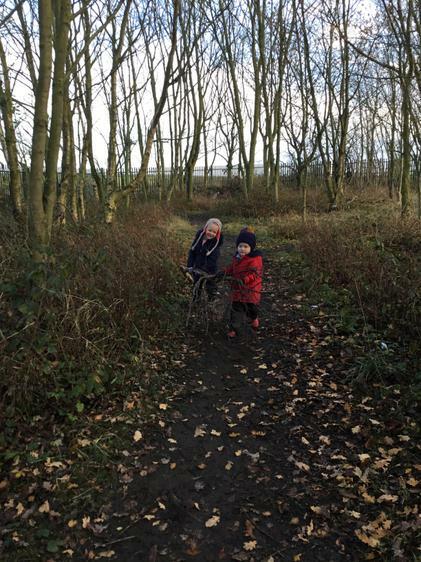 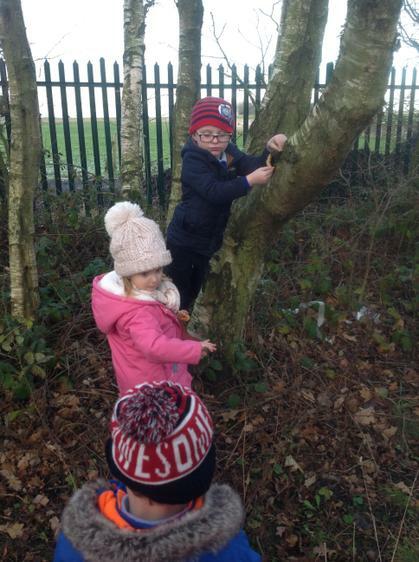 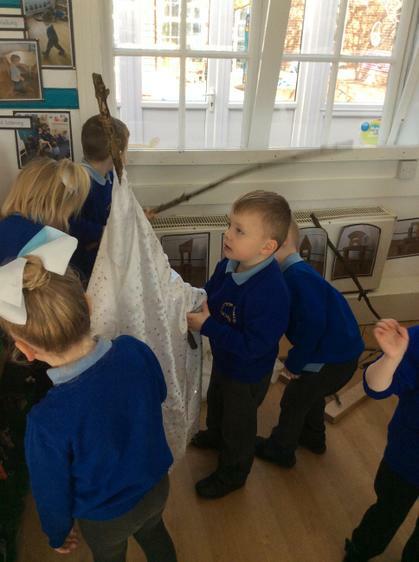 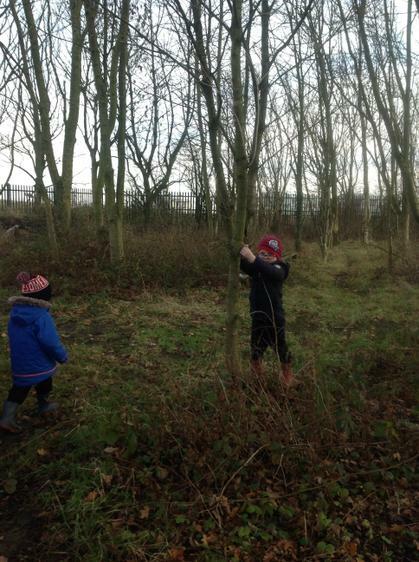 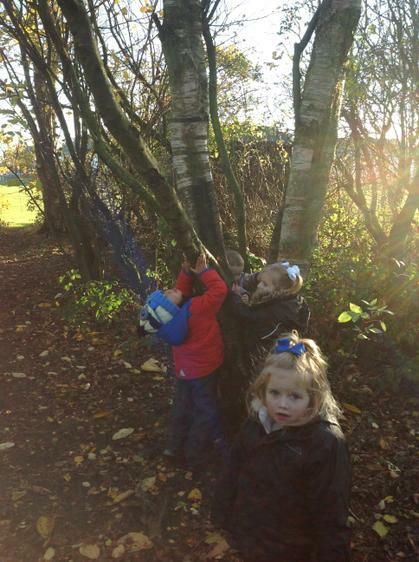 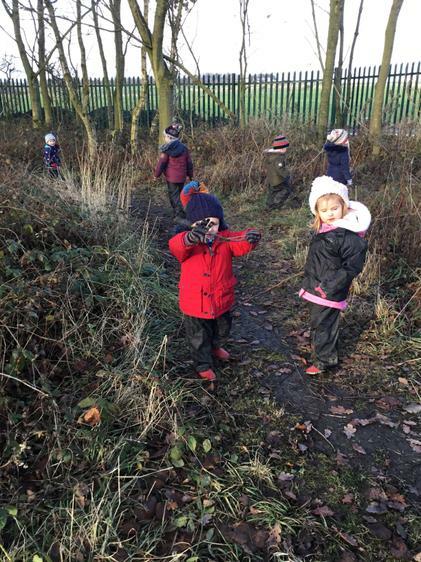 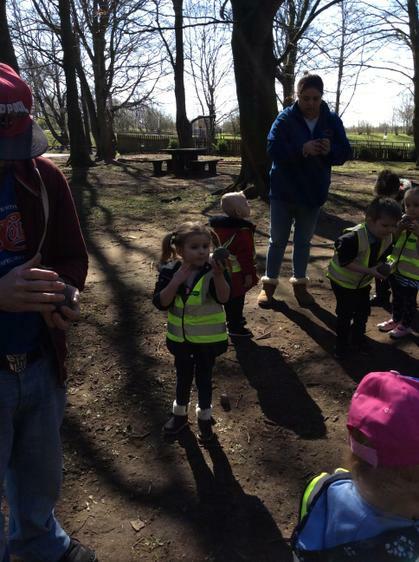 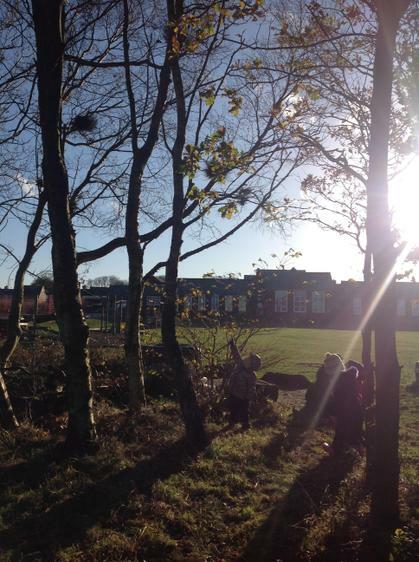 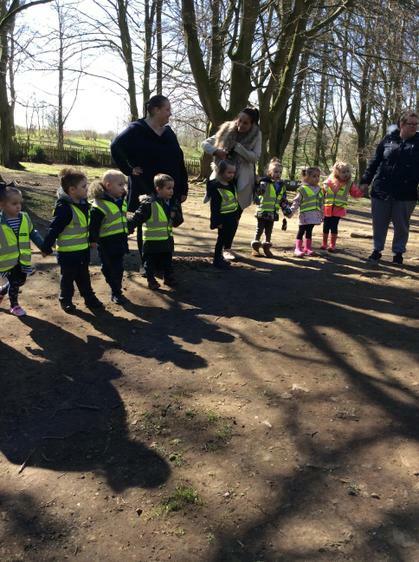 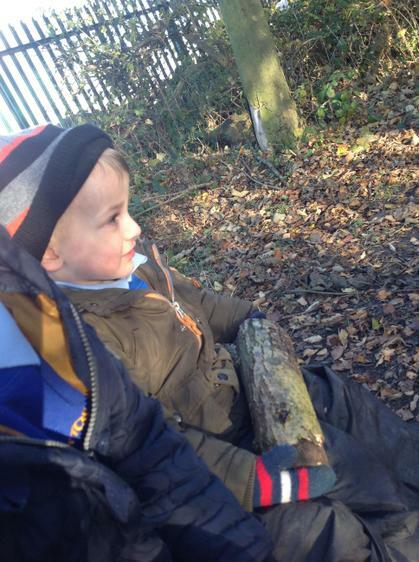 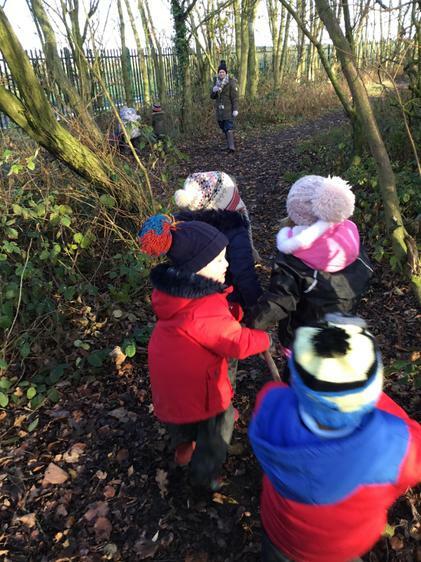 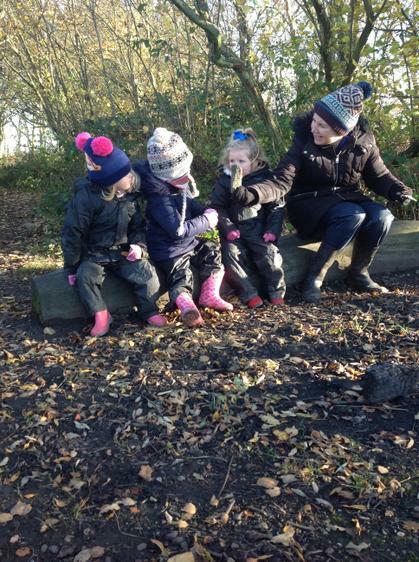 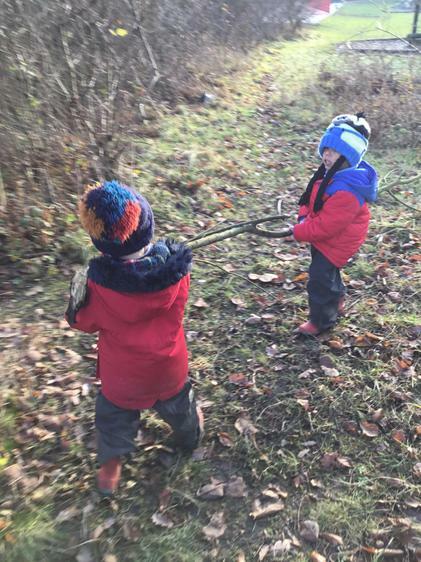 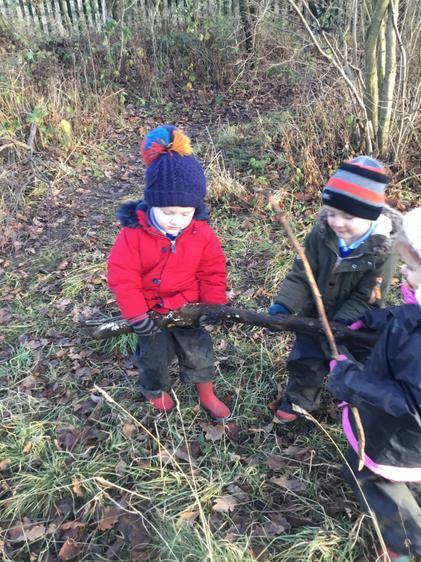 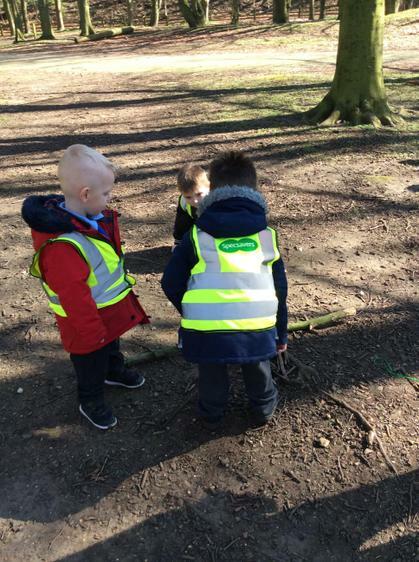 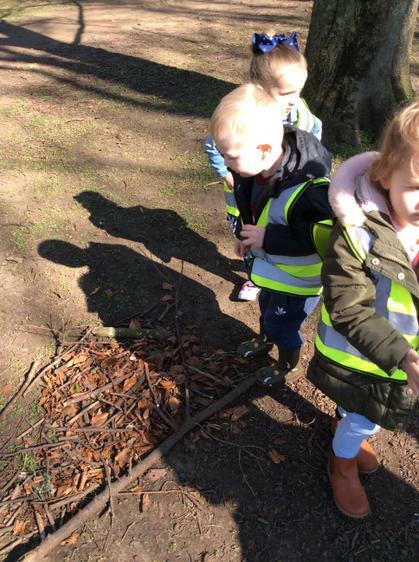 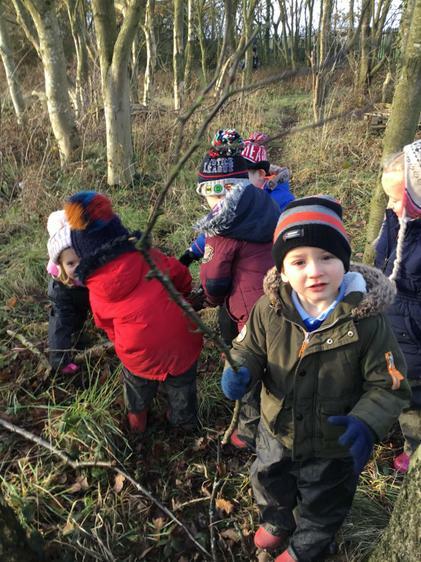 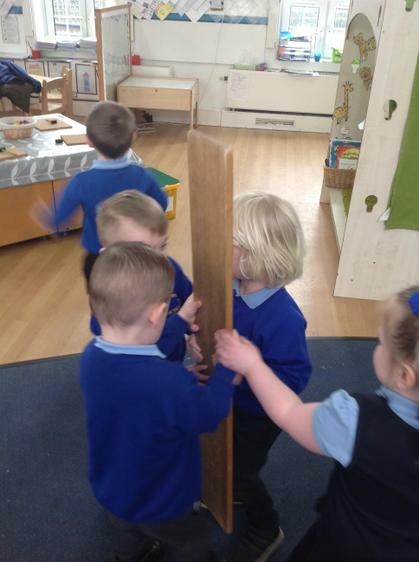 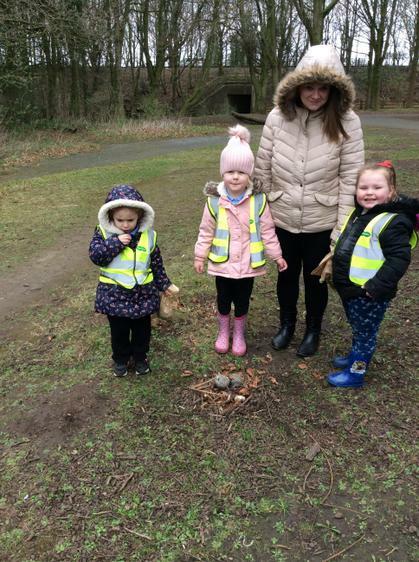 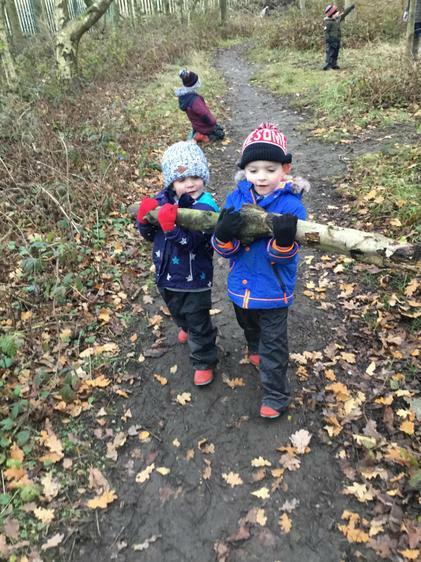 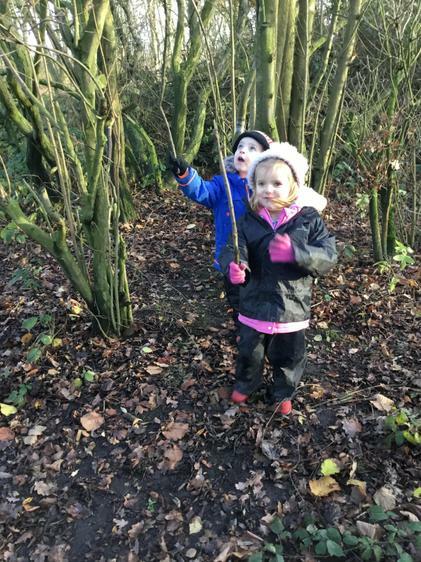 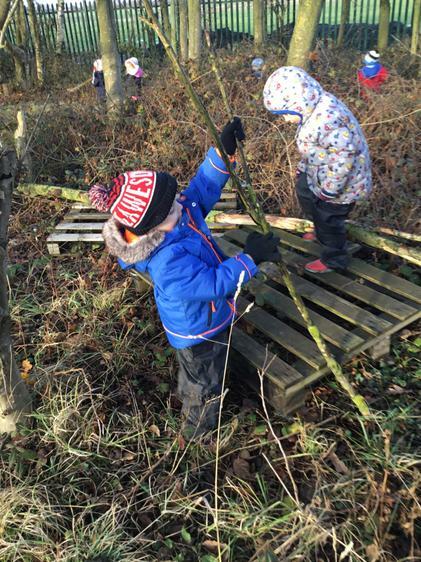 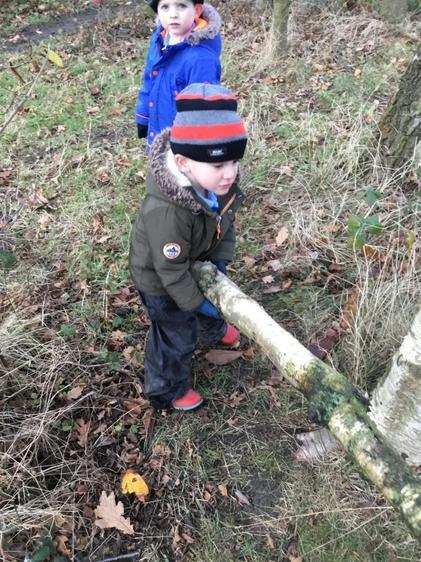 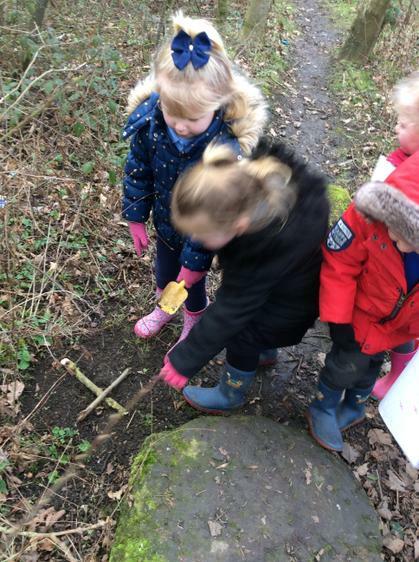 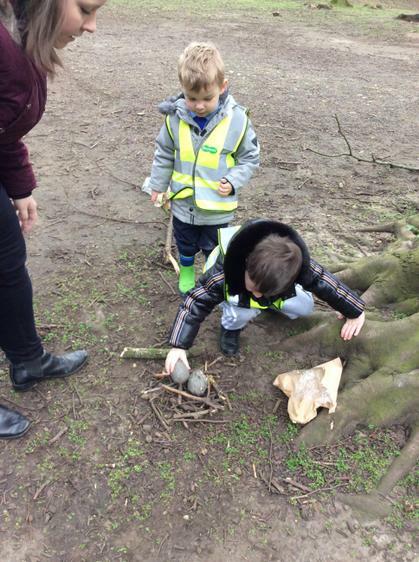 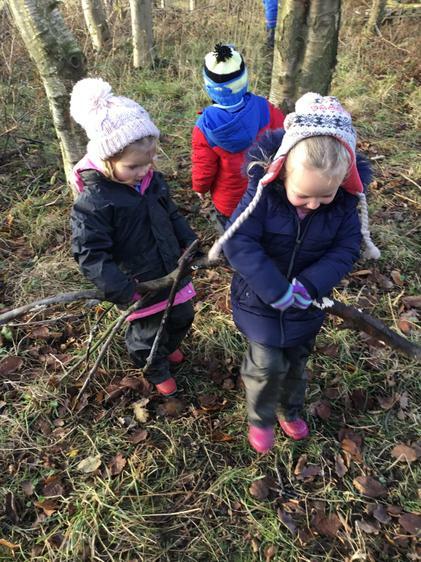 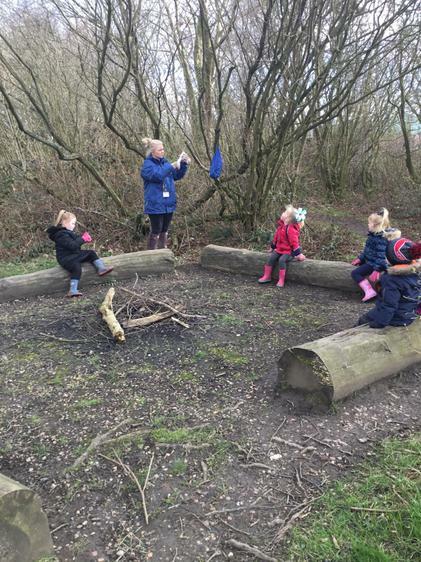 The children were amazing at finding big sticks and working as a team to carry them and place them in our nest. 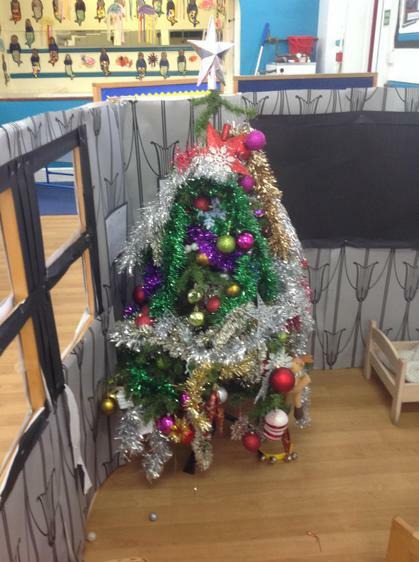 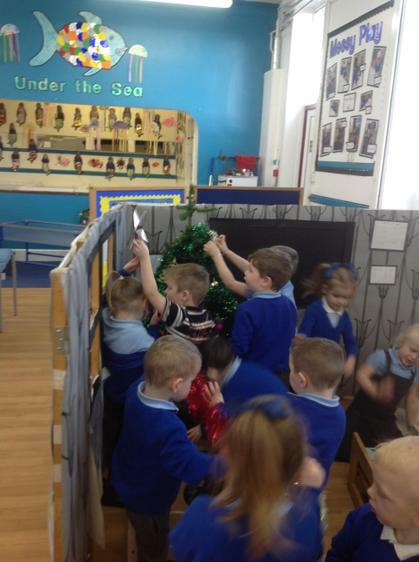 Well done Nursery I wonder who might move in? 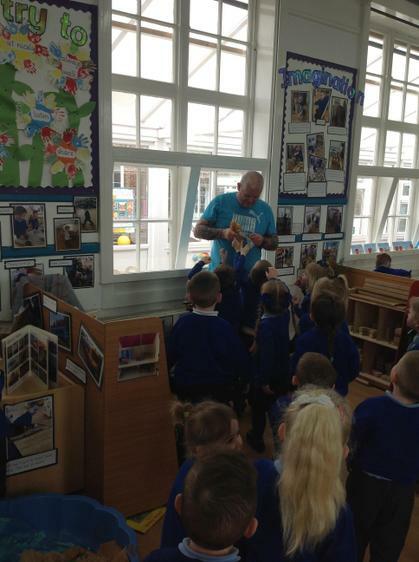 The children have loved having metal mike out this week. 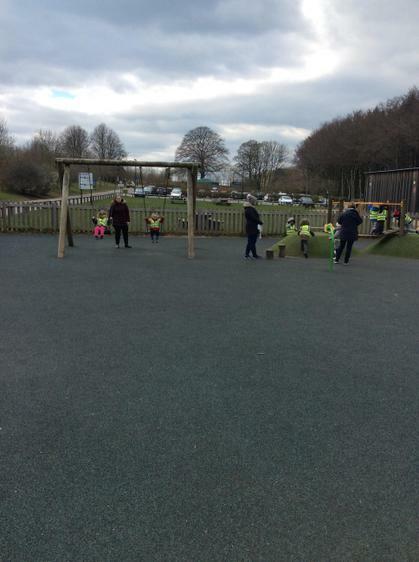 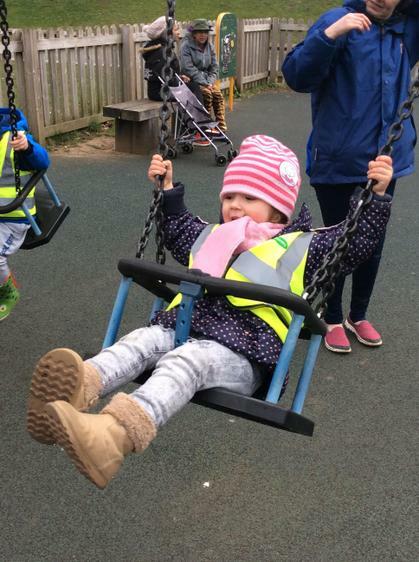 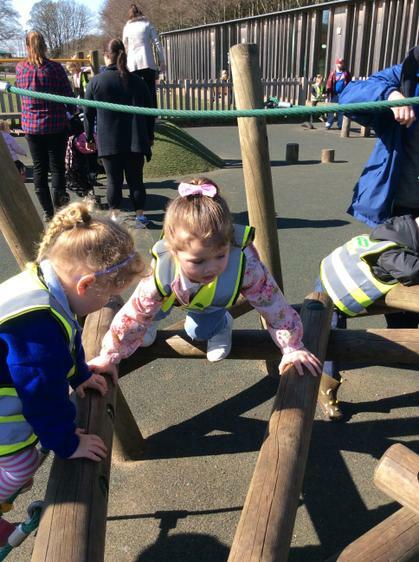 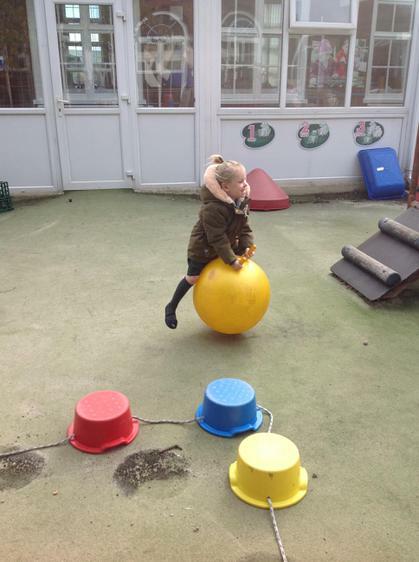 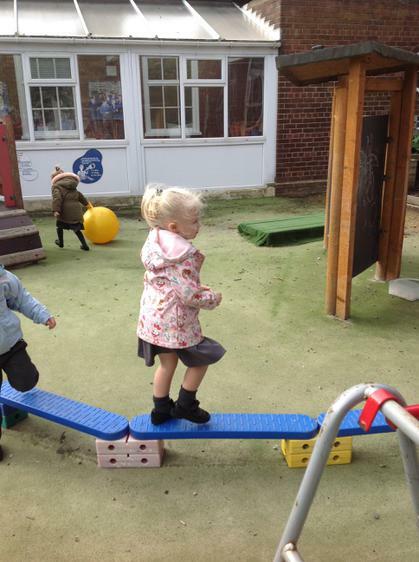 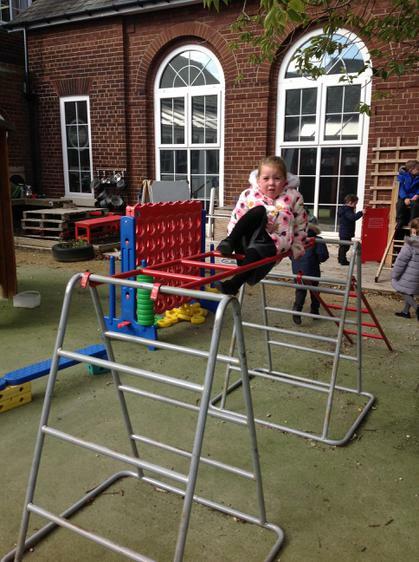 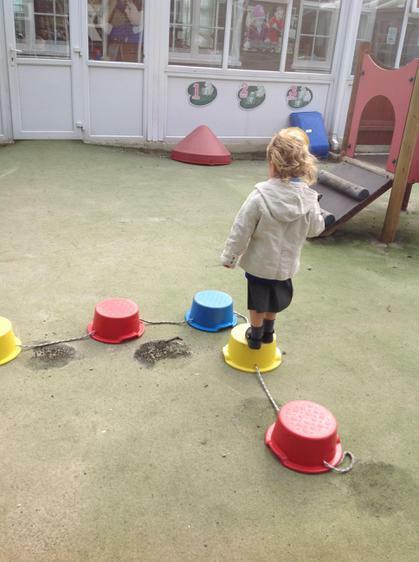 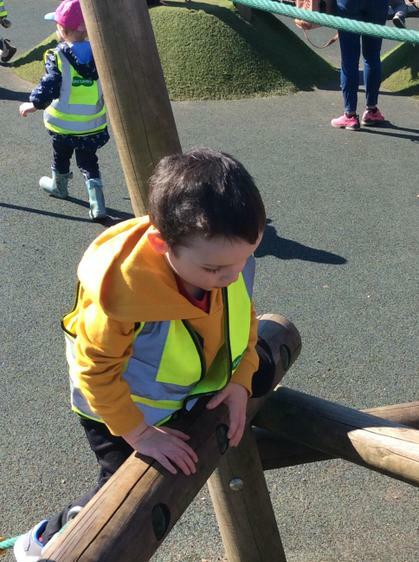 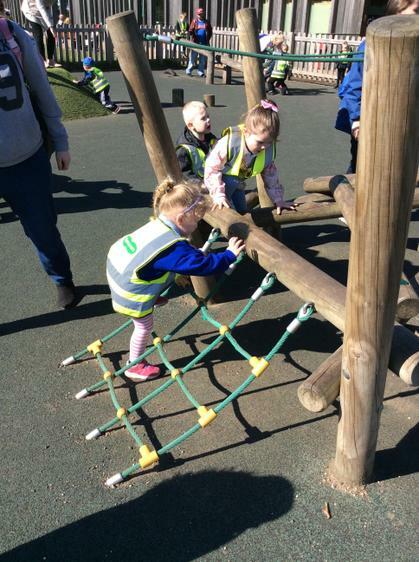 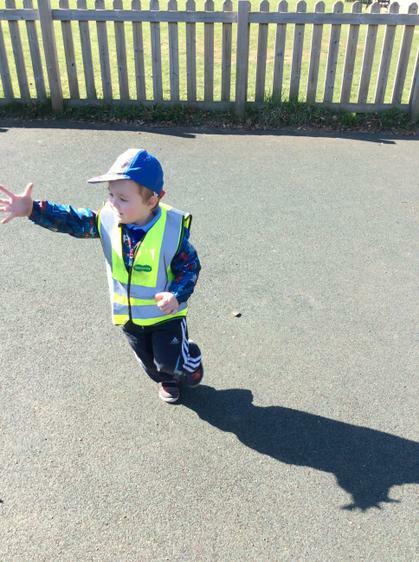 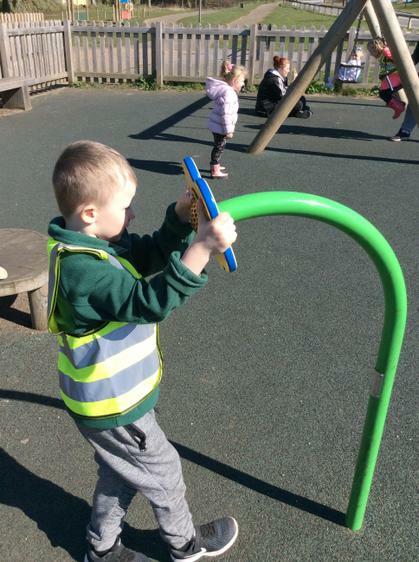 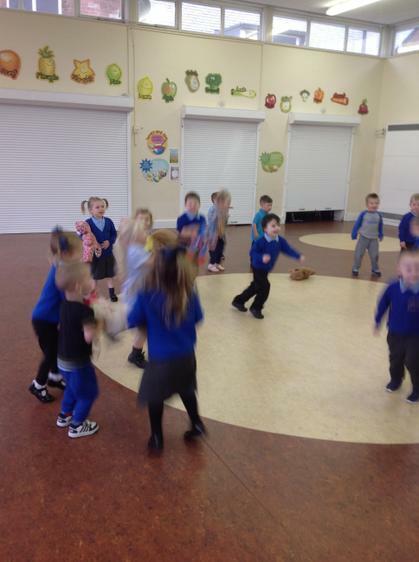 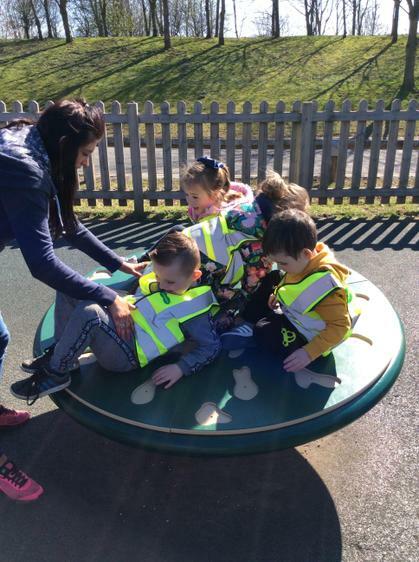 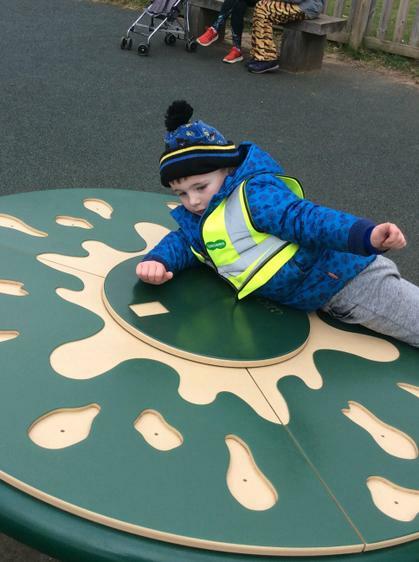 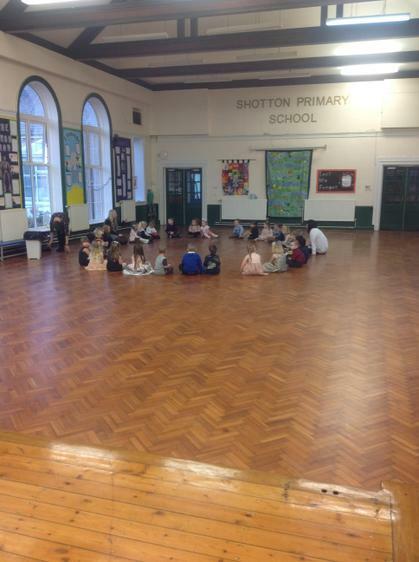 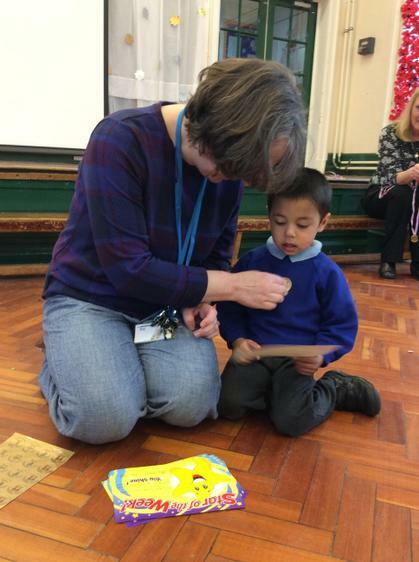 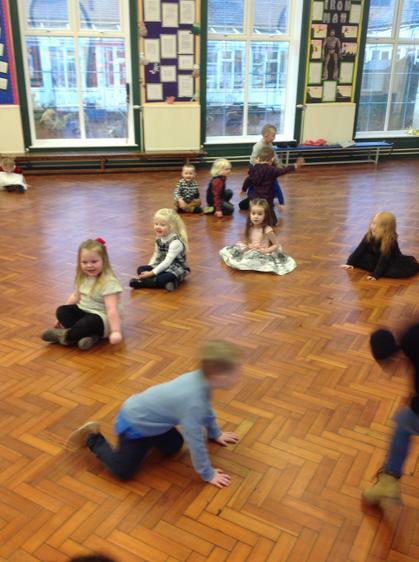 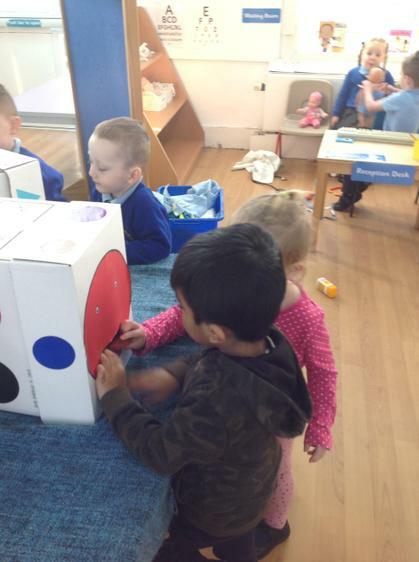 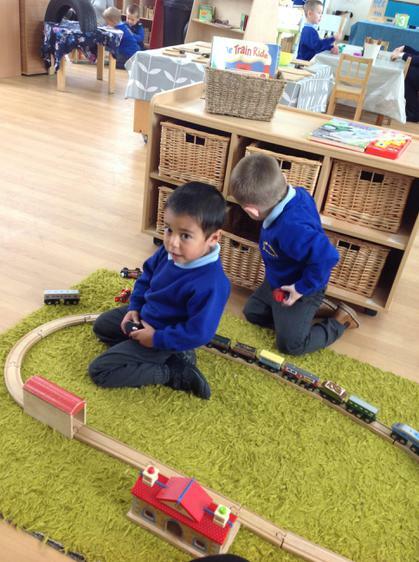 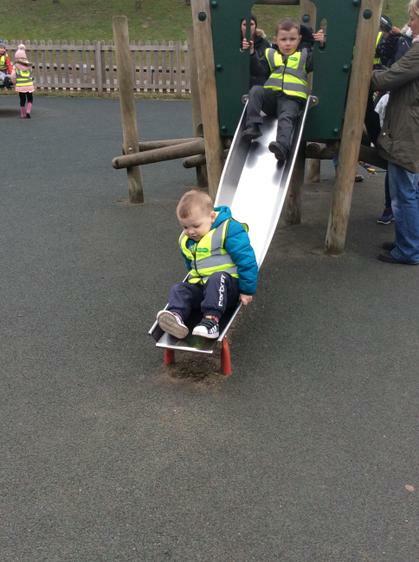 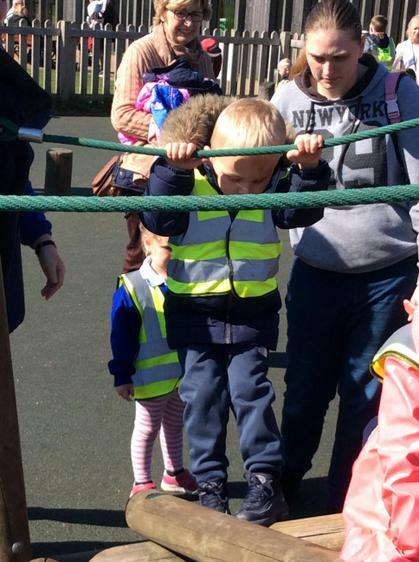 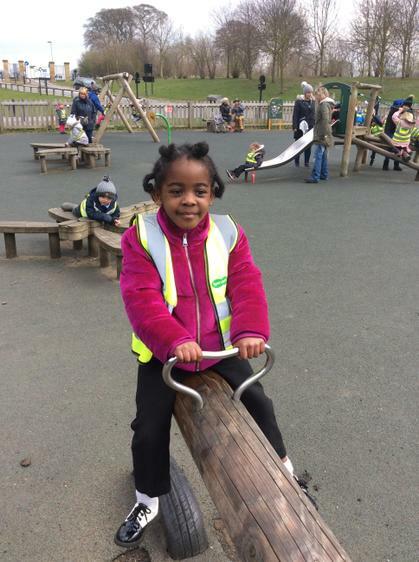 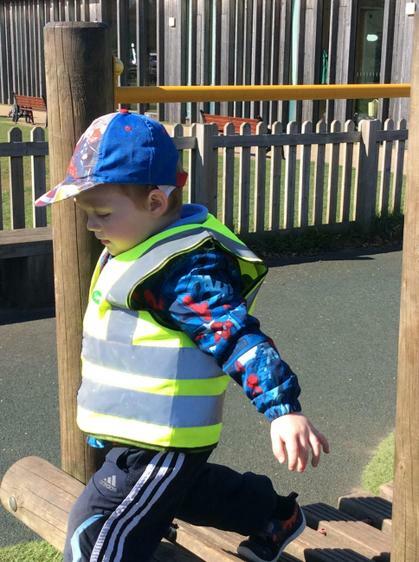 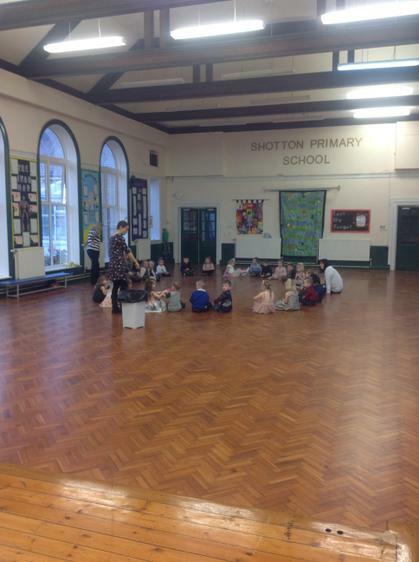 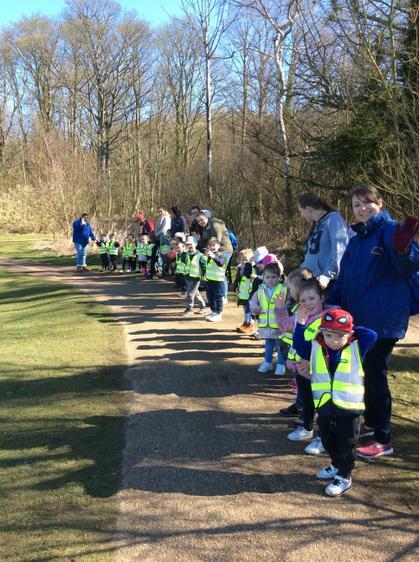 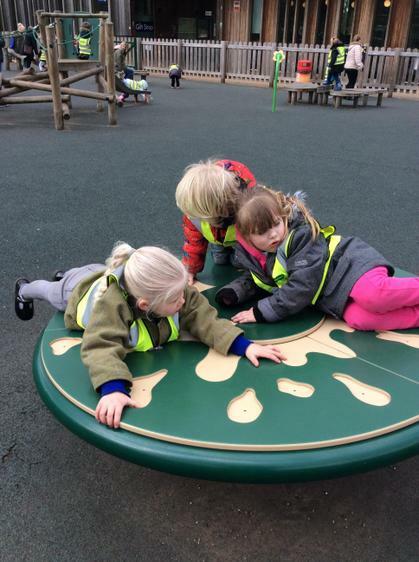 This has encouraged the children to take turns when playing in bigger groups with an adult. 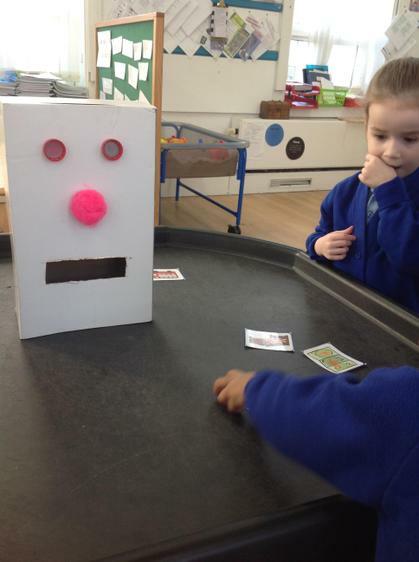 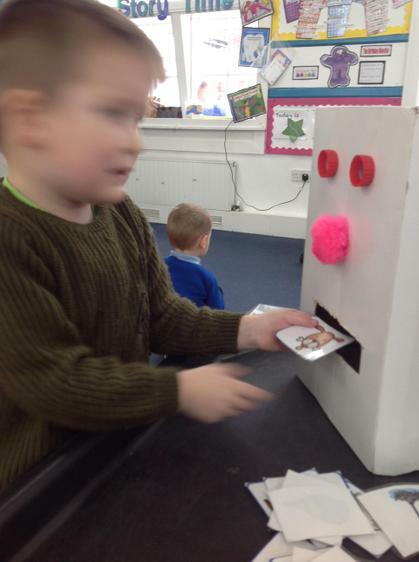 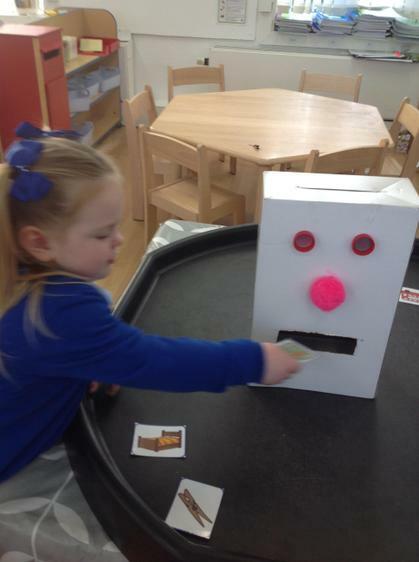 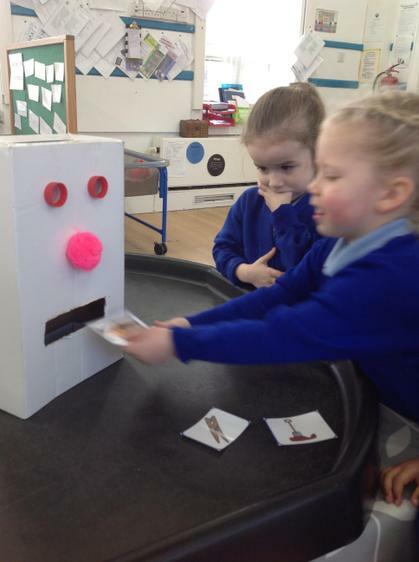 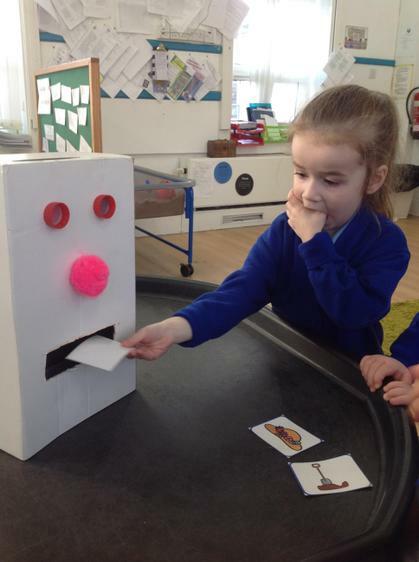 Some children have even tried to robot talk themselves to play the game. 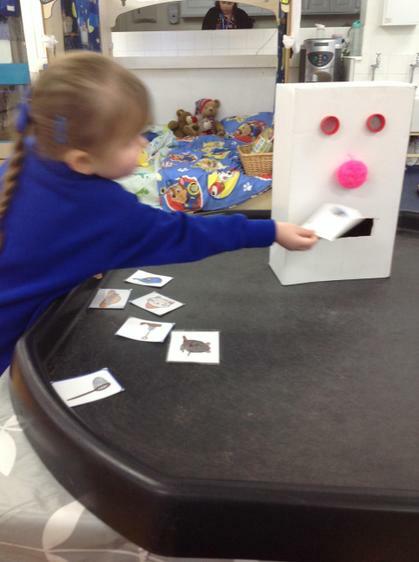 We are getting good at feeding metal mike the correct picture and having a giggle at the funny things he like to eat. 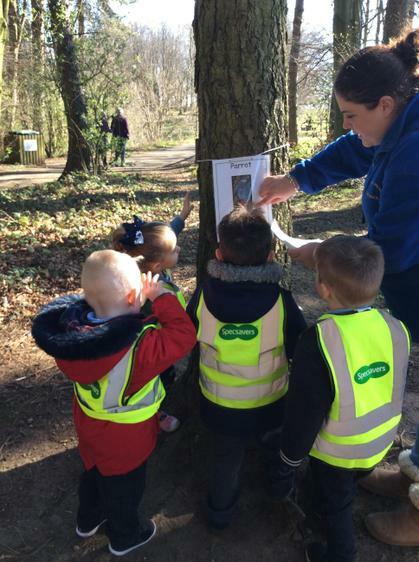 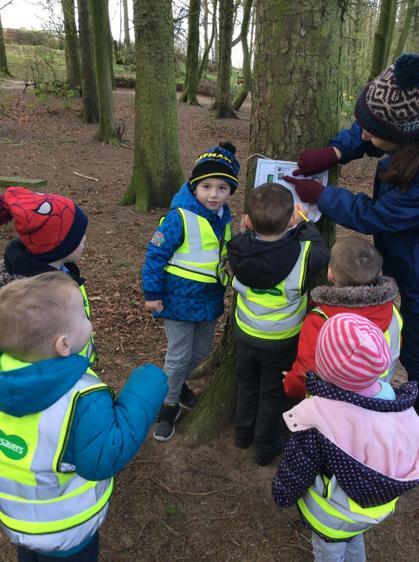 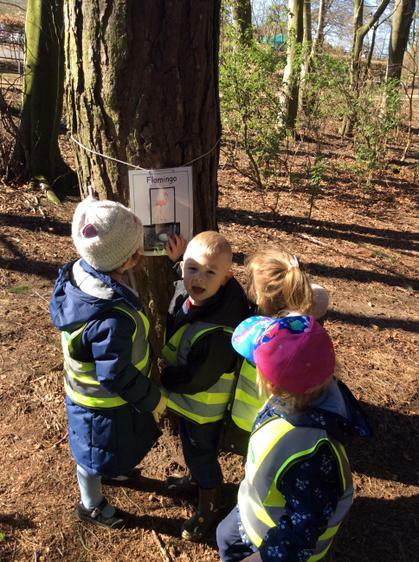 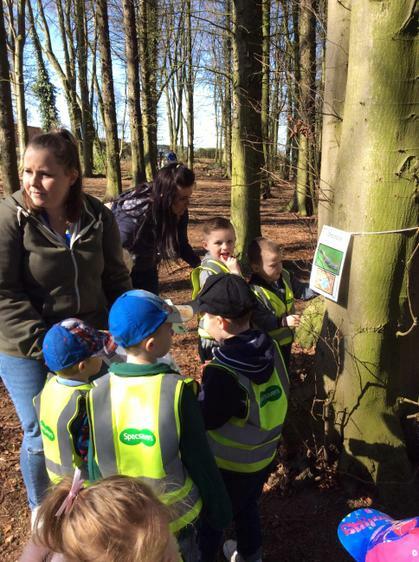 The boys and girls were shocked to come down to the woods to find missing posters on the trees! 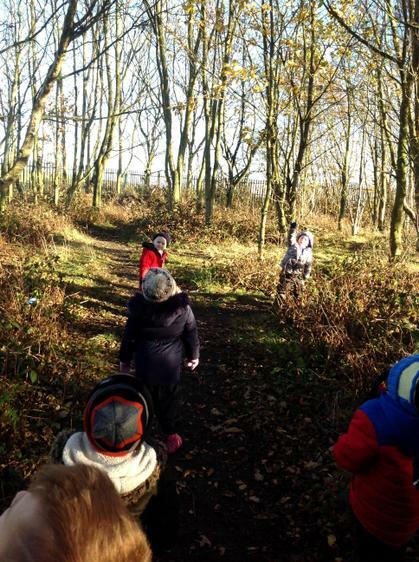 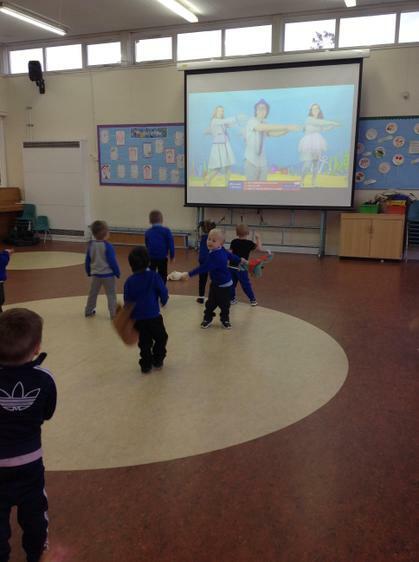 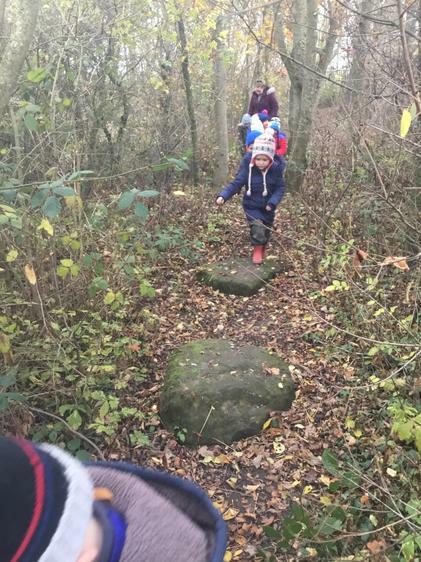 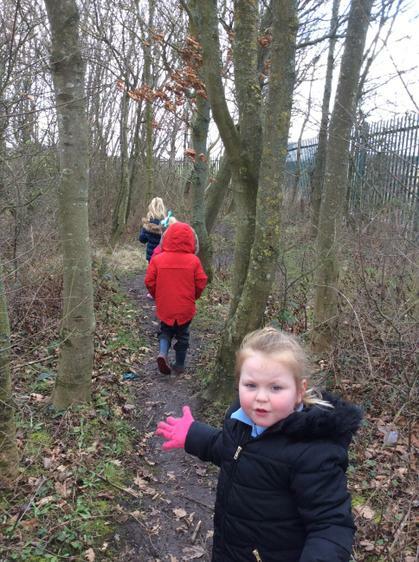 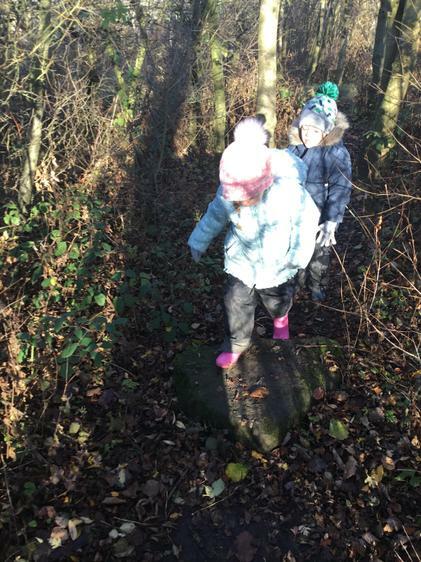 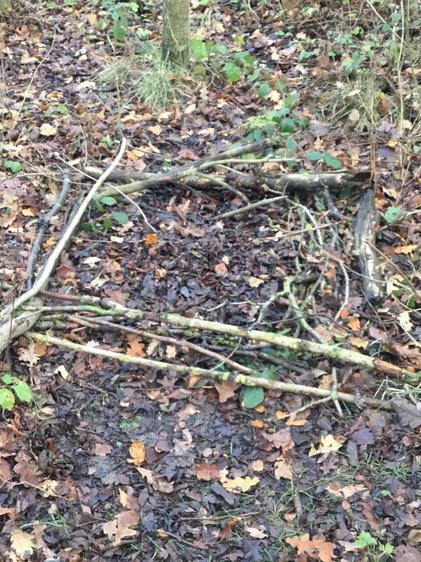 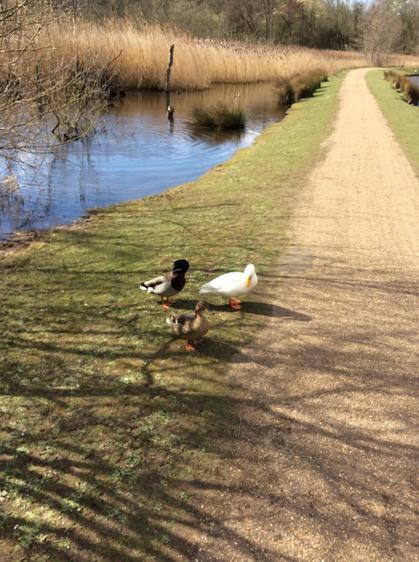 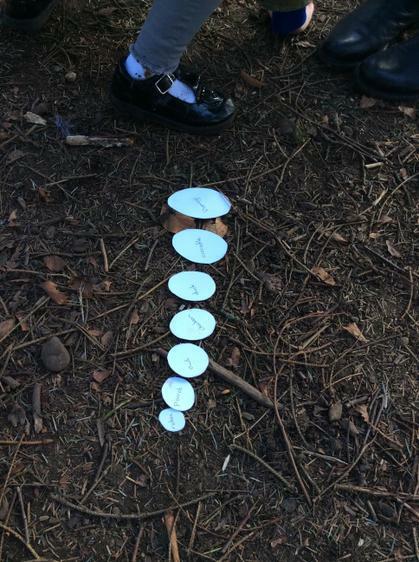 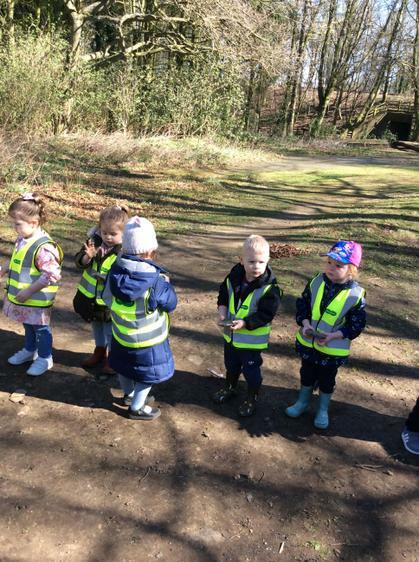 Our friends we use in music had gone for a walk in the woods and got lost! 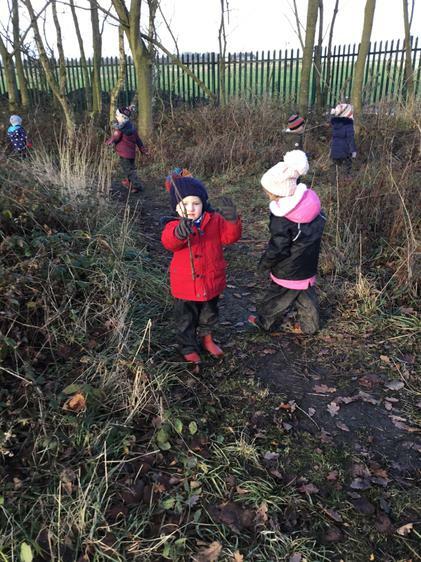 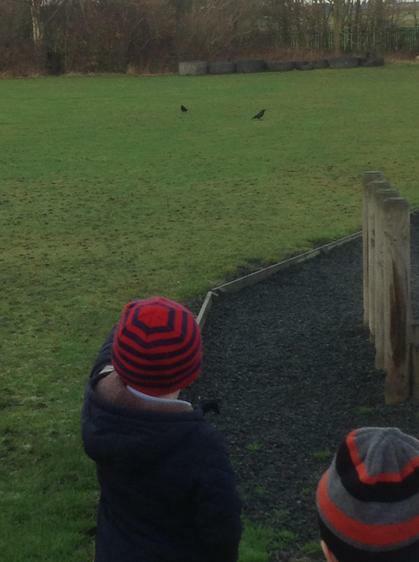 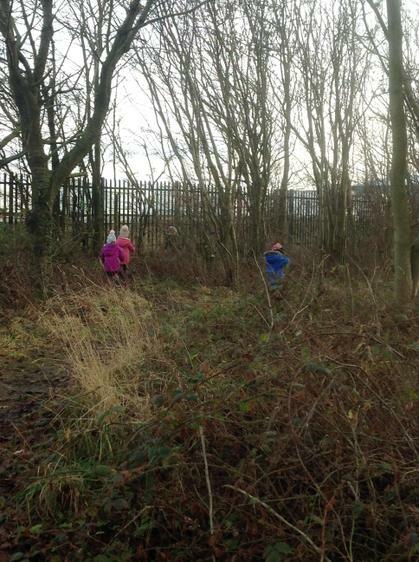 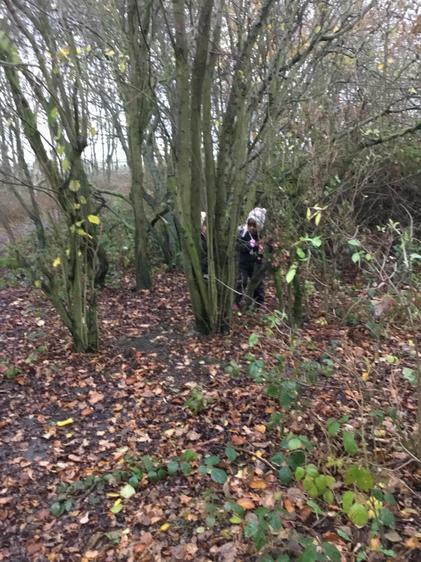 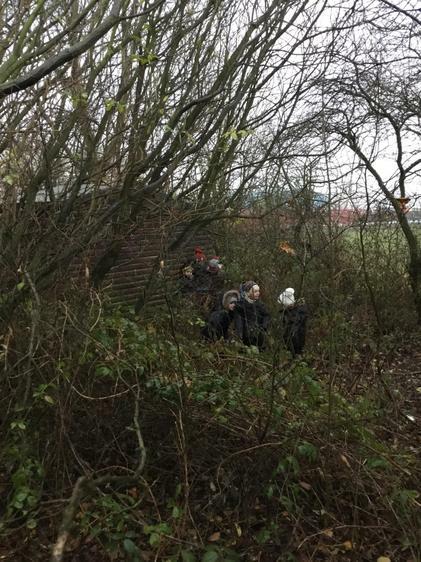 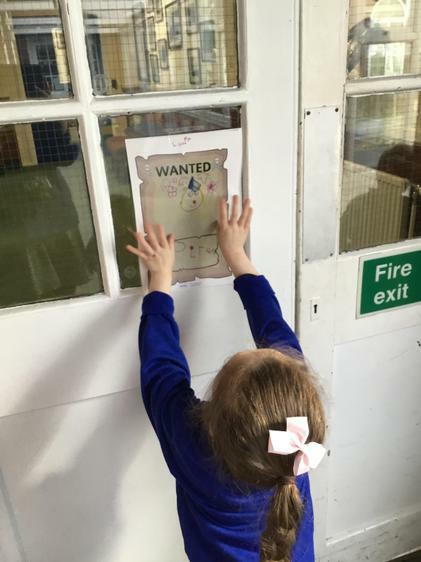 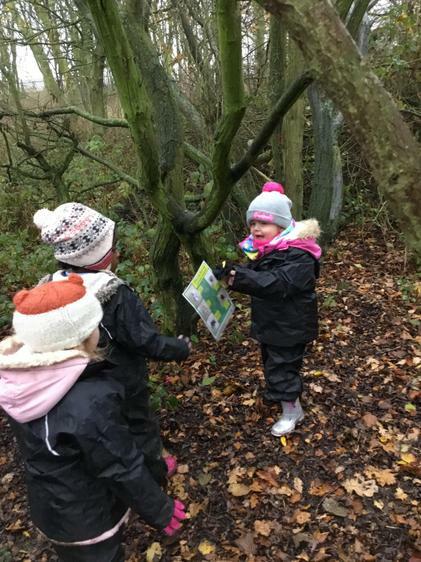 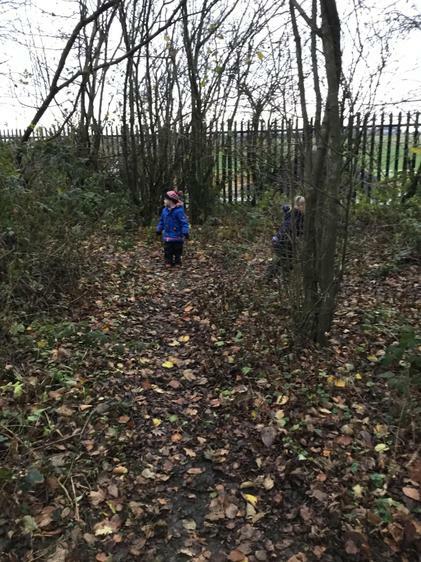 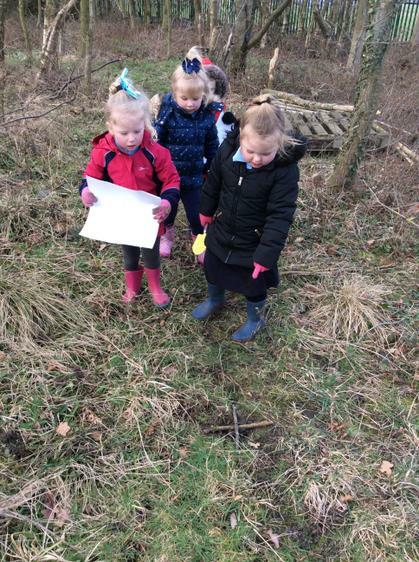 The children had lots of fun hunting for their friends and describing where they were found. 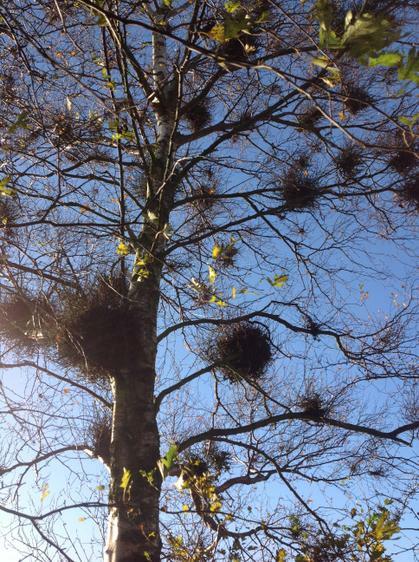 On top of branches, inside of bushes and underneath plants. 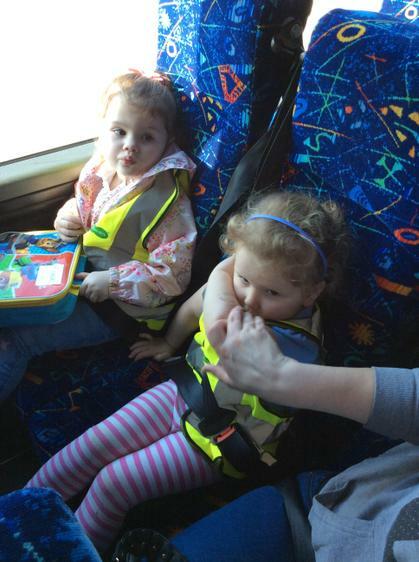 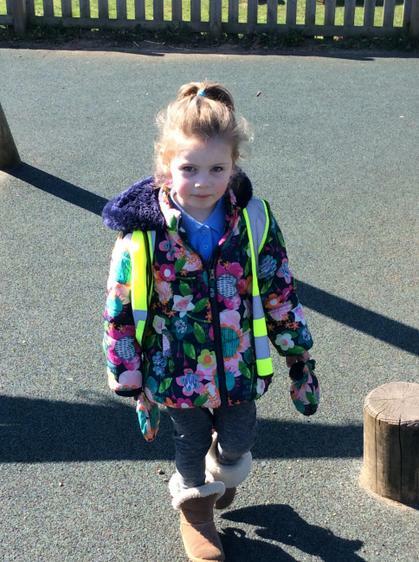 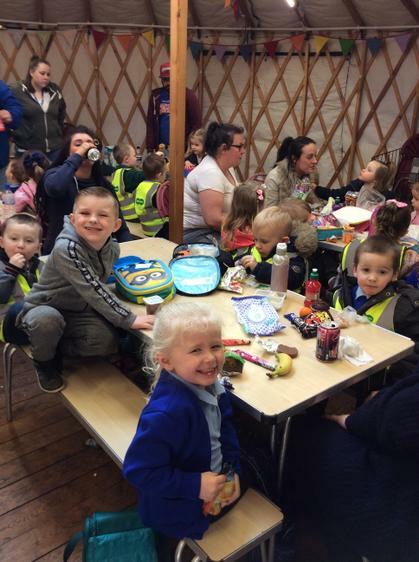 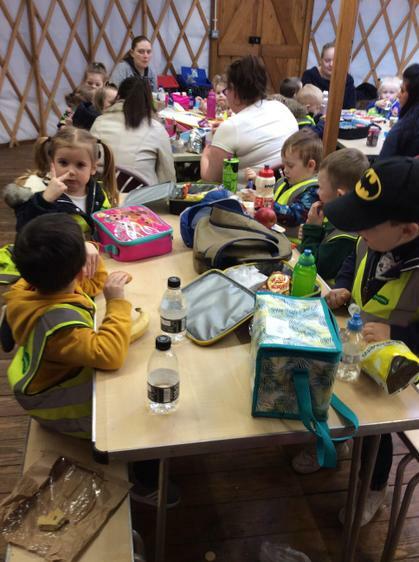 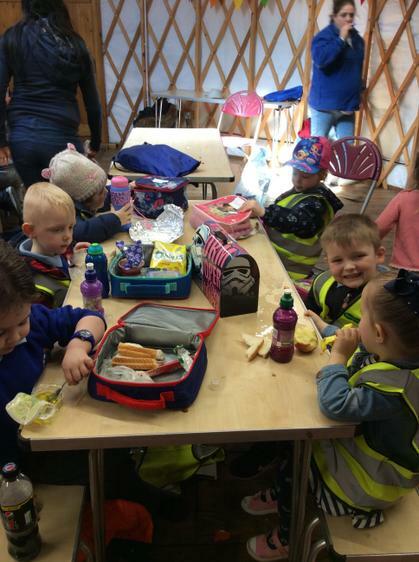 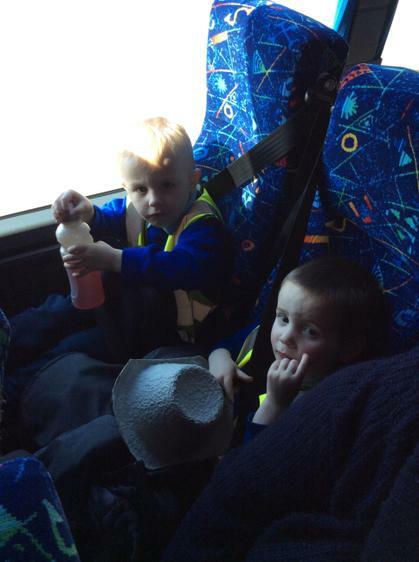 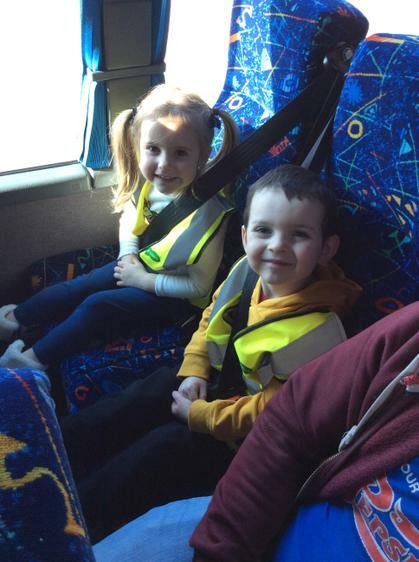 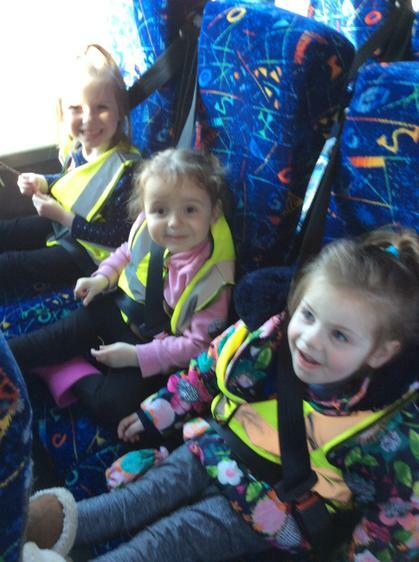 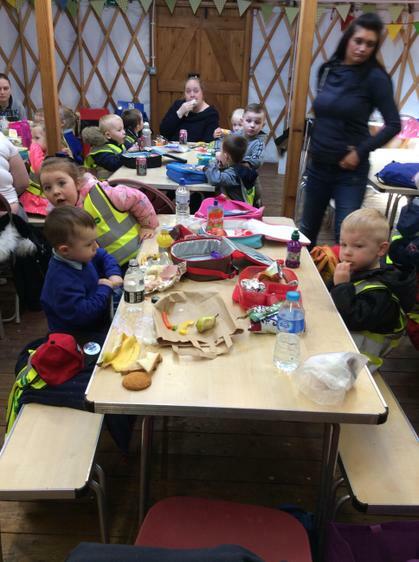 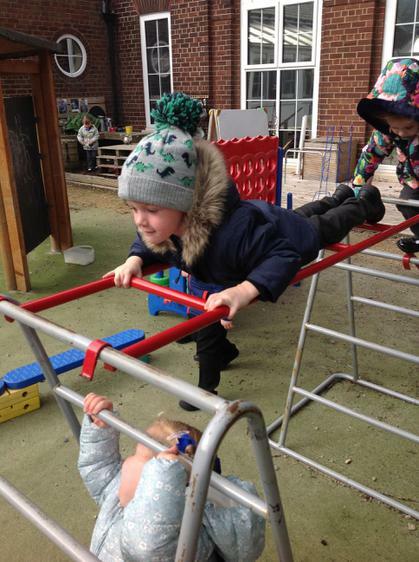 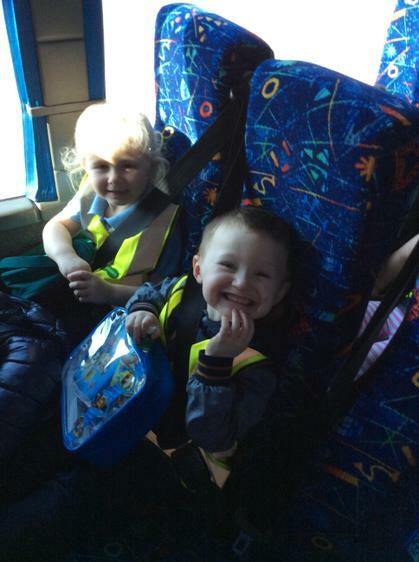 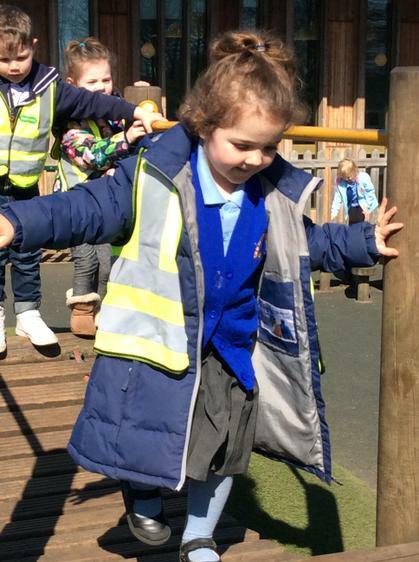 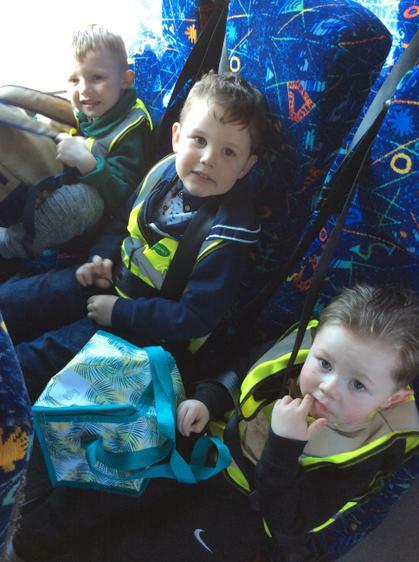 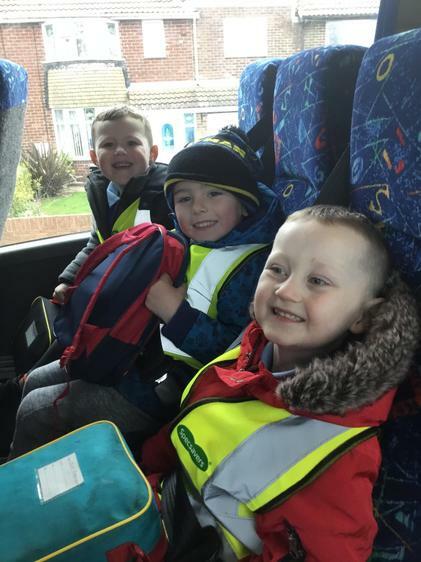 We are happy to say they are safe and sound and back in our nursery! 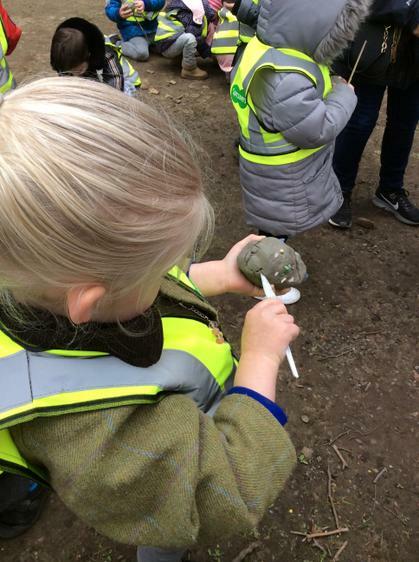 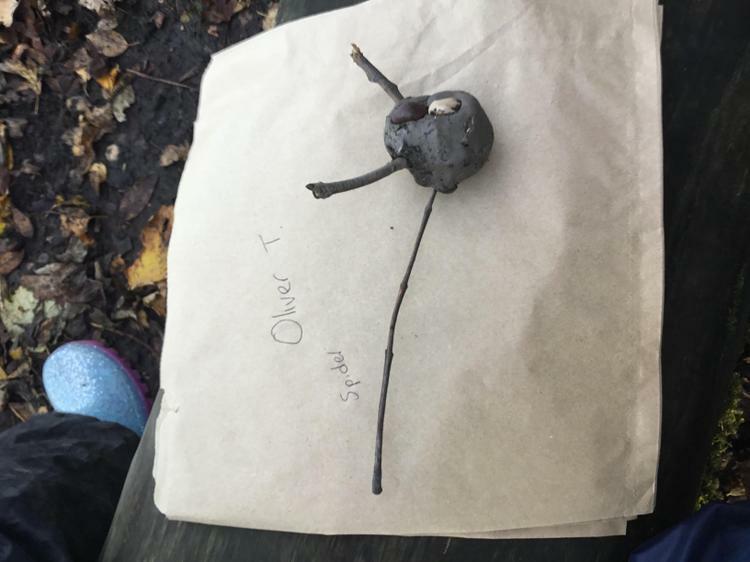 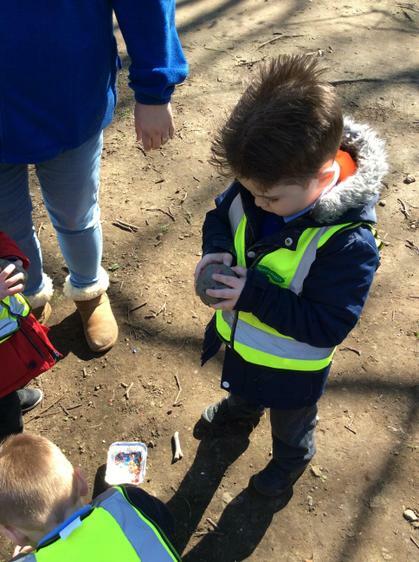 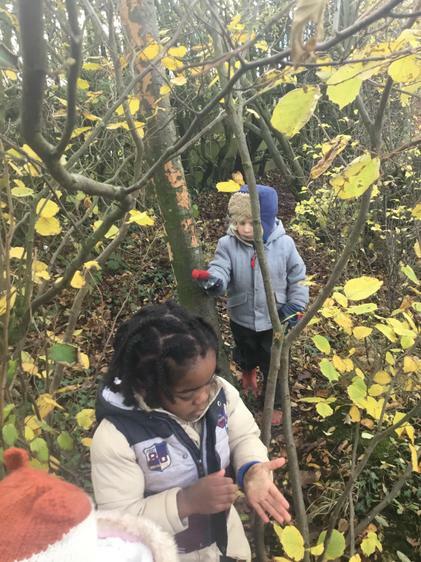 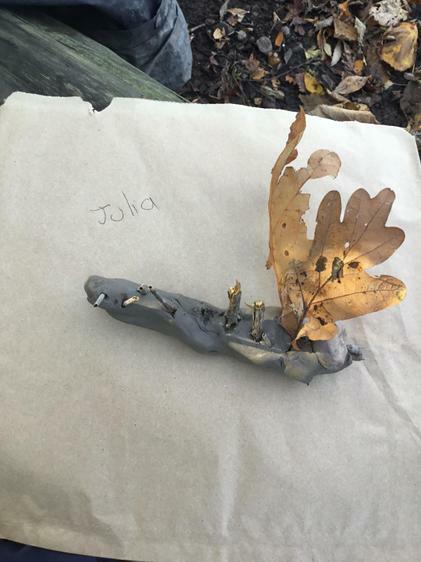 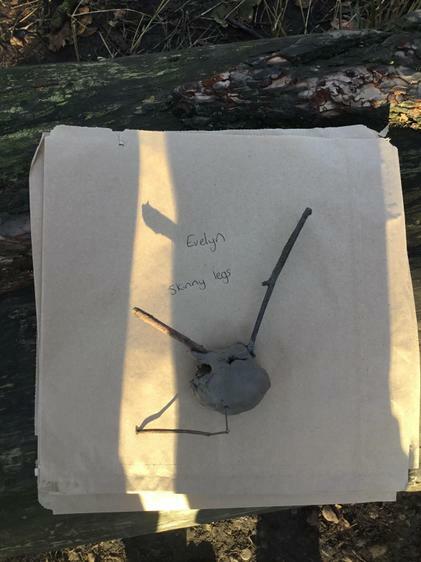 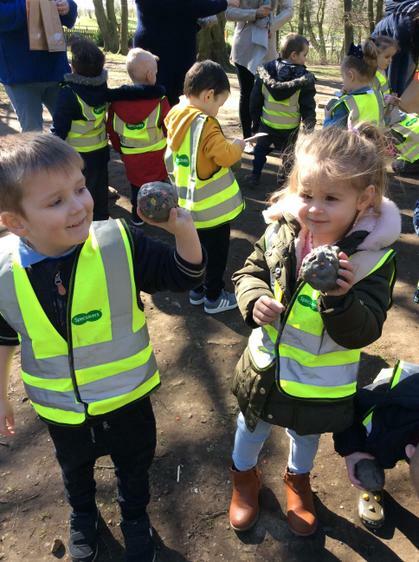 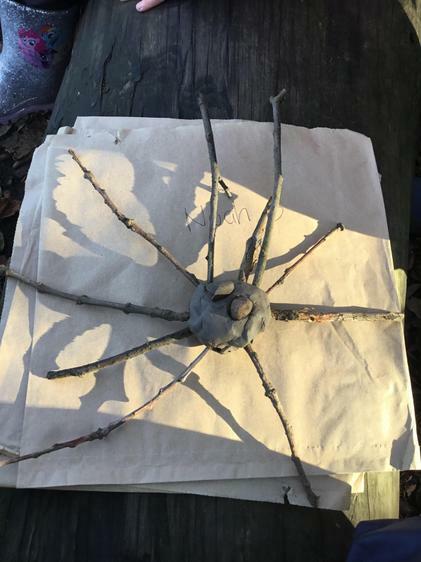 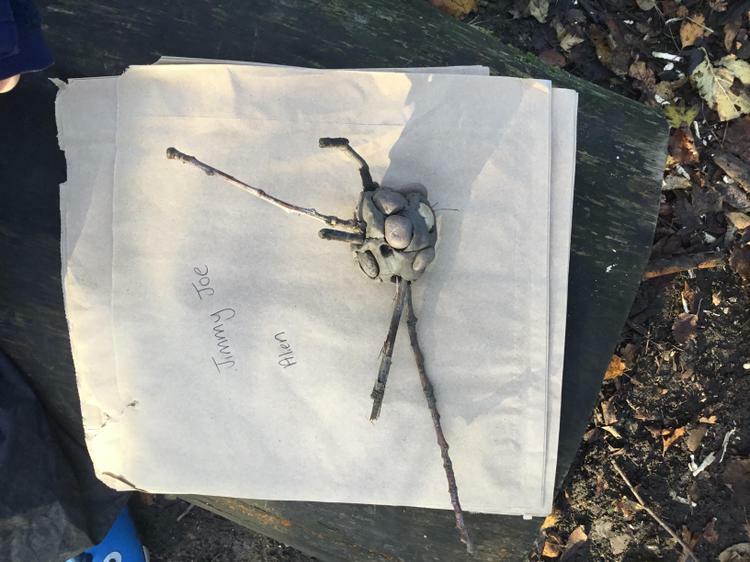 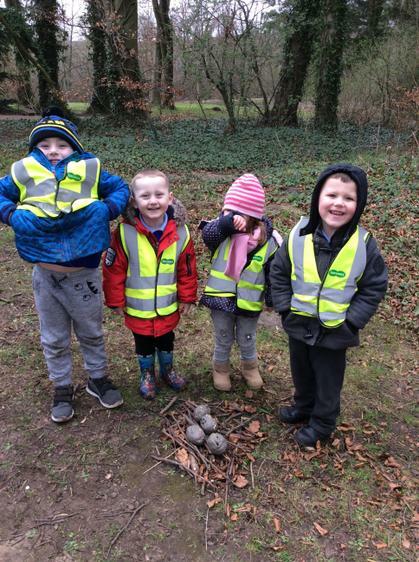 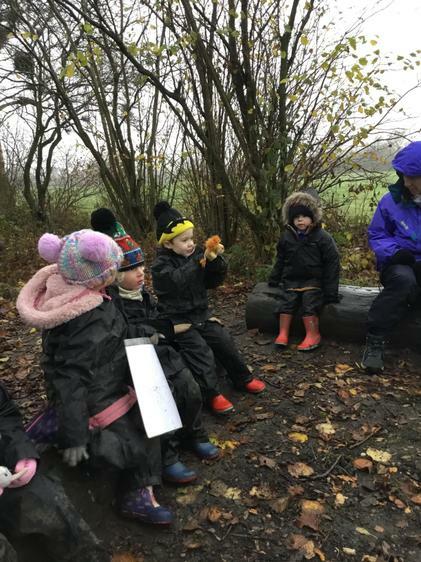 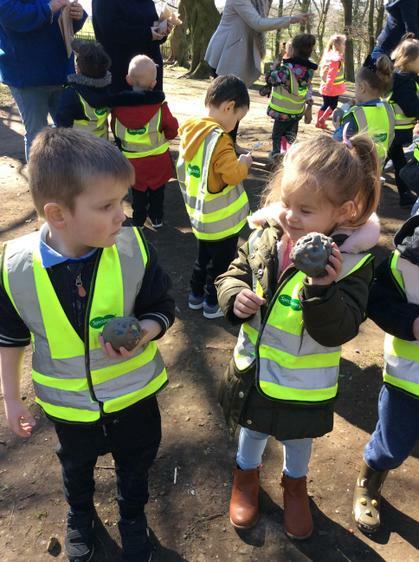 After exploring the woods last week and finding lots of leaves and sticks this group have really enjoyed using leaves and sticks to create their clay creatures. 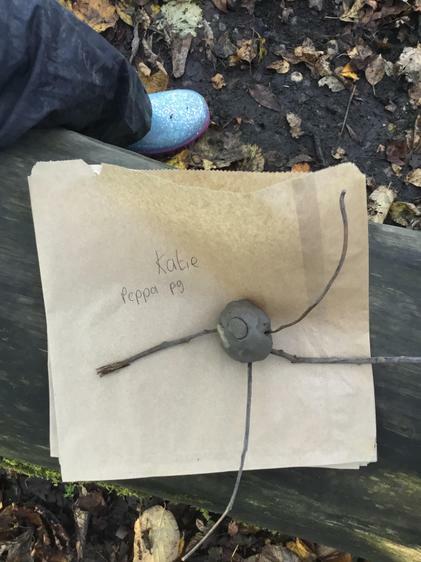 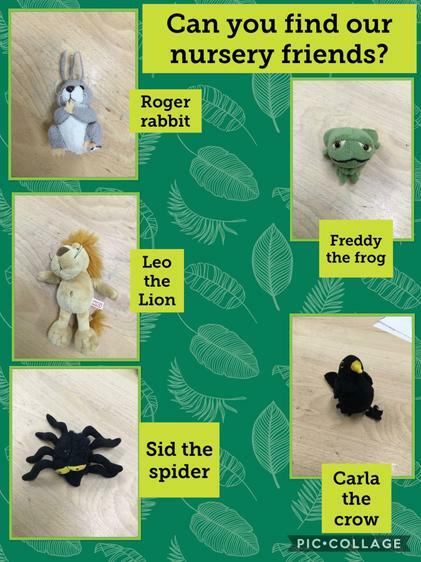 Once we created them the children were fantastic at sitting round in base camp and naming their creatures. 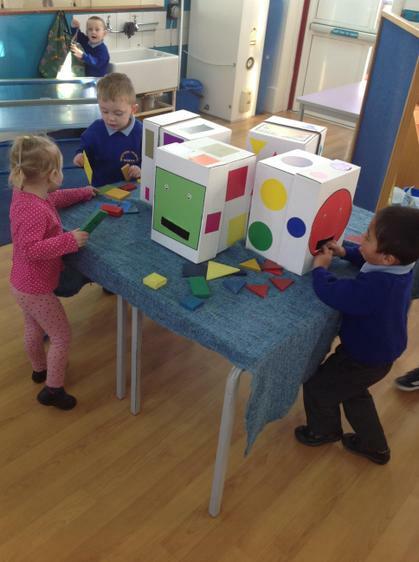 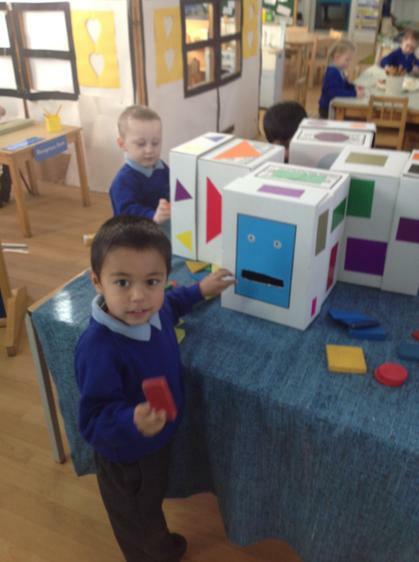 The shape monsters landed in our nursery. 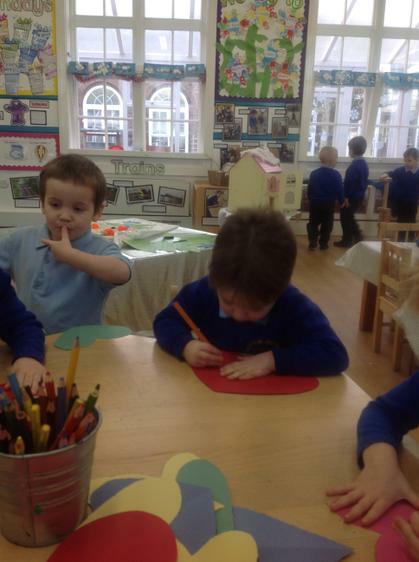 They are fussy monsters and only eat their own shape or they are sick. 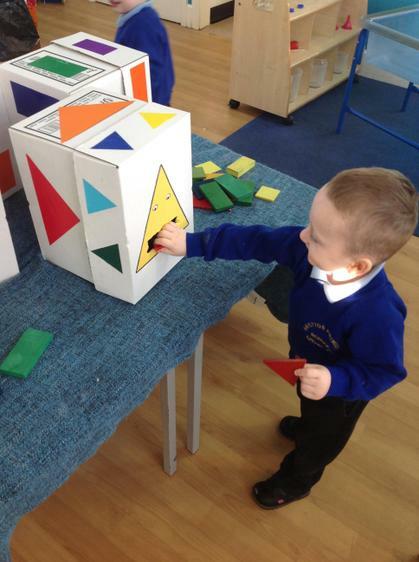 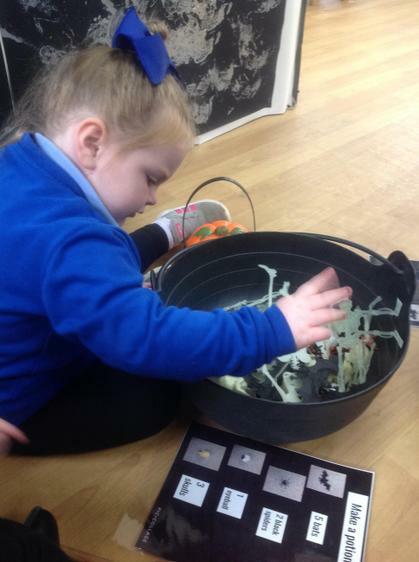 The children have had lots of fun sorting the shapes to make sure the right monster is fed the right shape. 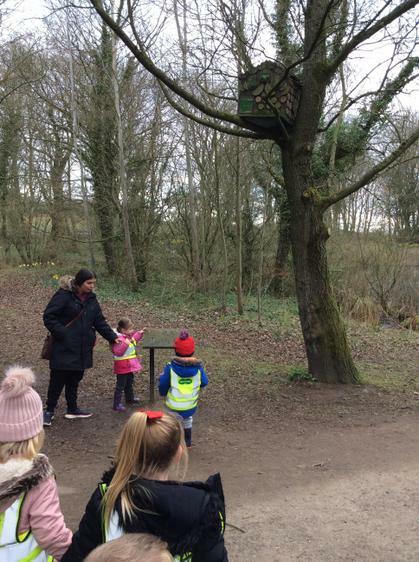 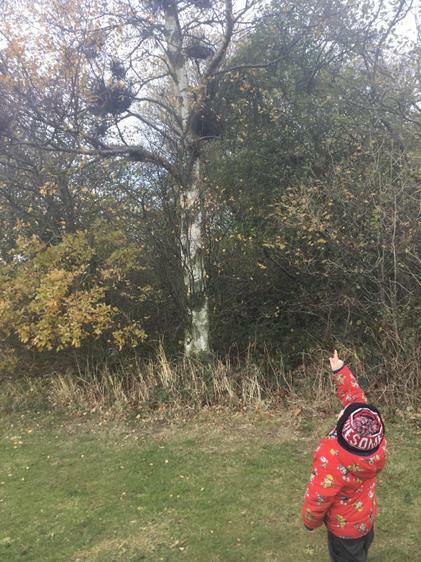 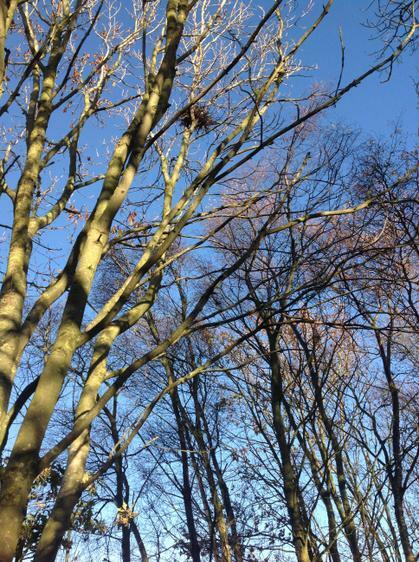 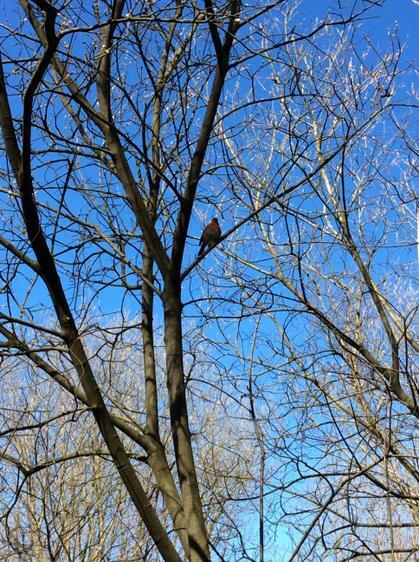 The children noticed the nests in one of the trees. 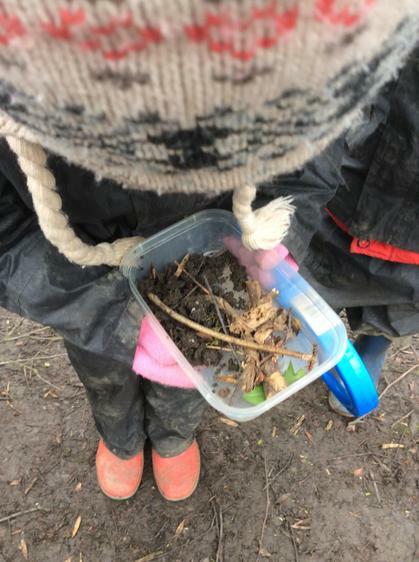 This lead us to go on a nest hunt for the majority of the session and talk about what lives in the nests and what they were made out of. 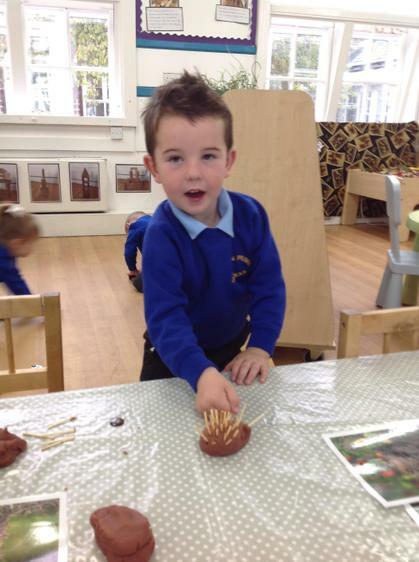 The boys and girls guessed chickens, dinosaurs and birds might live in the nests. 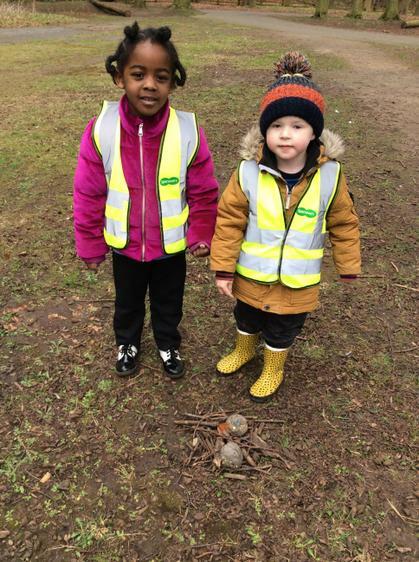 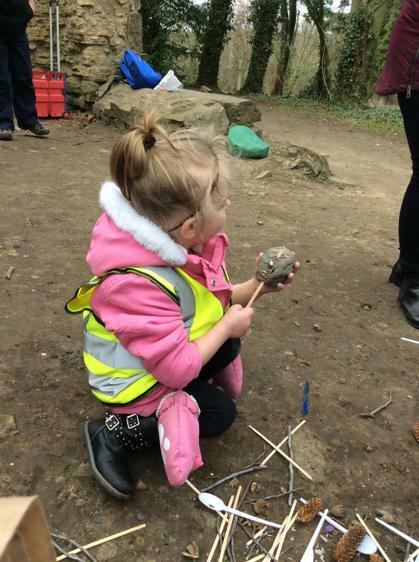 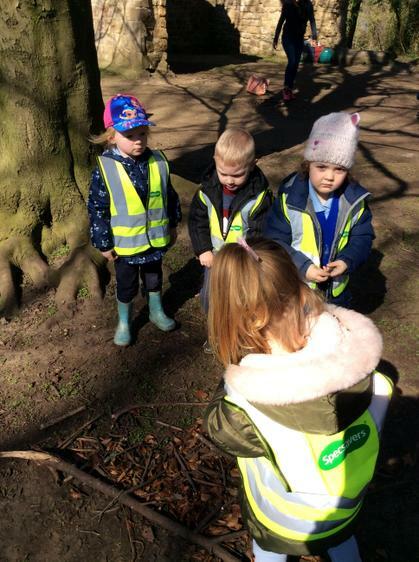 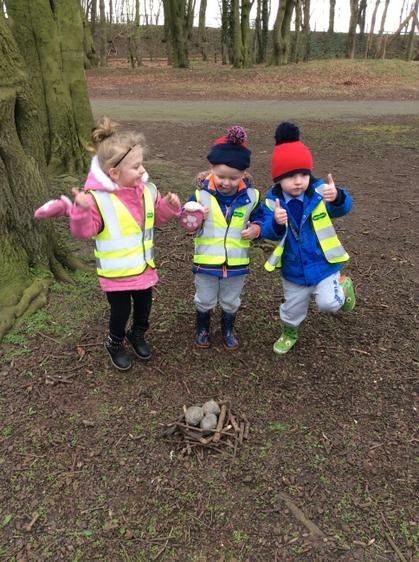 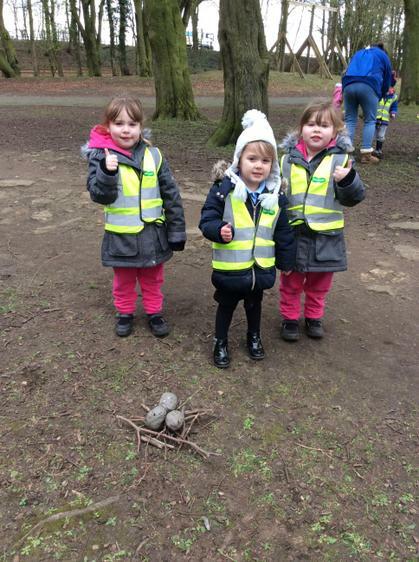 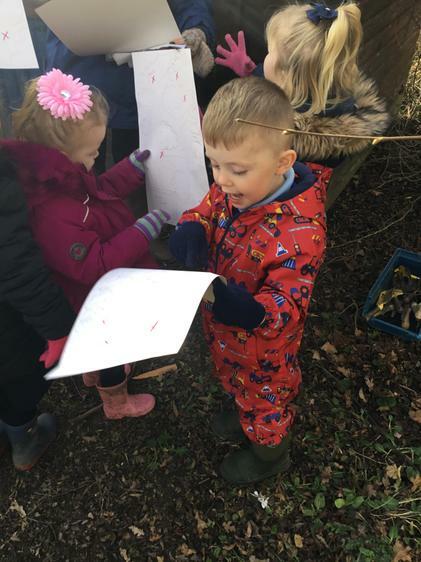 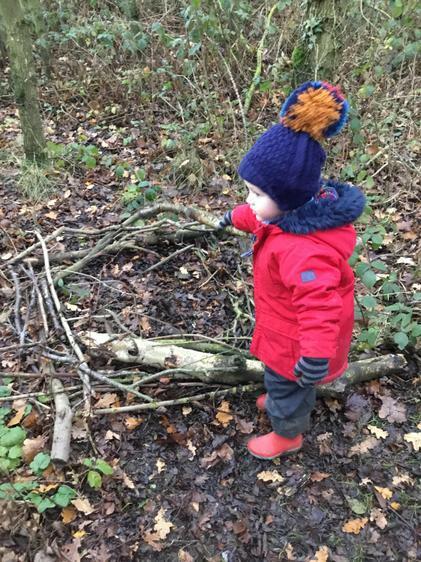 They were fantastic at naming things that the nests could be made out of such as sticks, leaves and feathers. 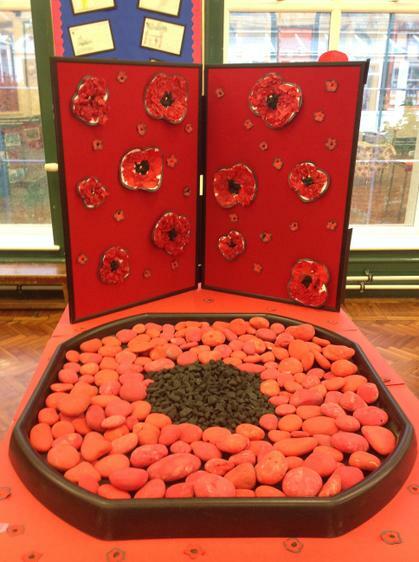 To celebrate 100 years since the ending of World War 1 we have made some beautiful poppies for the exhibition. 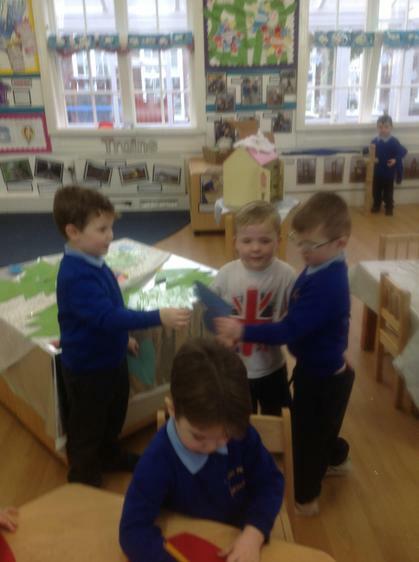 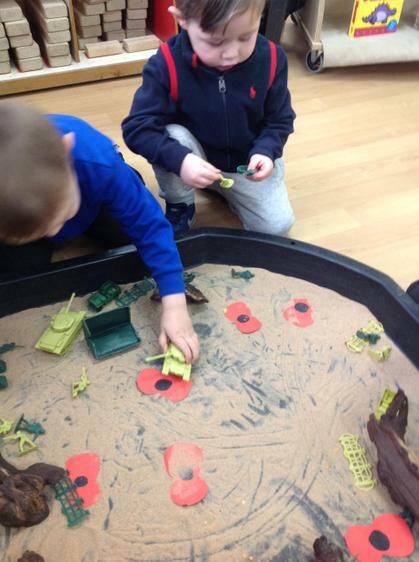 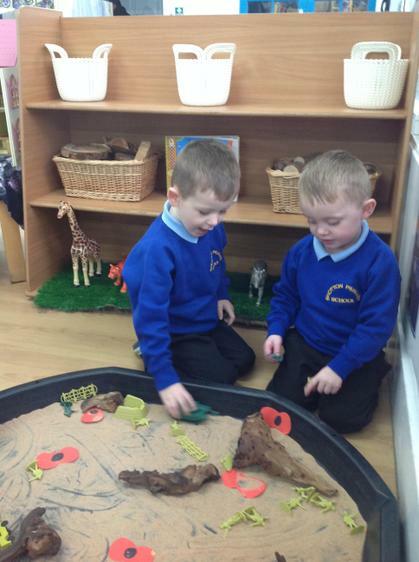 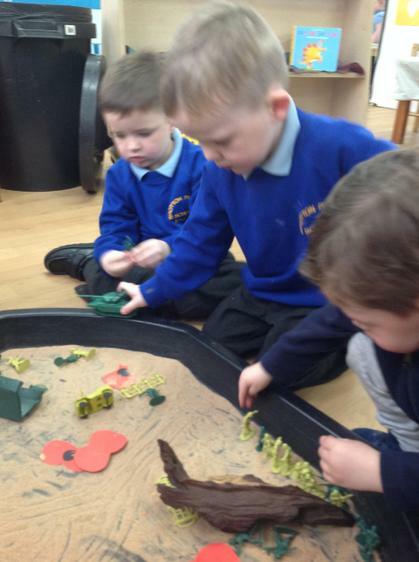 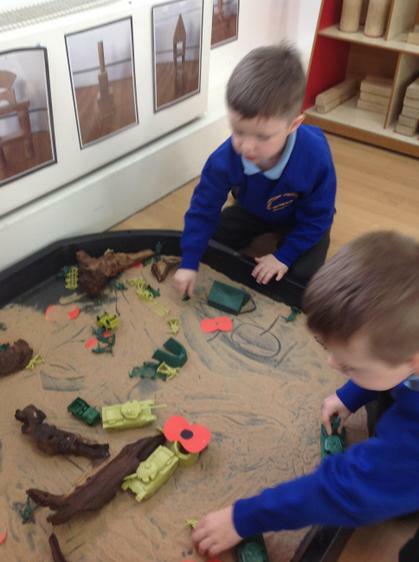 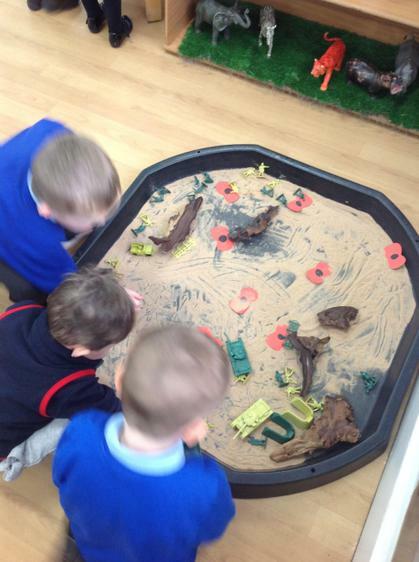 We have also had a World War 1 small world set up and children have loved exploring this and asking lots of questions. 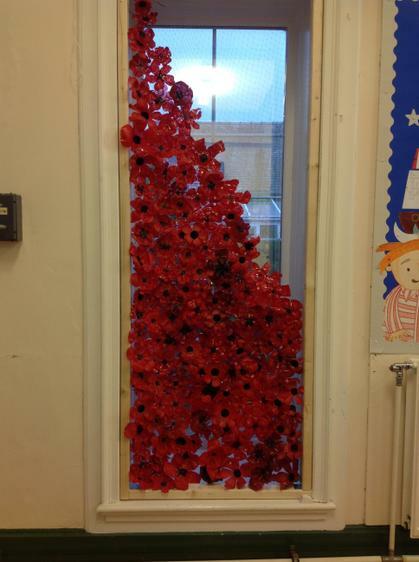 Can you remember why we have poppies? 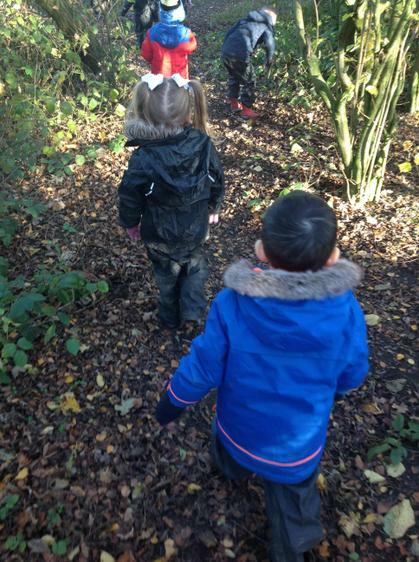 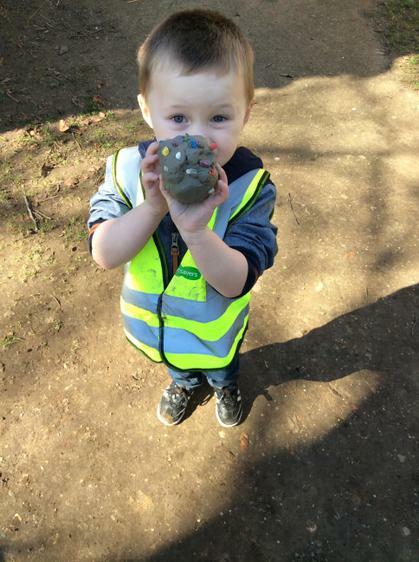 The children have loved their first woodlands session. 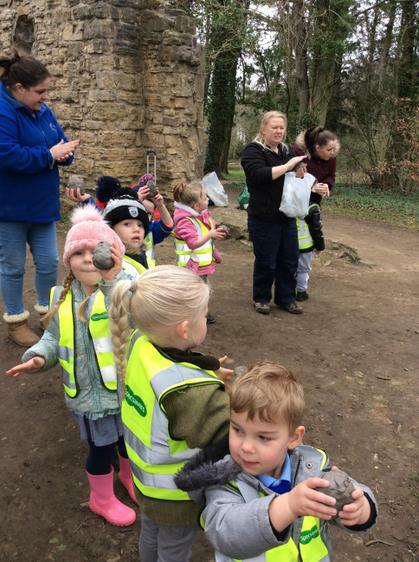 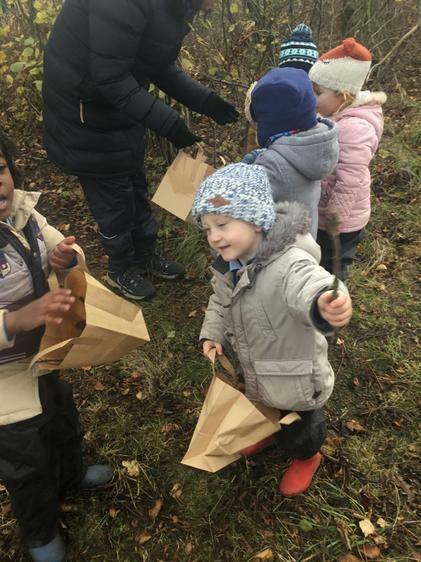 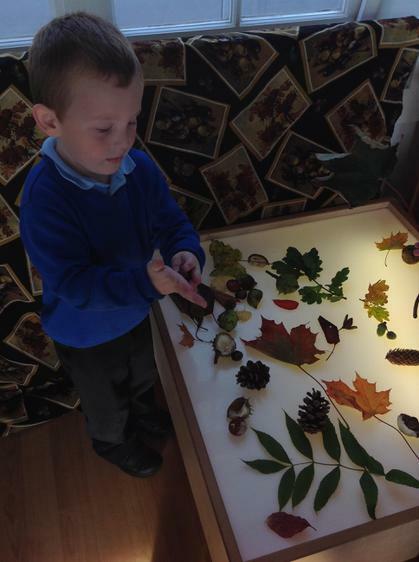 We had lots of fun collecting different coloured leaves. 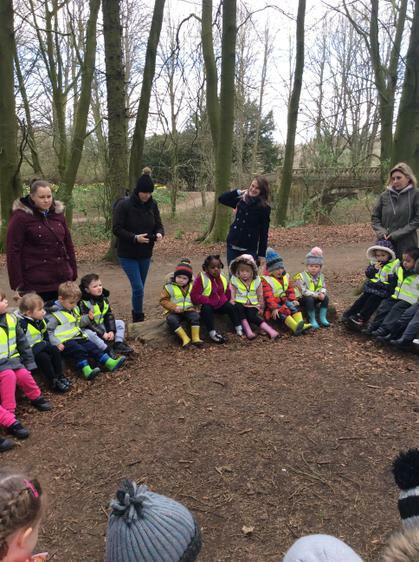 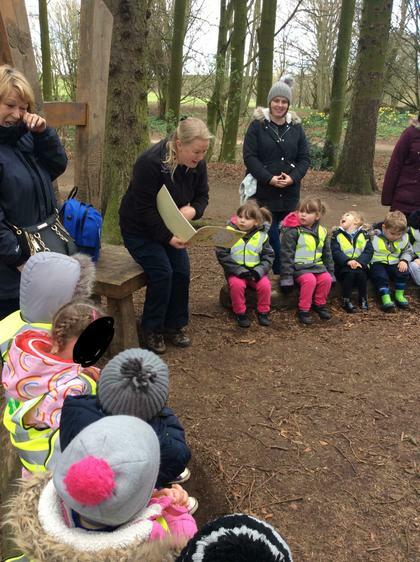 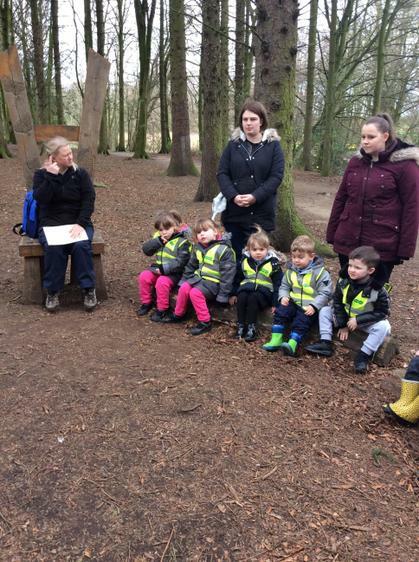 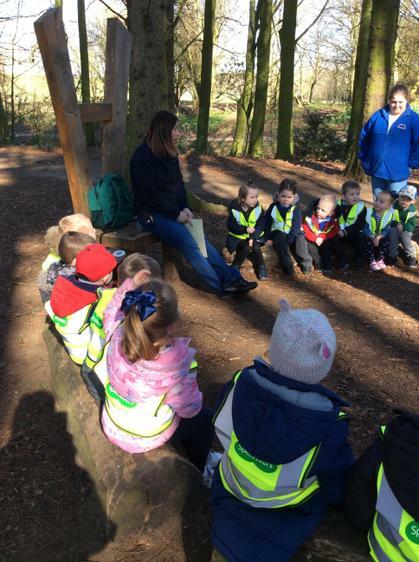 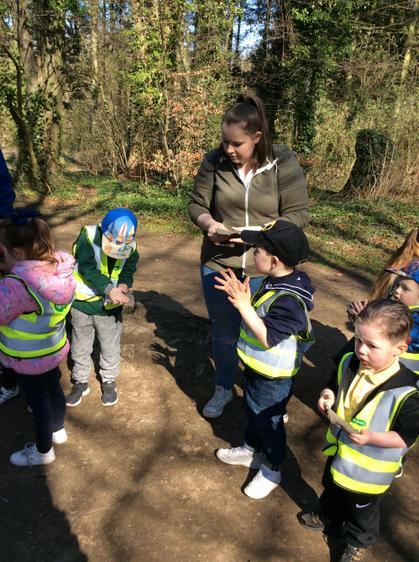 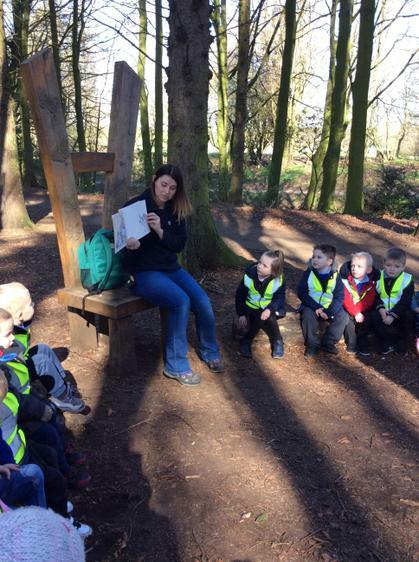 The children were so good and their listening skills were fanstastic in the woods. 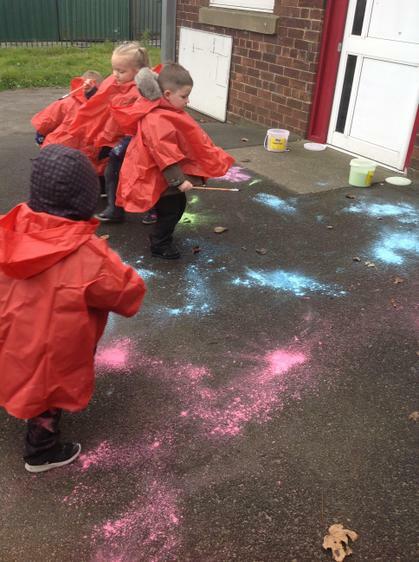 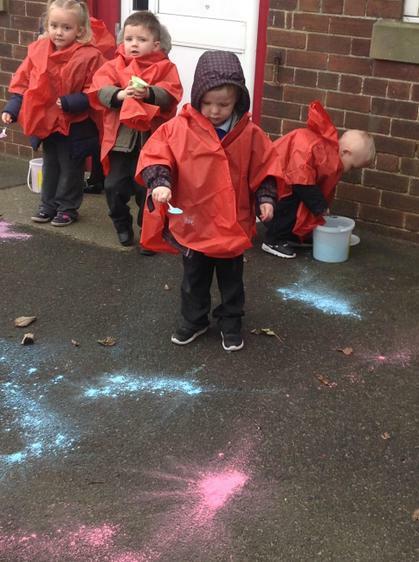 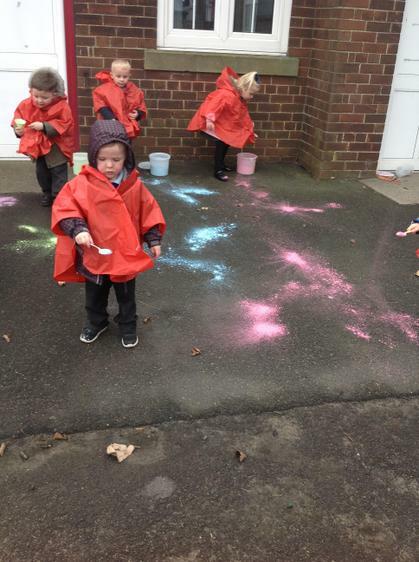 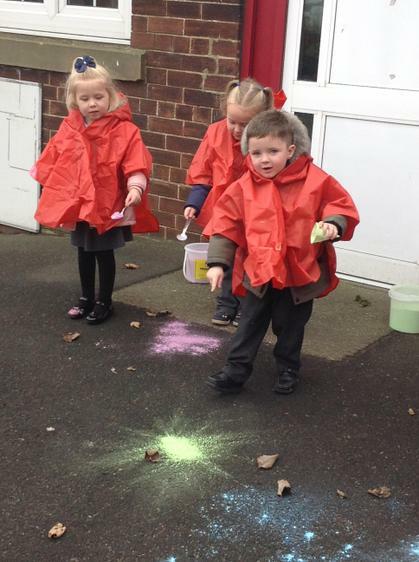 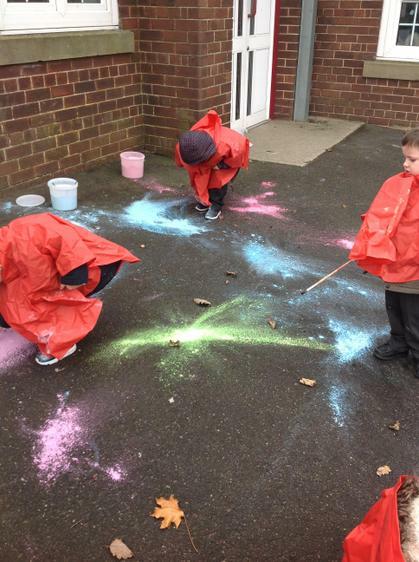 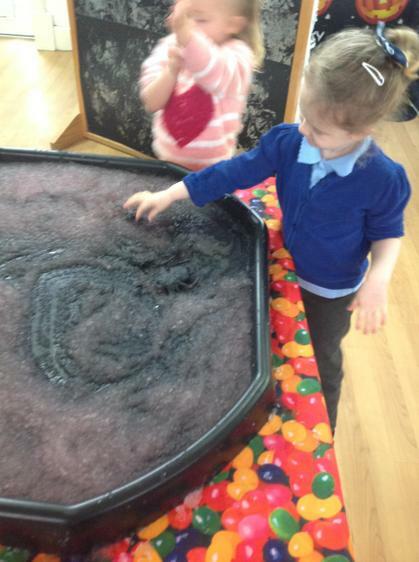 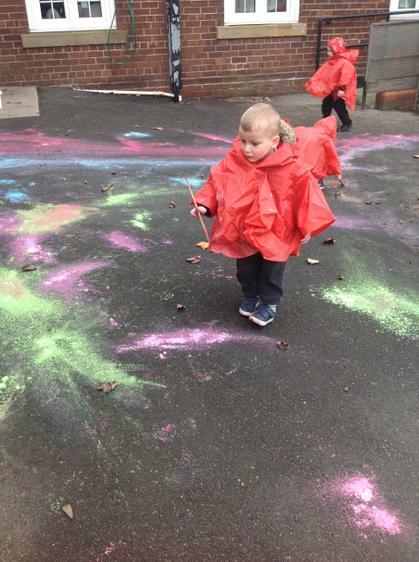 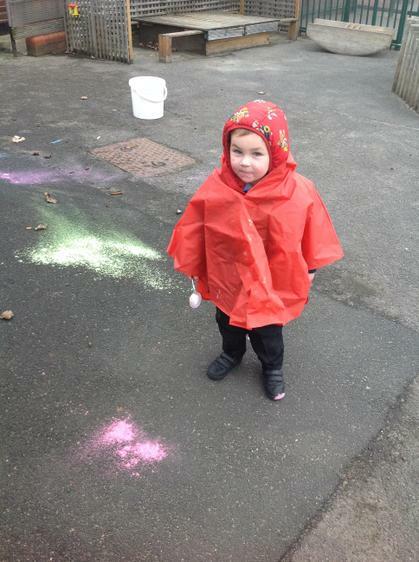 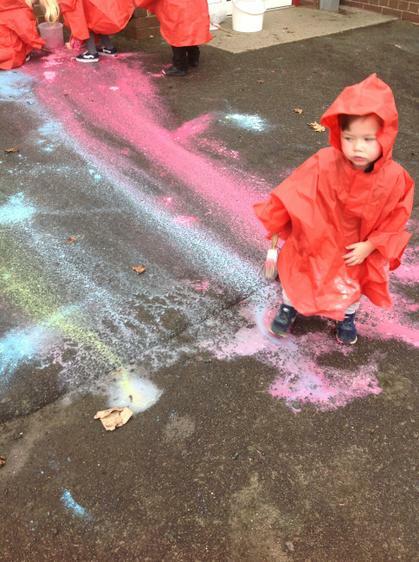 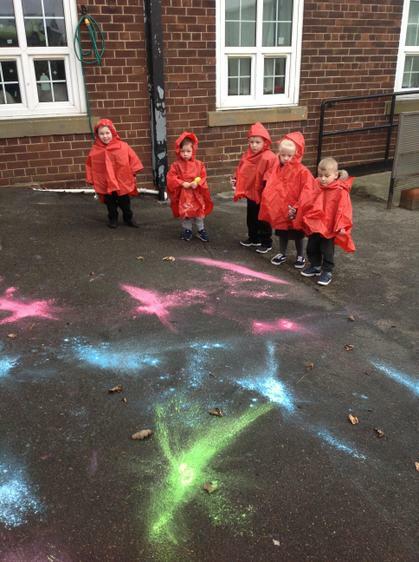 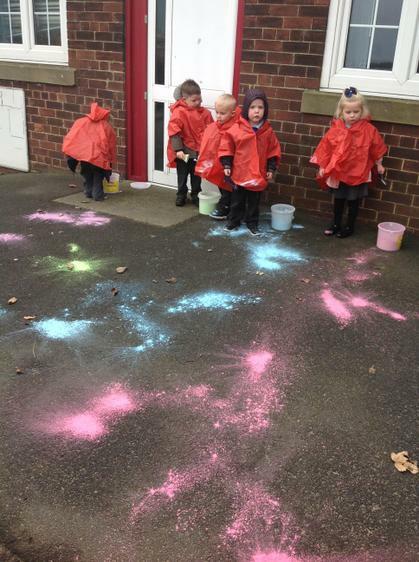 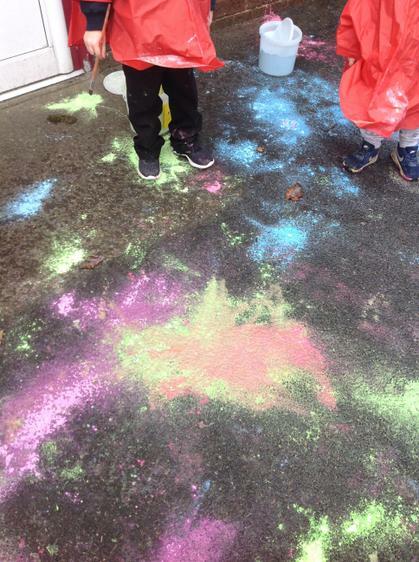 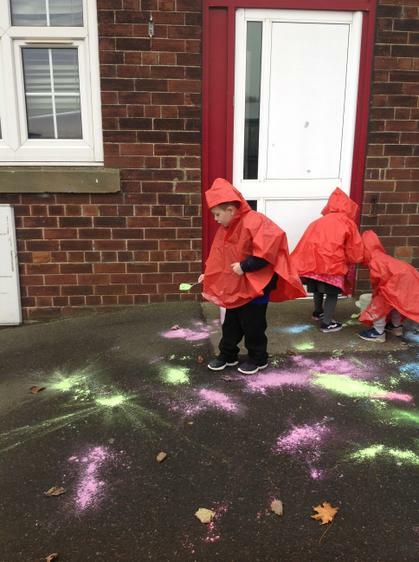 The children had lots of fun making Fireworks outside using powder paint in preparation for Bonfire night. 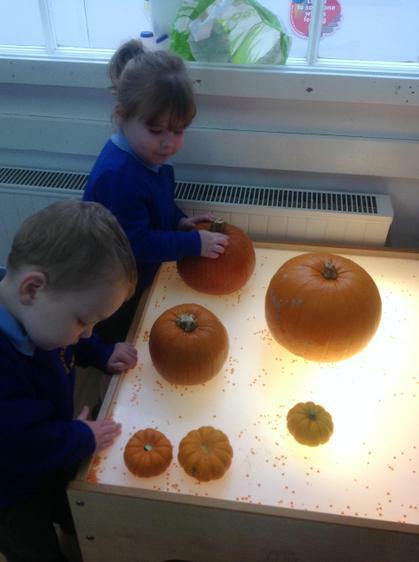 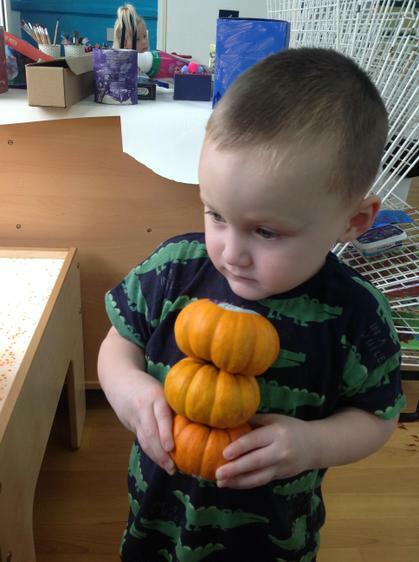 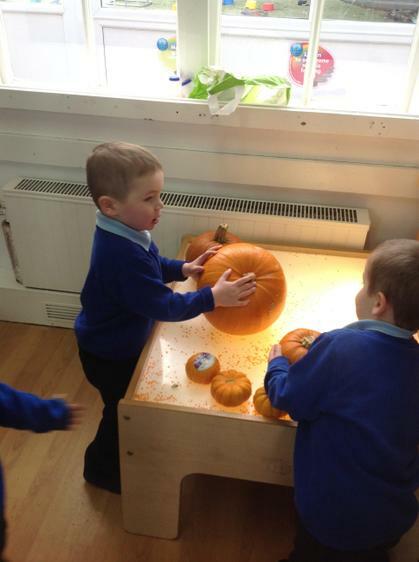 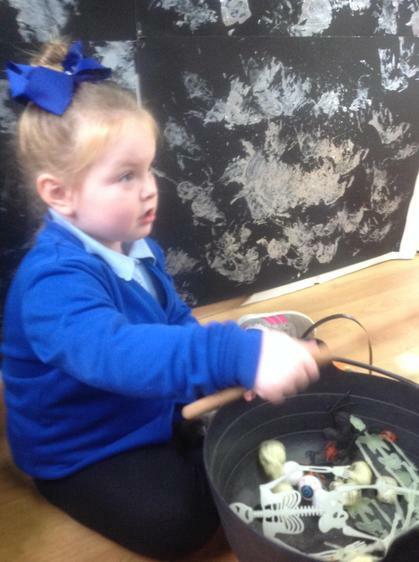 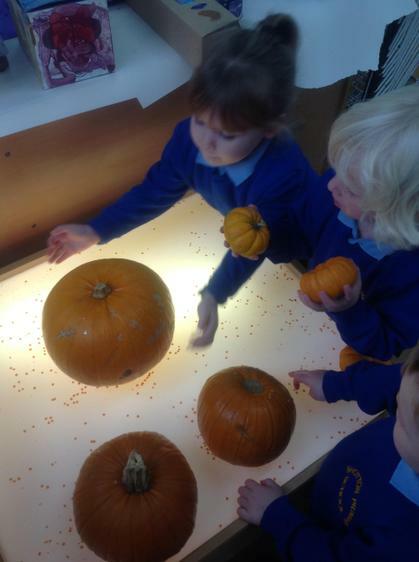 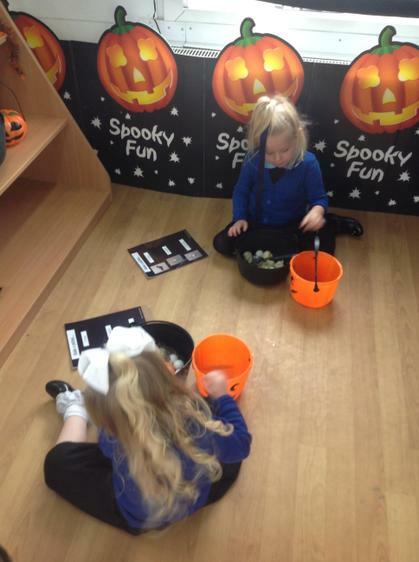 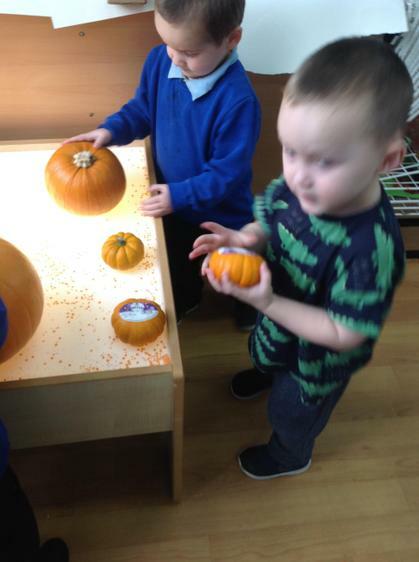 We have had so much fun exploring the spooky activities in Nursery! 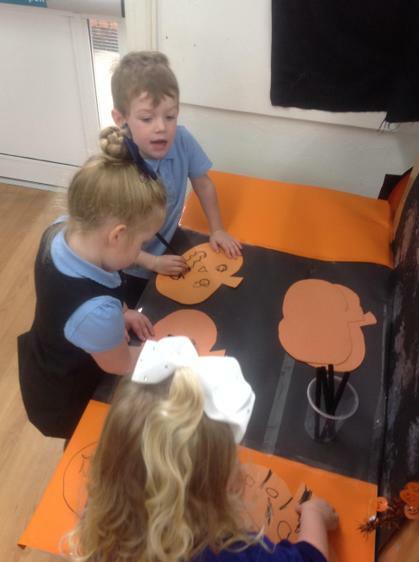 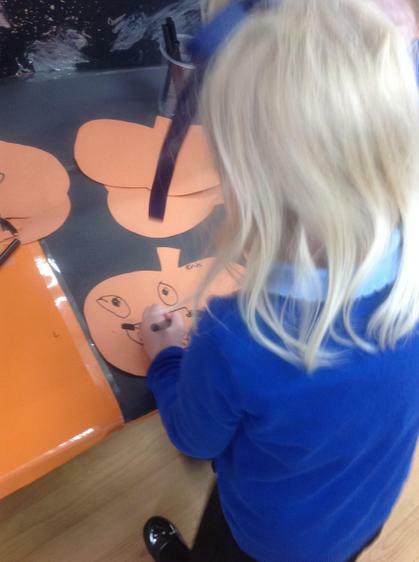 Ordering pumpkins, drawing scary pumpkin faces, gloopy spider counting, making potions and spells in the spooky cave. 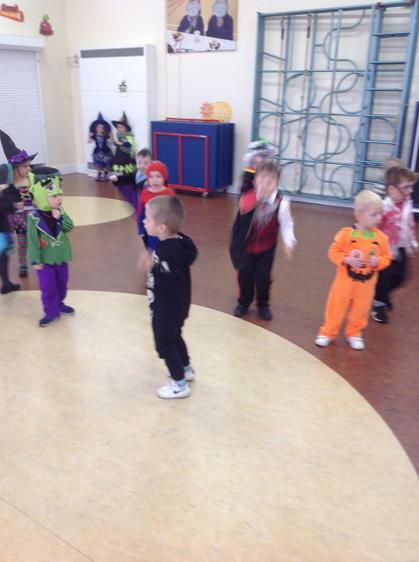 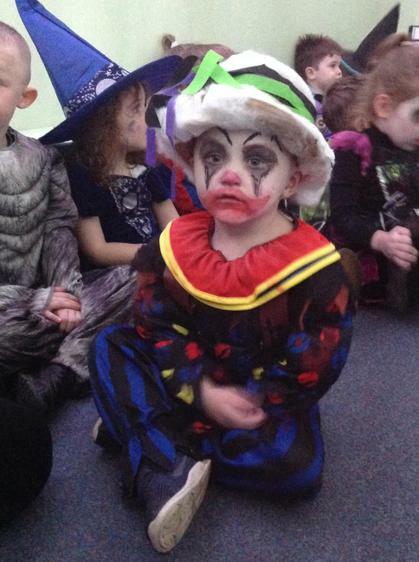 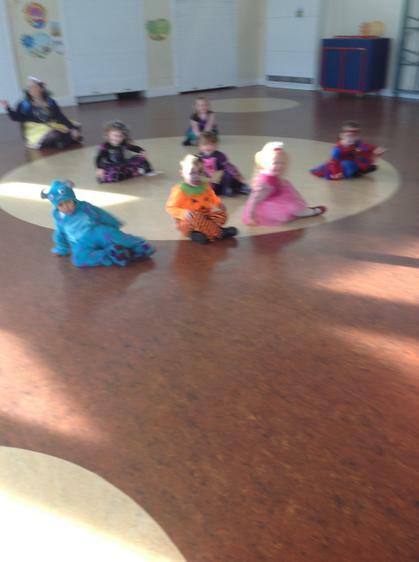 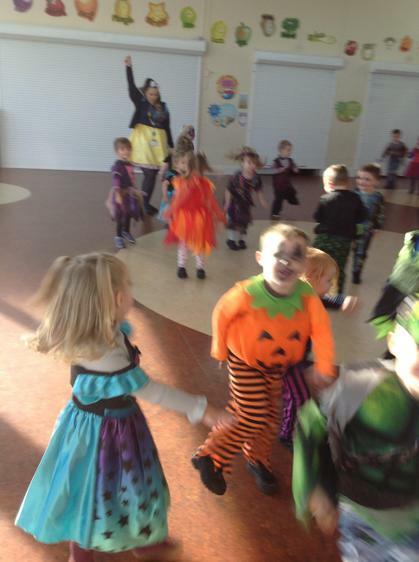 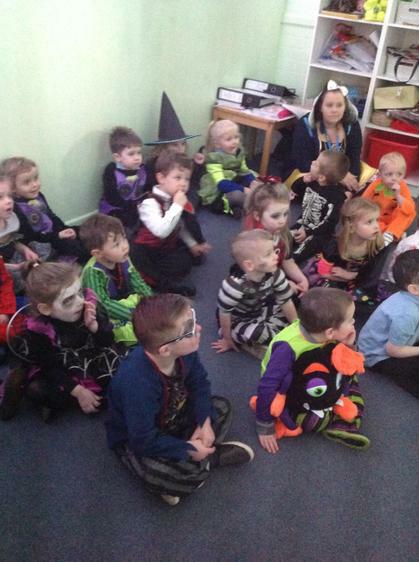 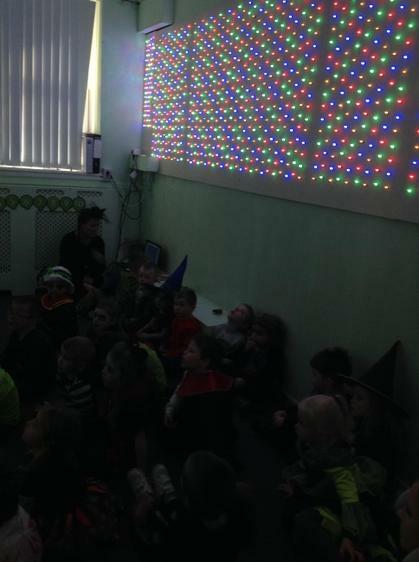 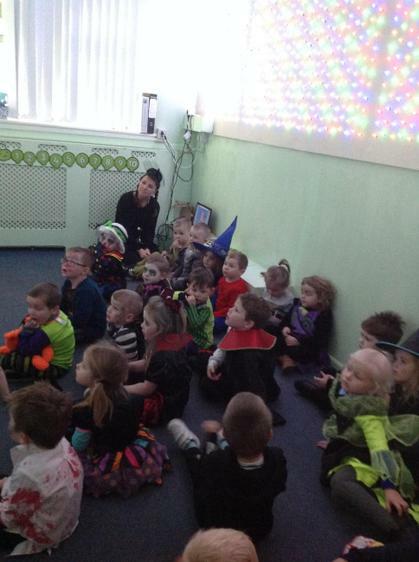 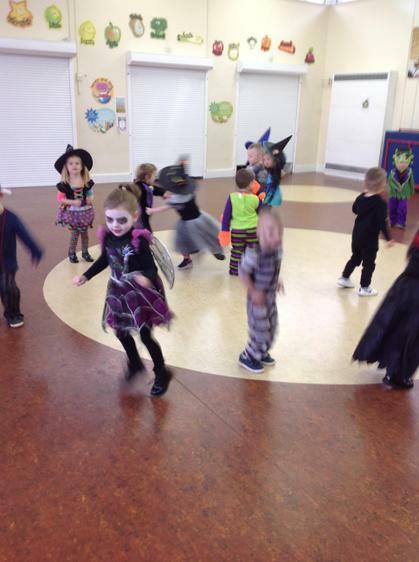 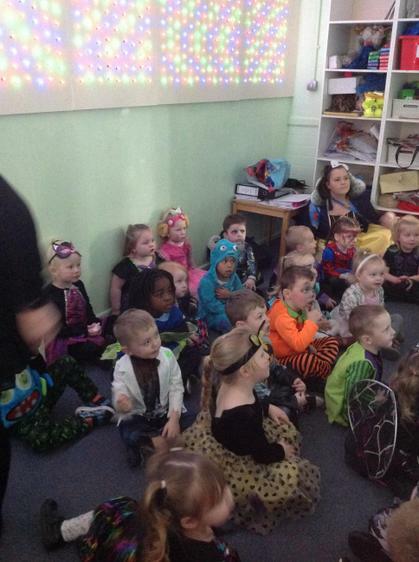 Then to top it all off we finished with our fantastic Halloween party and spooky cinema! 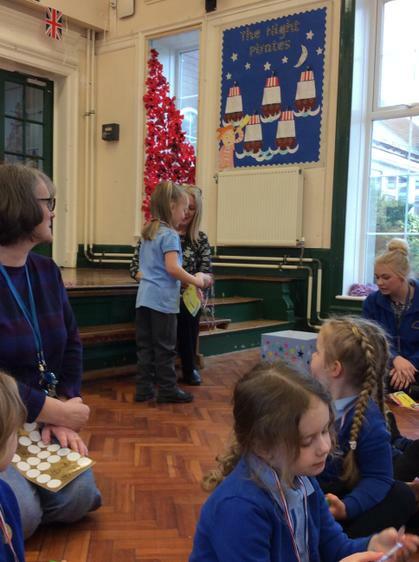 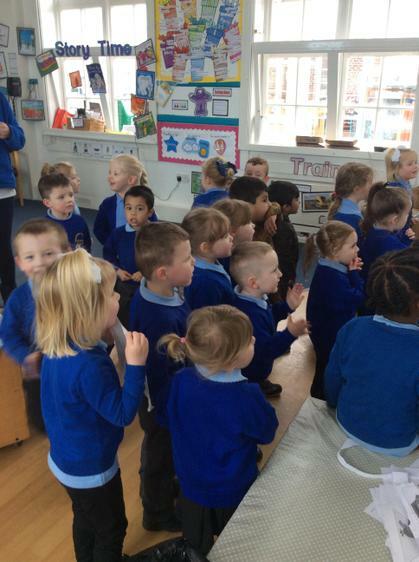 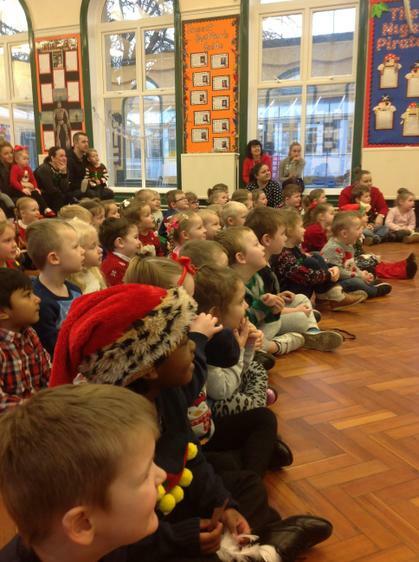 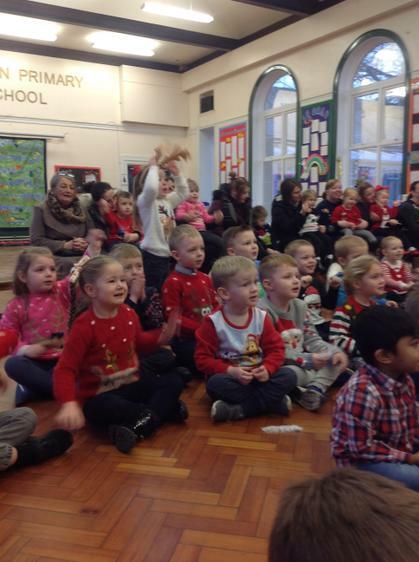 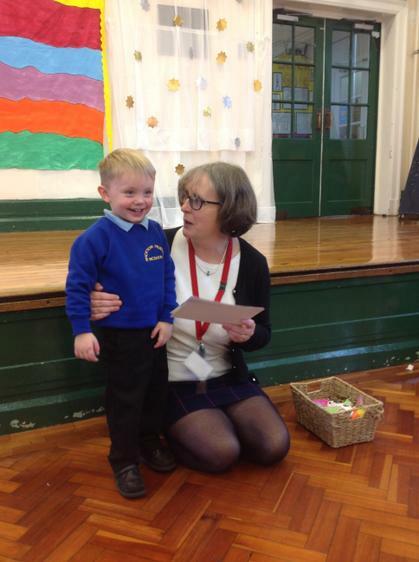 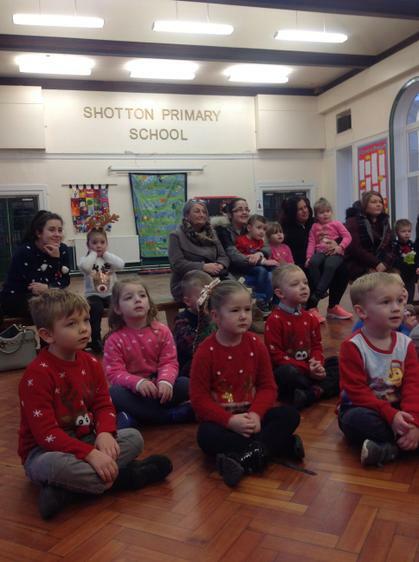 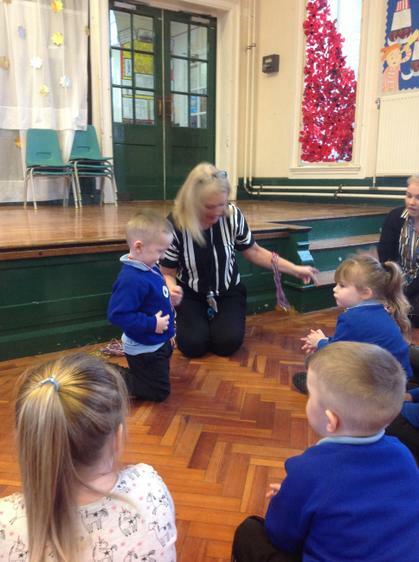 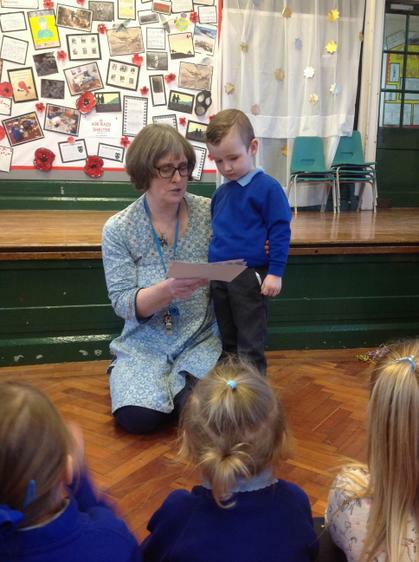 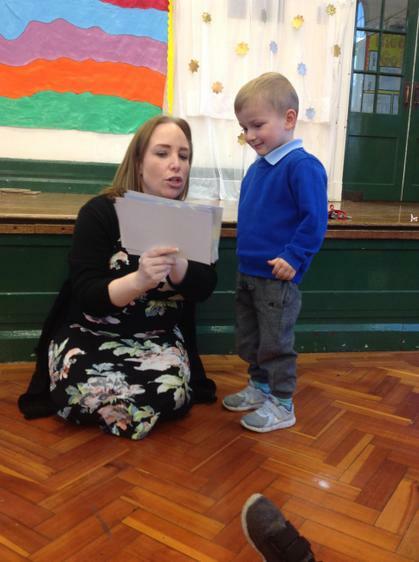 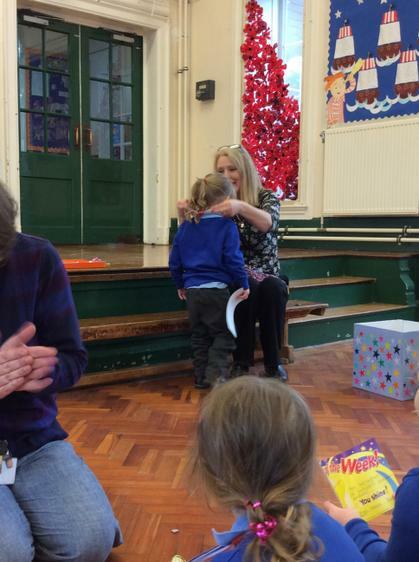 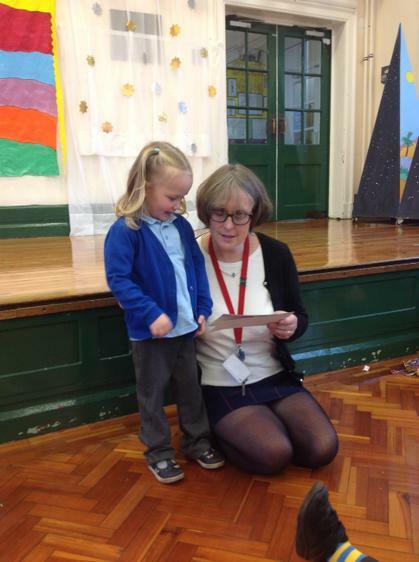 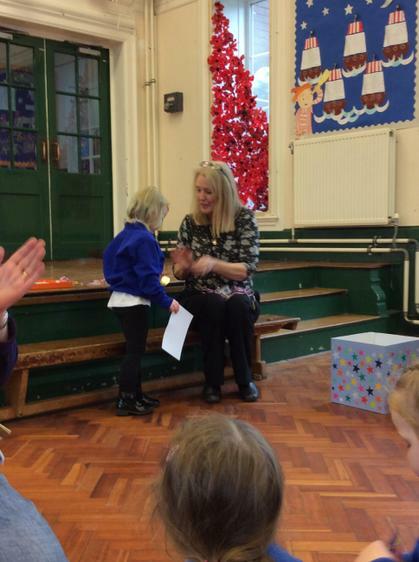 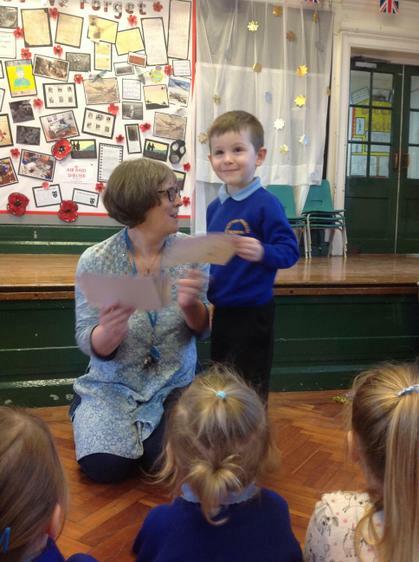 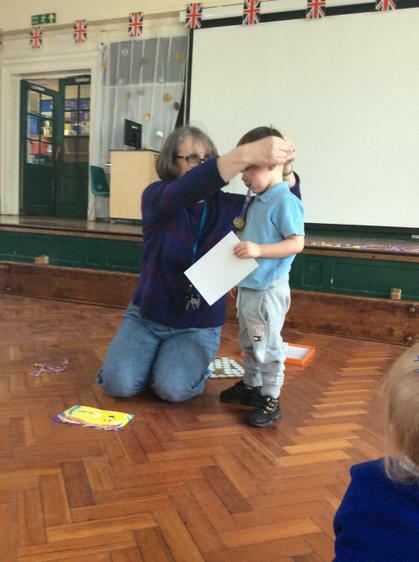 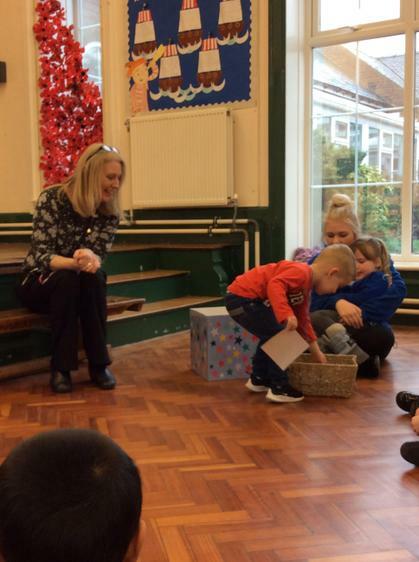 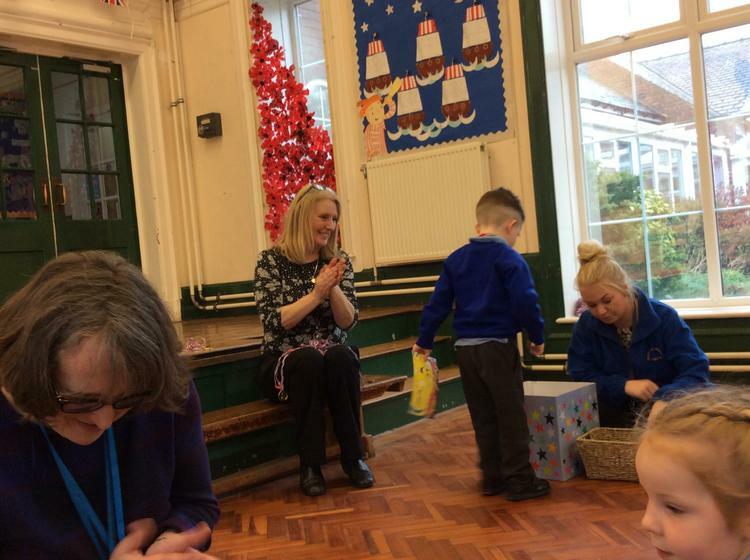 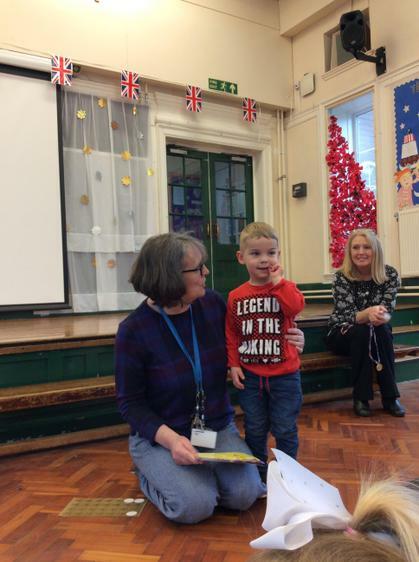 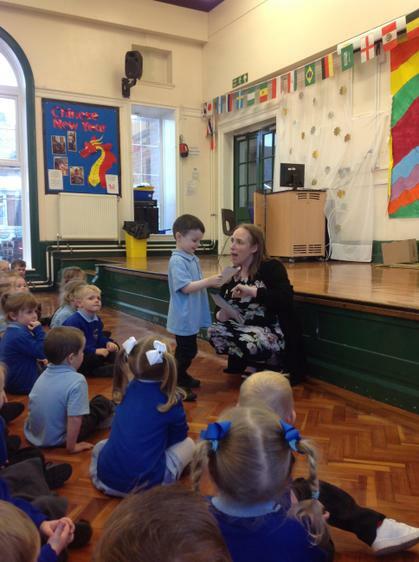 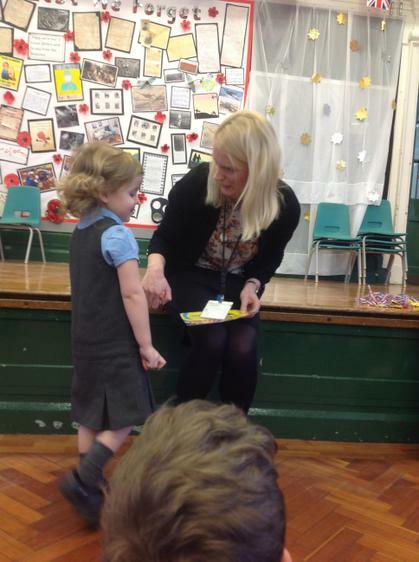 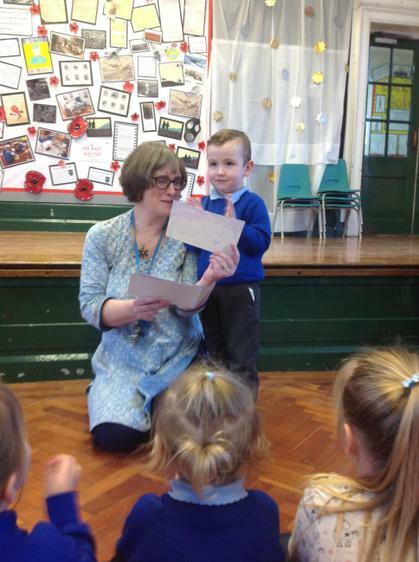 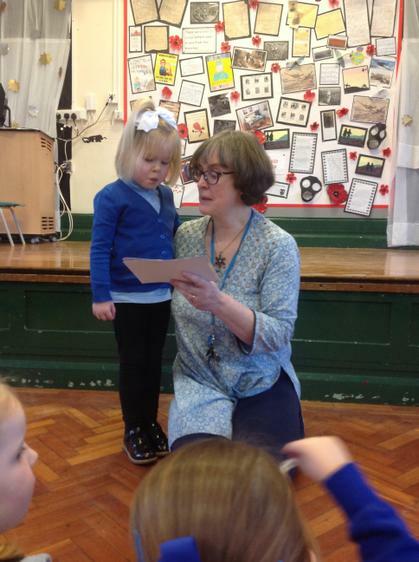 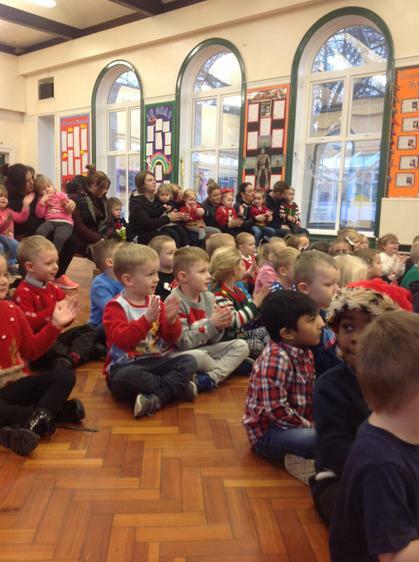 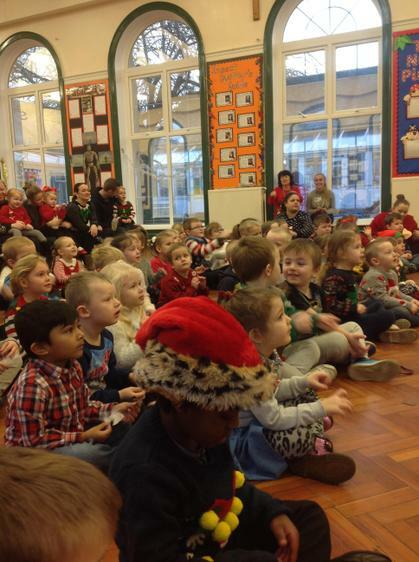 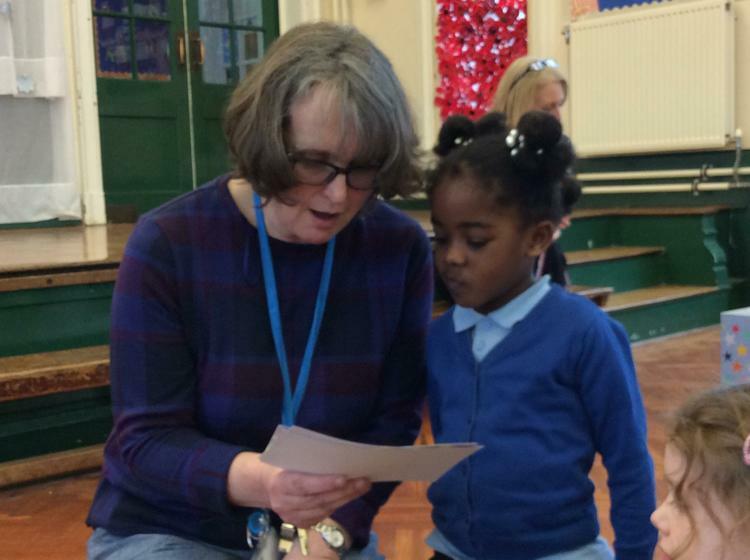 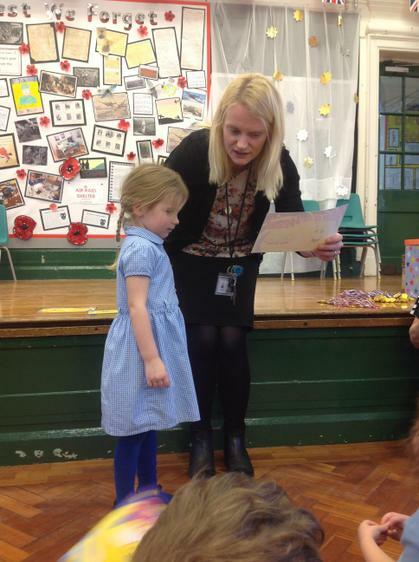 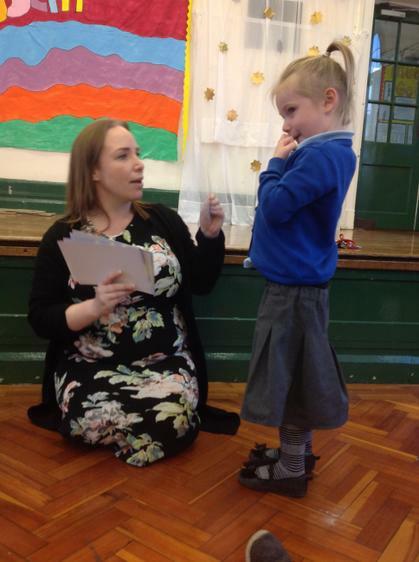 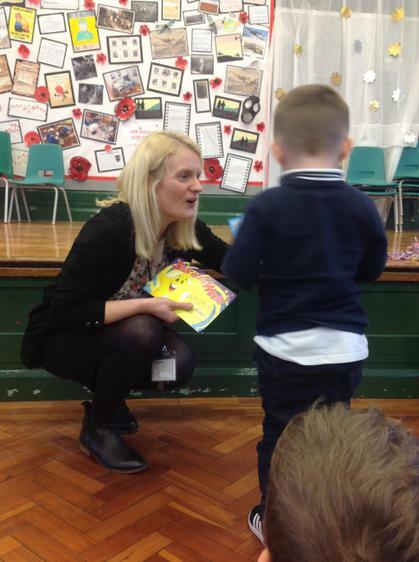 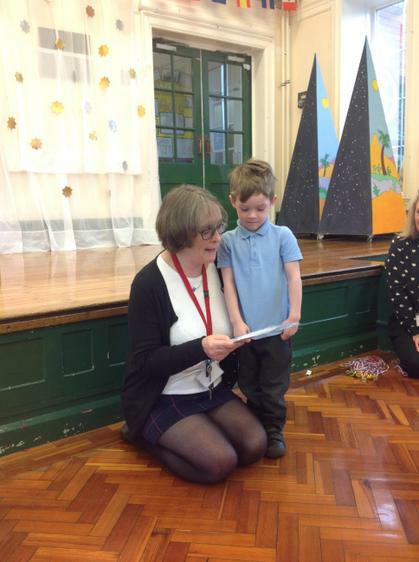 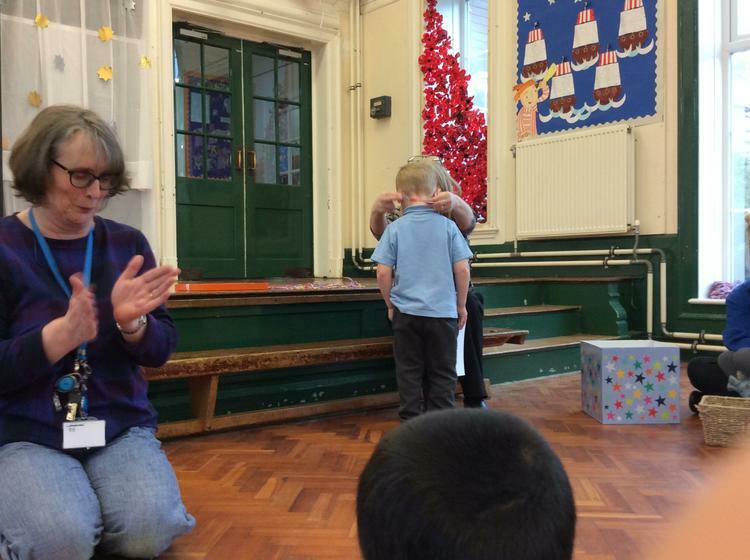 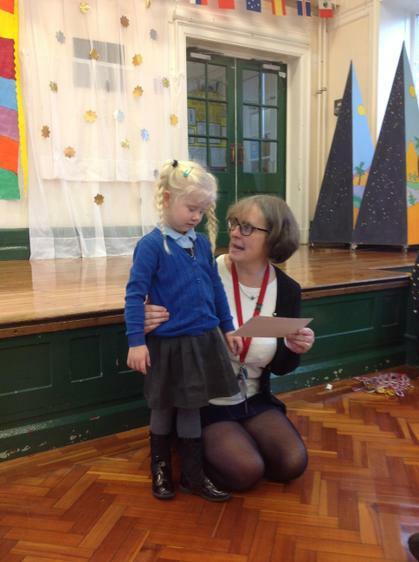 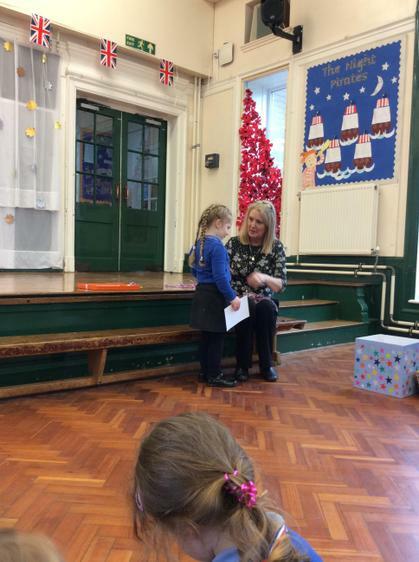 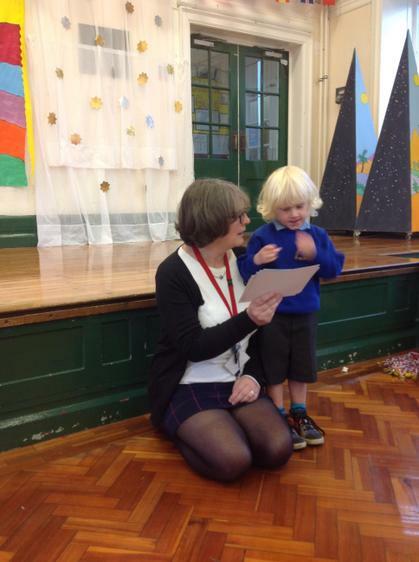 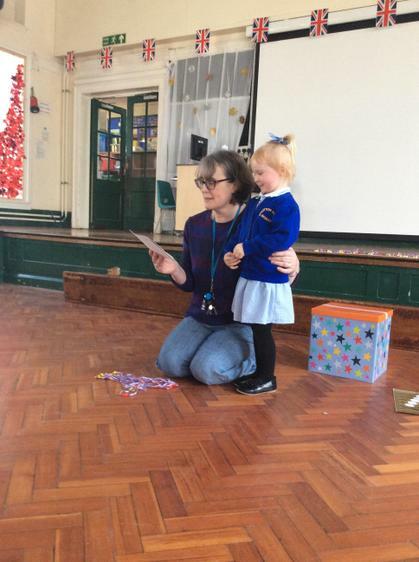 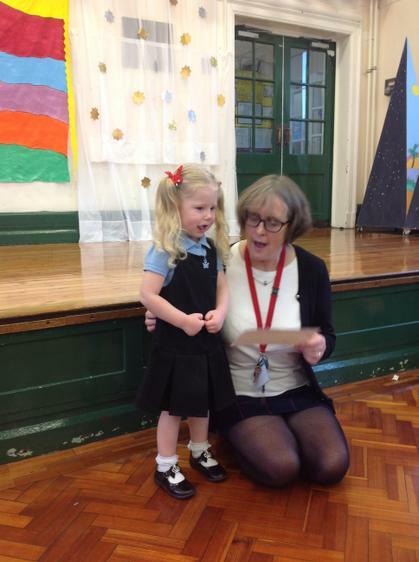 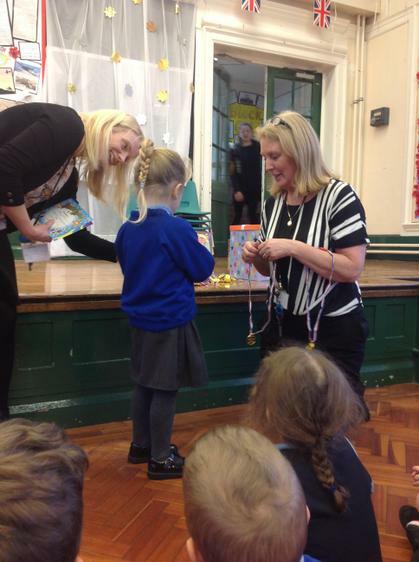 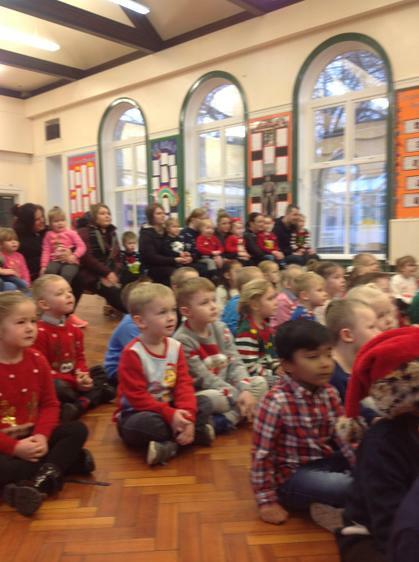 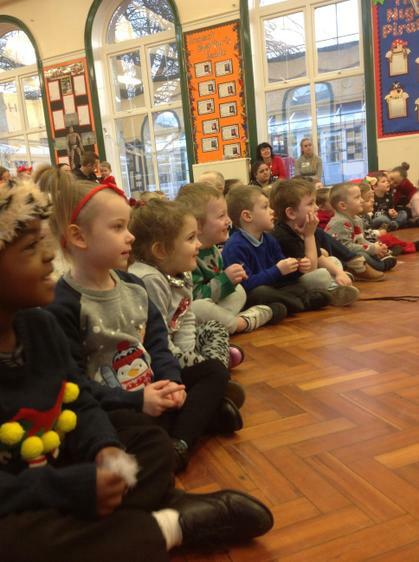 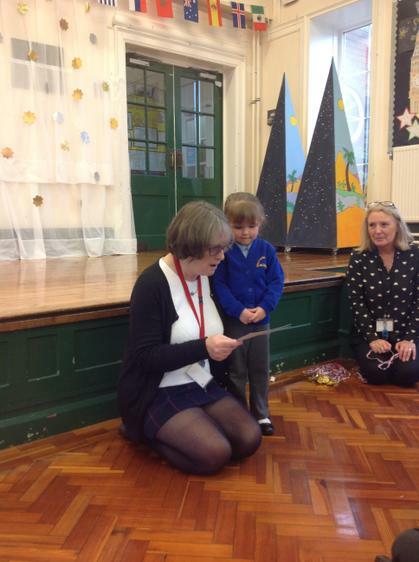 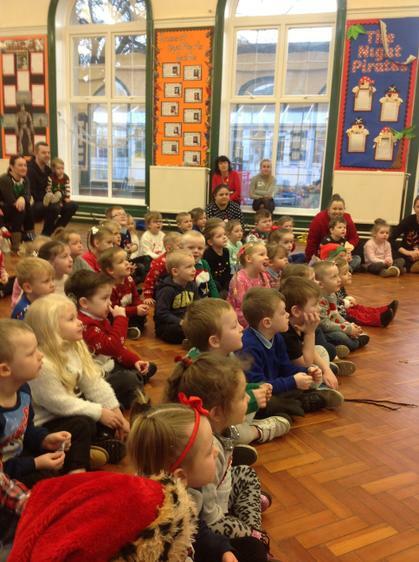 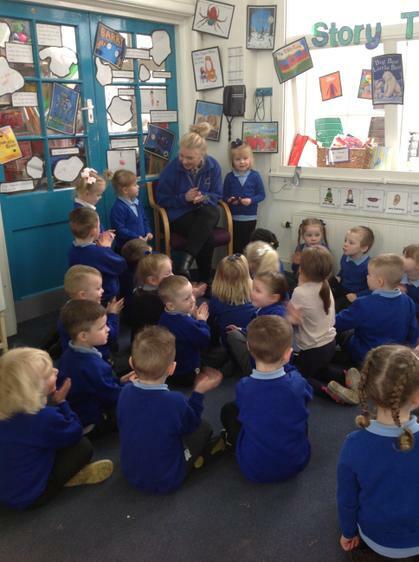 The nursery team are super proud of how our nursery children sat in their first celebration assembly of the year. 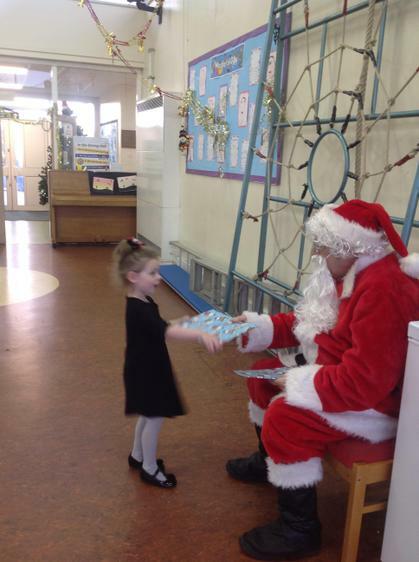 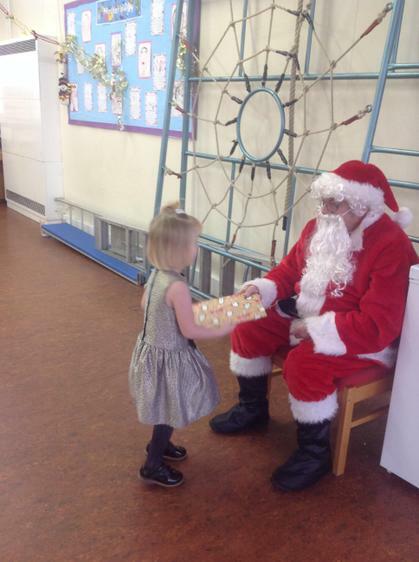 Our boys and girls have worked their socks off and it is a pleasure to reward them for their amazing efforts. 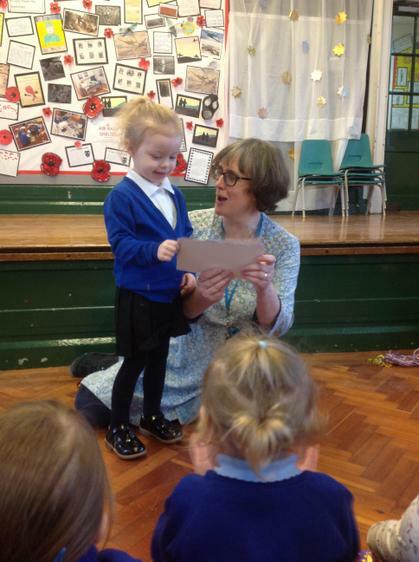 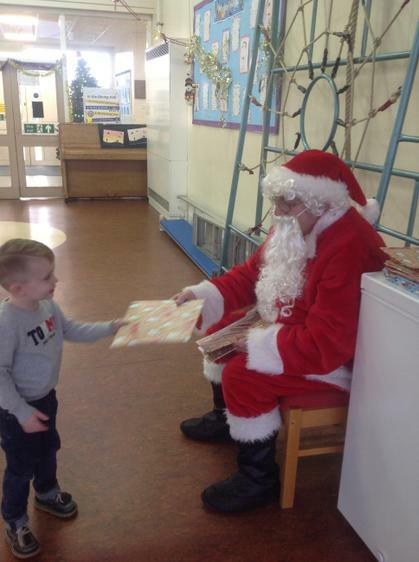 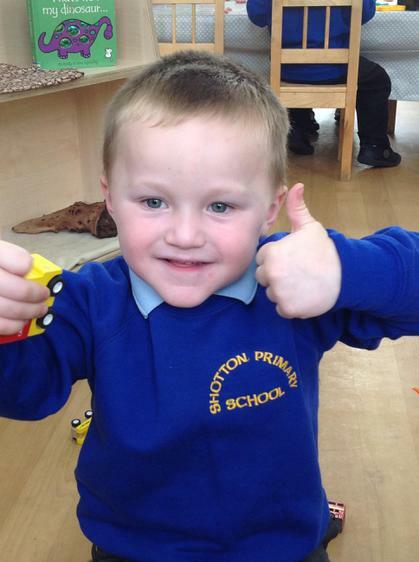 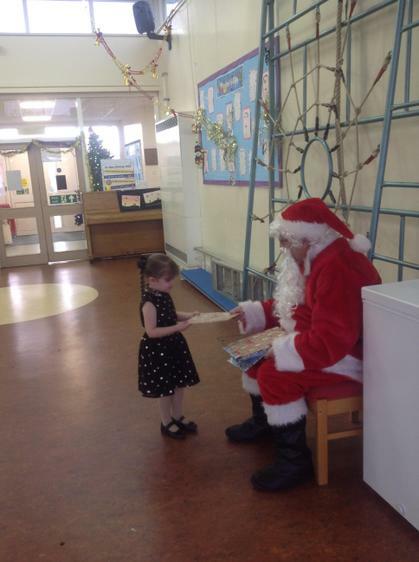 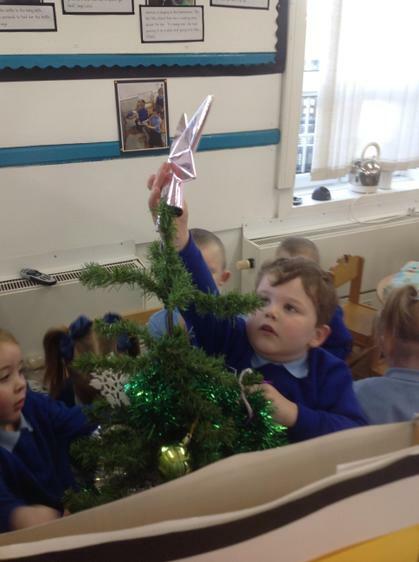 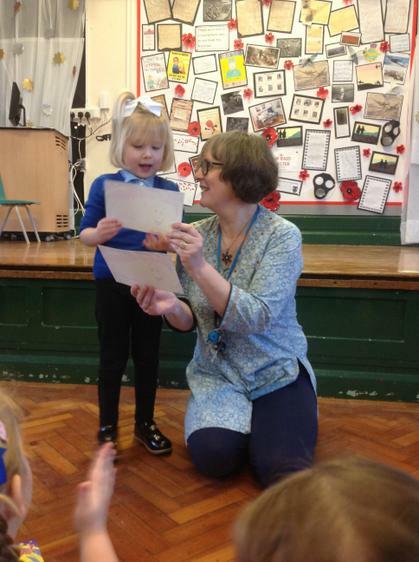 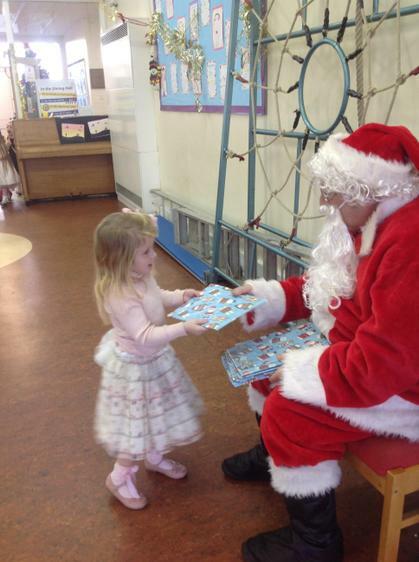 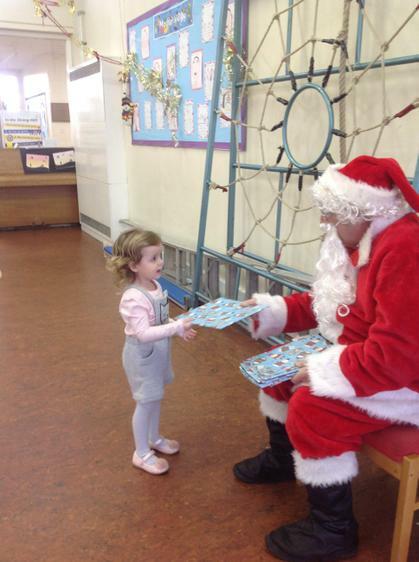 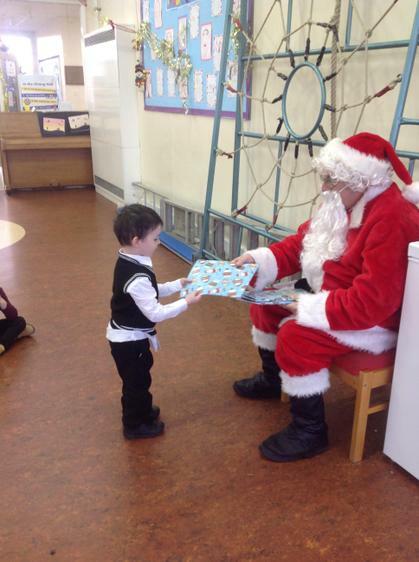 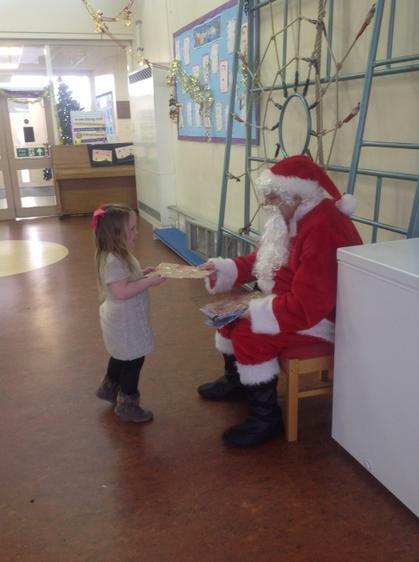 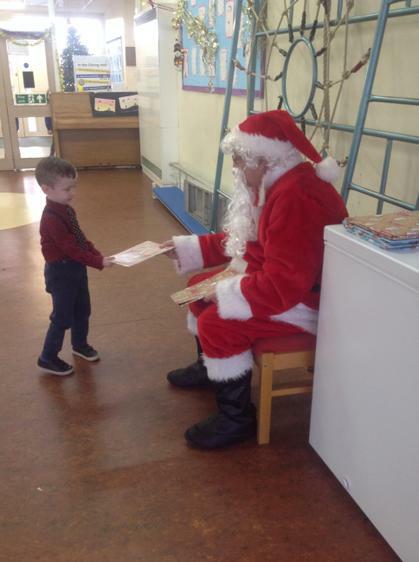 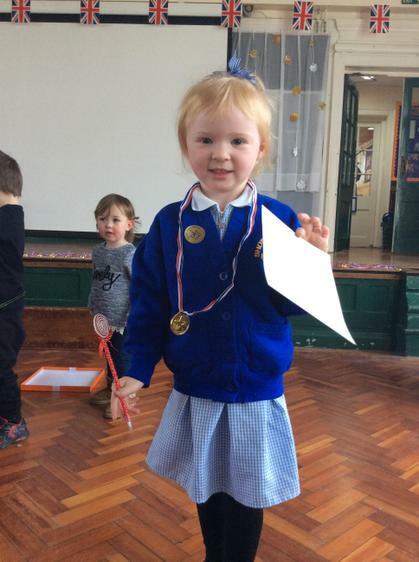 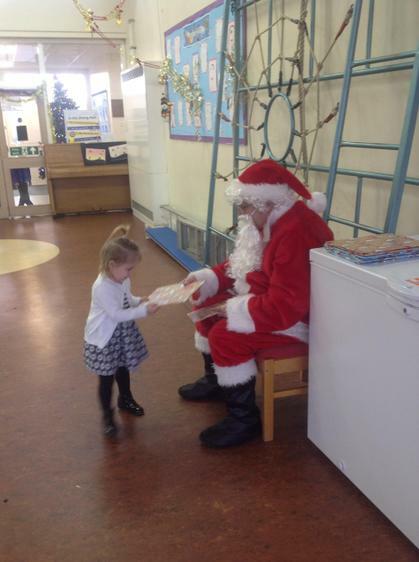 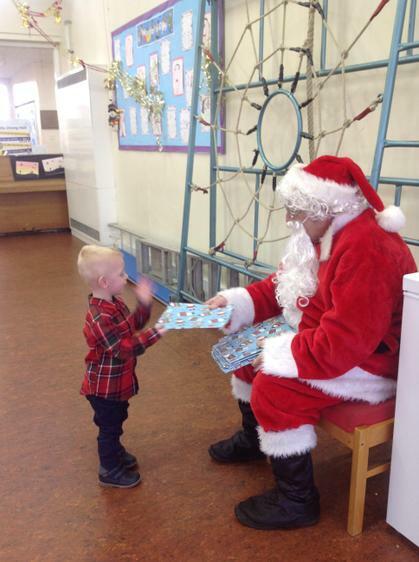 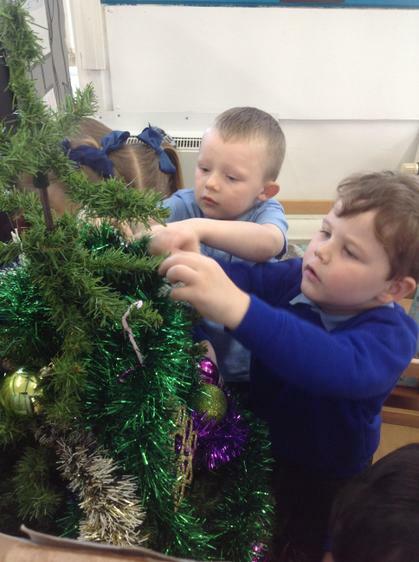 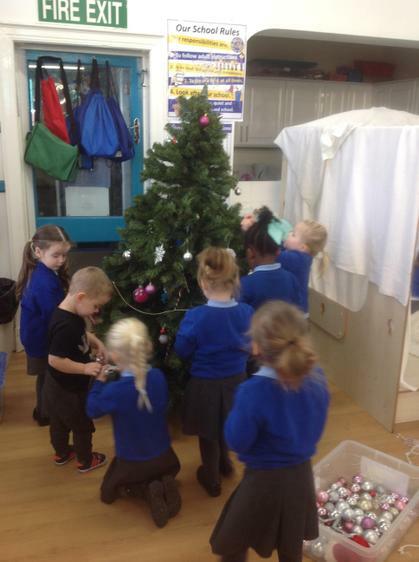 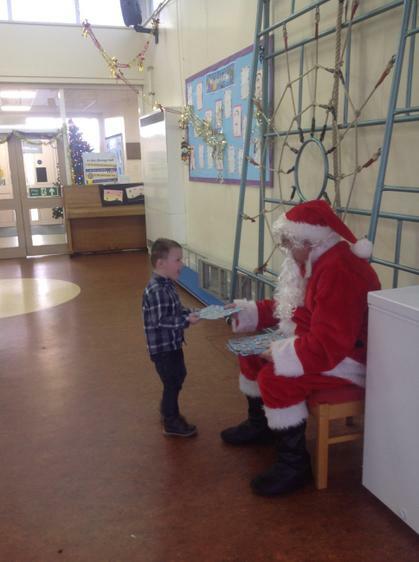 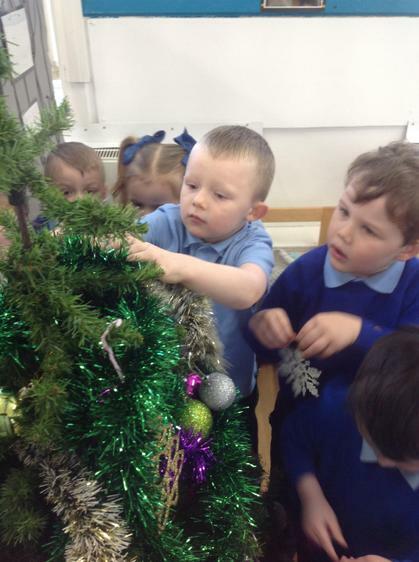 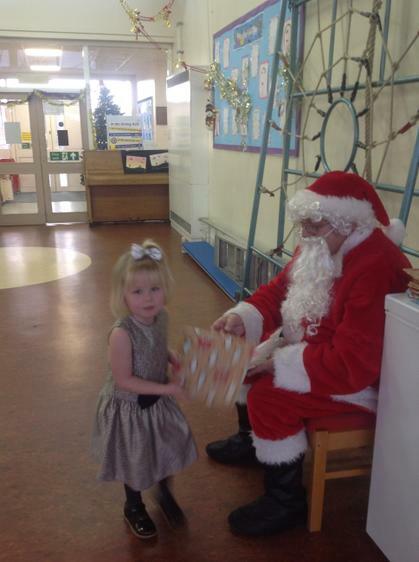 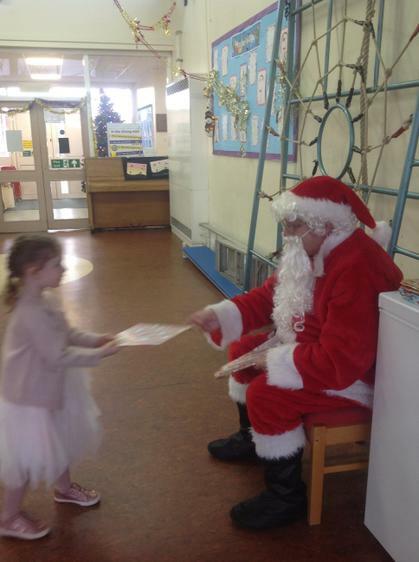 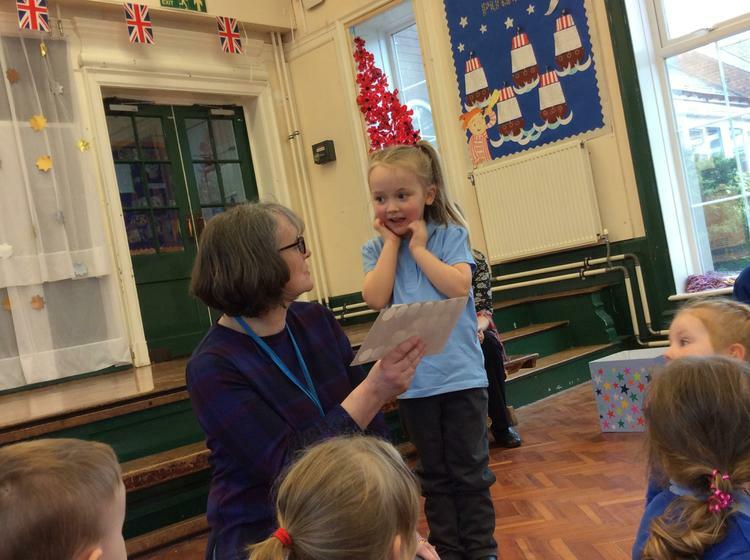 Well done nursery! 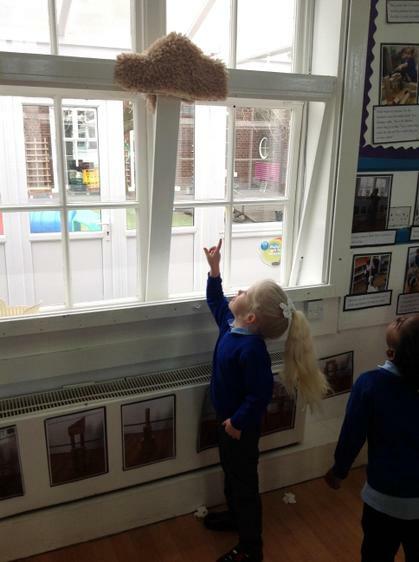 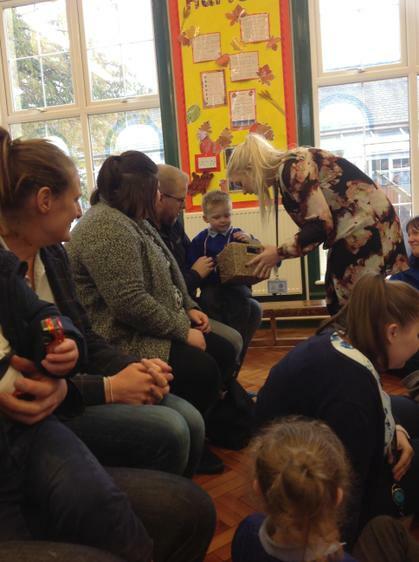 The children have been asking questions about hedgehogs? 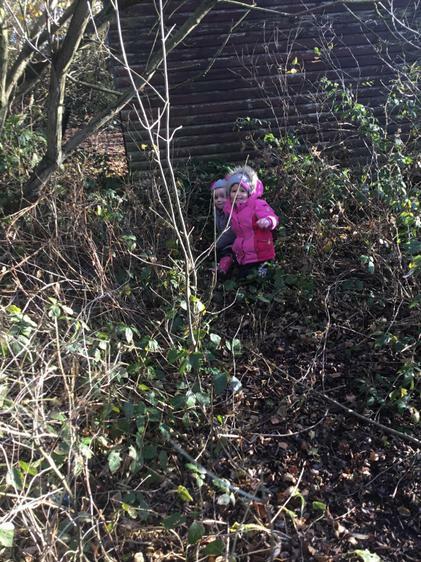 Where do they live? 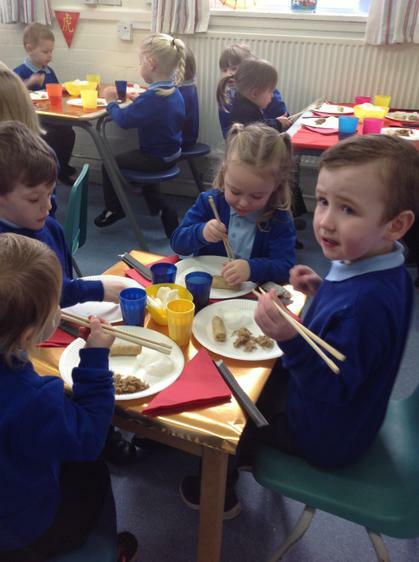 What do they eat? 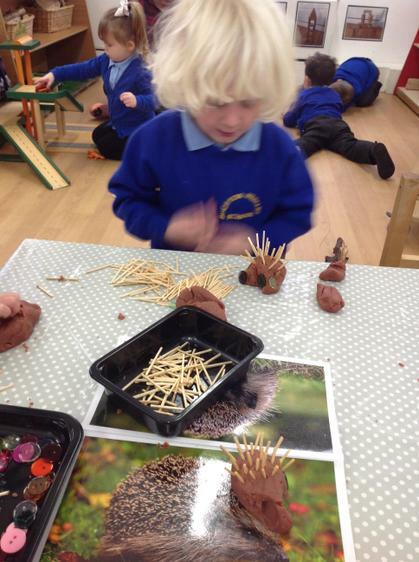 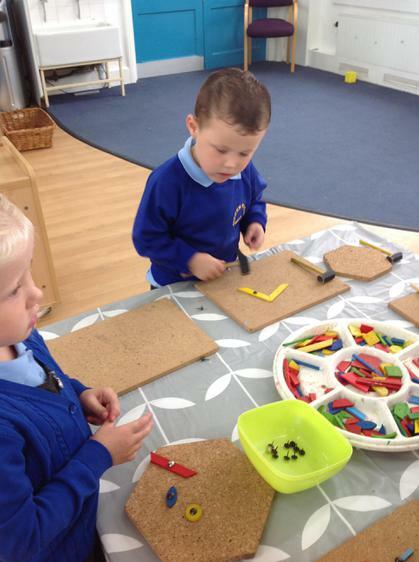 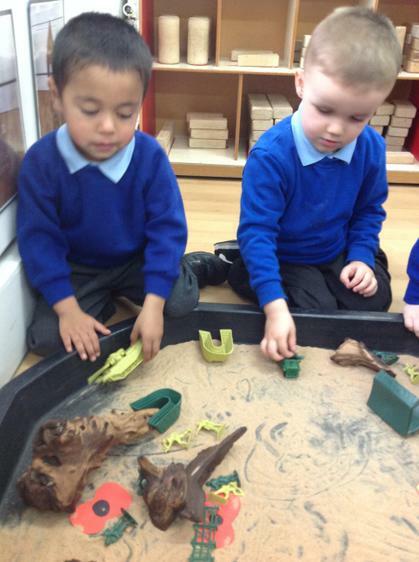 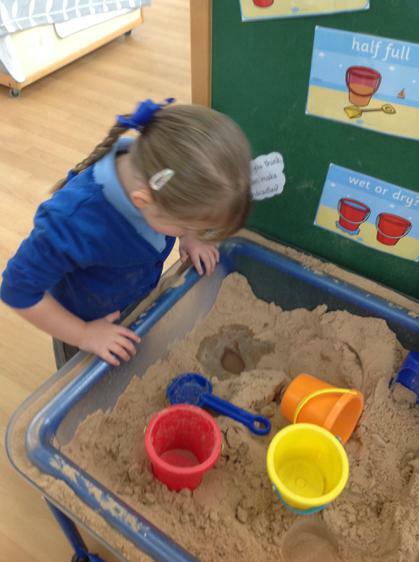 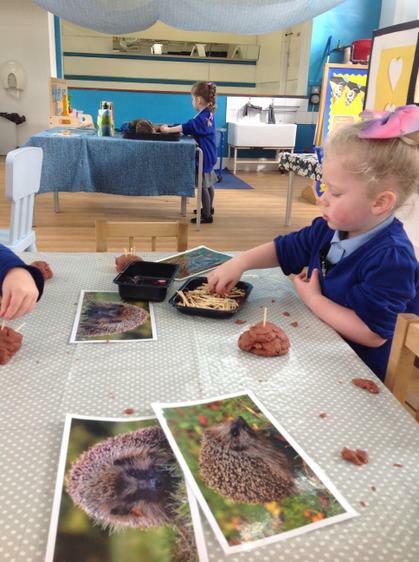 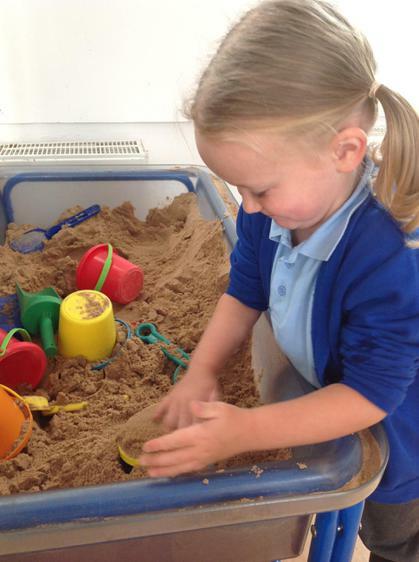 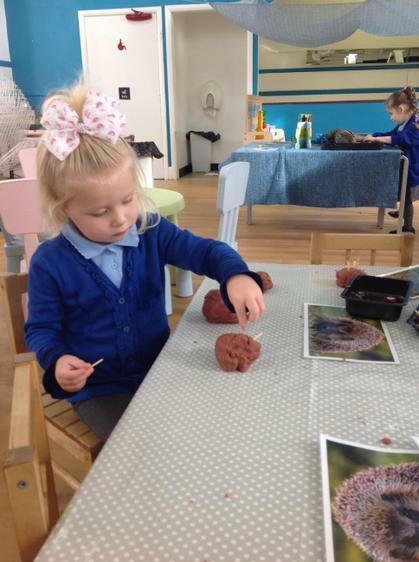 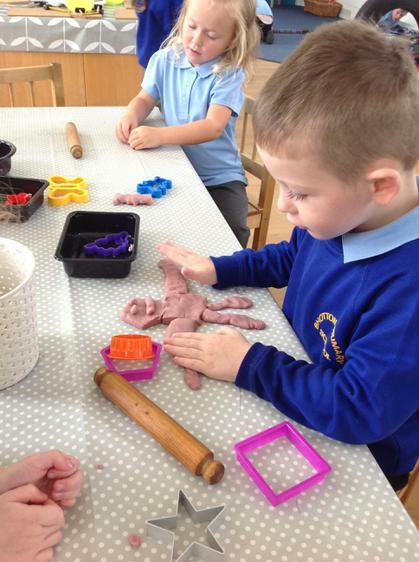 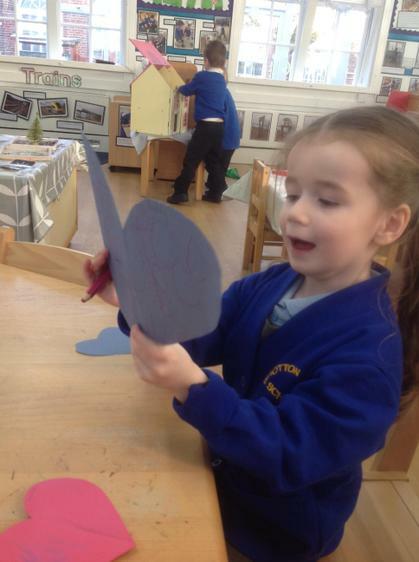 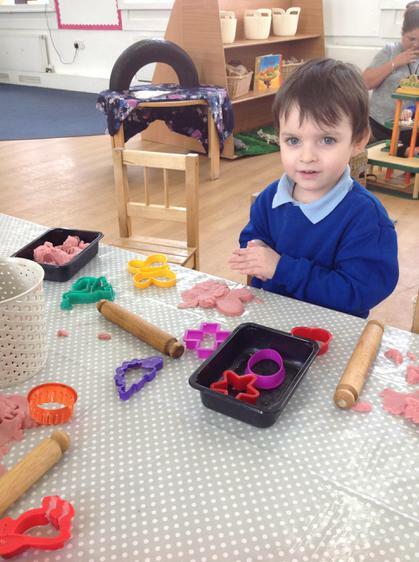 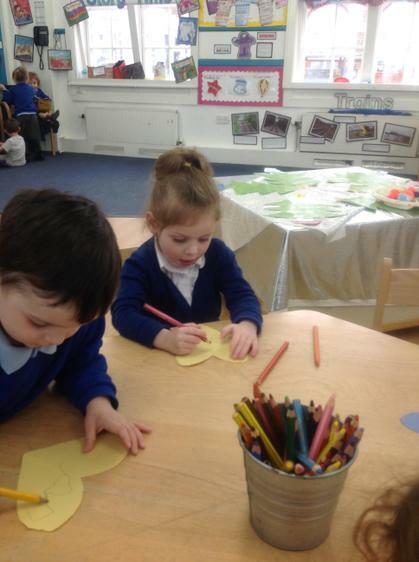 We have had lots of fun creating hedgehogs in the play dough area. 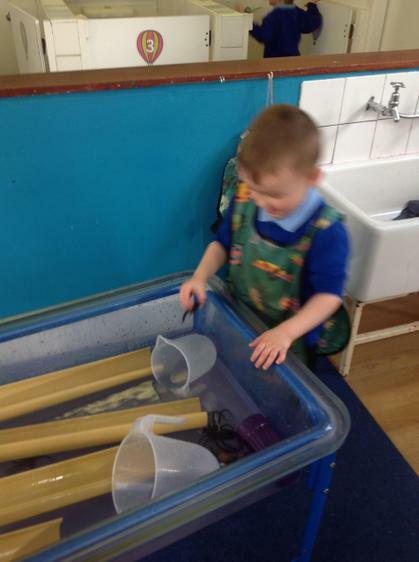 It was tricky fitting in all of their spikes! 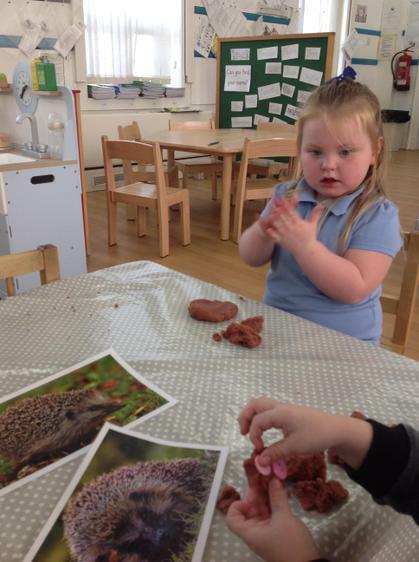 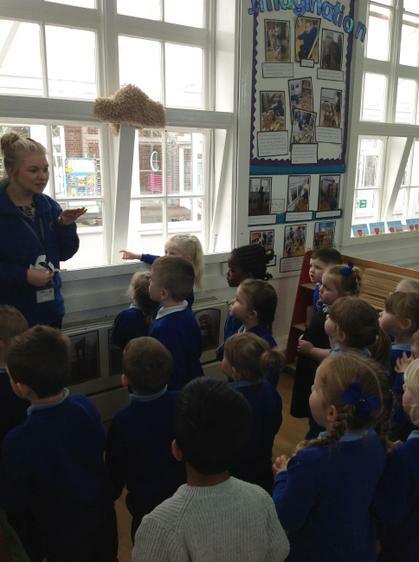 We had a look at pictures of real hedgehogs so we could see how many eyes they have and what shape their bodies are. 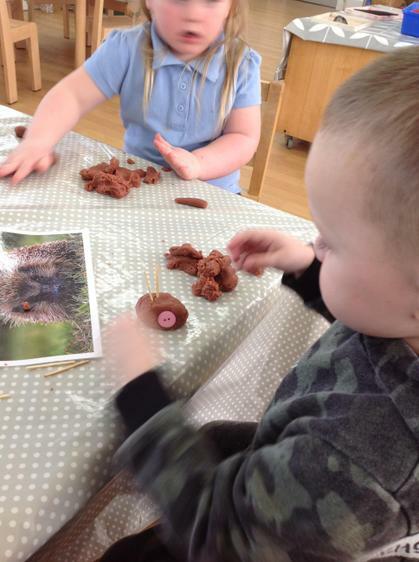 Have you seen a real hedgehog before? 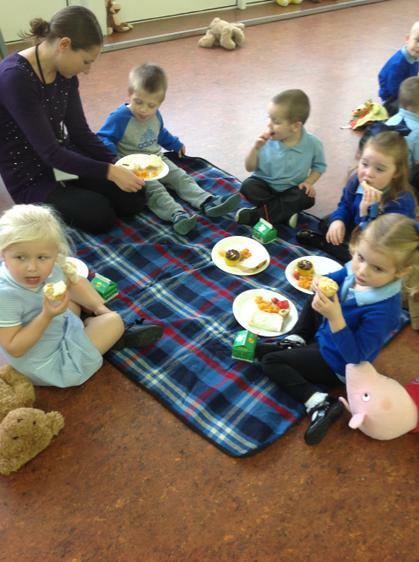 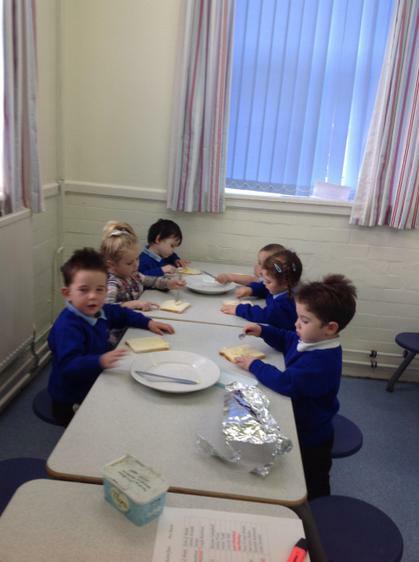 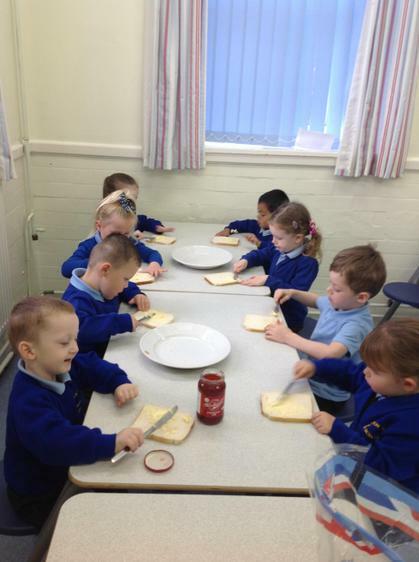 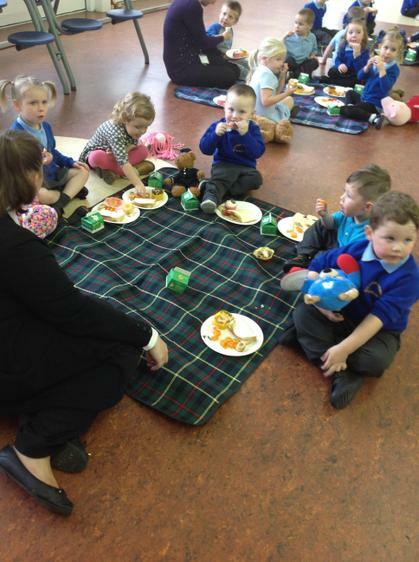 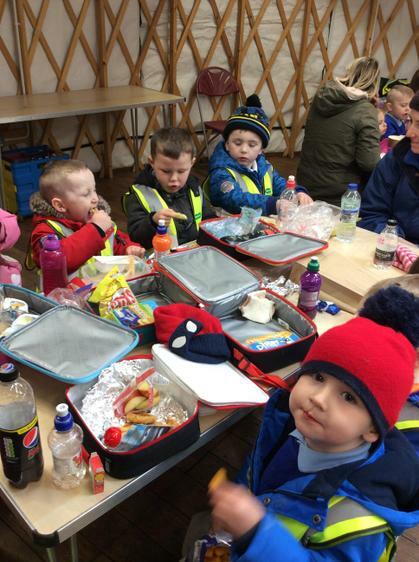 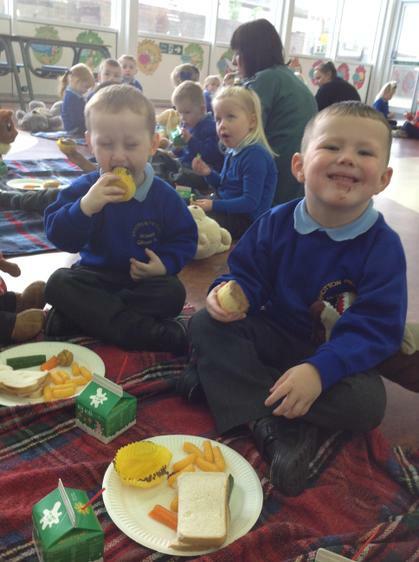 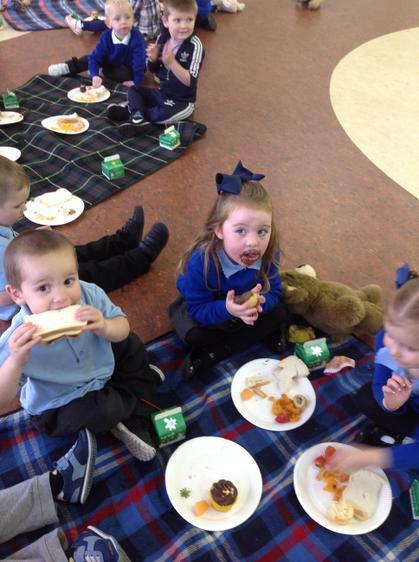 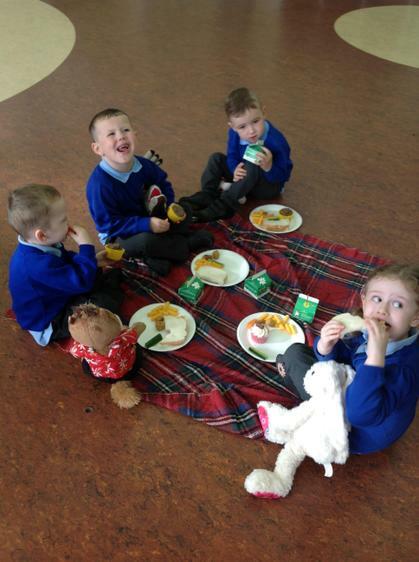 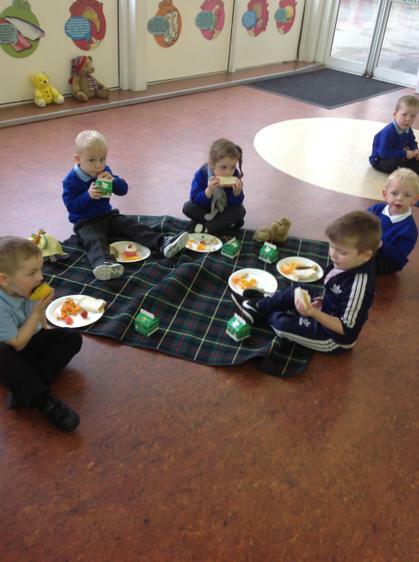 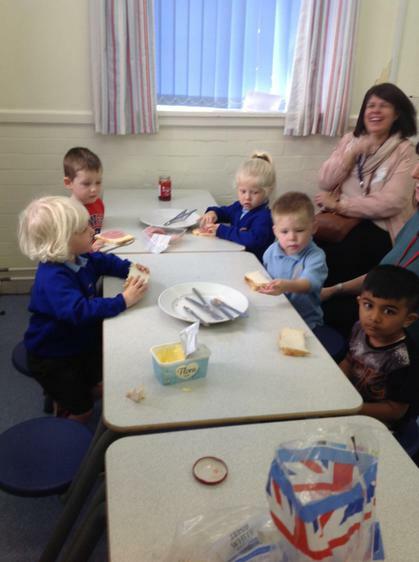 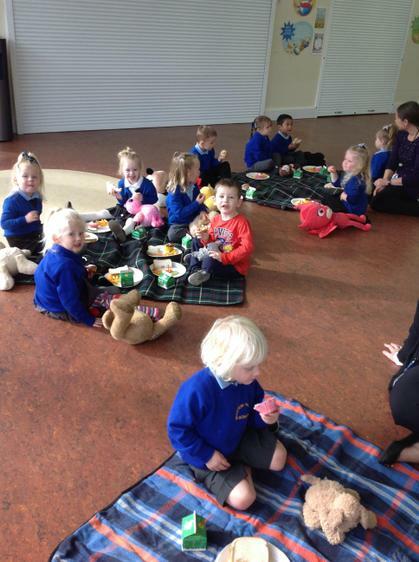 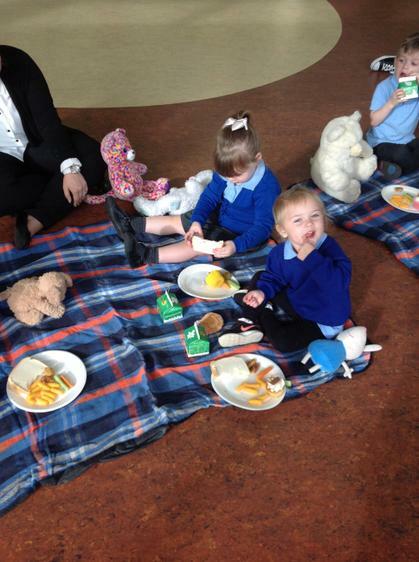 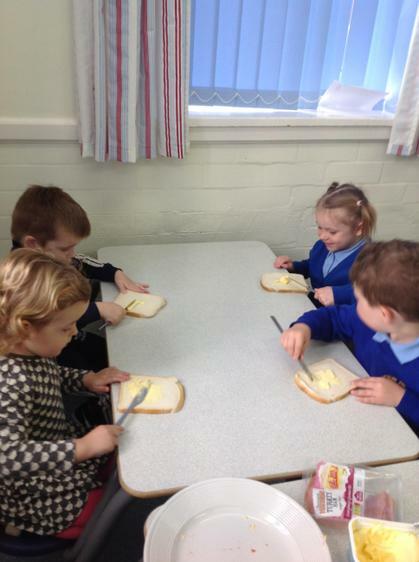 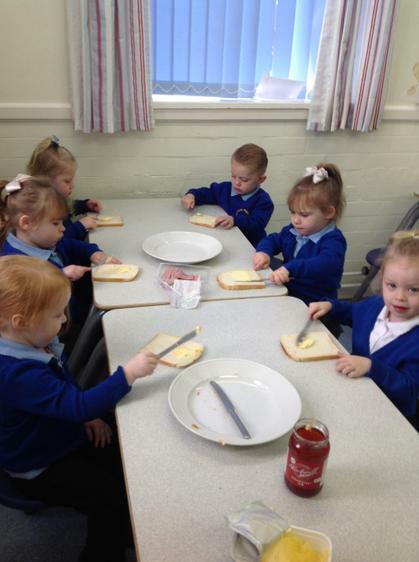 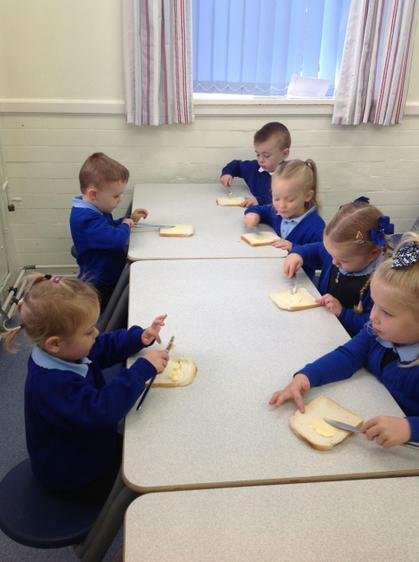 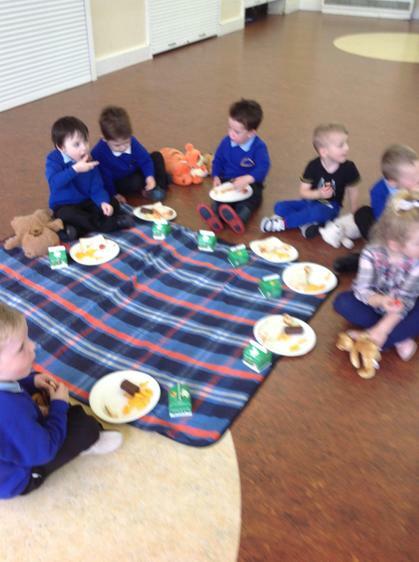 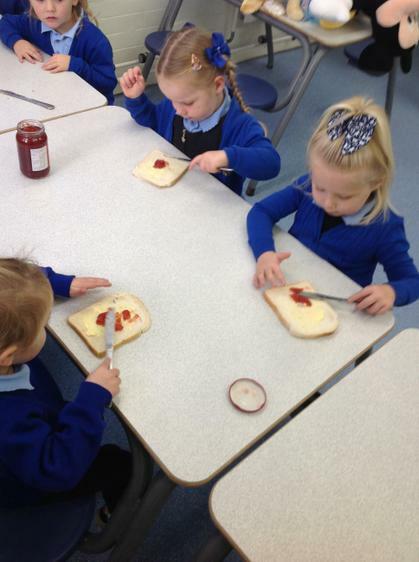 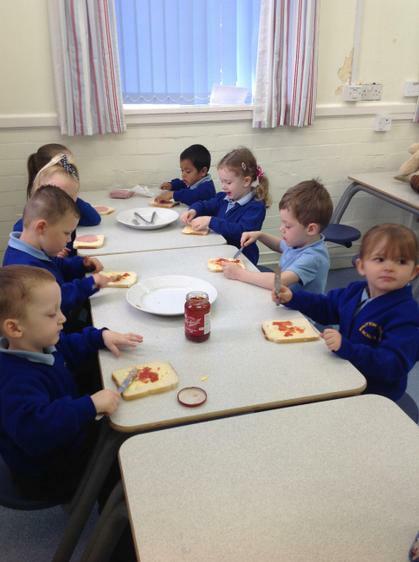 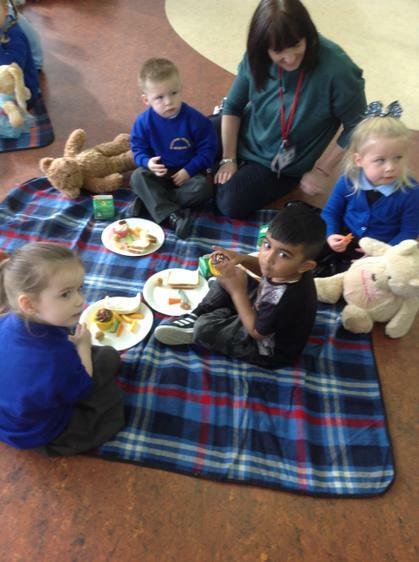 At nursery today we had so much fun making our own sandwiches for our teddy bear picnic. 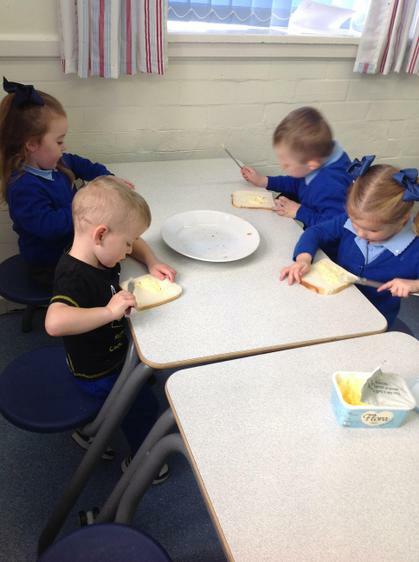 We thought about th steps to making a sandwich and in which order they go. 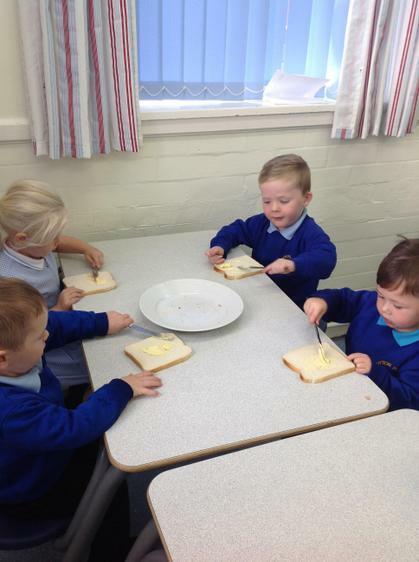 We talked about what fillings were our favourite and which sandwich we wanted to make. 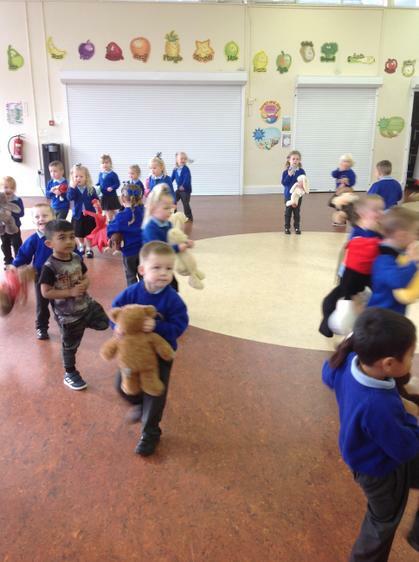 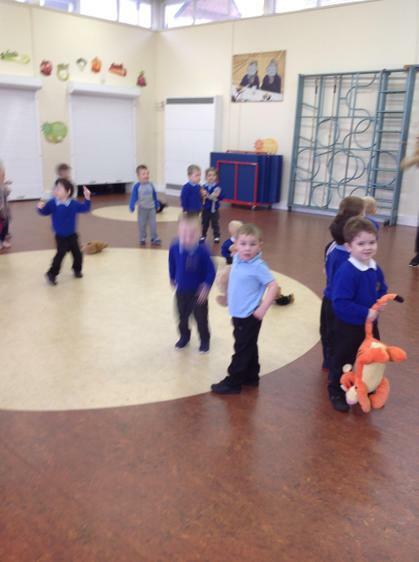 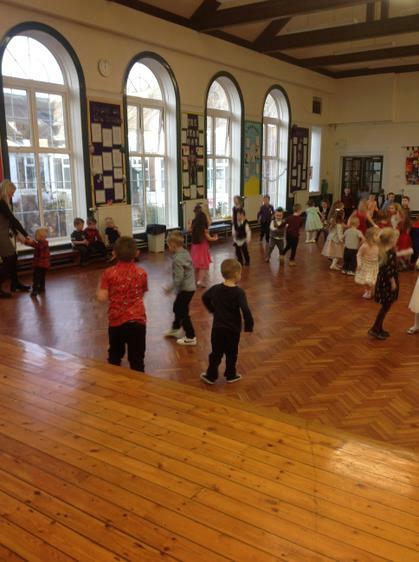 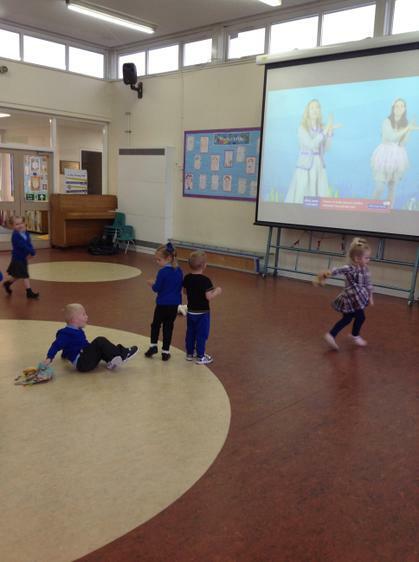 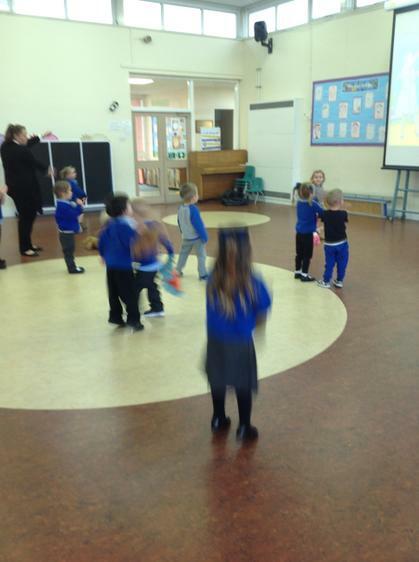 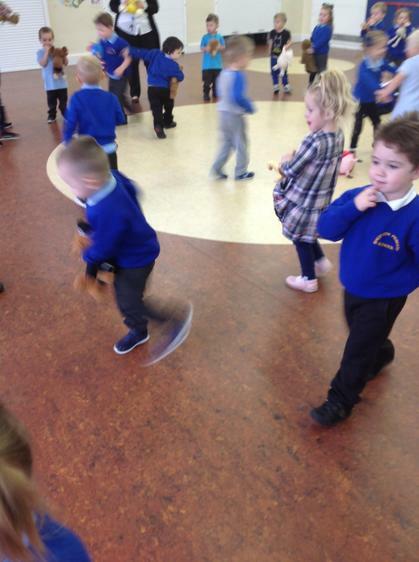 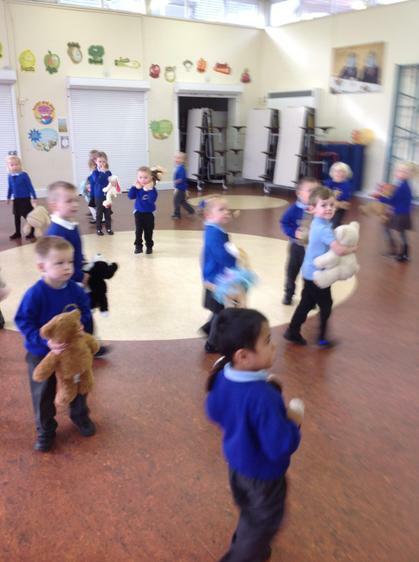 Afterwards we had lots of fun dancing in the hall with our teddies and having our picnic food. 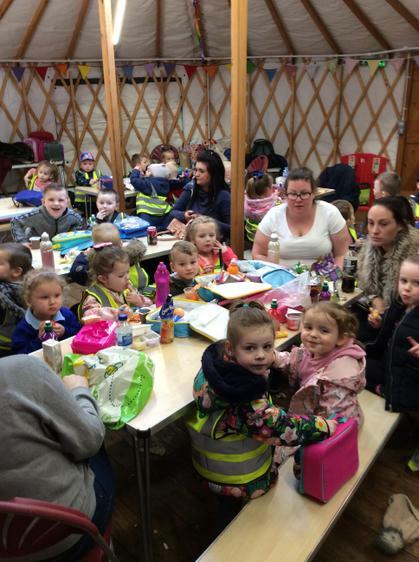 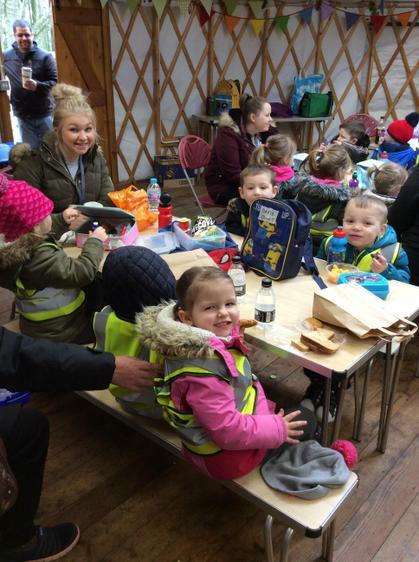 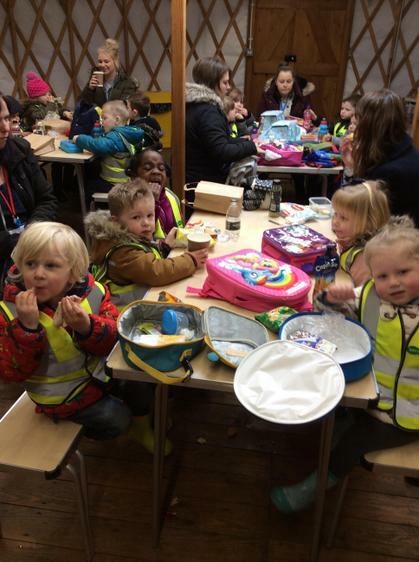 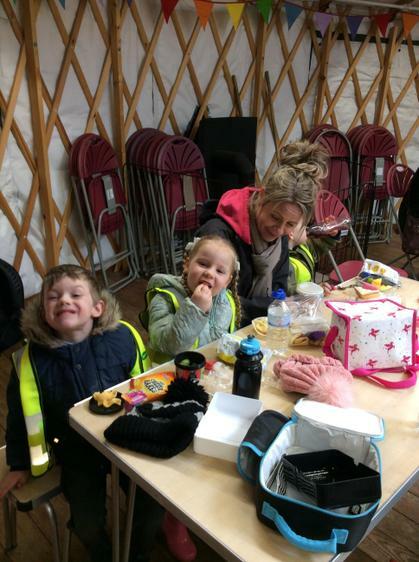 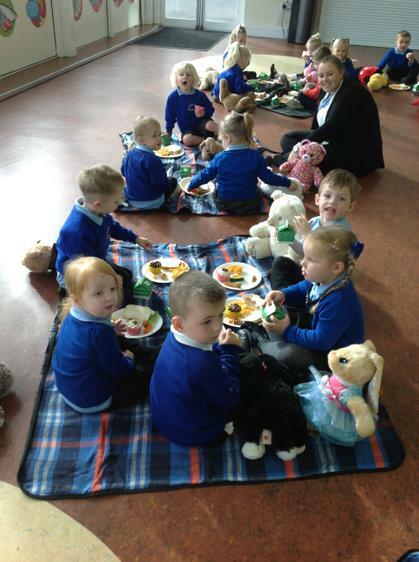 The rain did not stop us having the most fantastic teddy bears picnic! 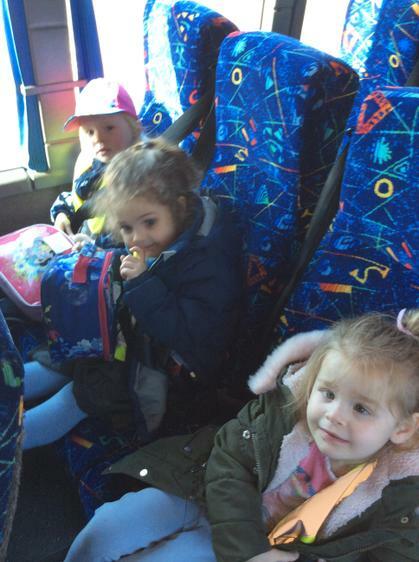 we are all very sleepy now. 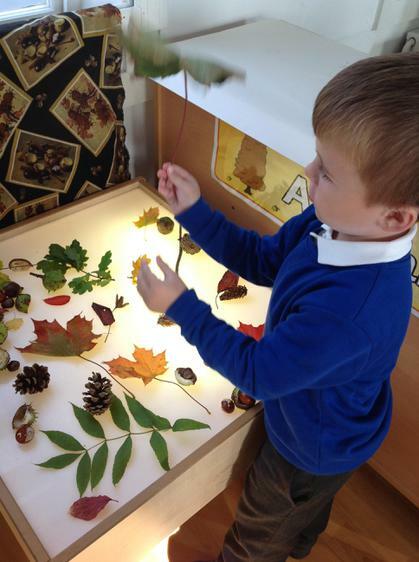 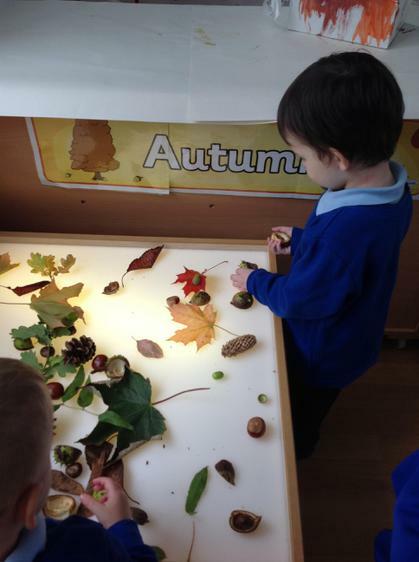 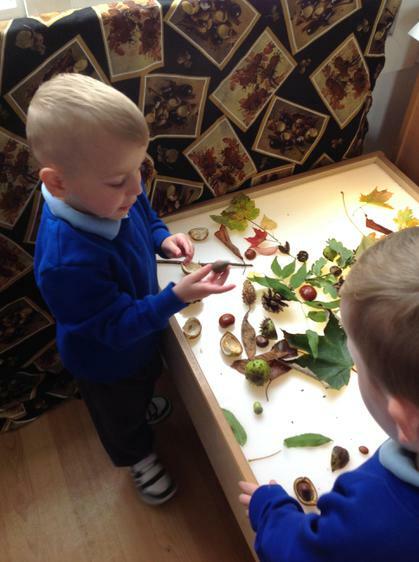 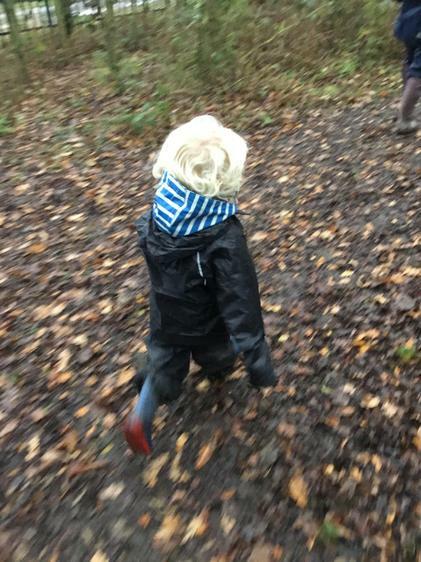 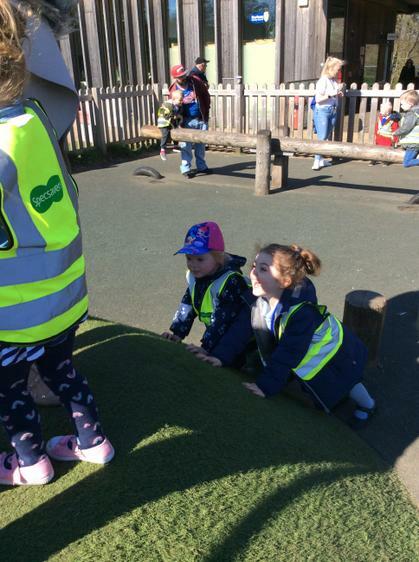 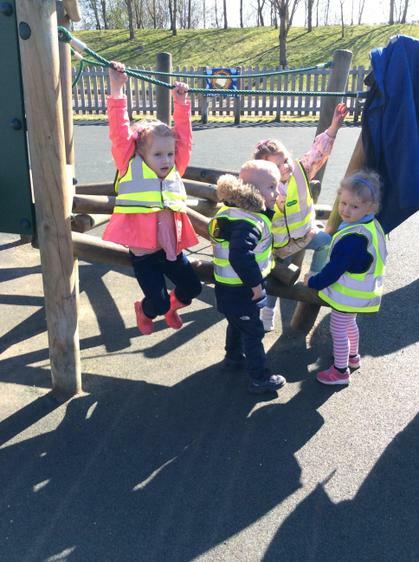 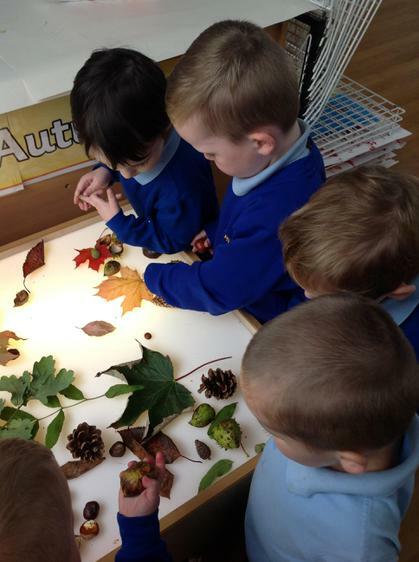 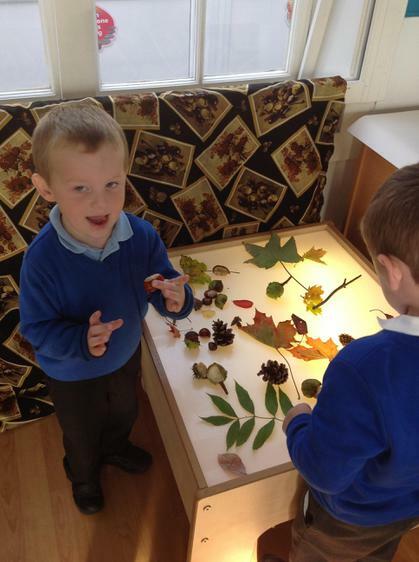 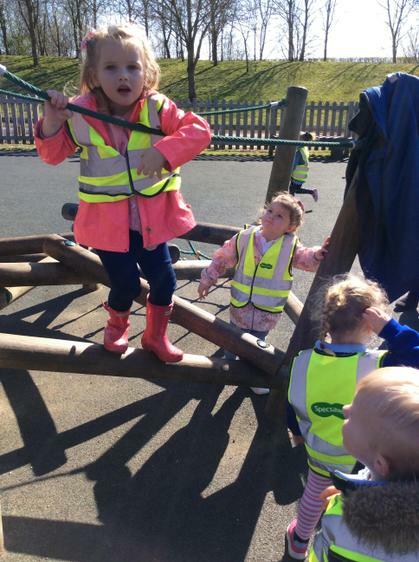 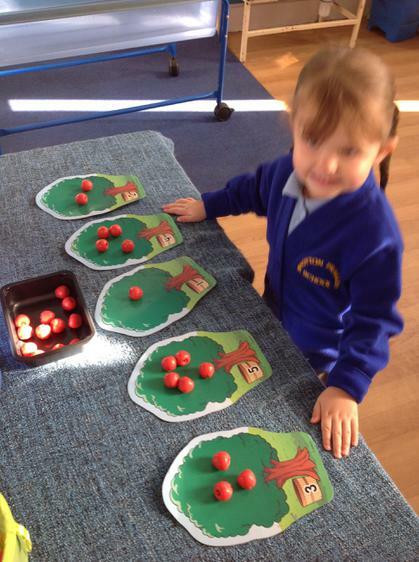 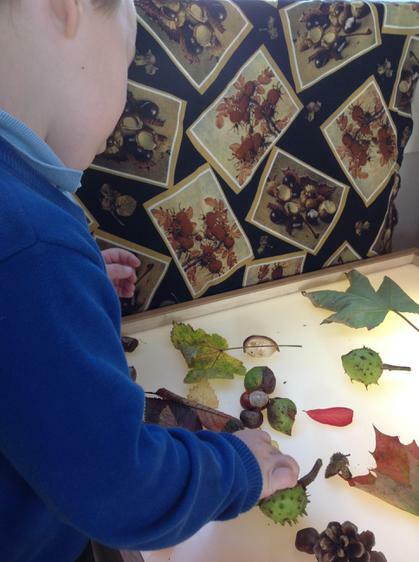 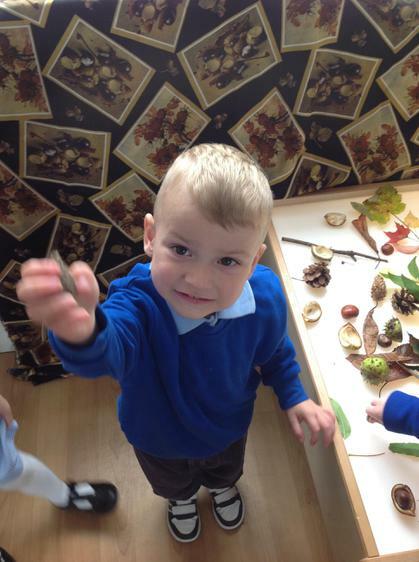 This week the children have started to explore Autumn. 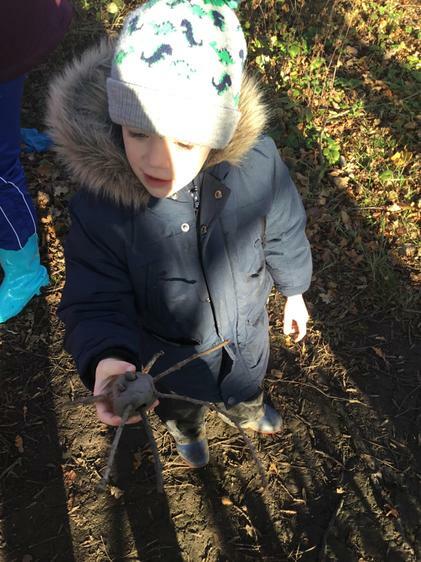 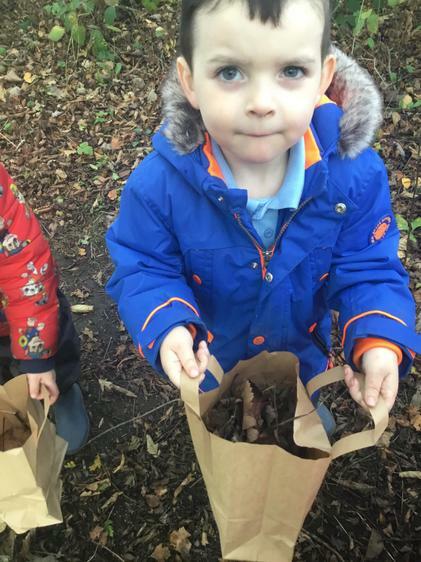 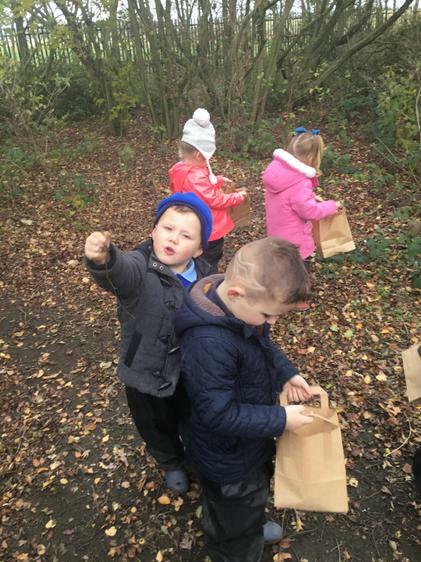 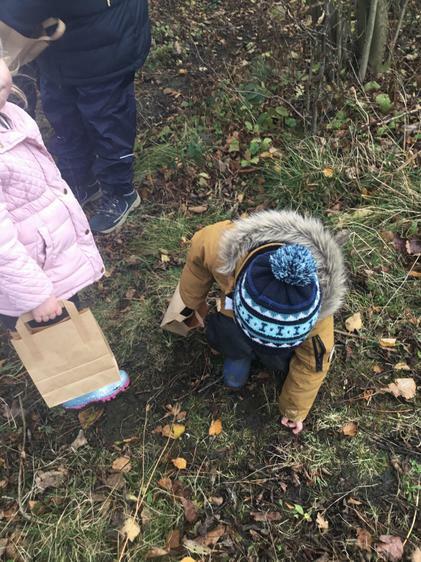 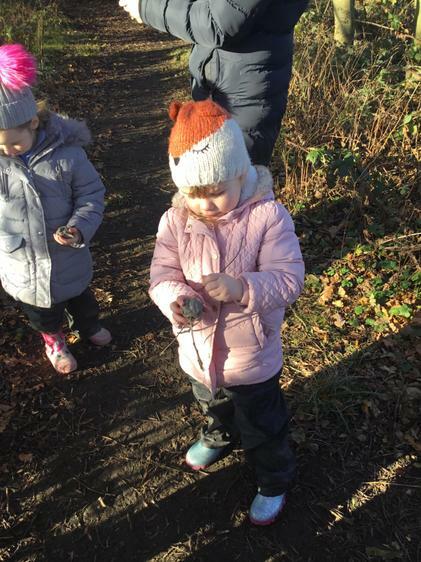 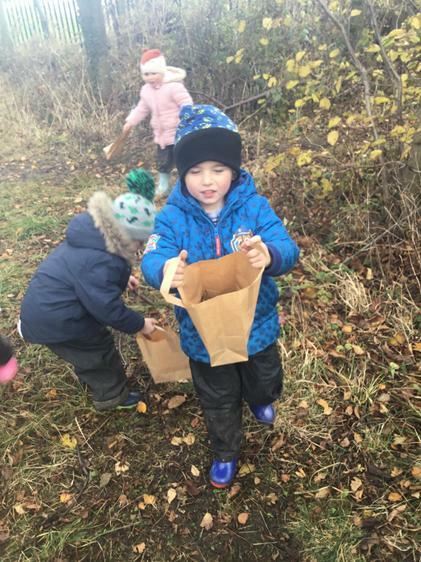 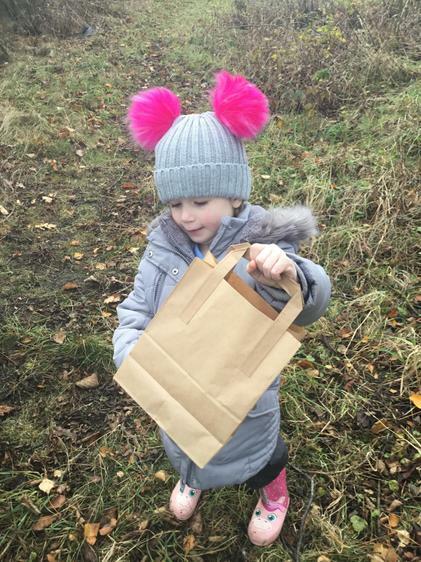 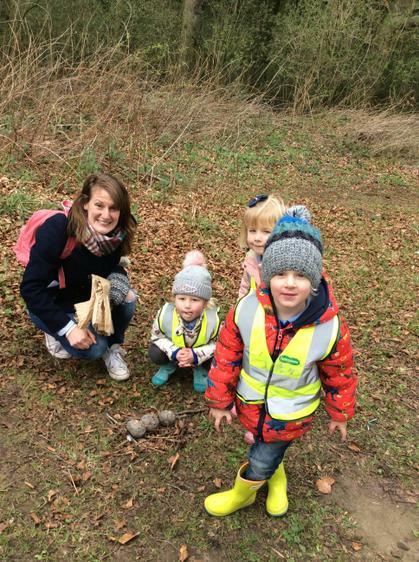 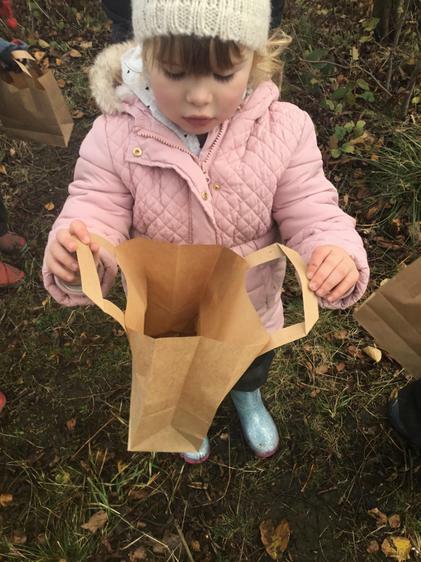 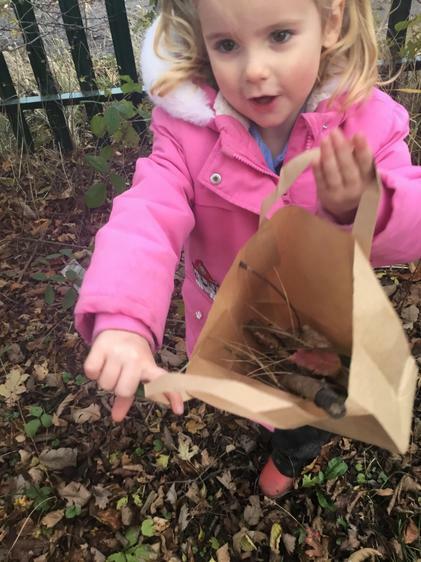 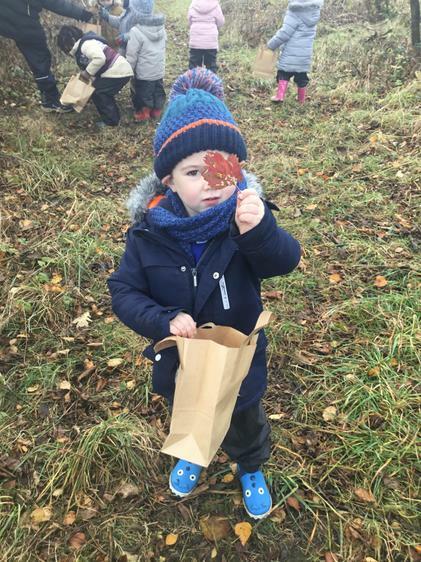 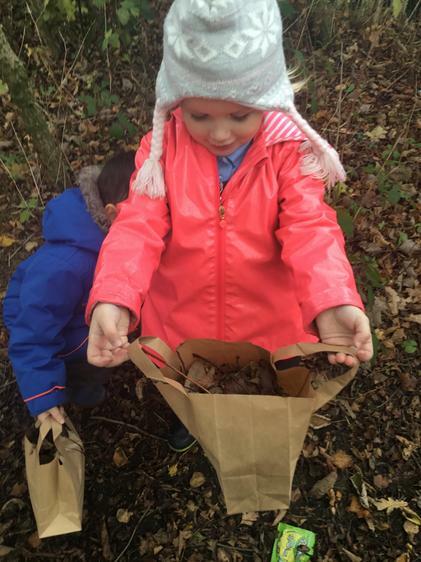 Mrs Venner and Mrs Ward collected some Autumn things while they were walking their doggies. 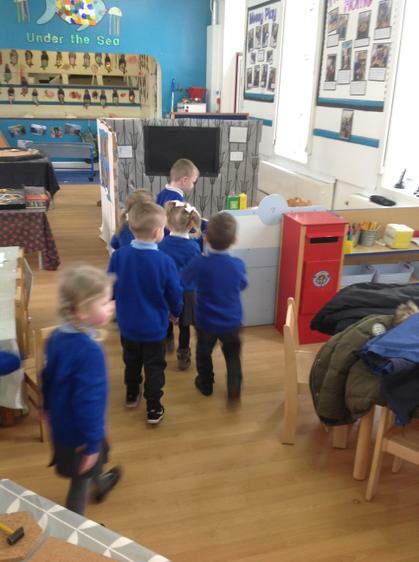 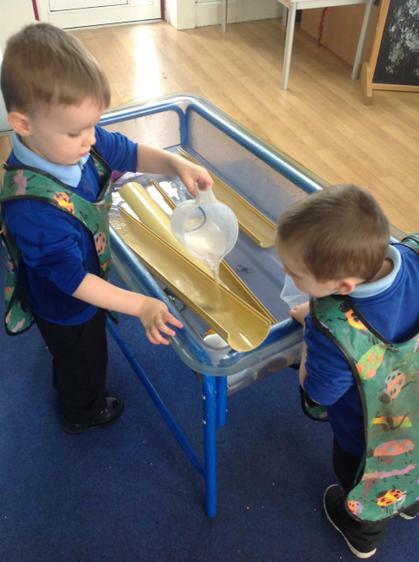 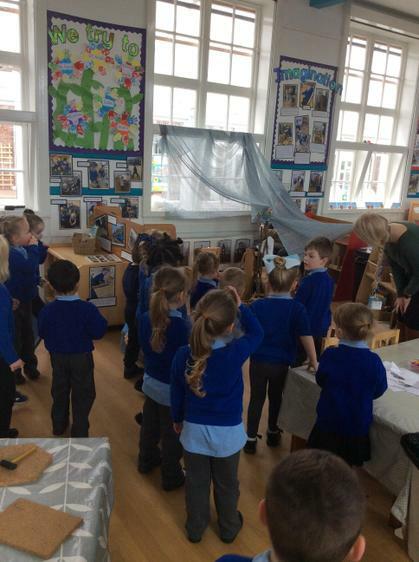 The children have loved exploring the items and adding to our collection as we go. 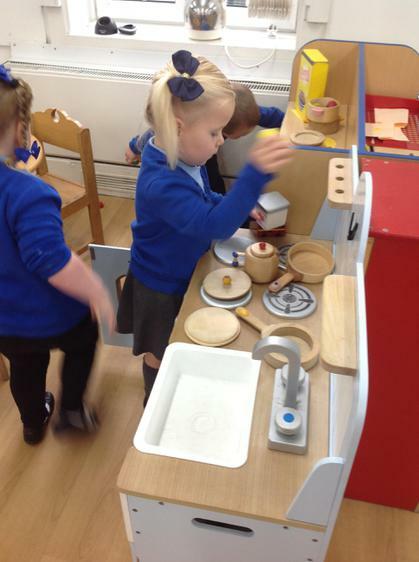 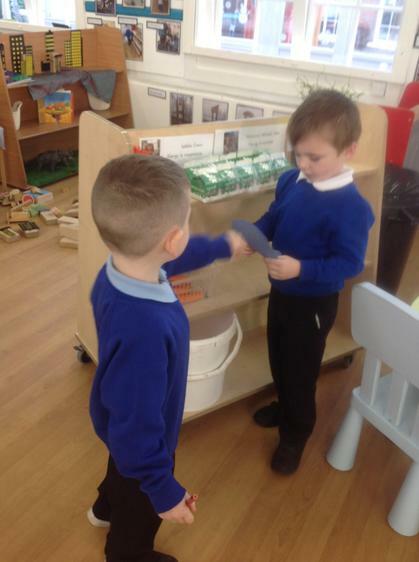 We have talked about the names of the items, the colour, how they feel and the size. 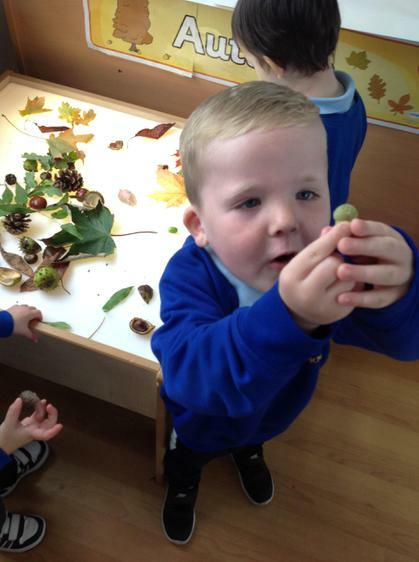 The big conkers are our favourite by far with their spikey shells. 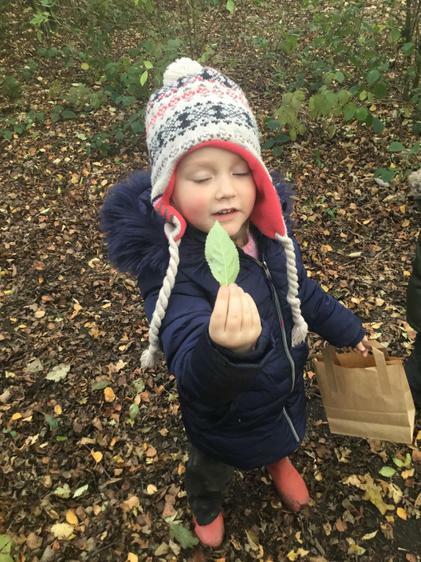 What have you found on your Autumn Walks? 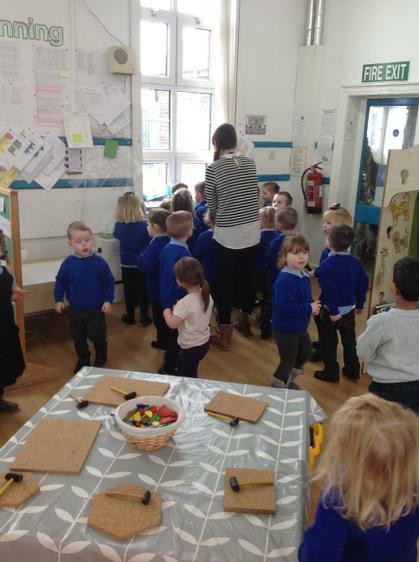 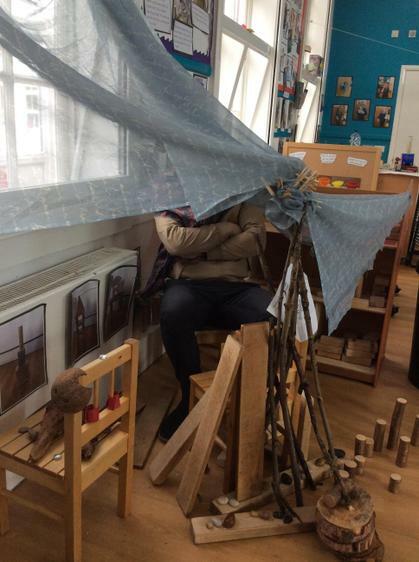 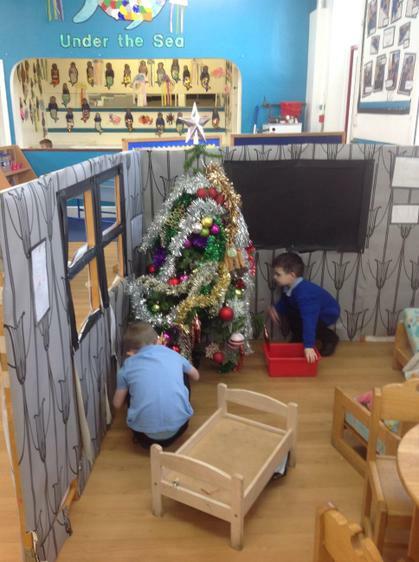 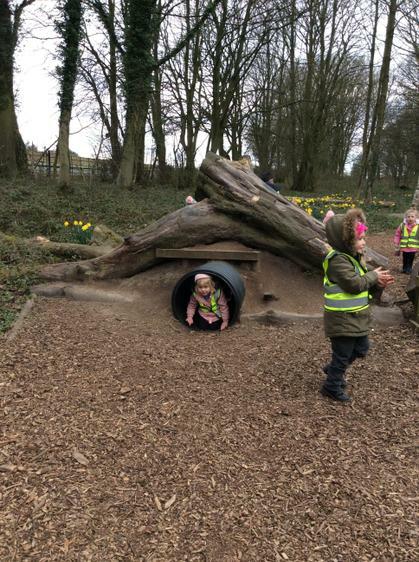 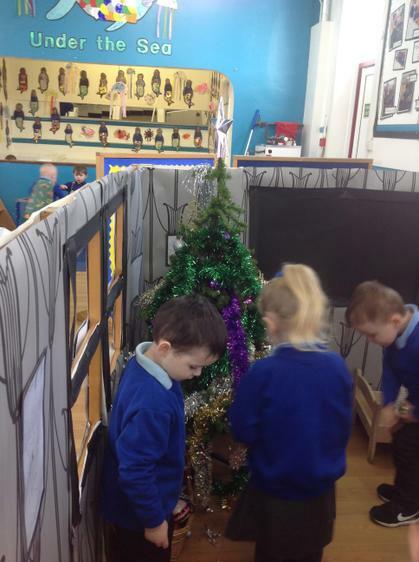 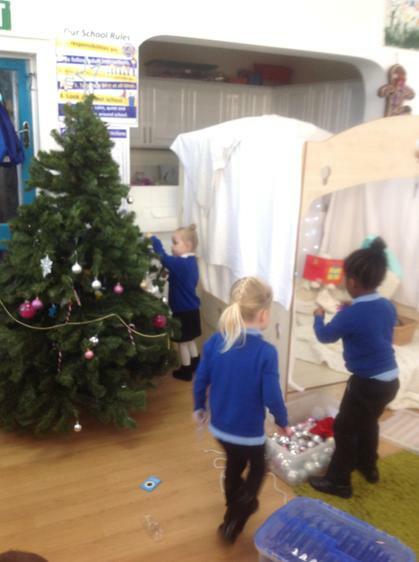 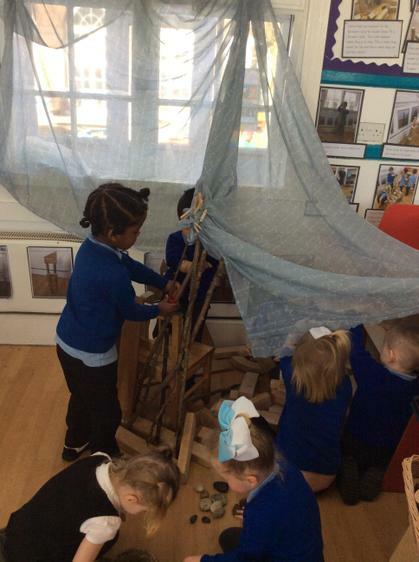 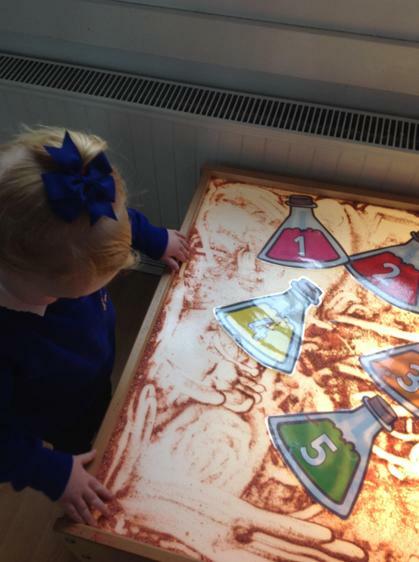 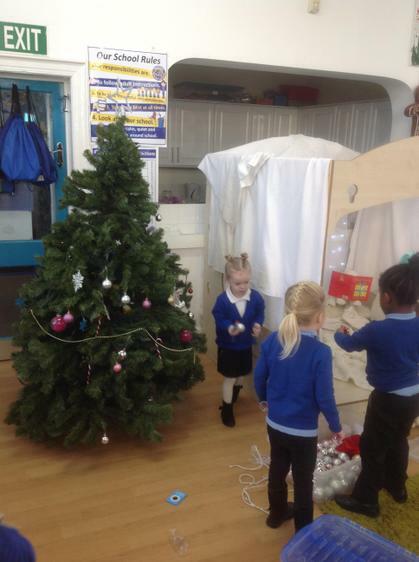 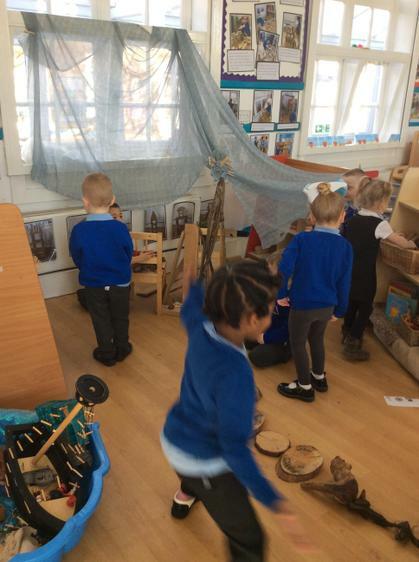 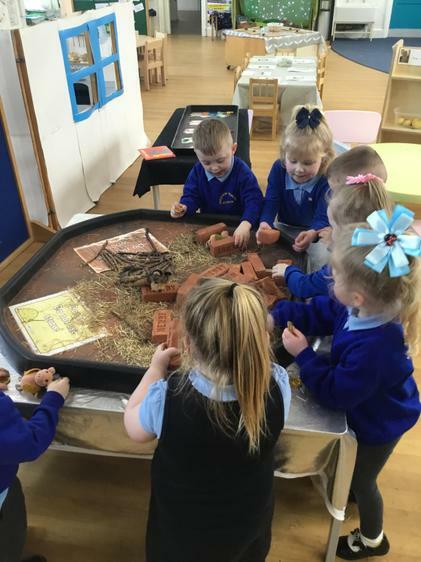 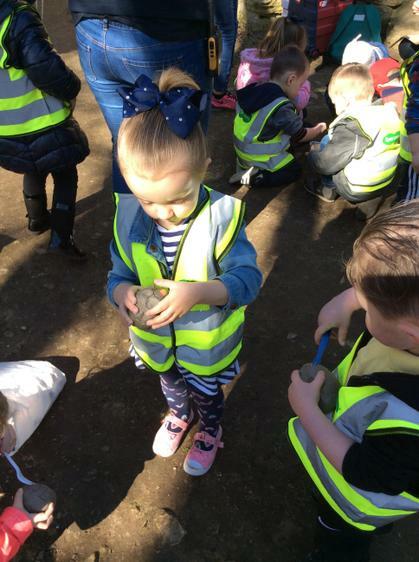 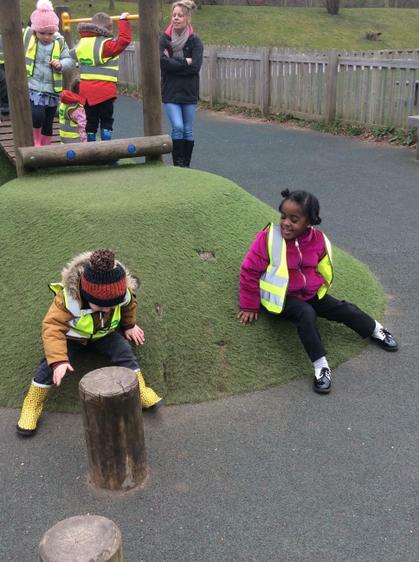 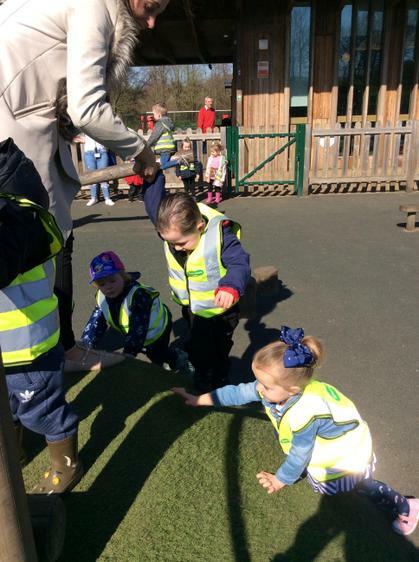 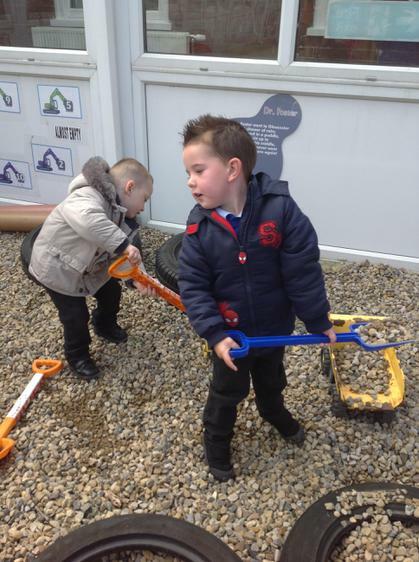 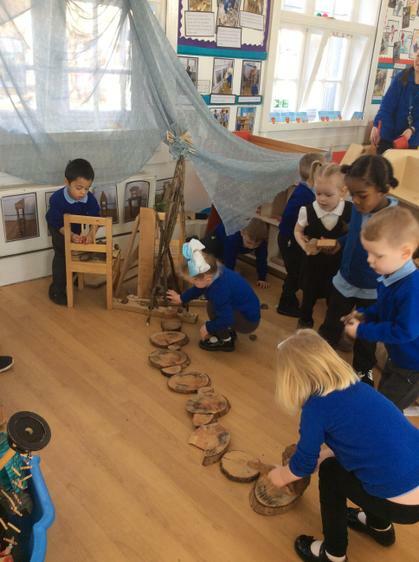 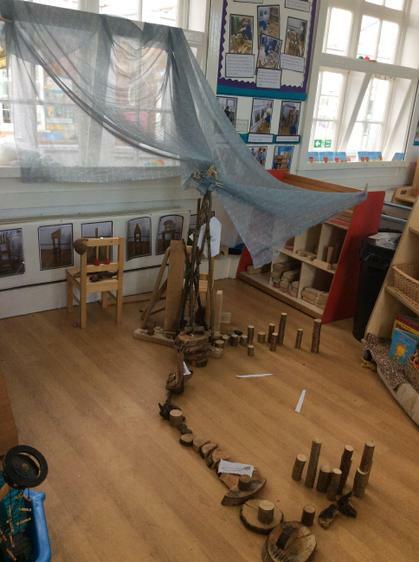 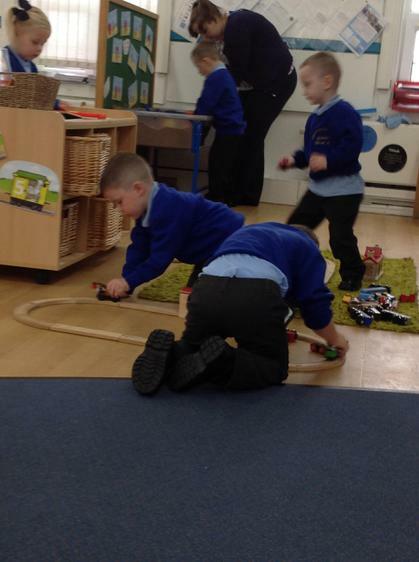 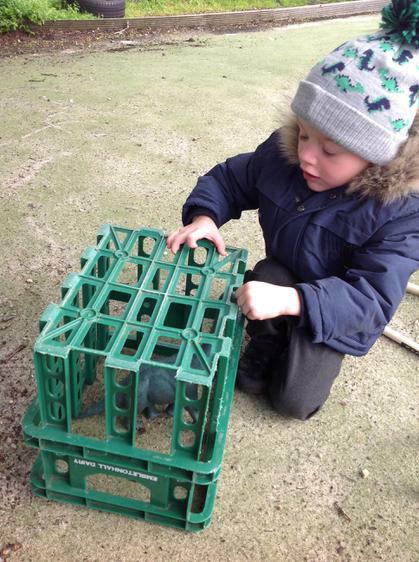 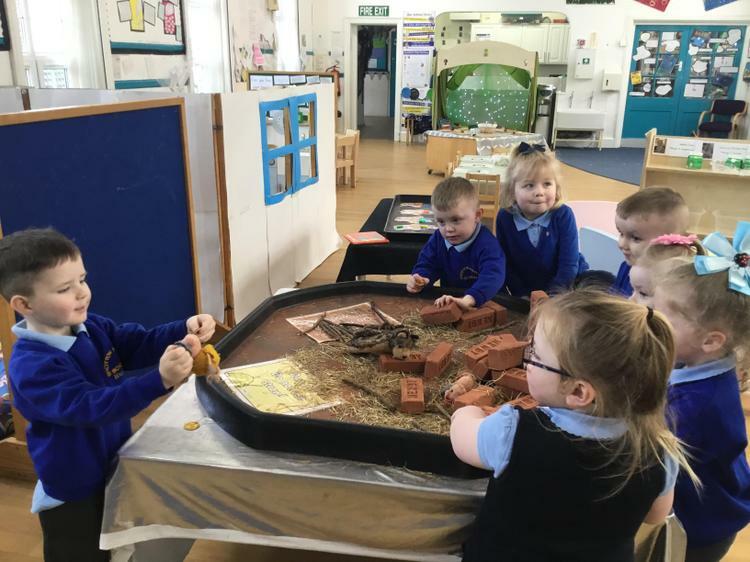 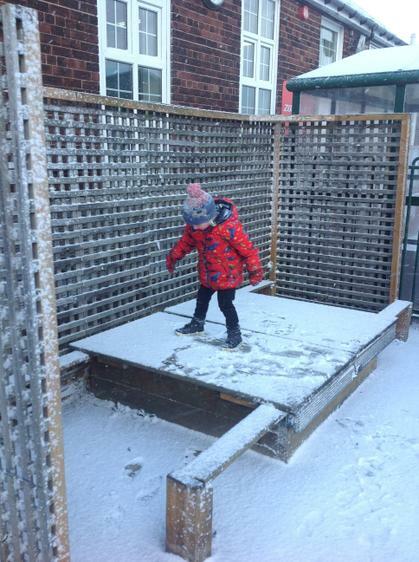 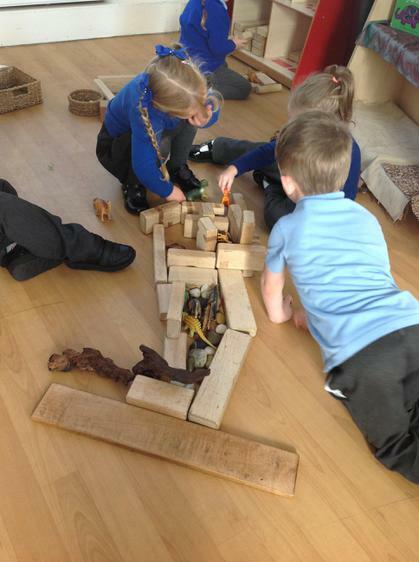 The children have had lots of fun exploring our setting and building relationships with the other children and staff! 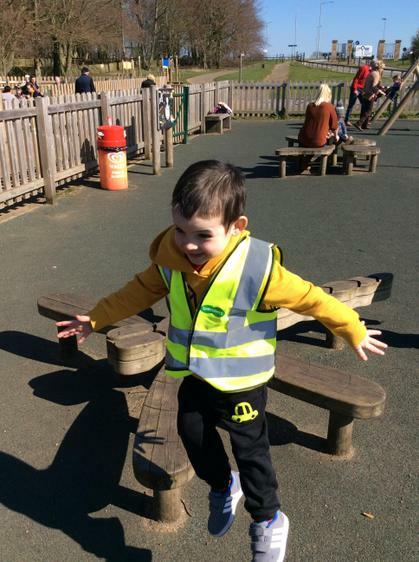 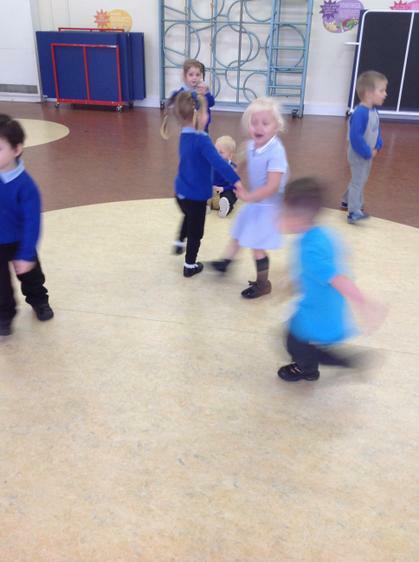 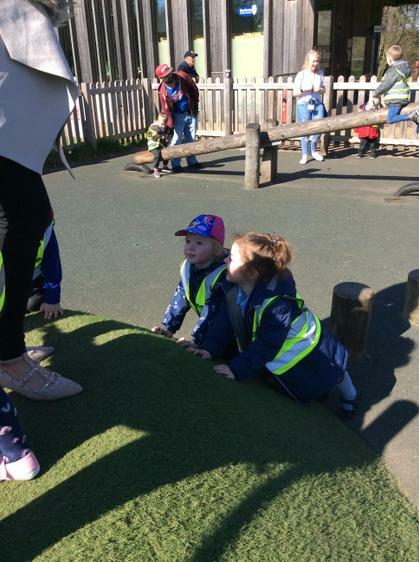 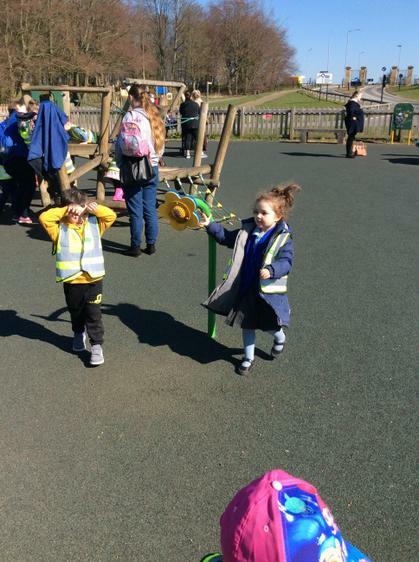 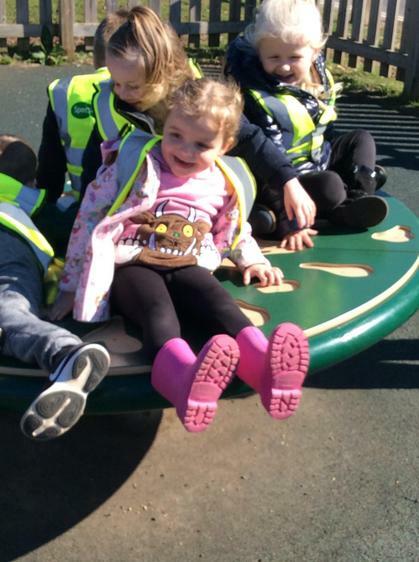 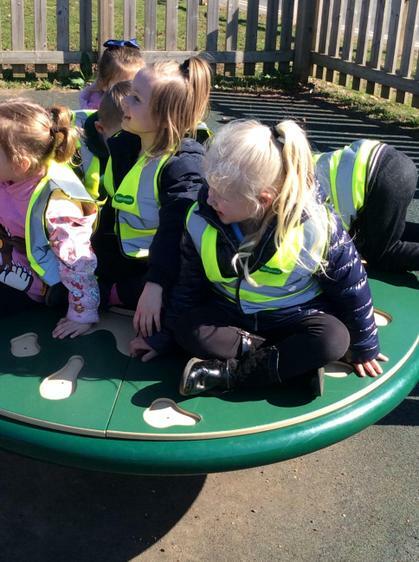 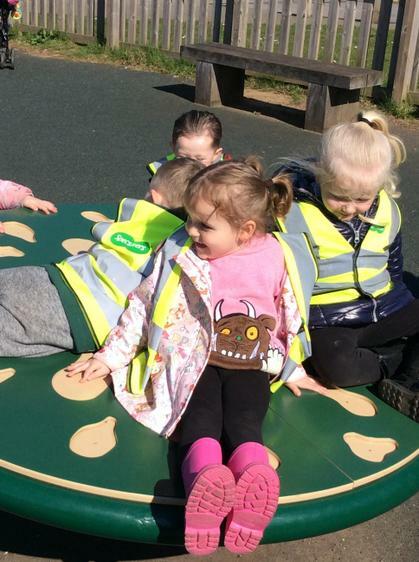 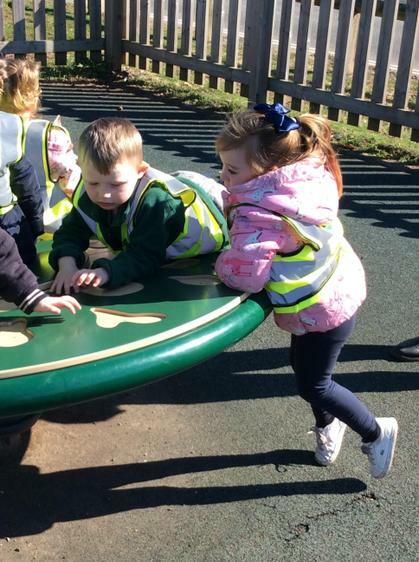 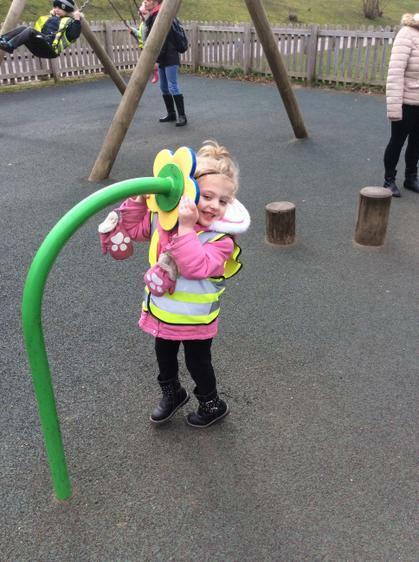 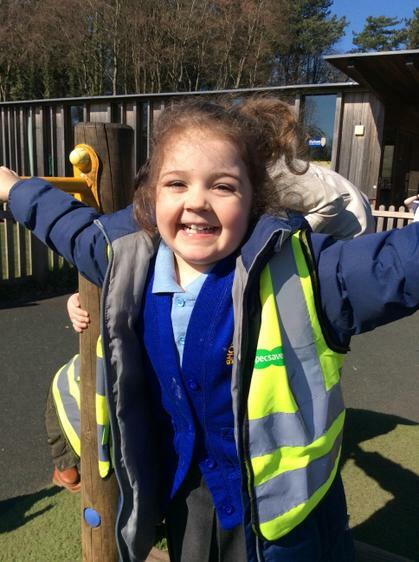 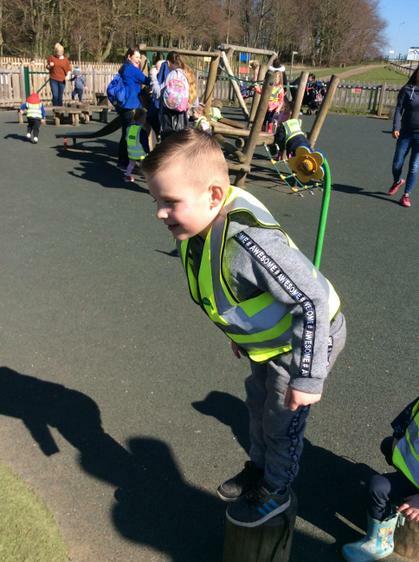 We are excited to get lots more children to join in the fun and make new friends with. 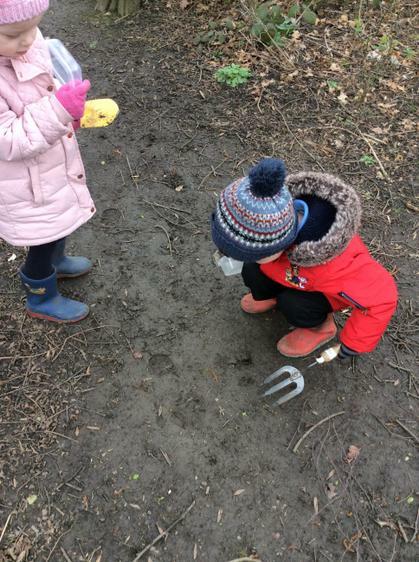 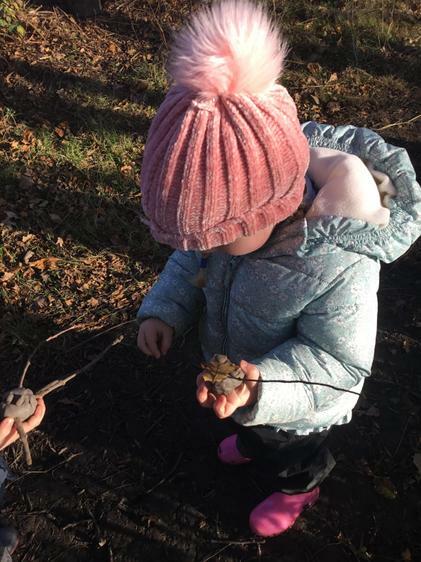 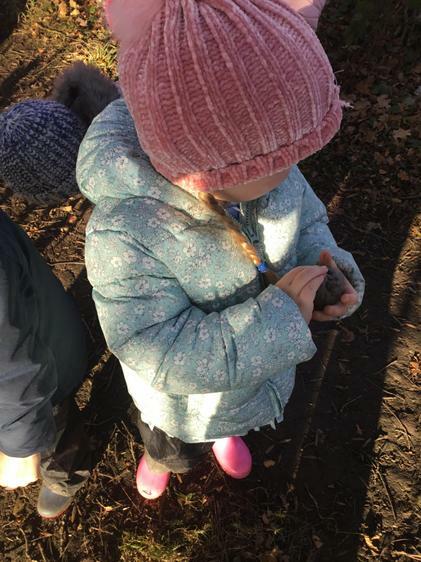 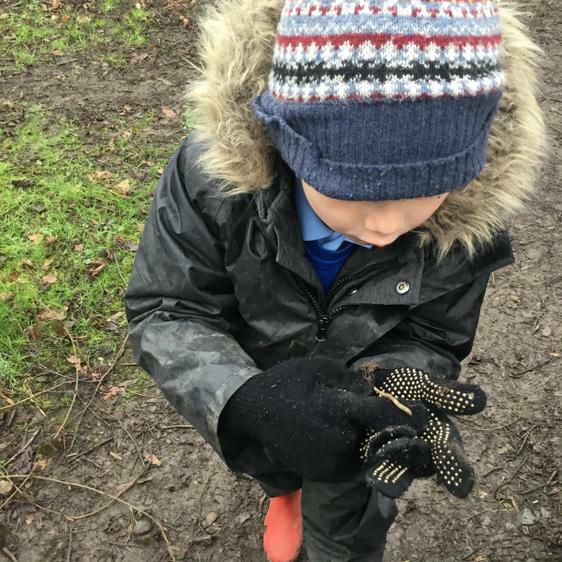 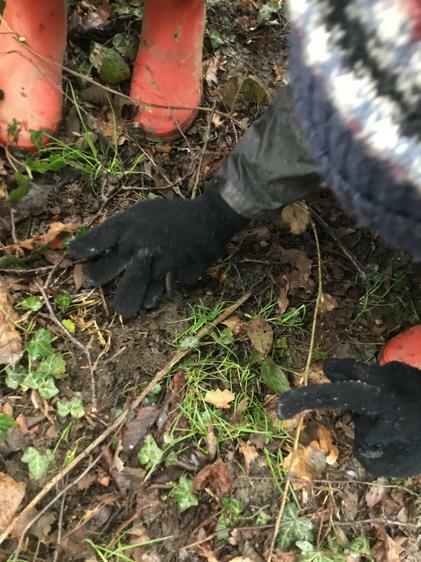 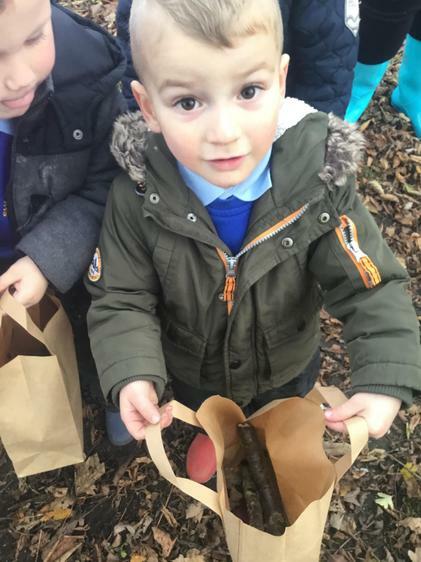 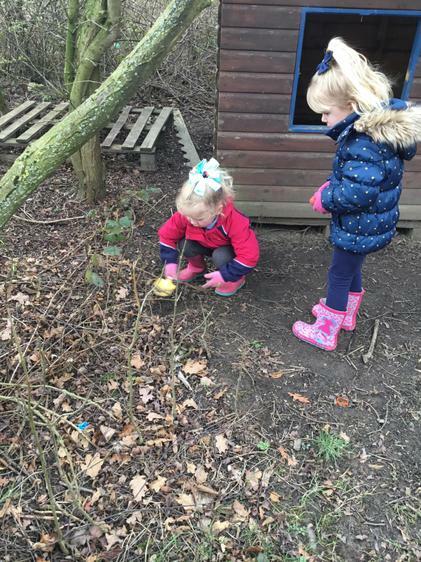 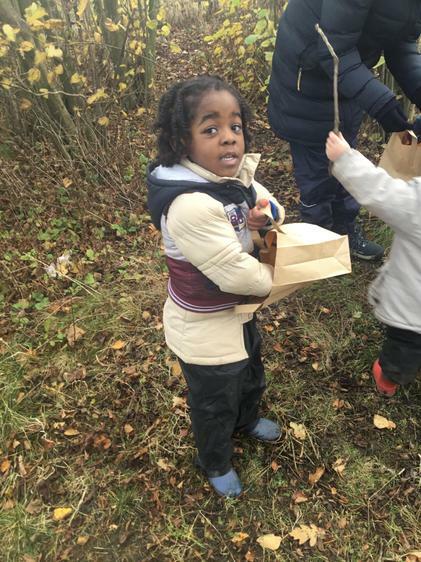 While we were exploring outside we even found some cheeky carrots and baby potatoes in our growing patch as we were getting it ready for the new year. 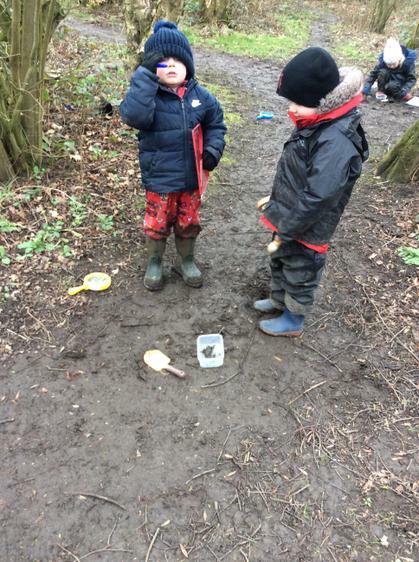 I think carrot and potatoe soup could be on the menu in our mud kitchen next week! 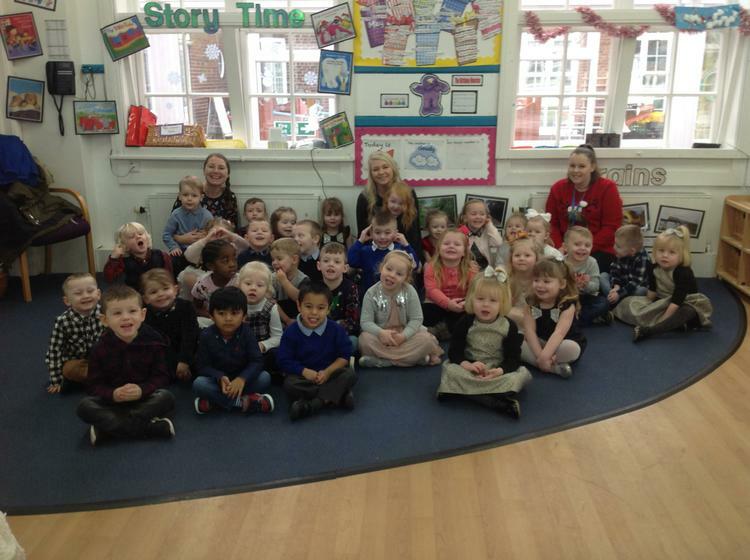 Mrs Venner and the Nursery team are super proud of all our new children starting Nursery and how well they are settling in! 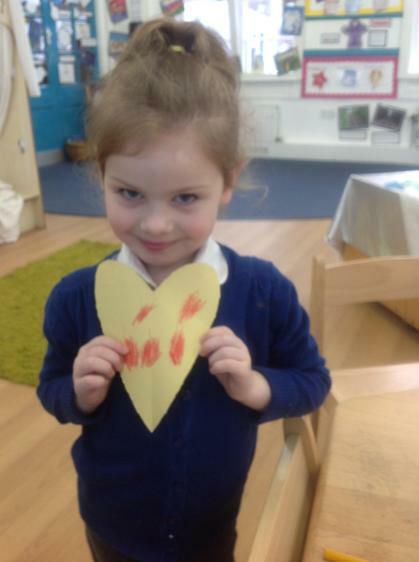 We are loving getting to know you all!